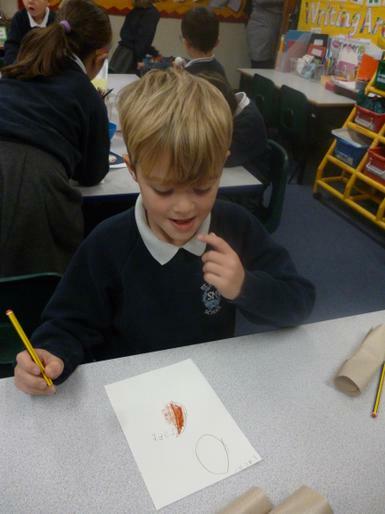 Finding out facts about snails! 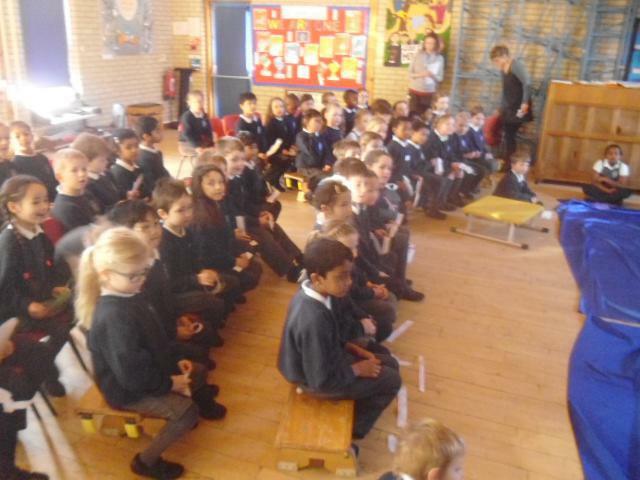 Travelling By Tuba - Yesterday we had a great time listening to and playing different musical instruments with 'Travelling by Tuba'. 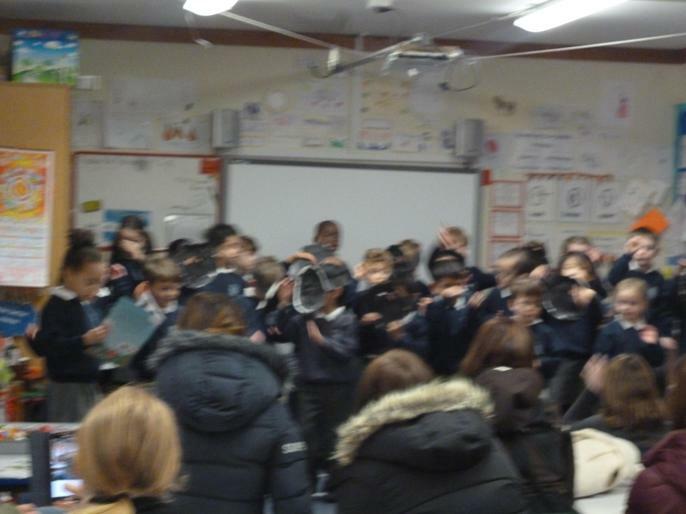 We played the tuba, french horn and even animal horns! 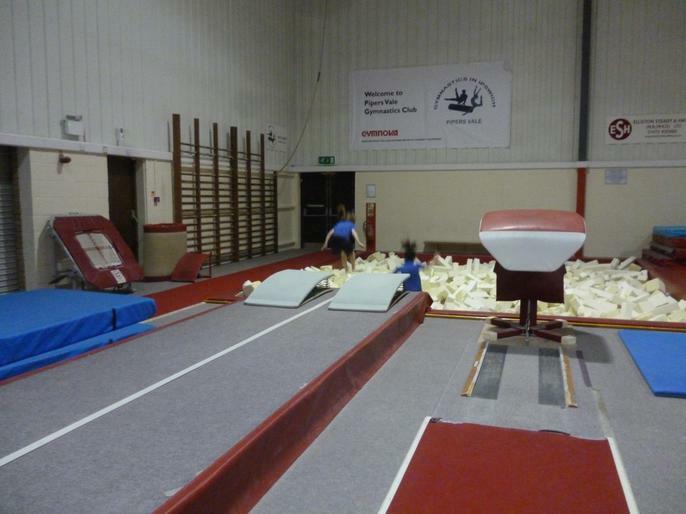 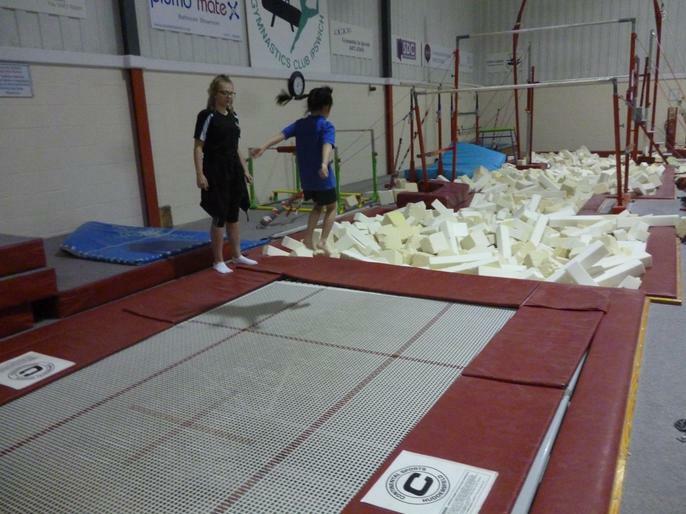 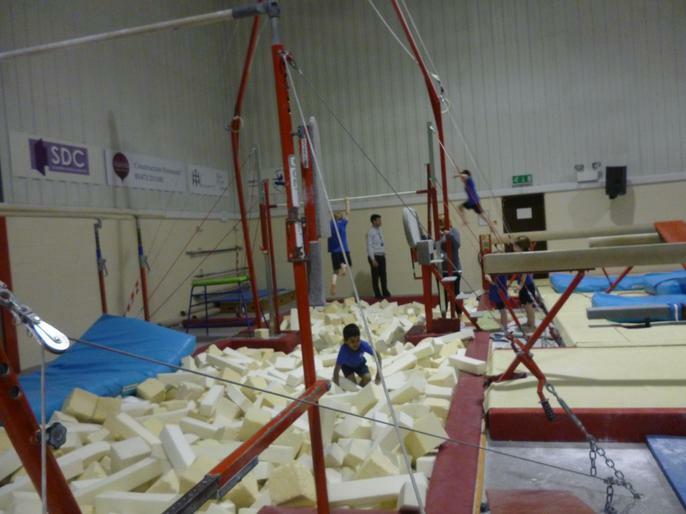 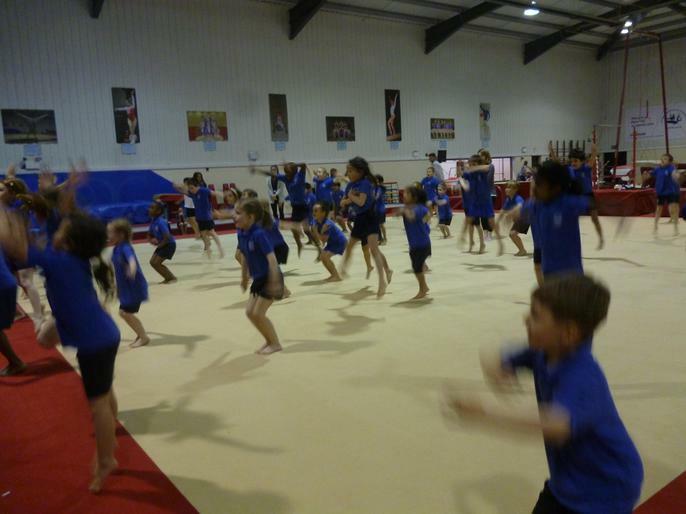 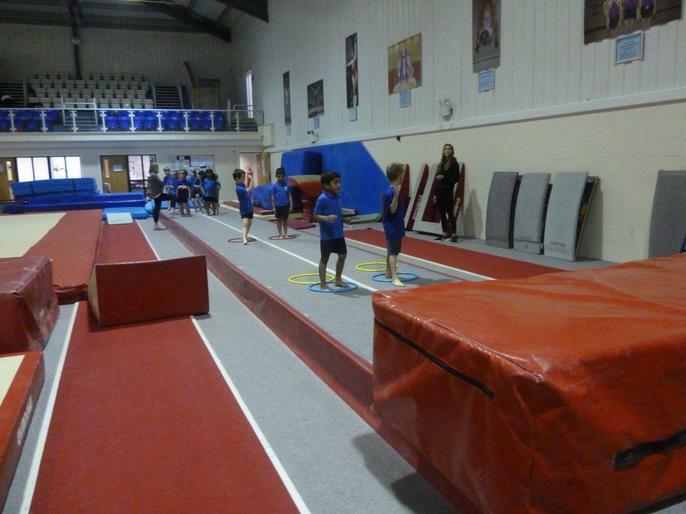 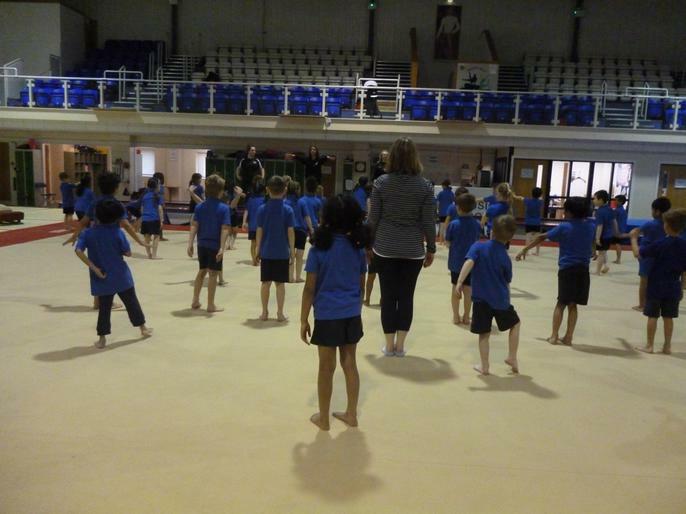 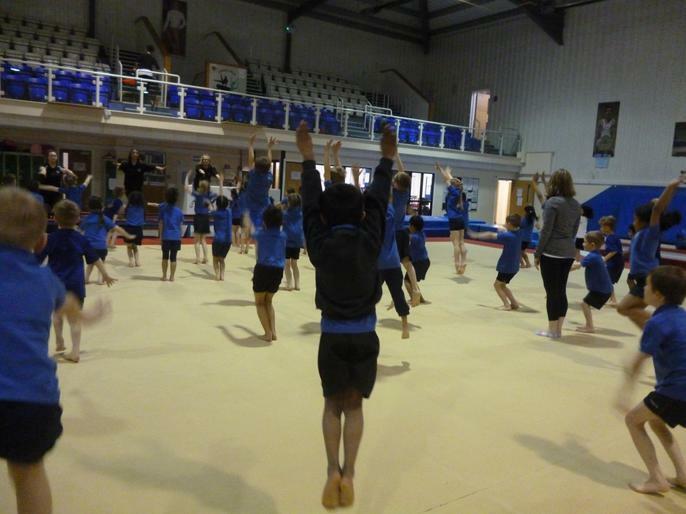 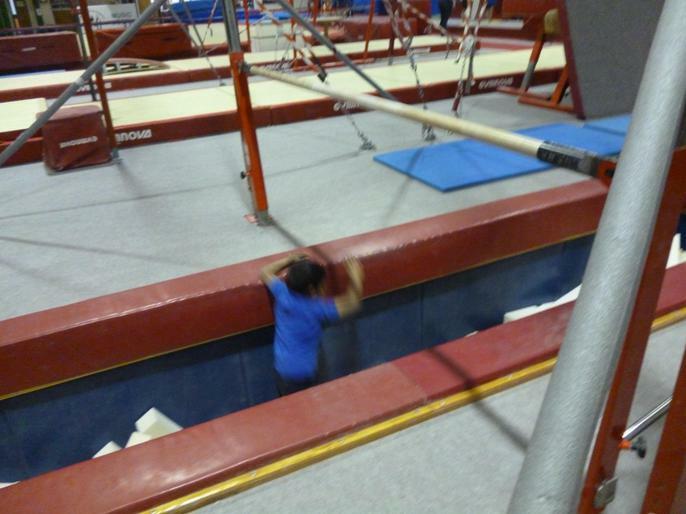 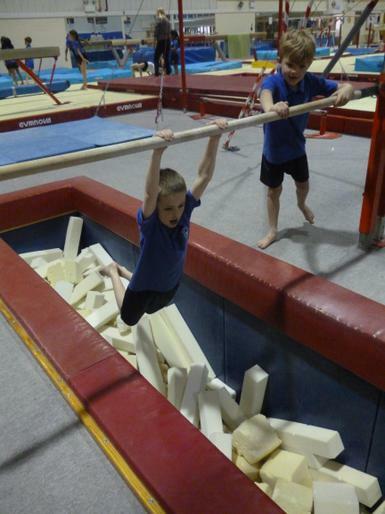 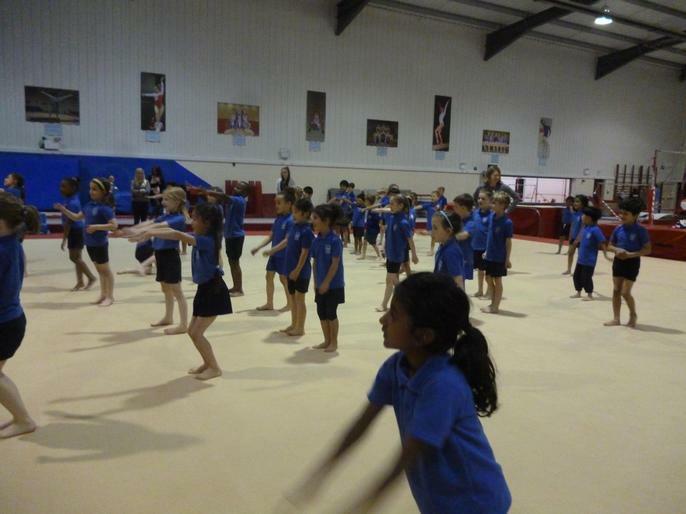 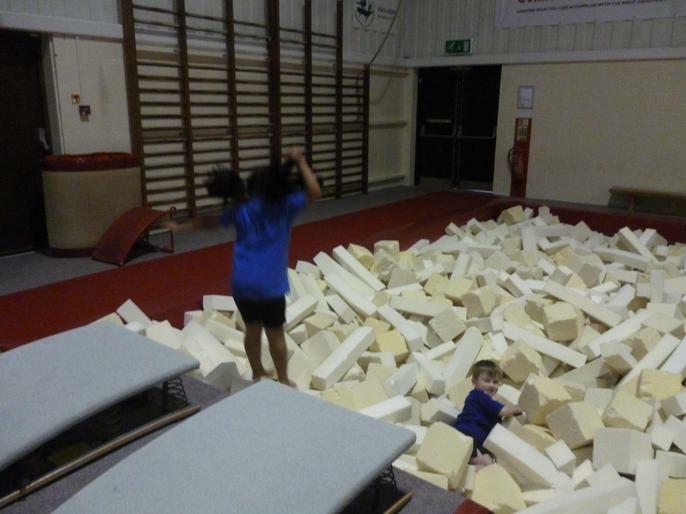 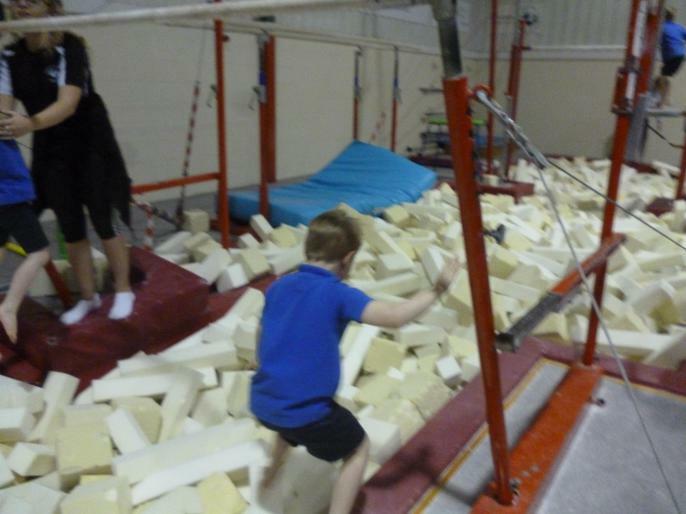 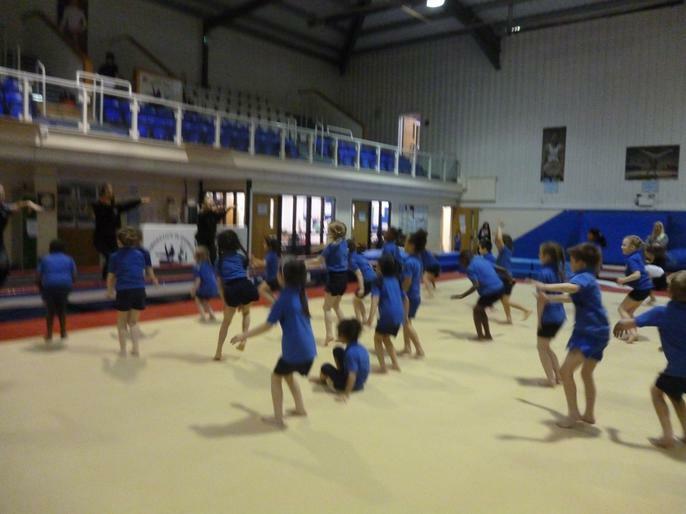 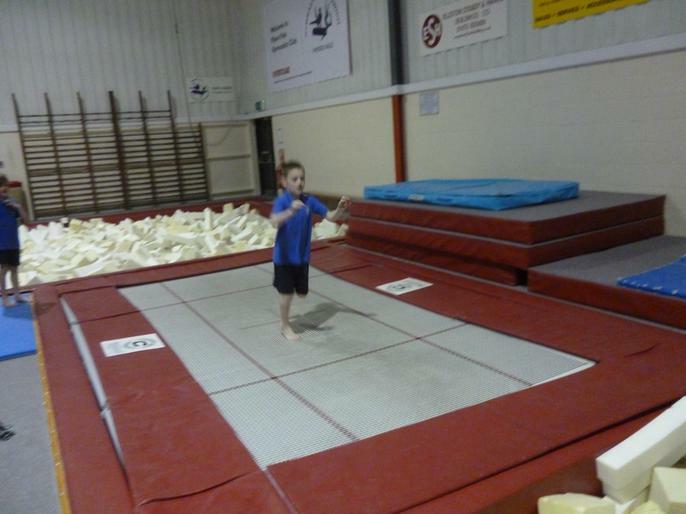 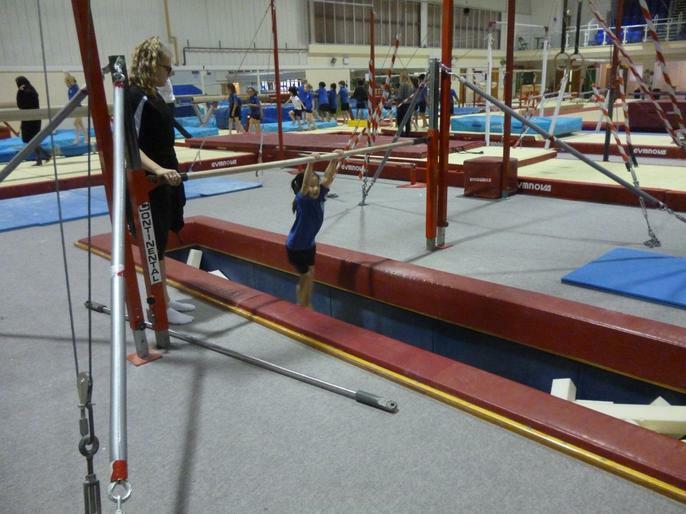 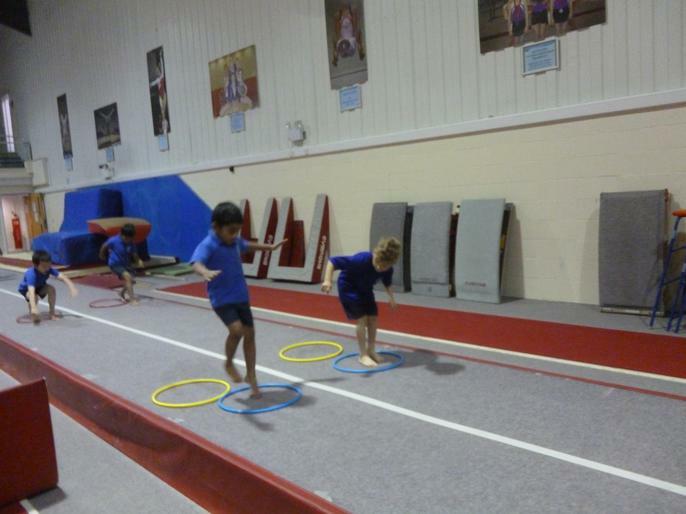 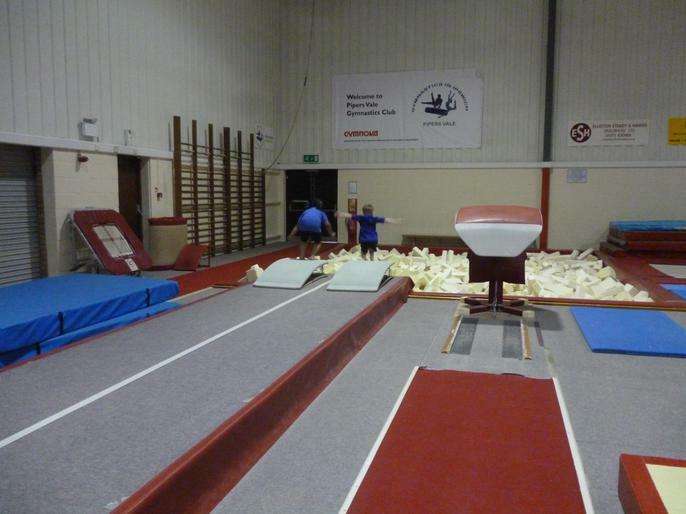 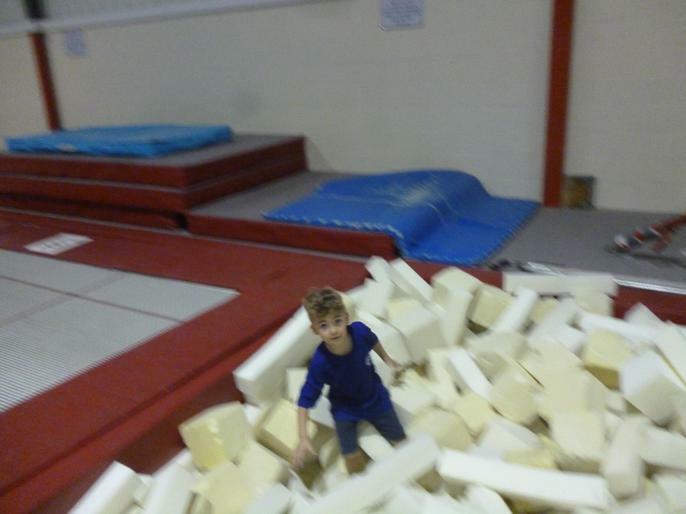 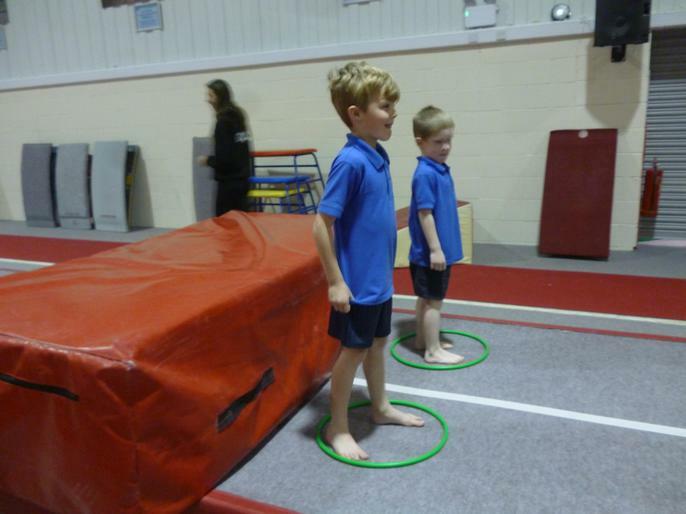 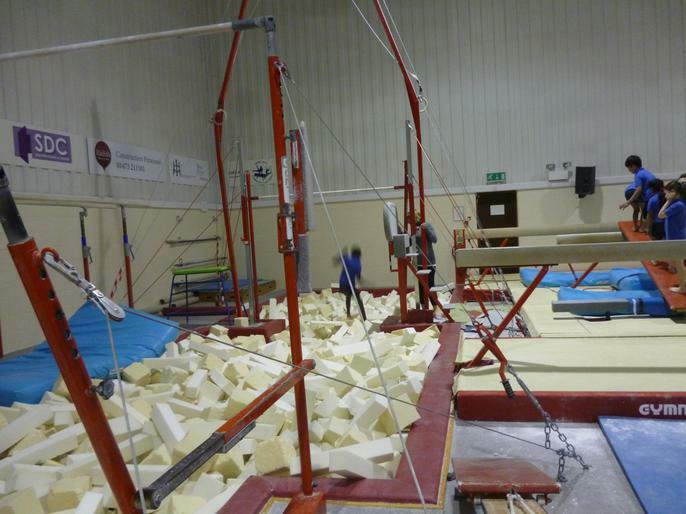 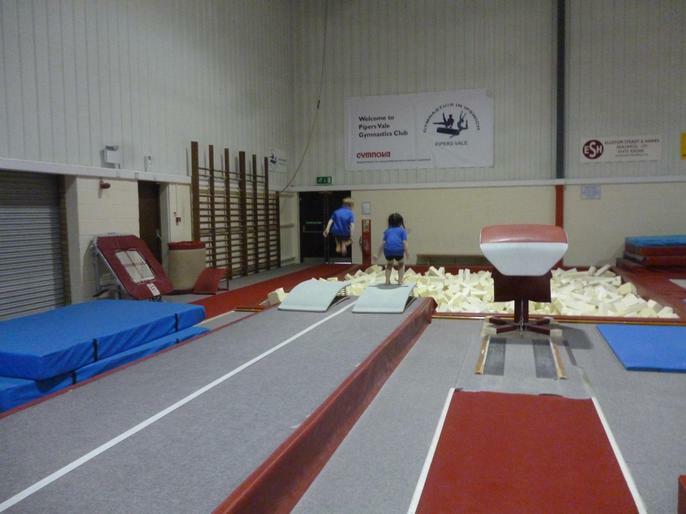 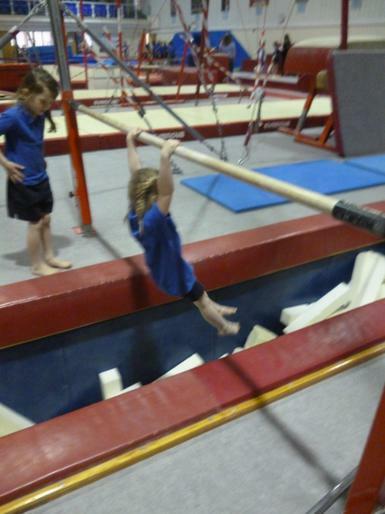 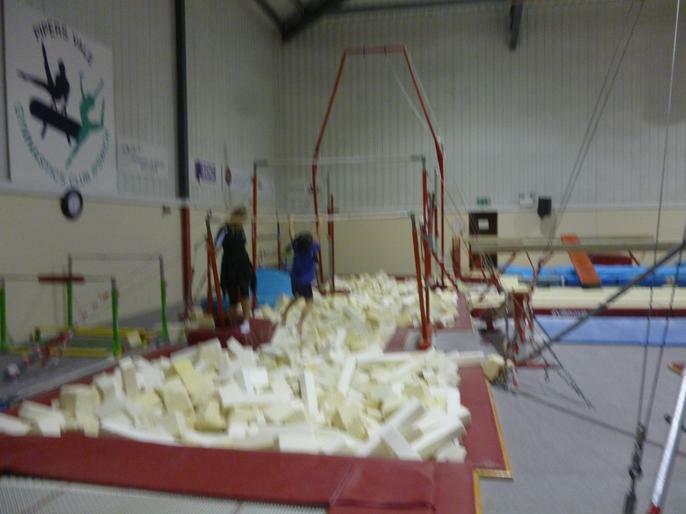 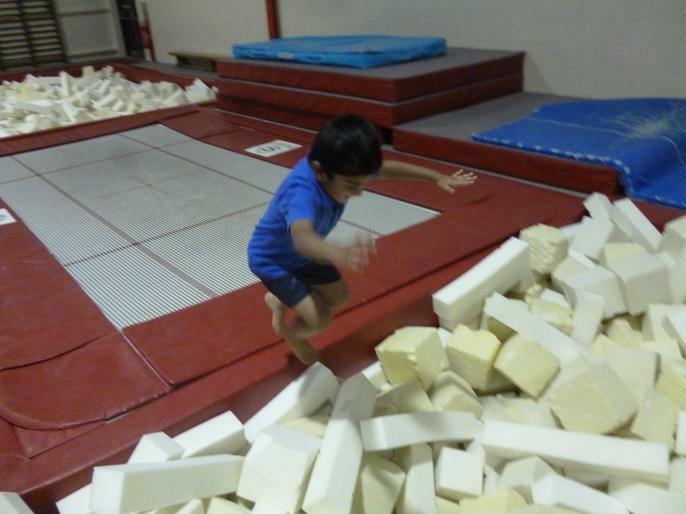 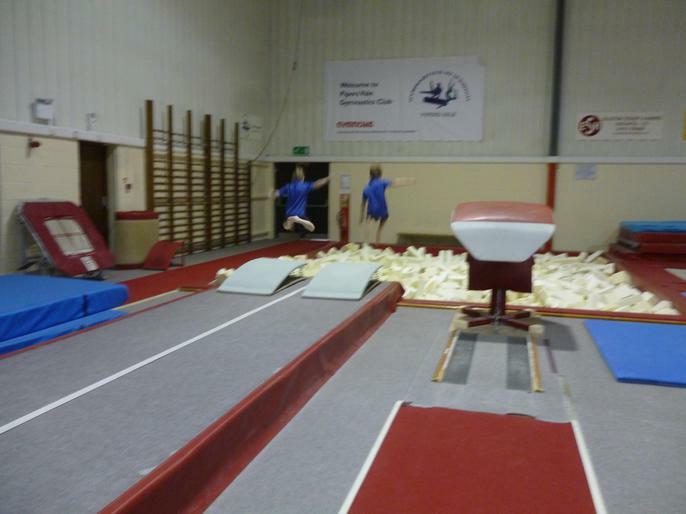 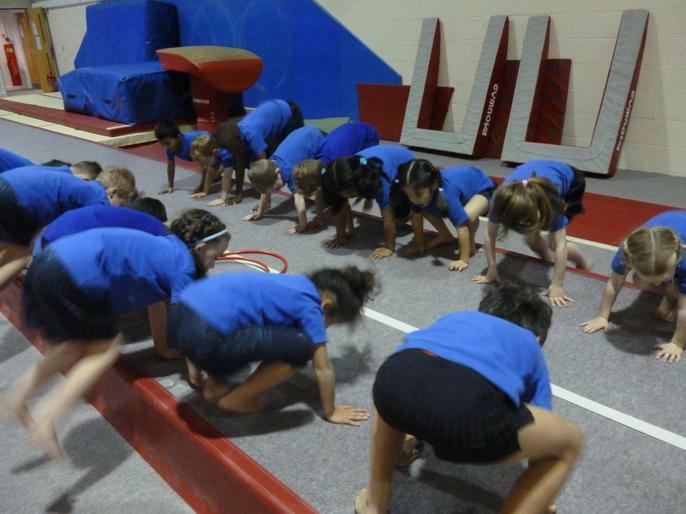 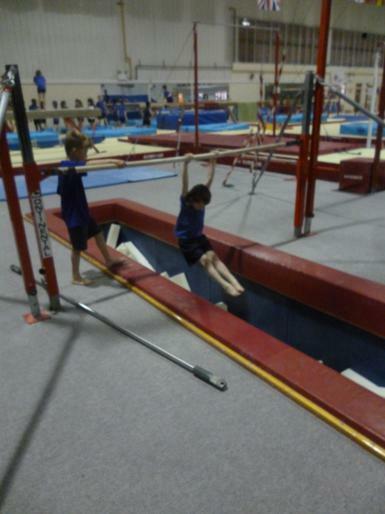 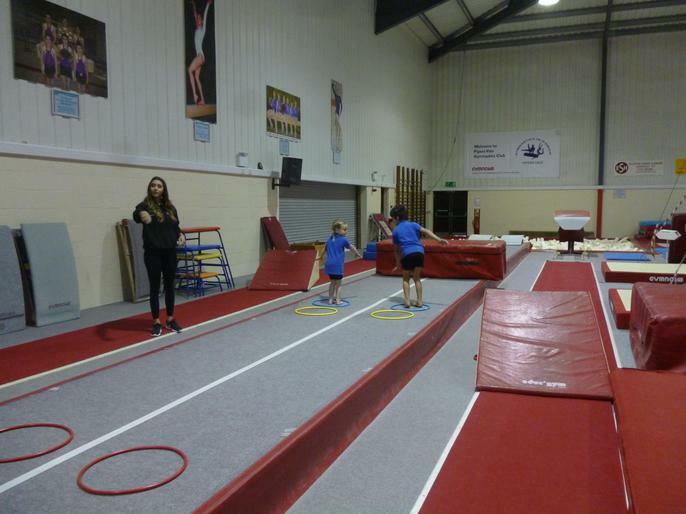 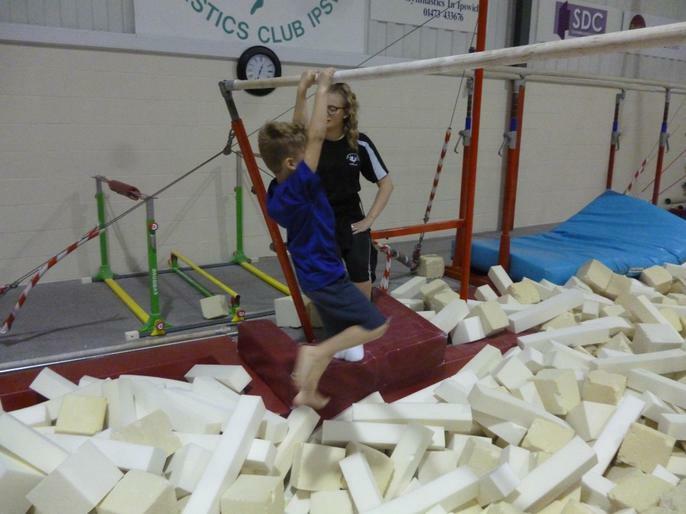 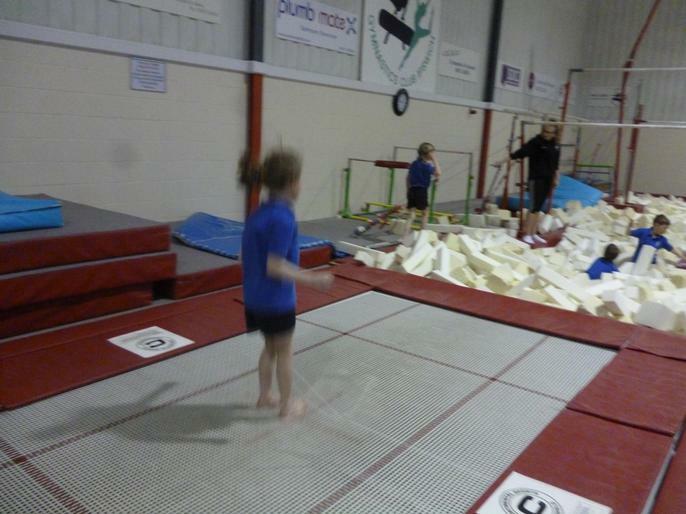 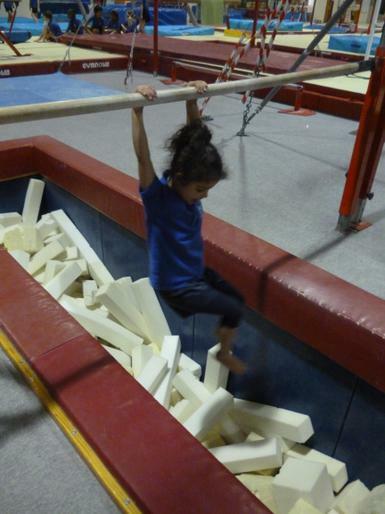 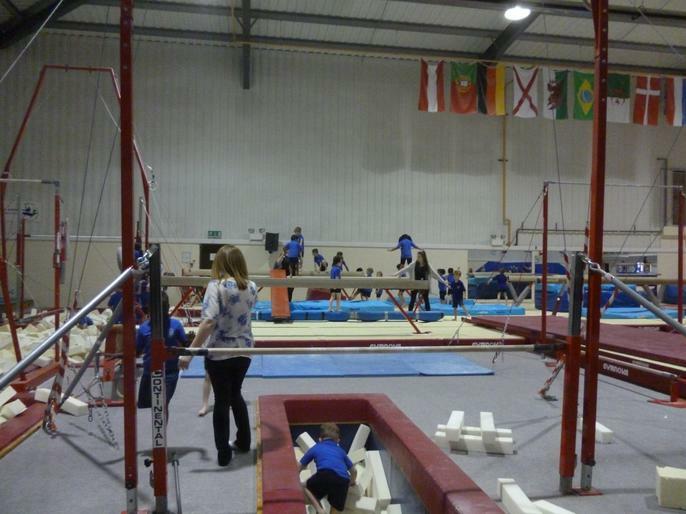 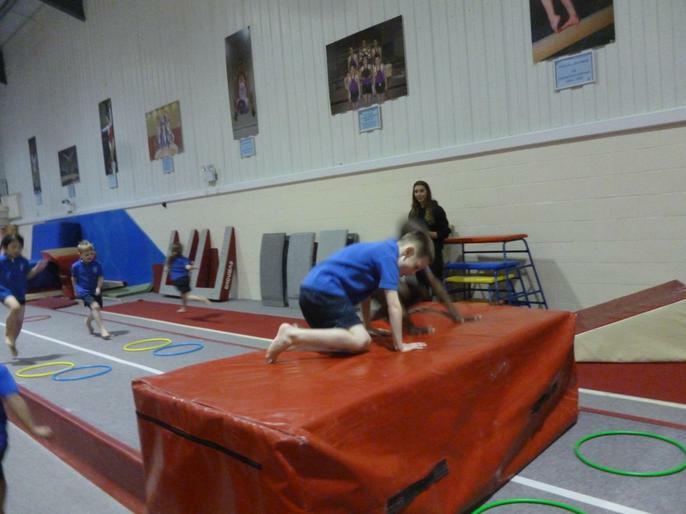 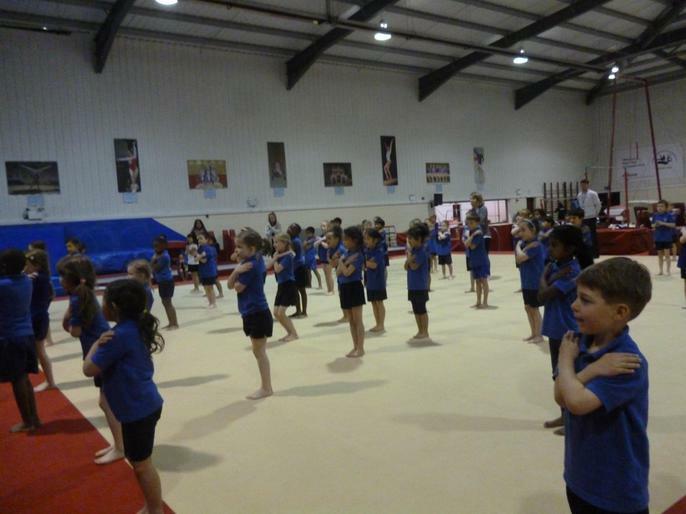 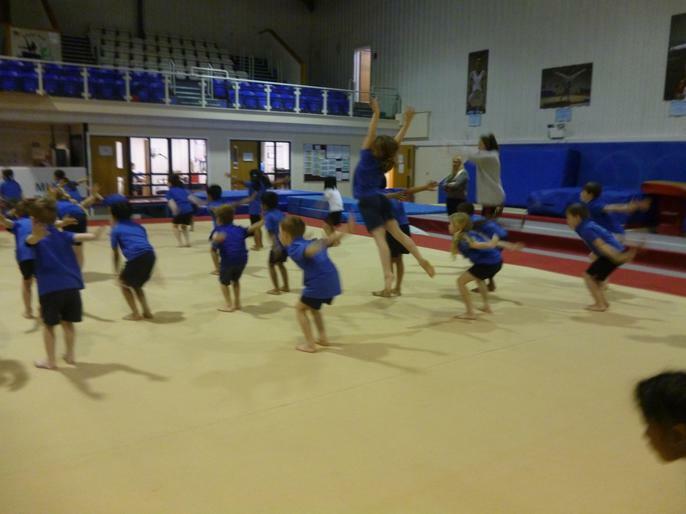 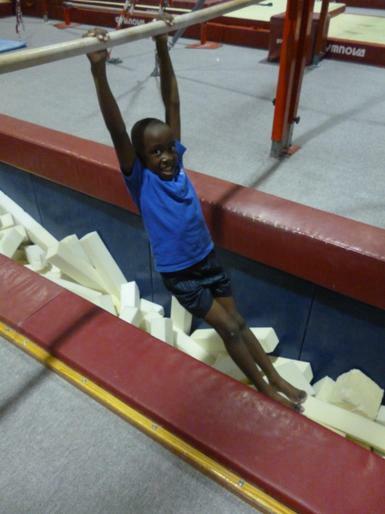 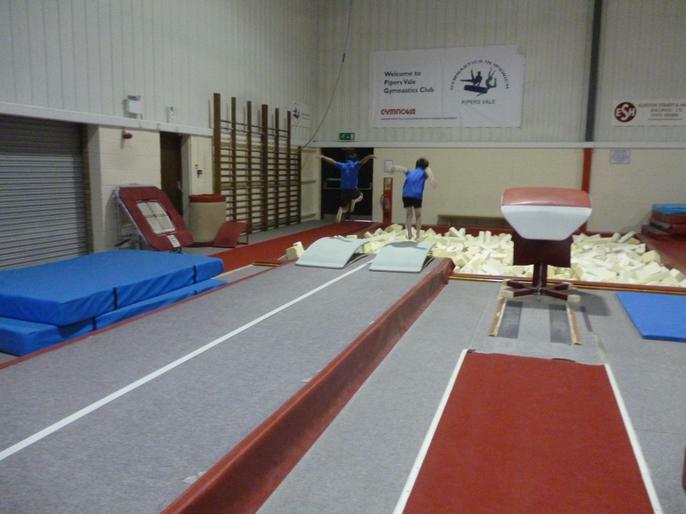 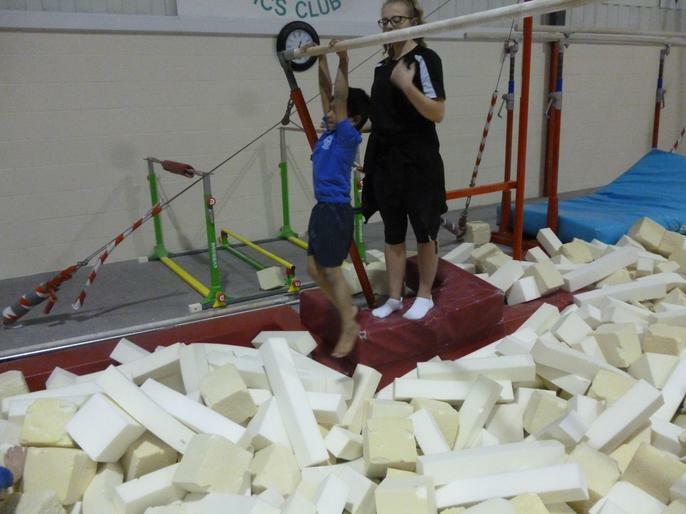 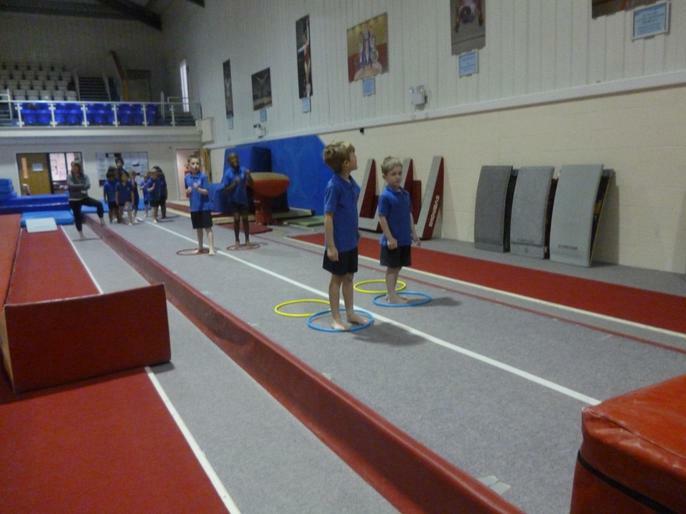 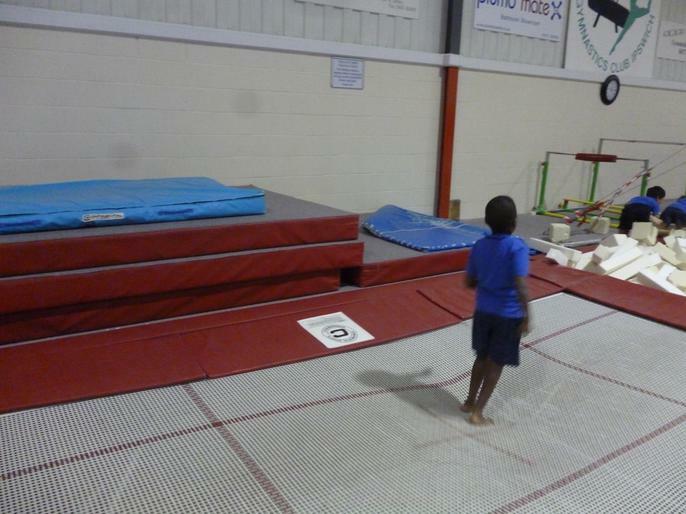 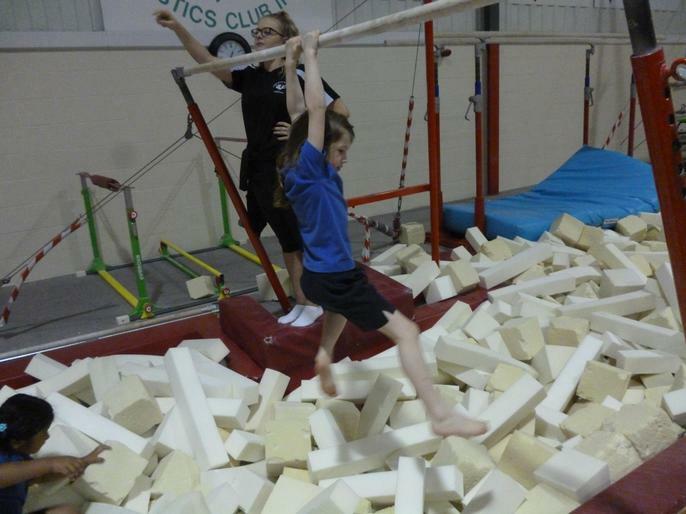 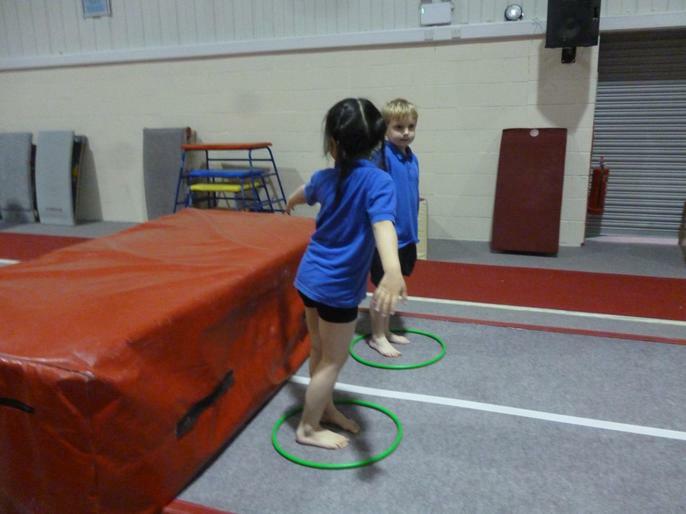 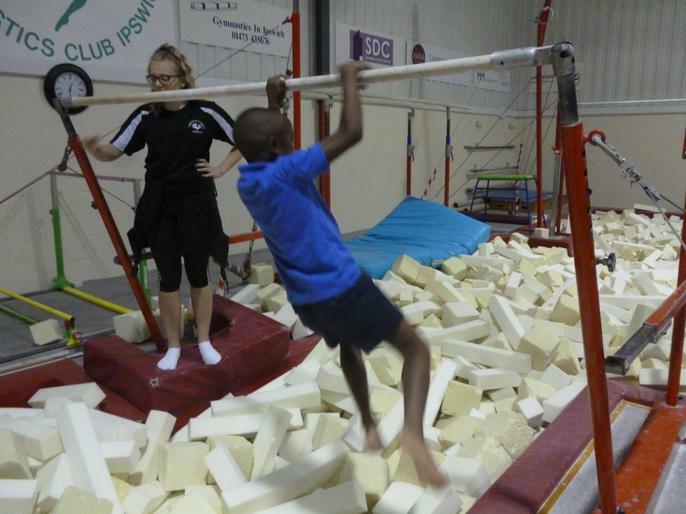 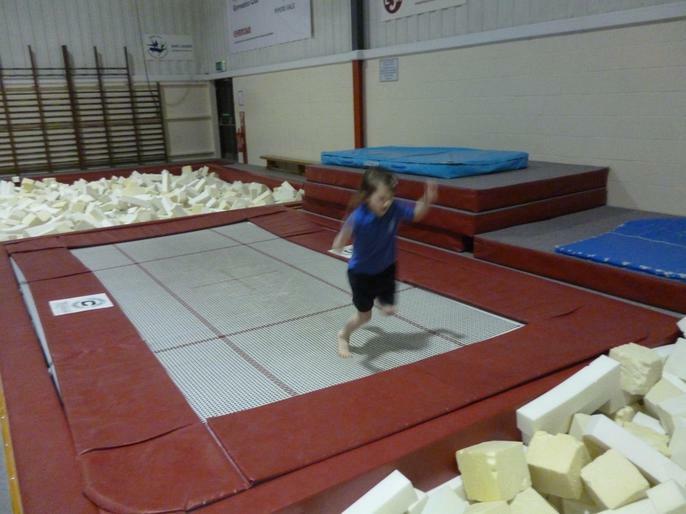 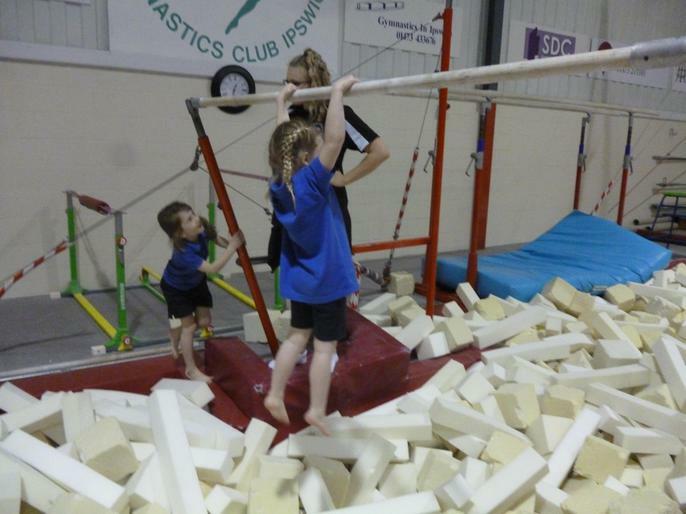 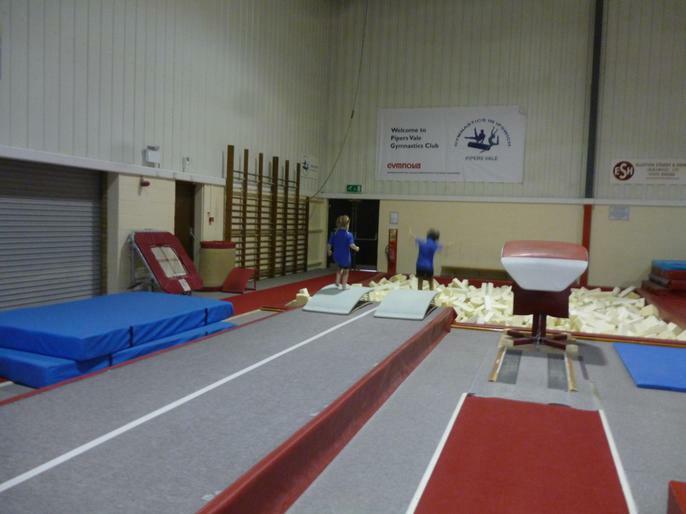 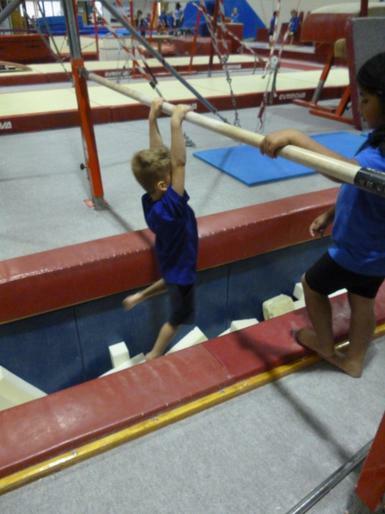 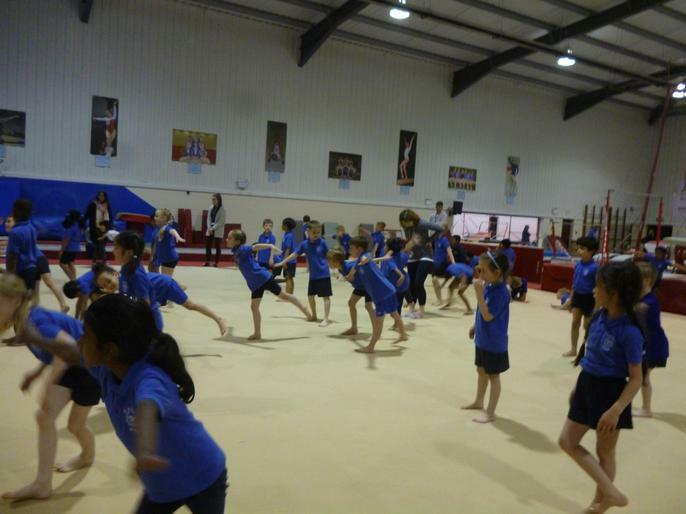 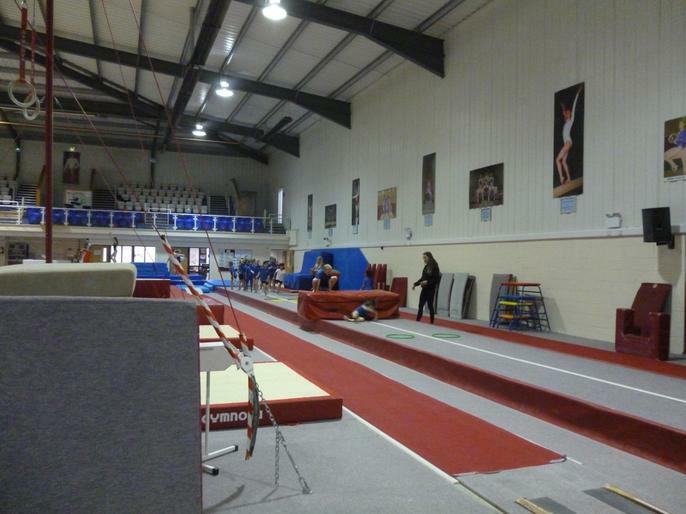 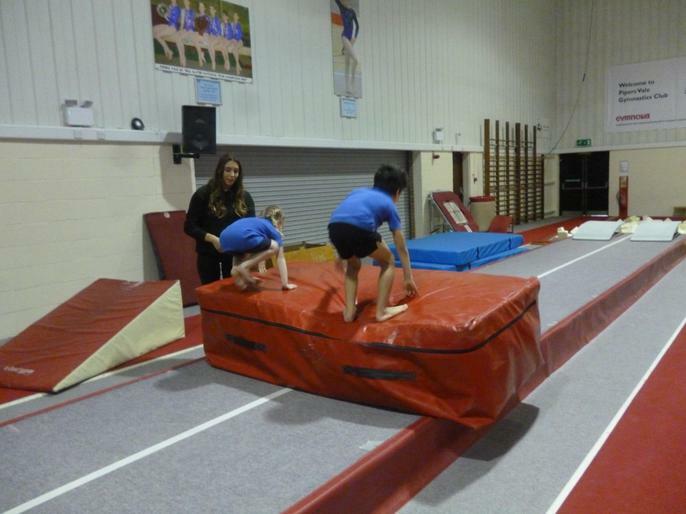 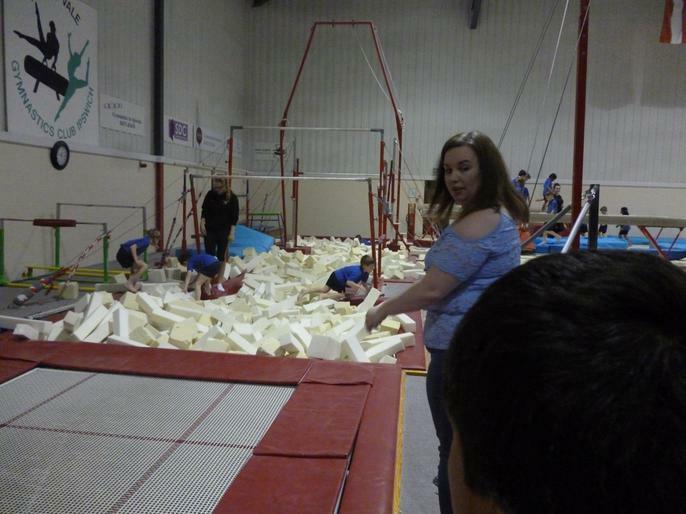 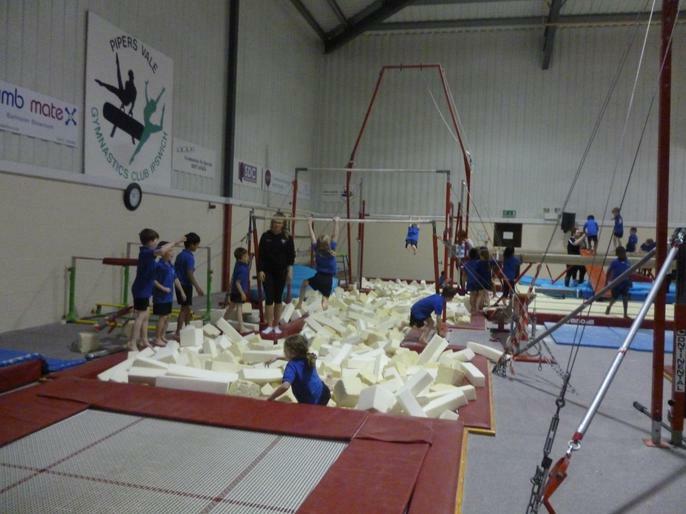 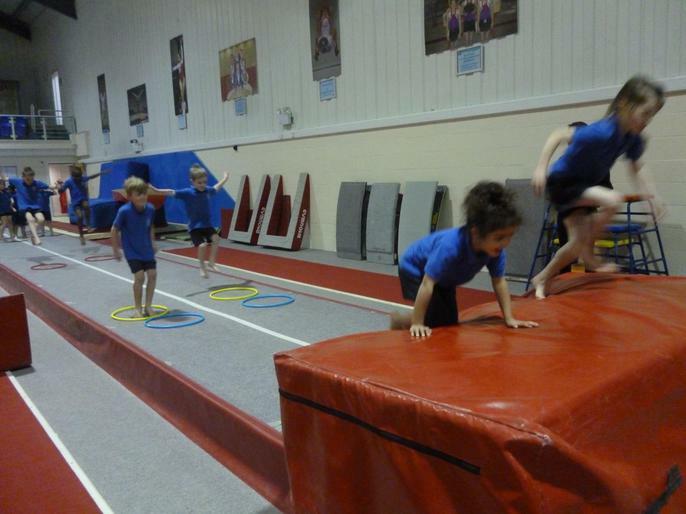 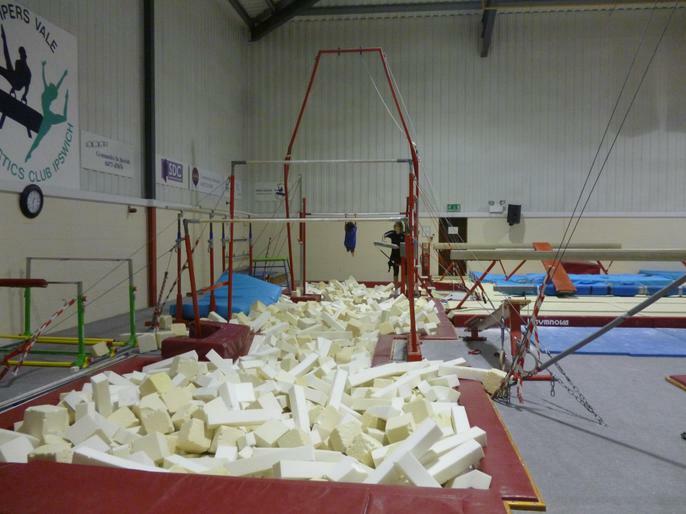 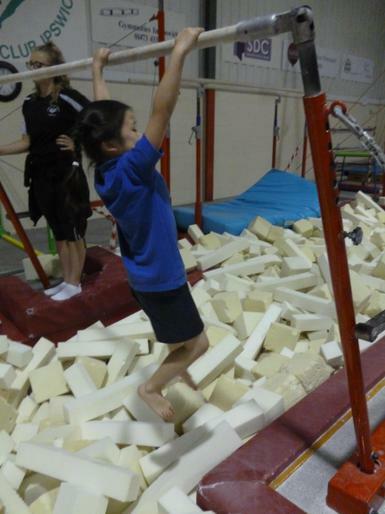 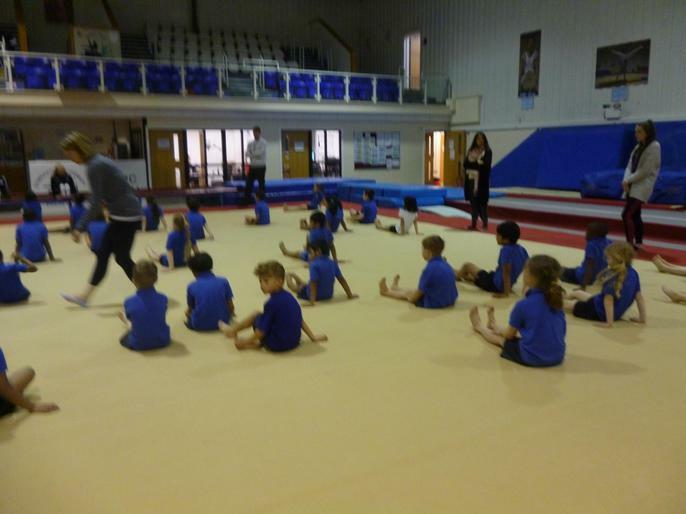 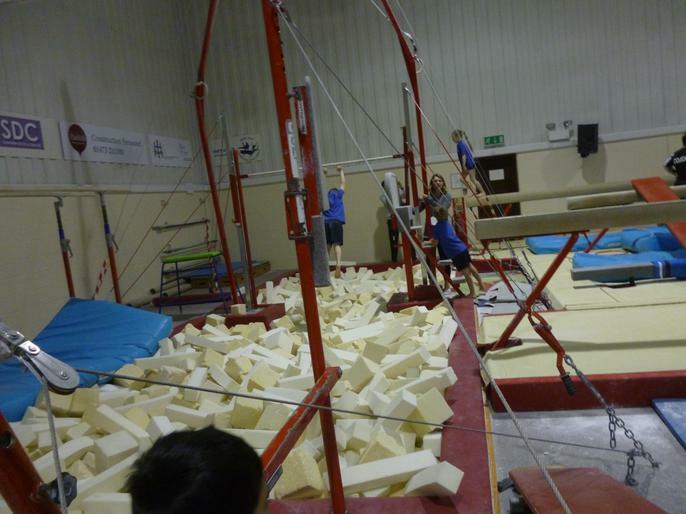 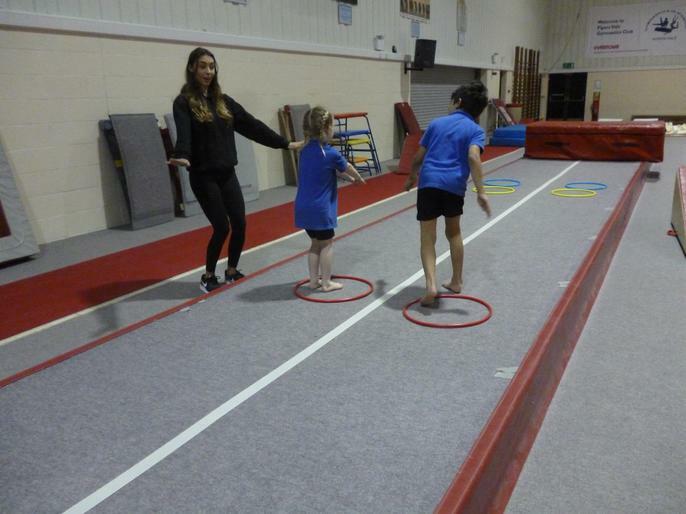 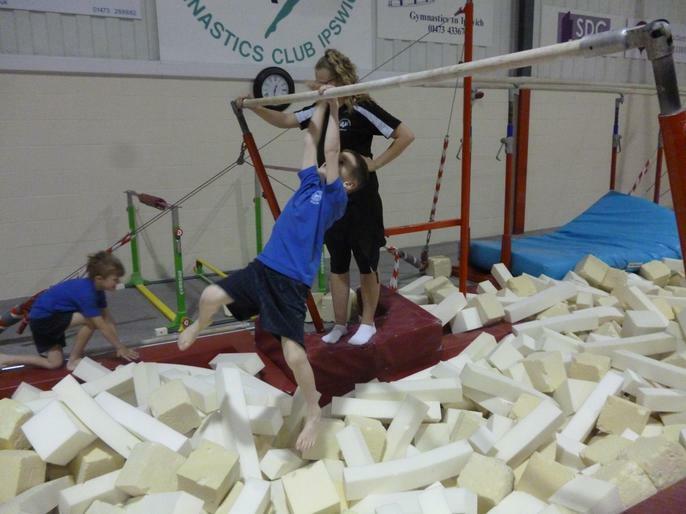 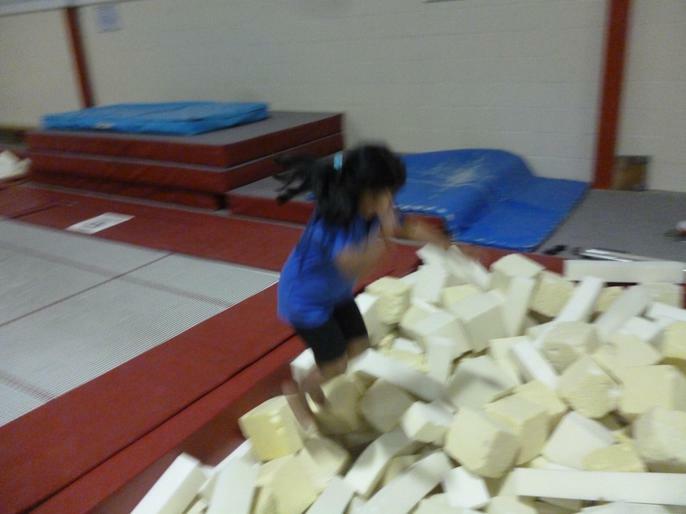 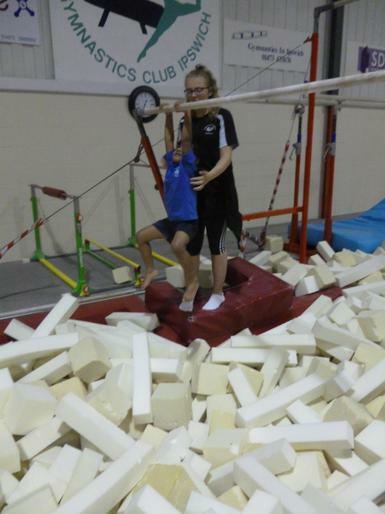 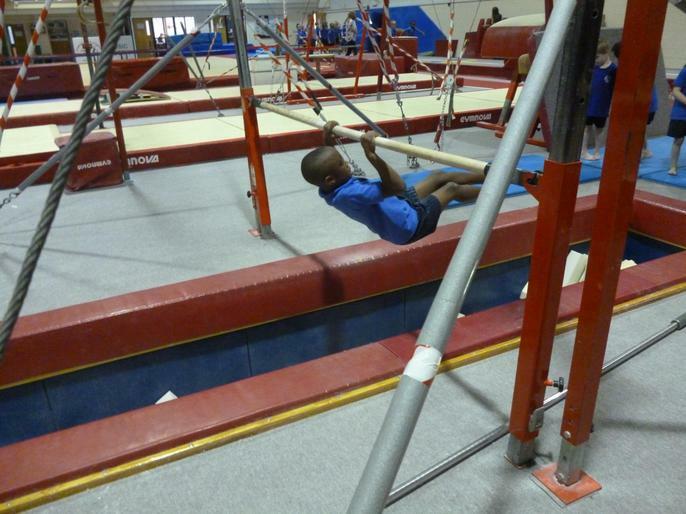 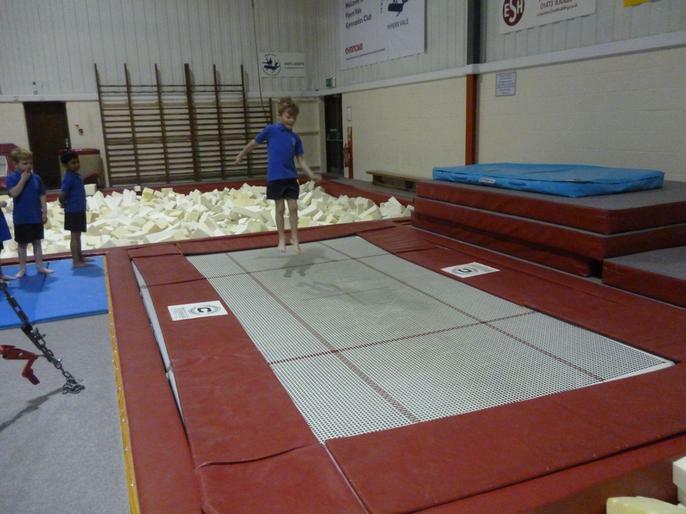 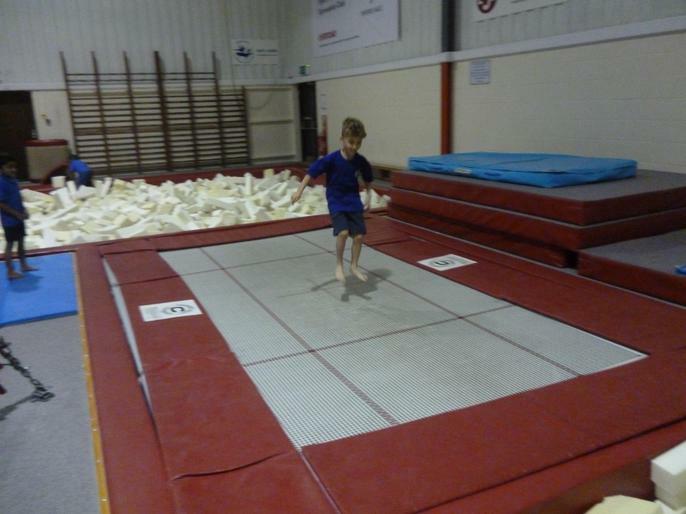 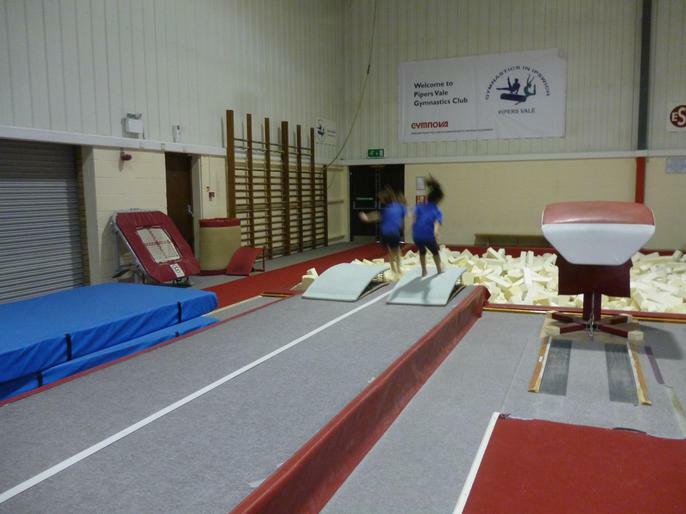 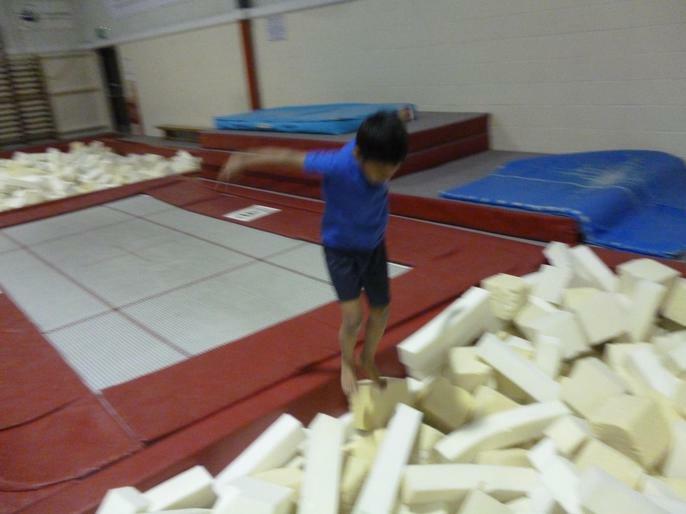 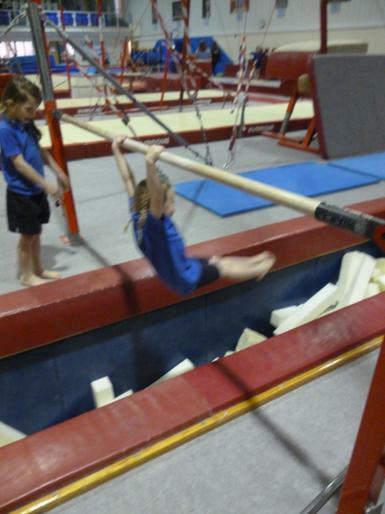 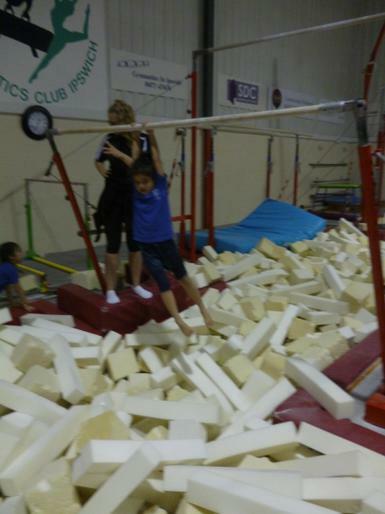 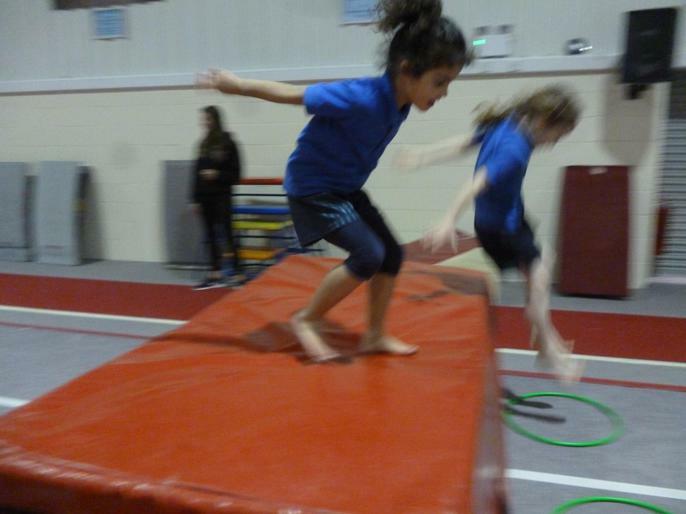 Pipers Vale - On Friday we had a great day at Pipers Vale Gymnastics Centre. 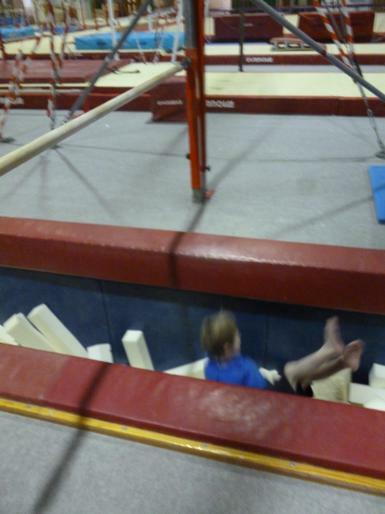 We used the beam, the bars and the horse. 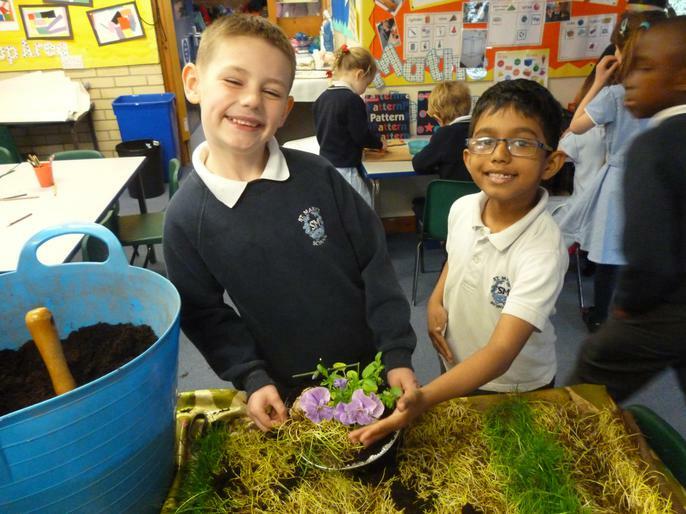 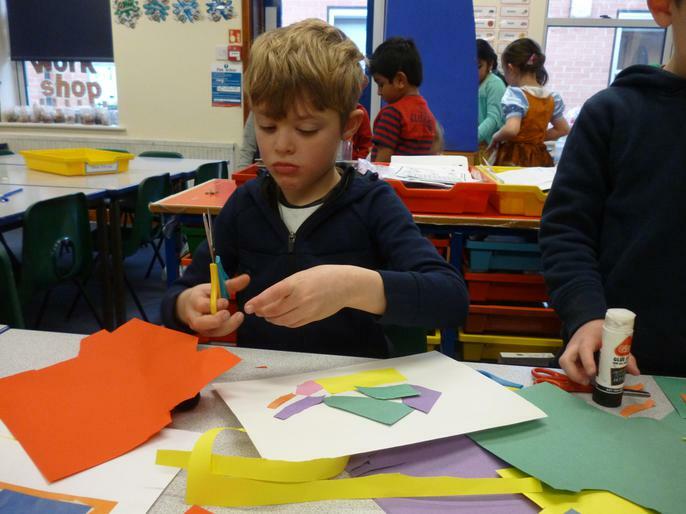 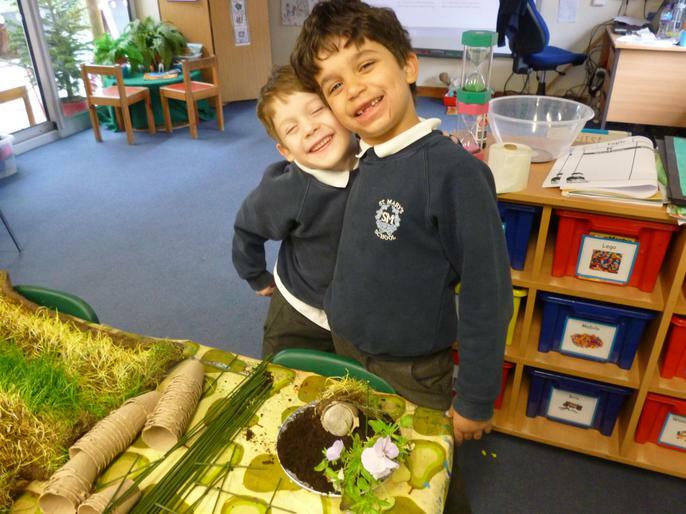 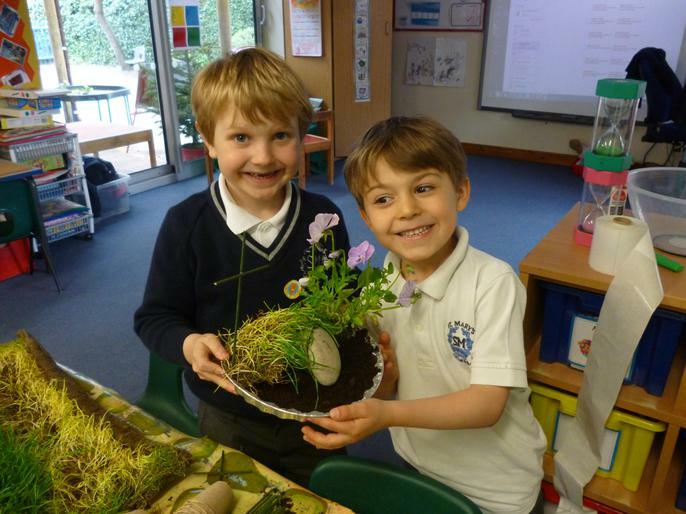 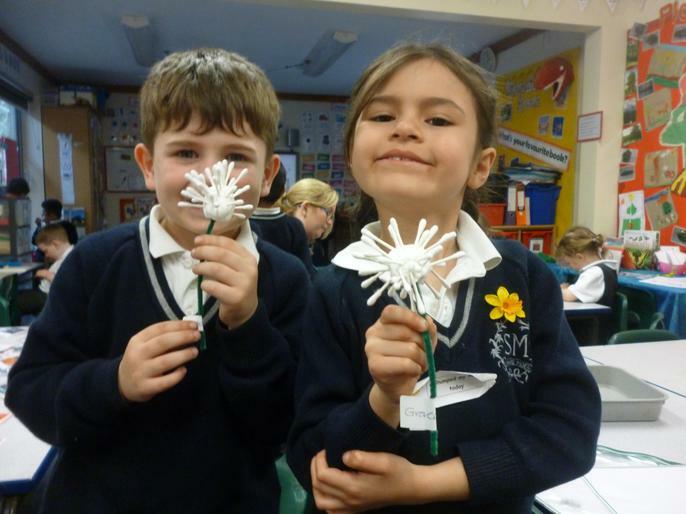 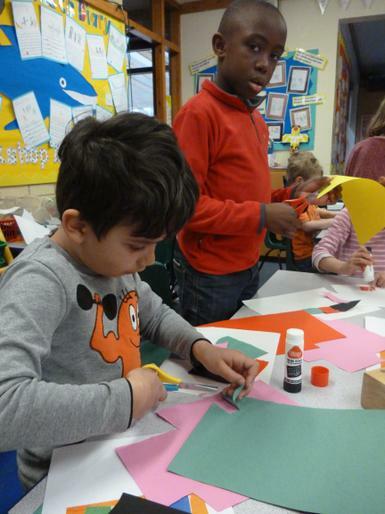 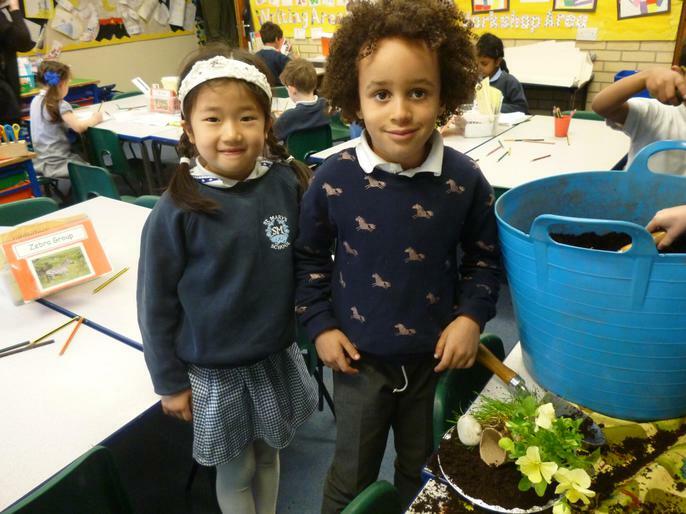 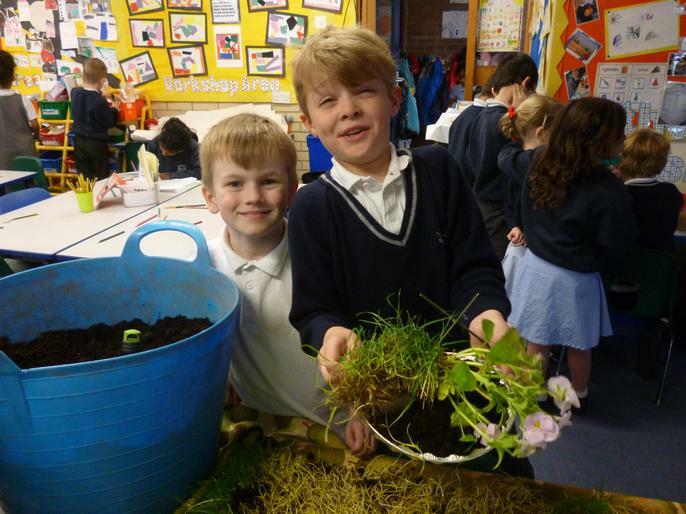 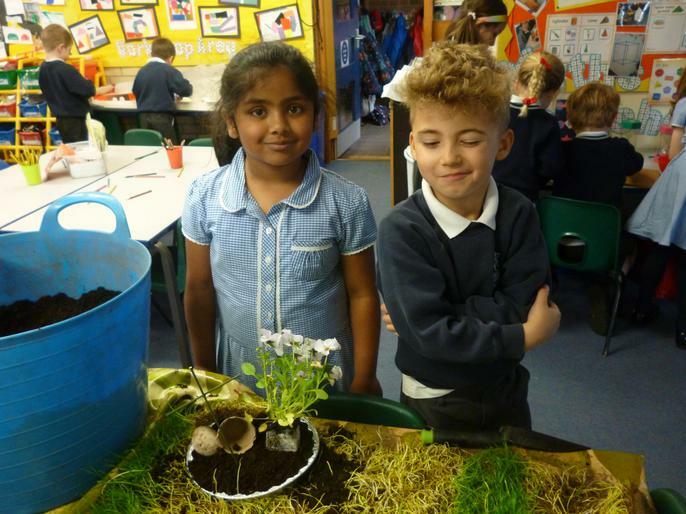 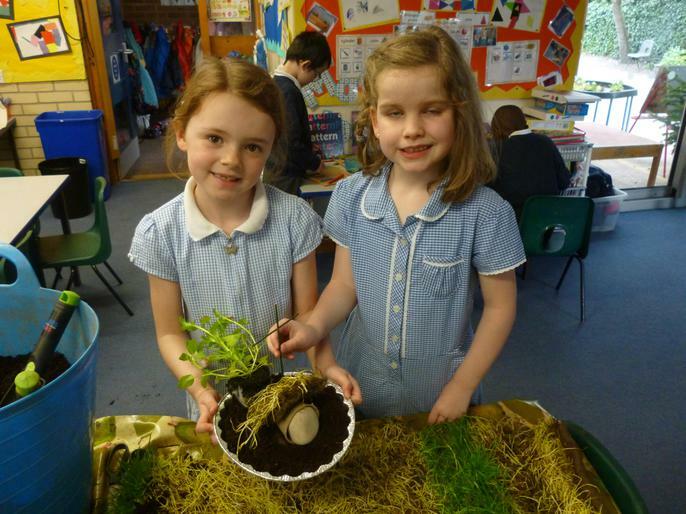 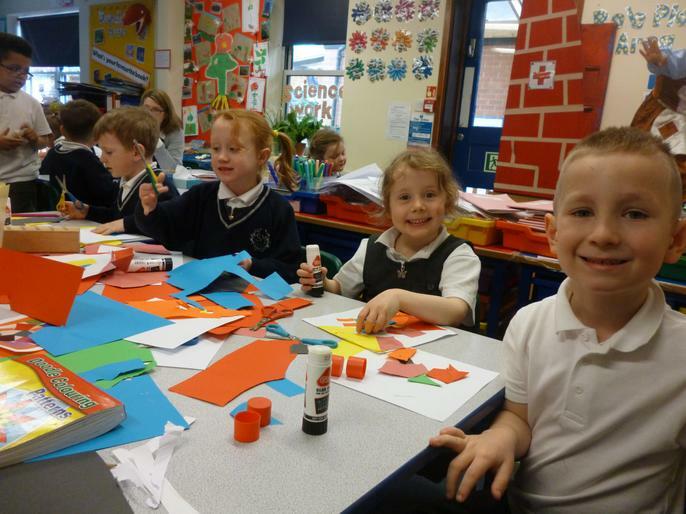 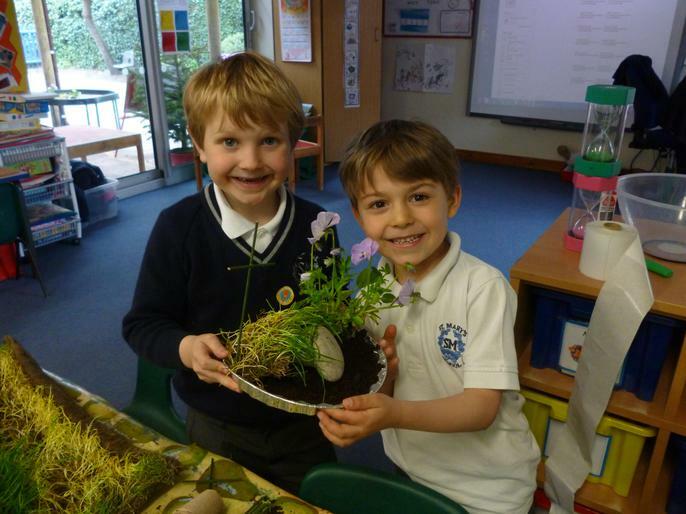 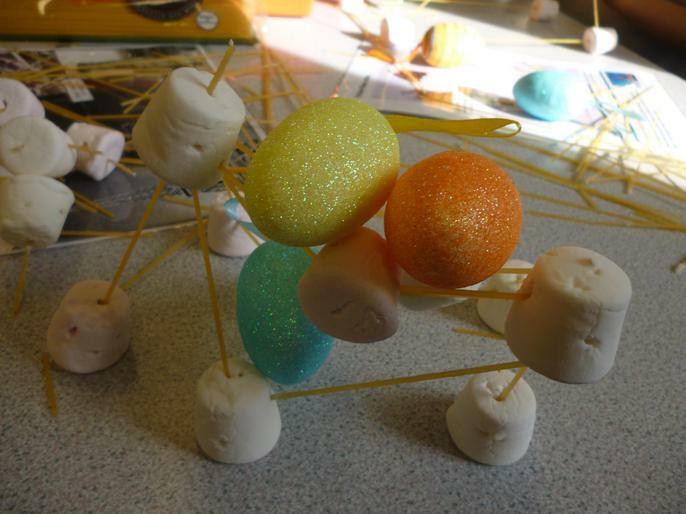 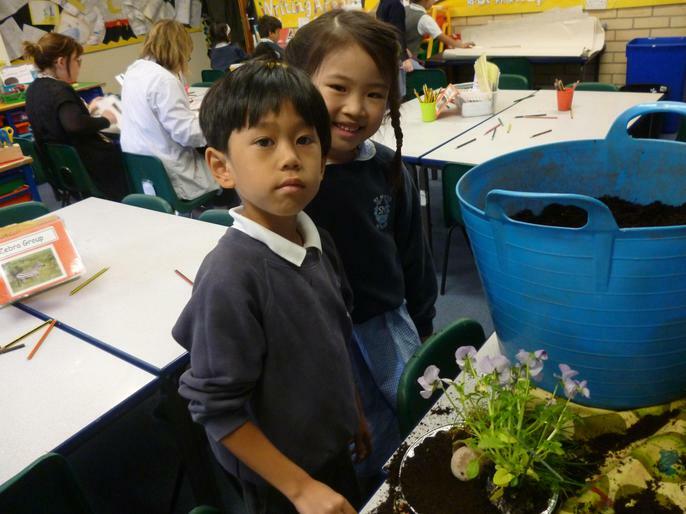 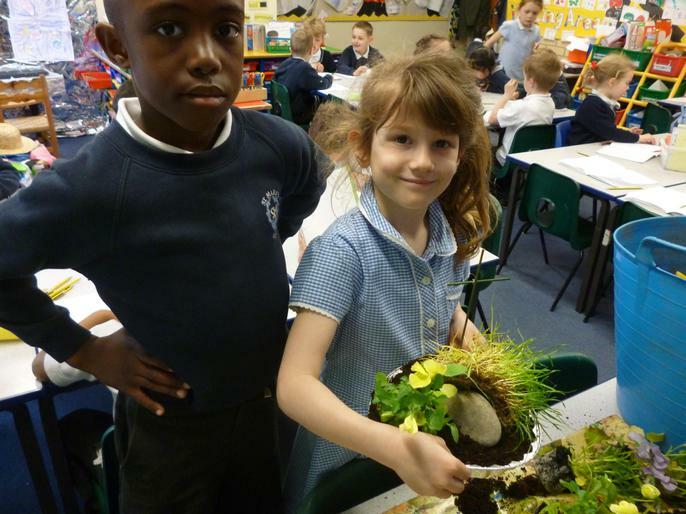 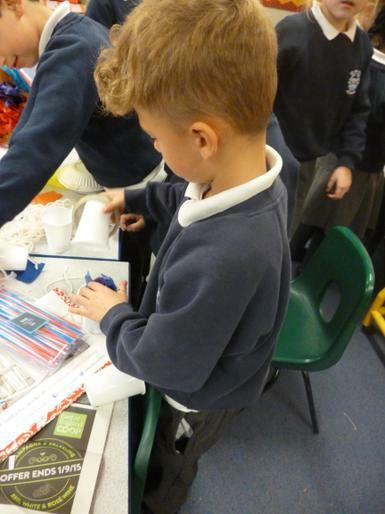 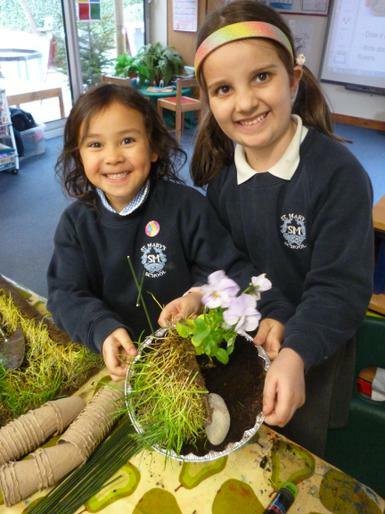 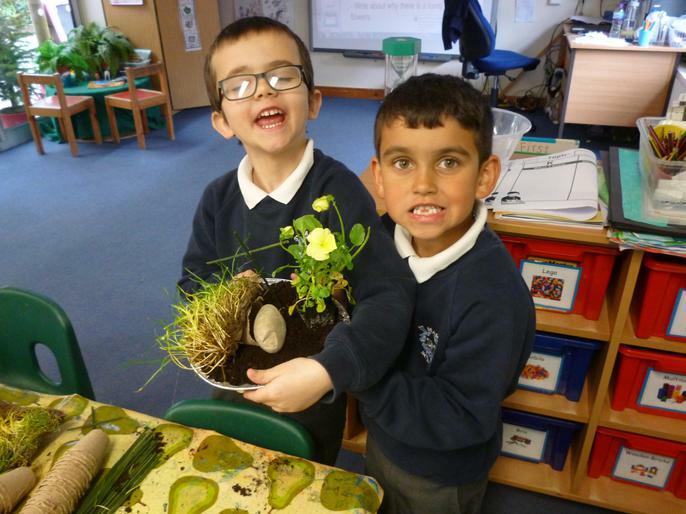 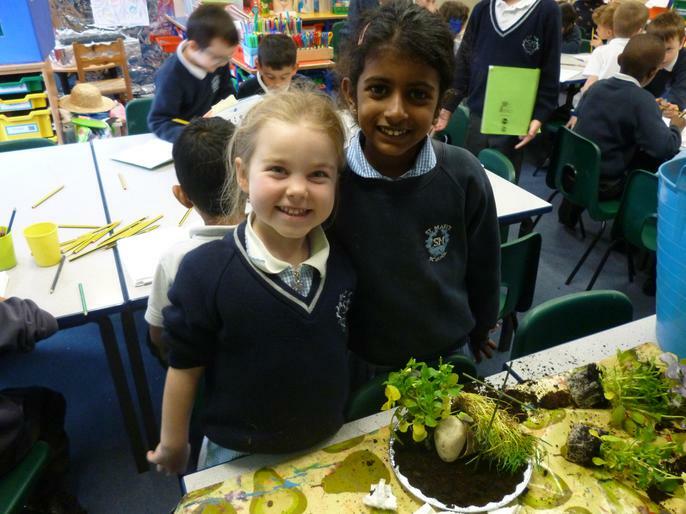 Easter Gardens - In RE we made Easter gardens to celebrate that Jesus rose from the dead for us. 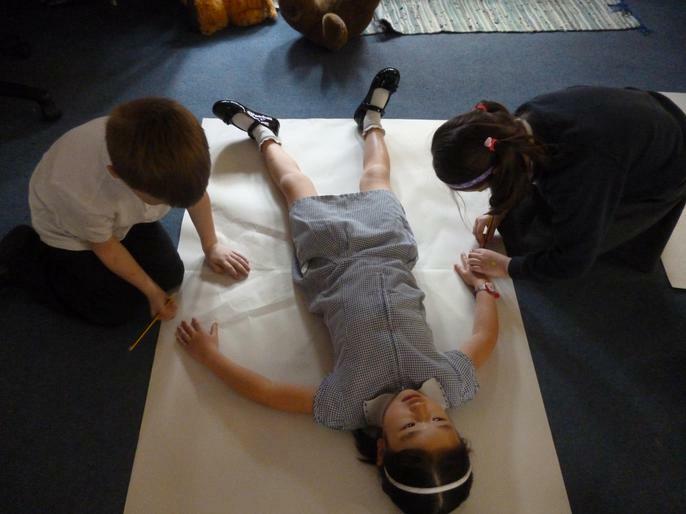 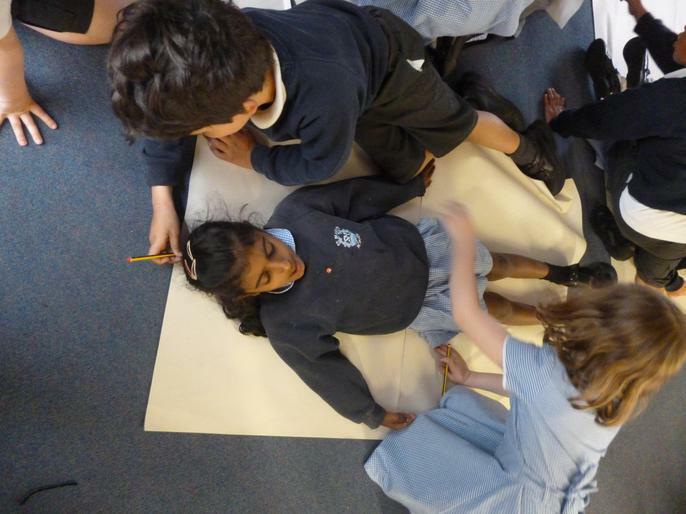 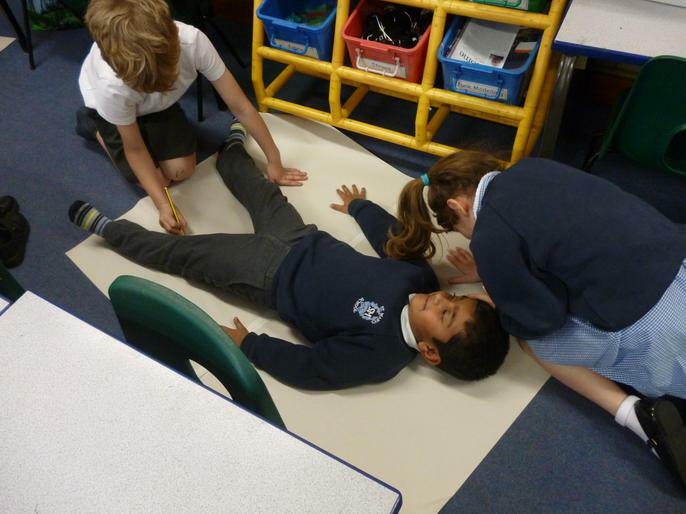 Science - in science we drew around each other and labelled as many parts of the body as we could. 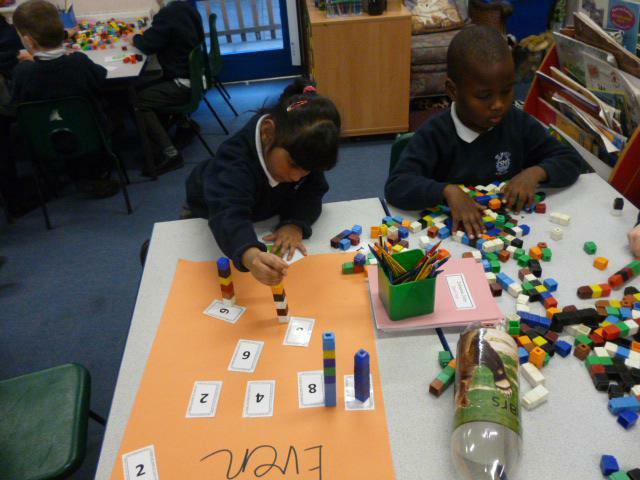 Making Arrays - In numeracy we have been counting in 2's. 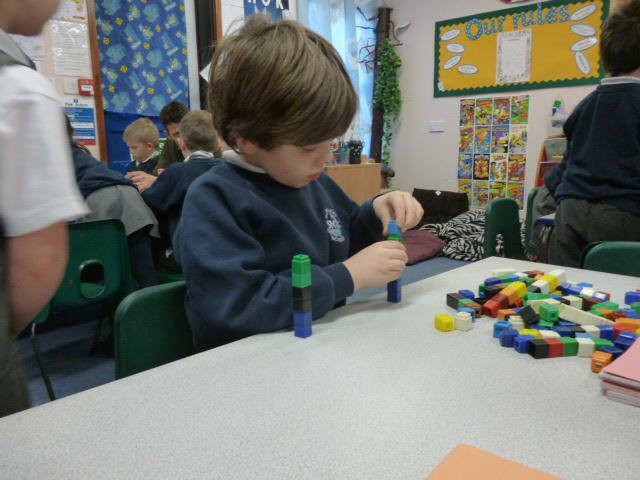 5's and 10's and making arrays to help us answer addition questions. 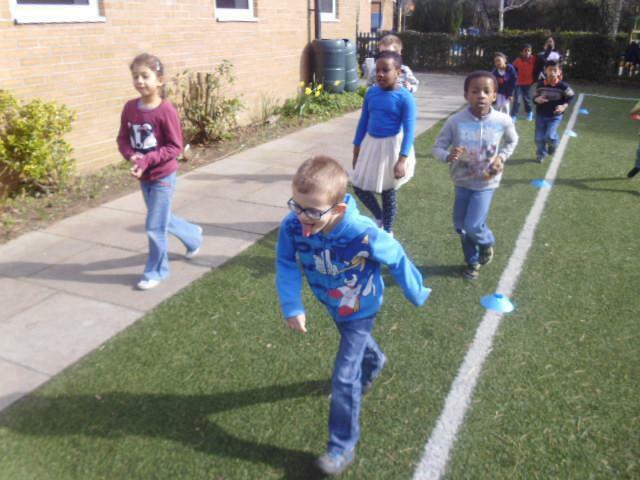 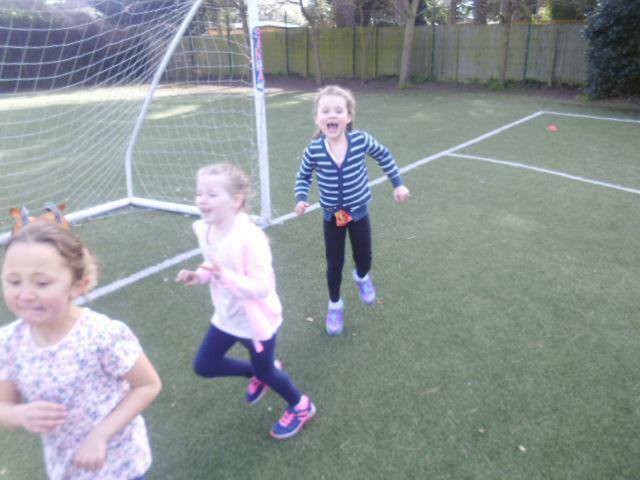 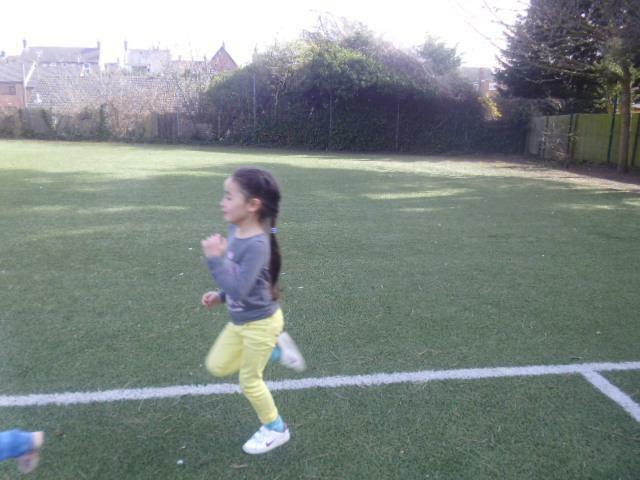 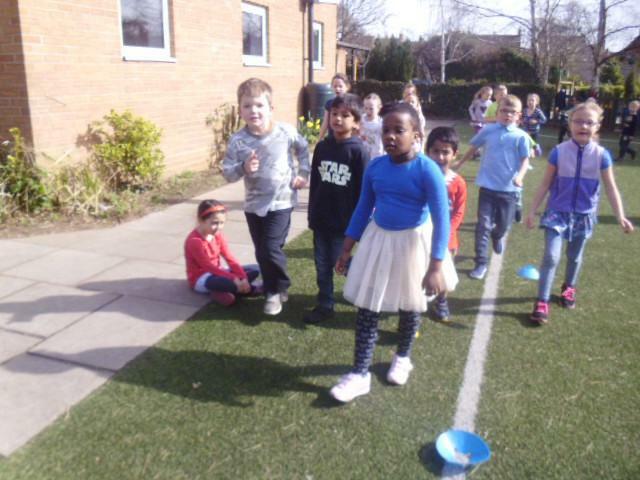 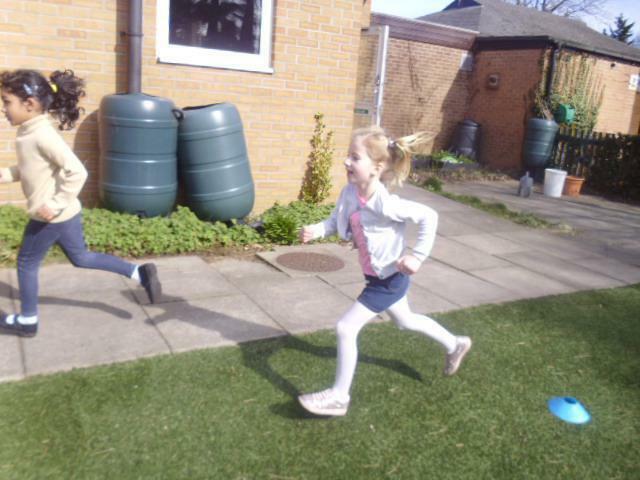 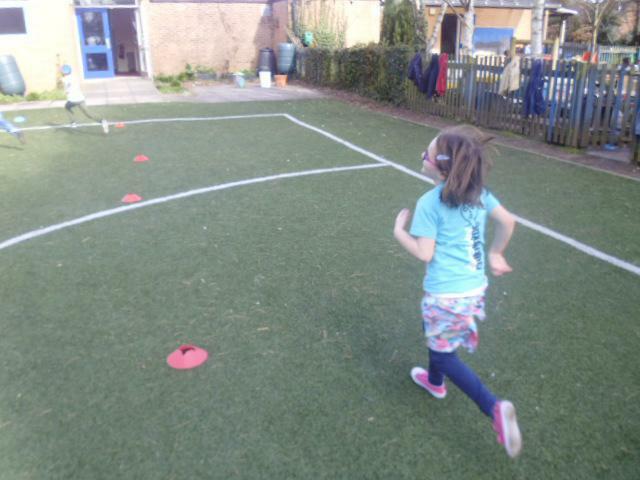 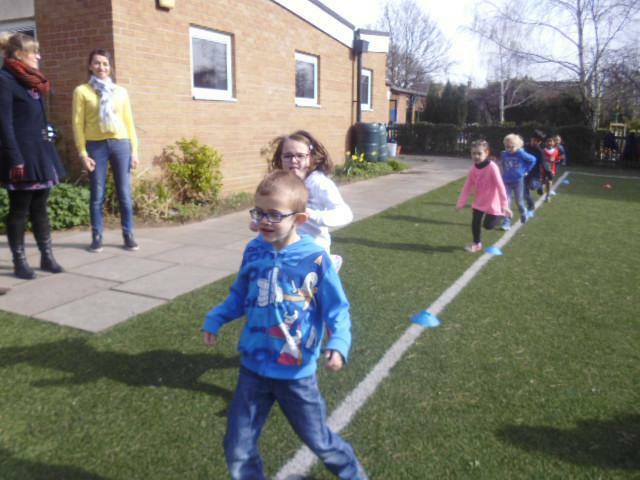 Easter Fun Day - We had a great time egg and spoon racing and hunting for eggs despite the rain! 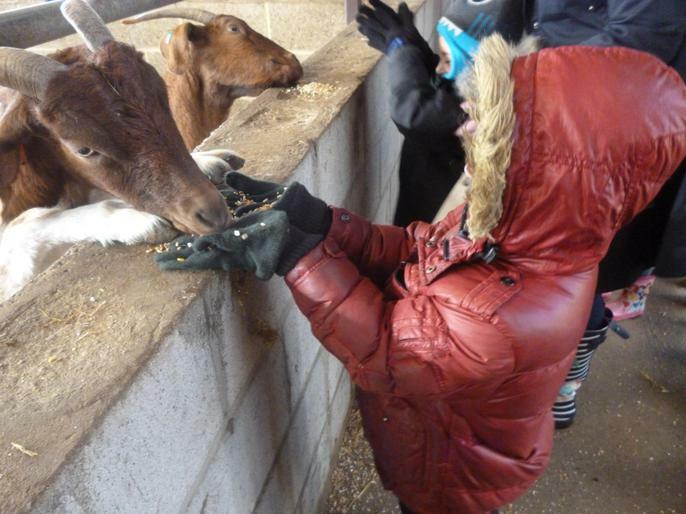 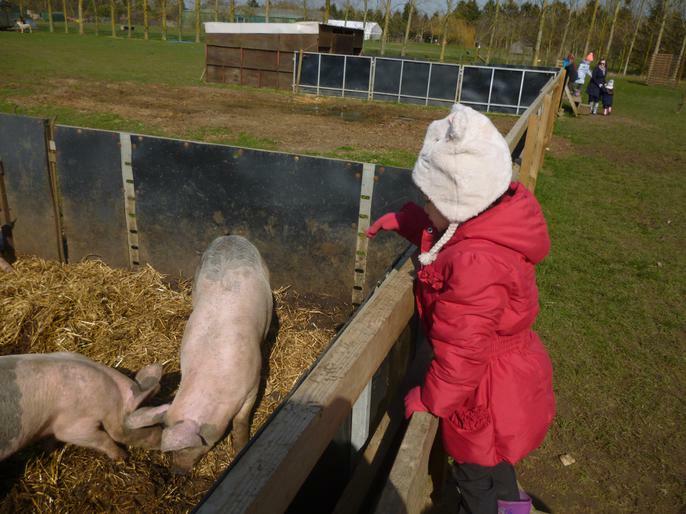 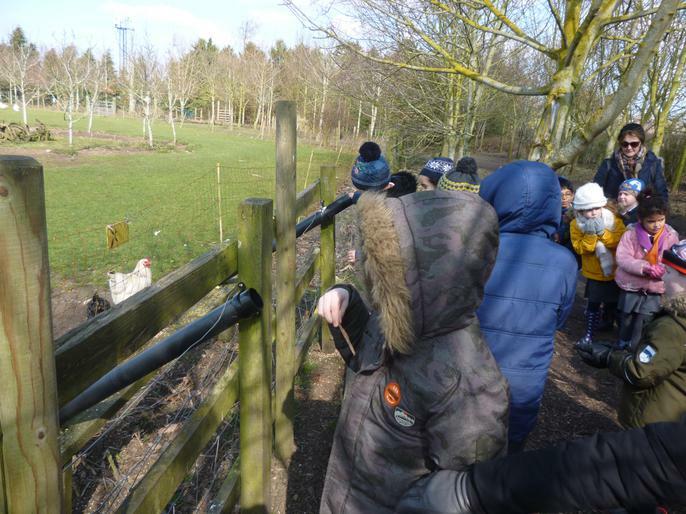 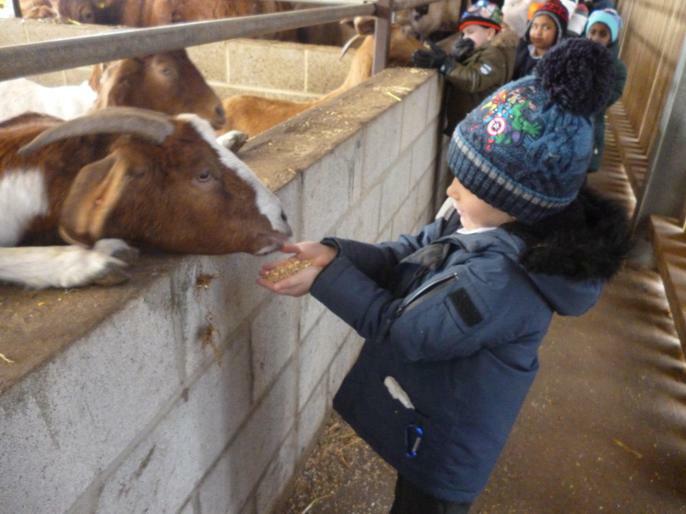 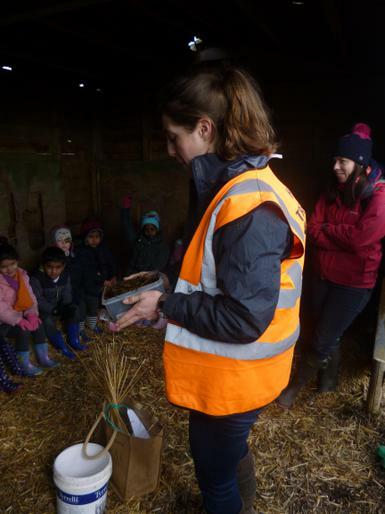 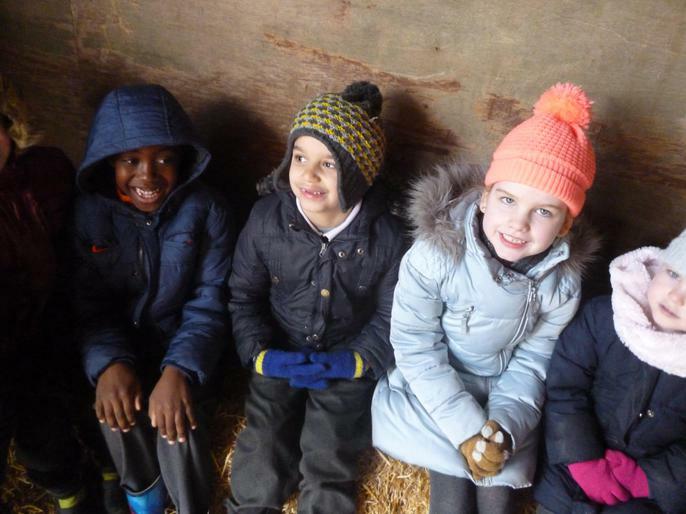 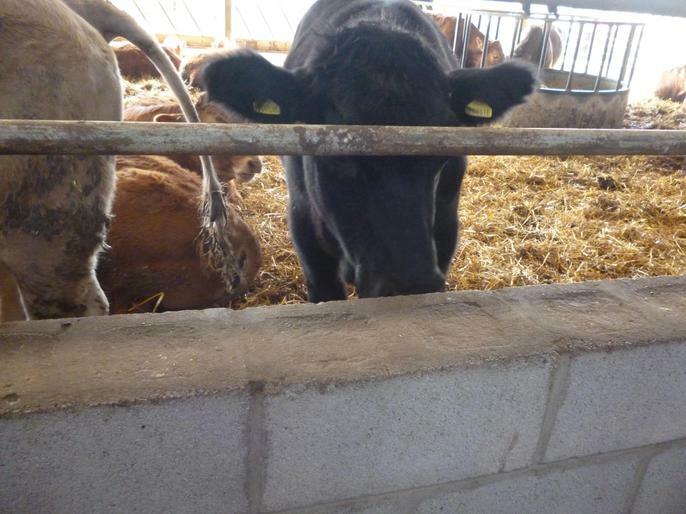 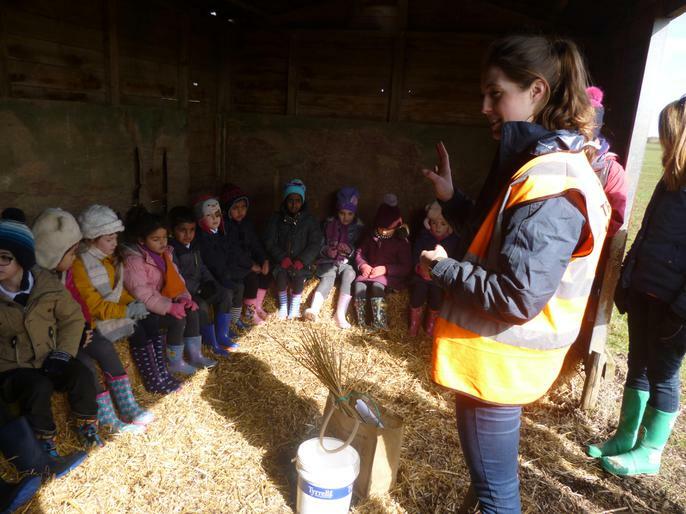 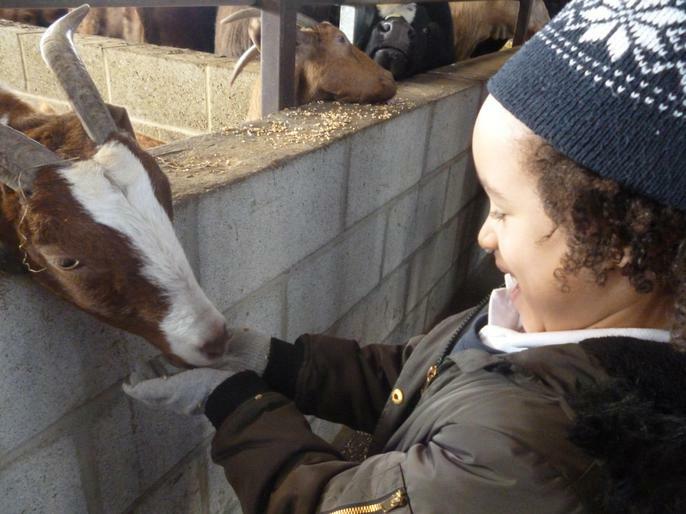 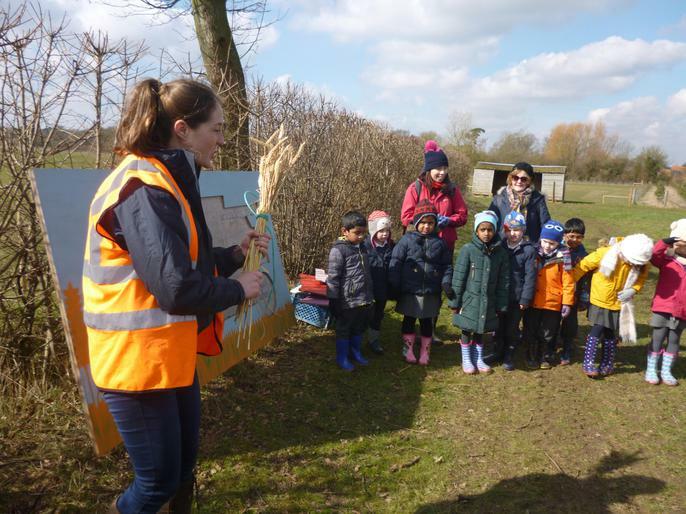 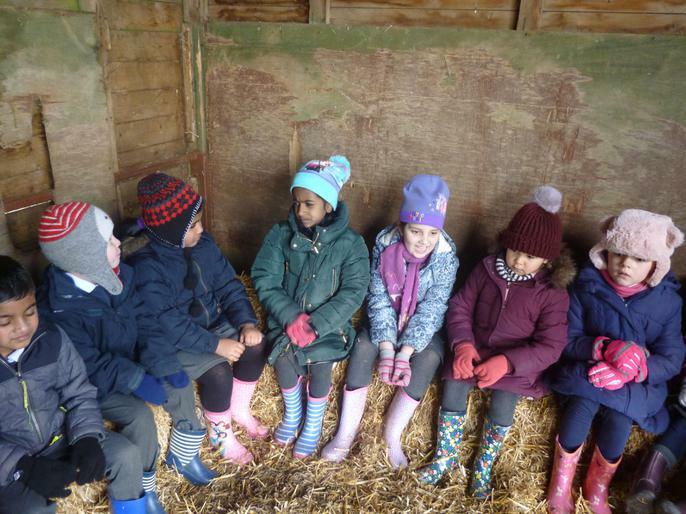 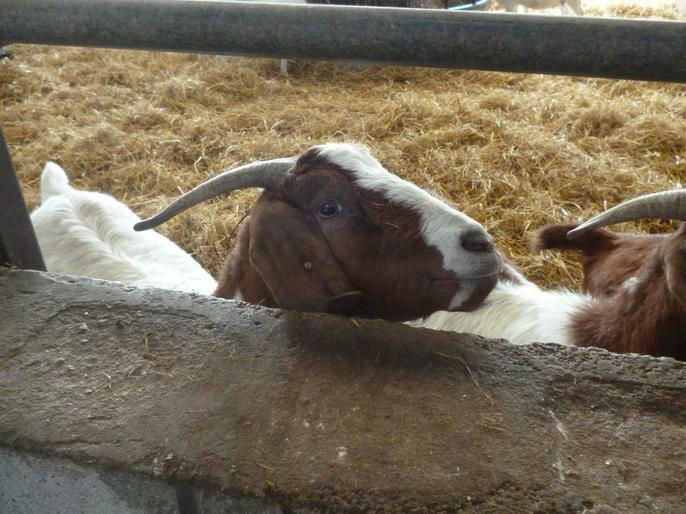 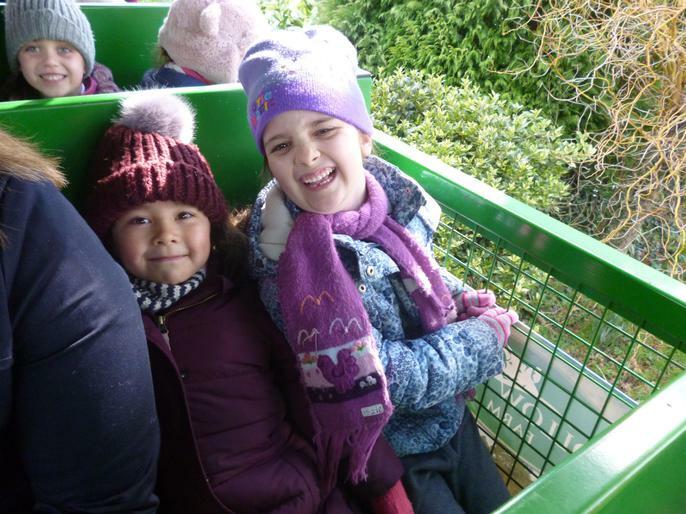 Hollow Trees Farm - Today we went to the farm. 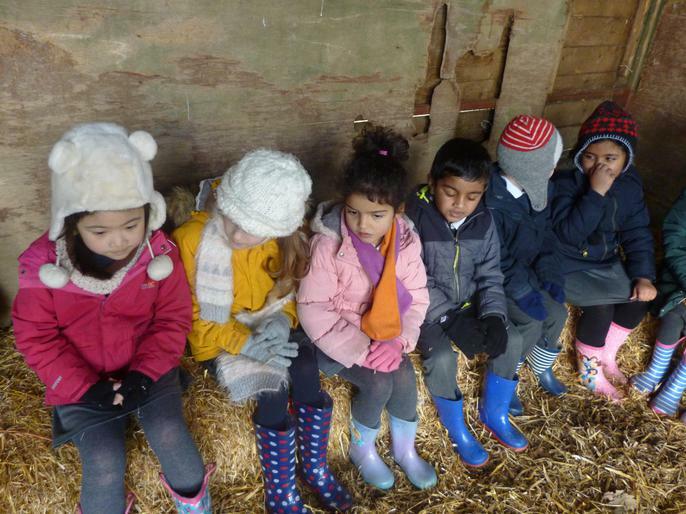 We saw pigs, goats, cows, alpacas, sheet and chickens. 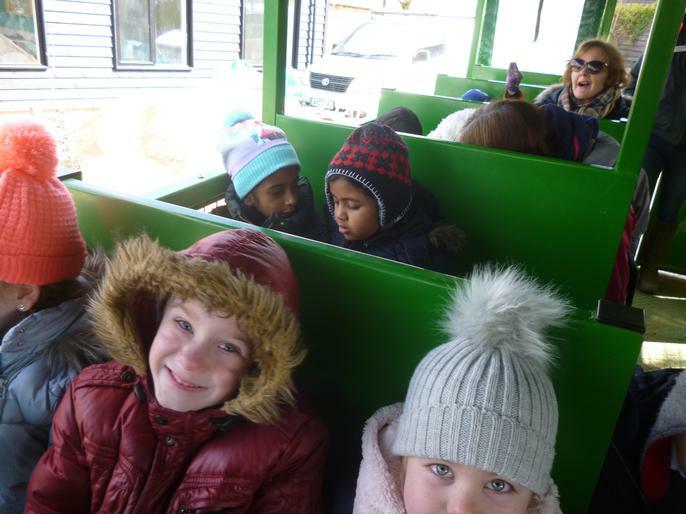 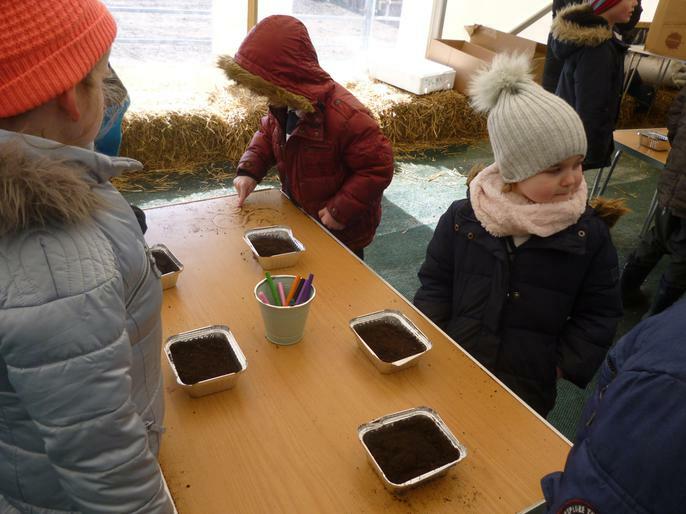 We planted beetroot and went on a tractor ride. 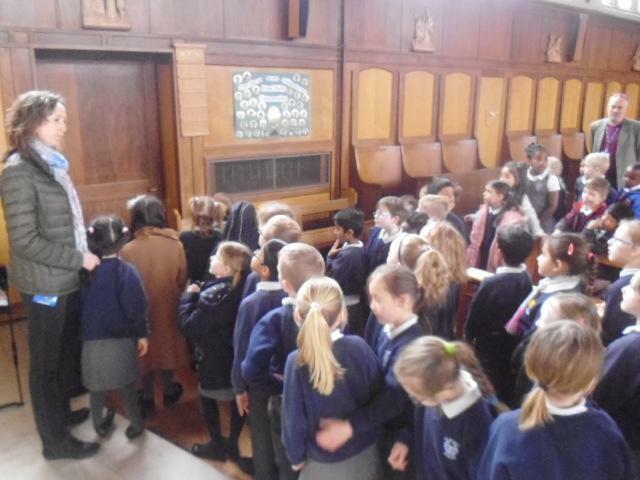 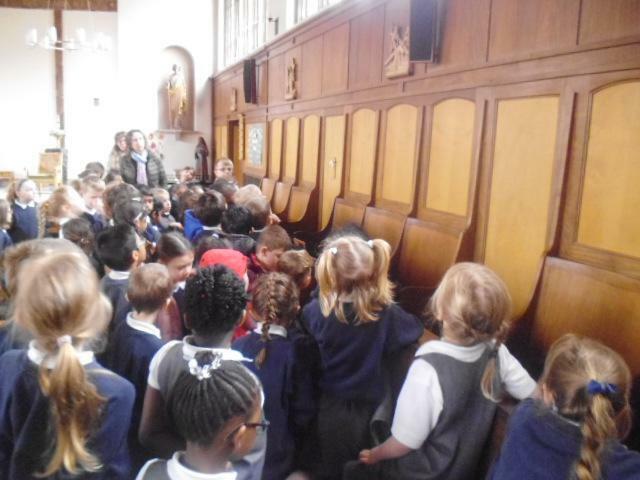 Stations of the Cross - We visited the church this morning to look at the Stations of the Cross. 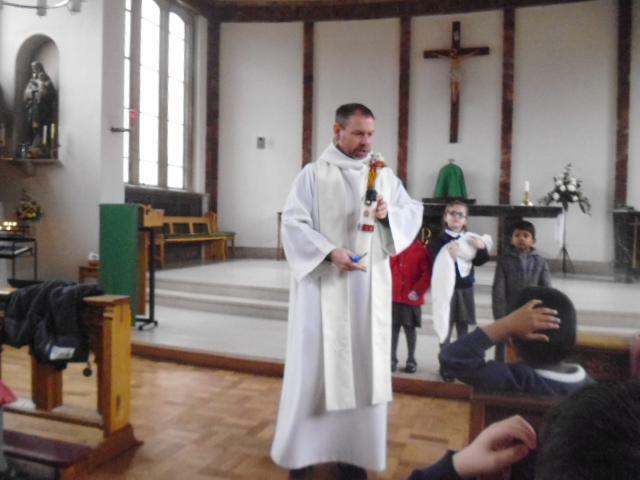 Father John told us all about them. 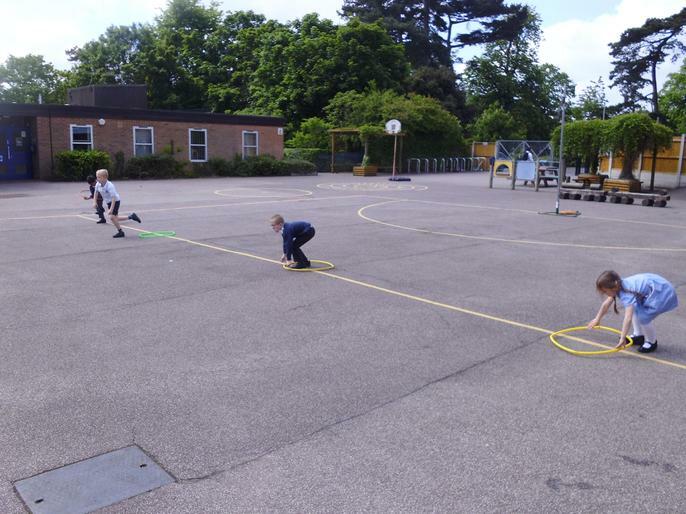 Tennis Training - On Monday morning we had some tennis training. 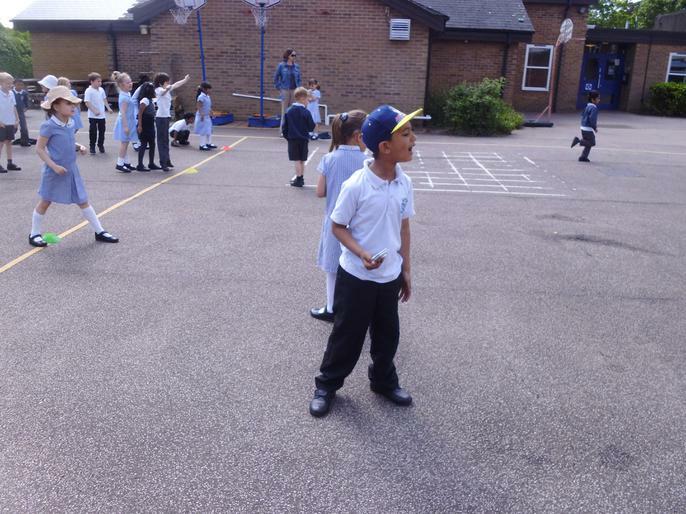 We learnt how to throw and catch and how to use a tennis racket. 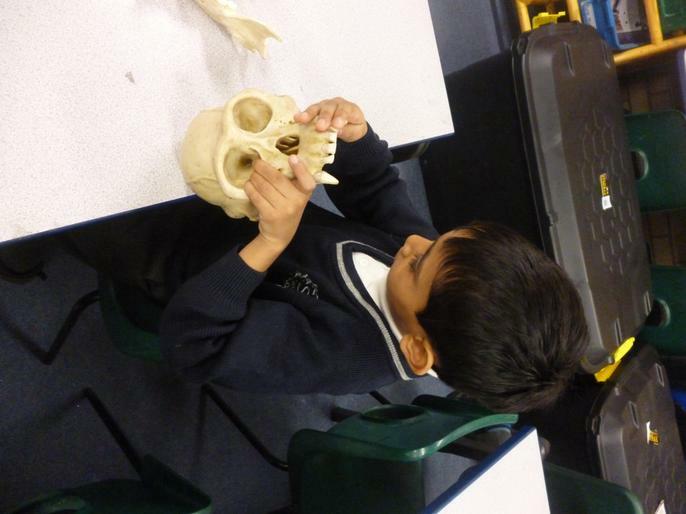 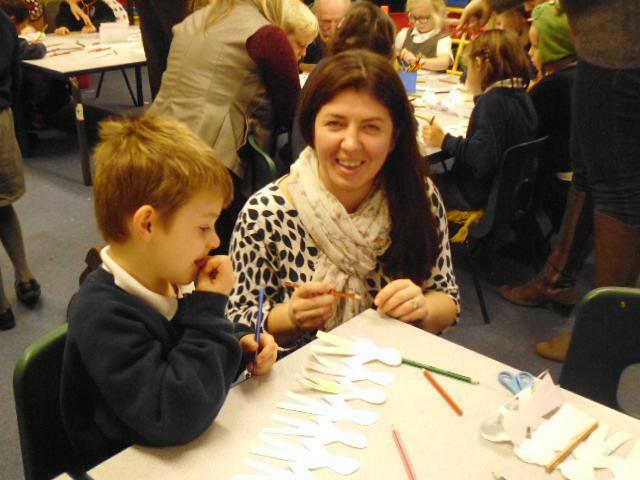 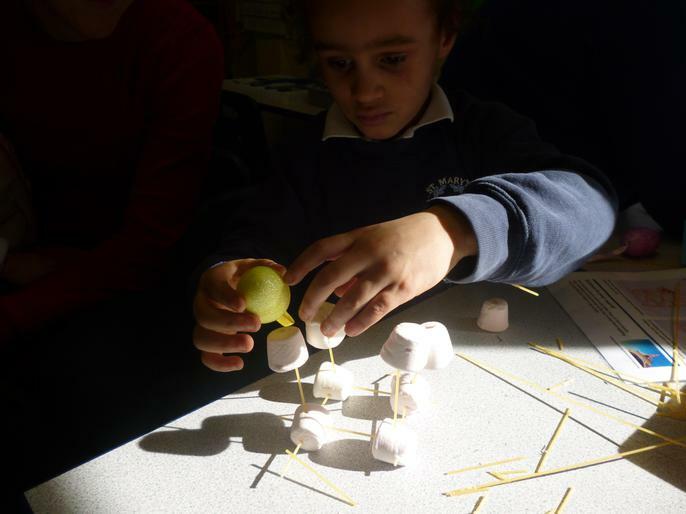 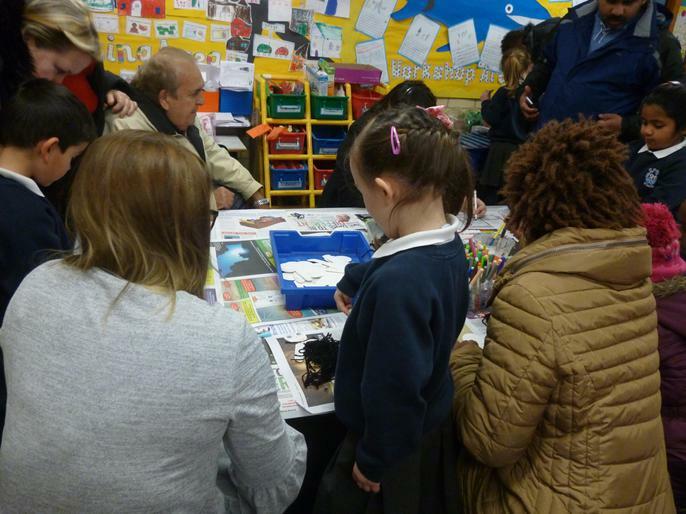 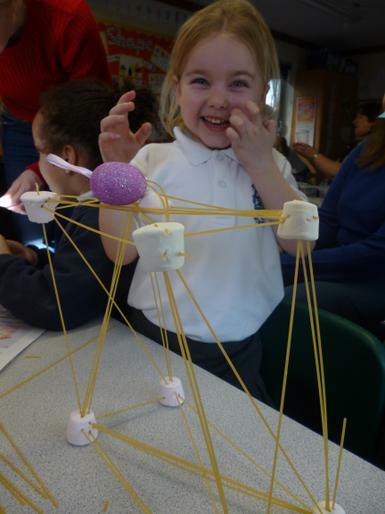 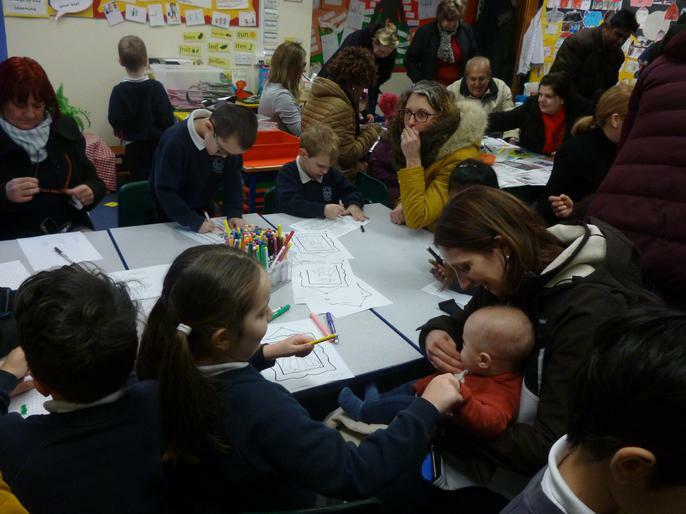 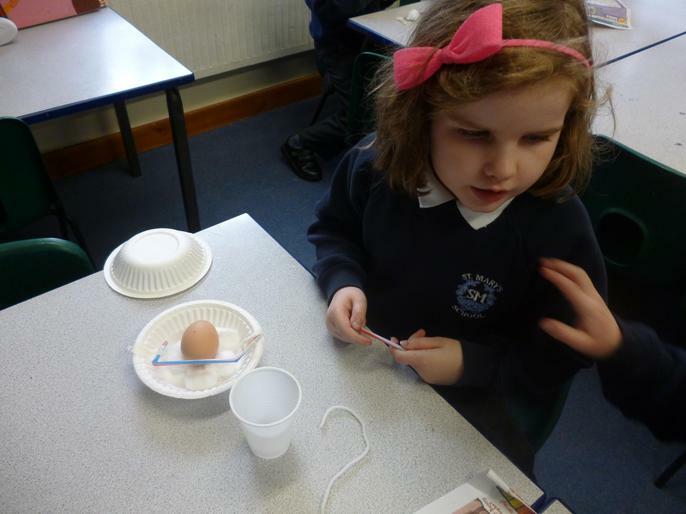 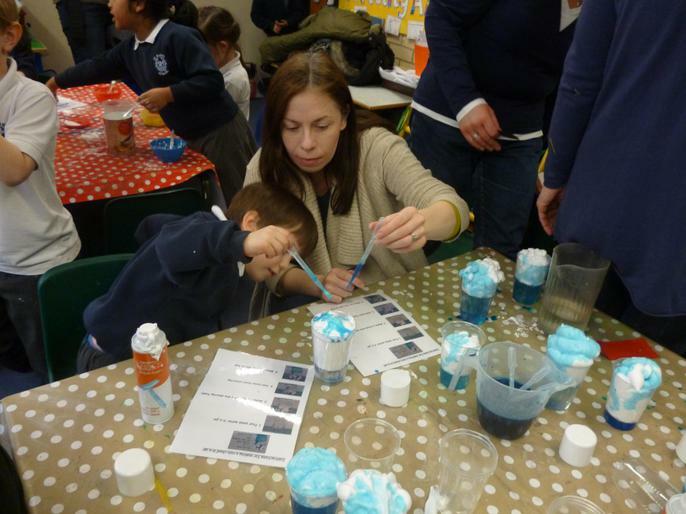 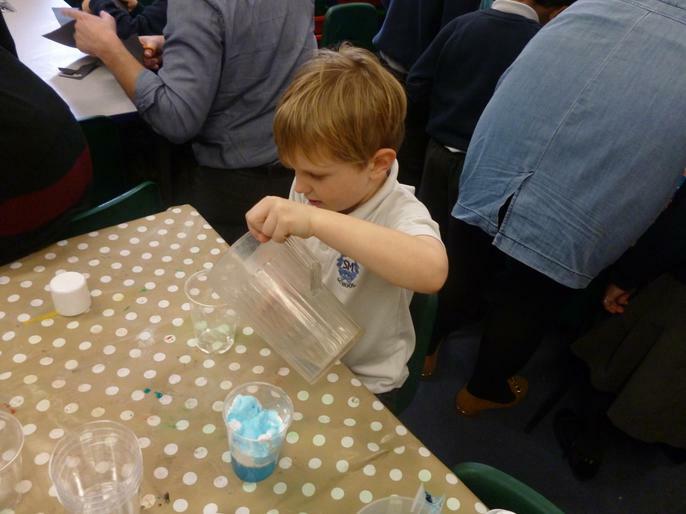 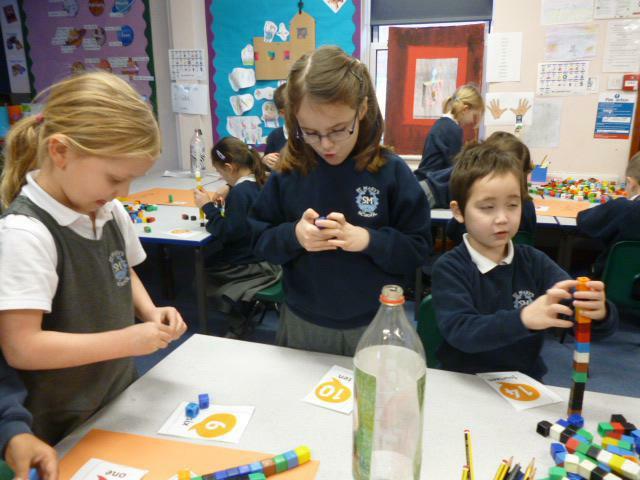 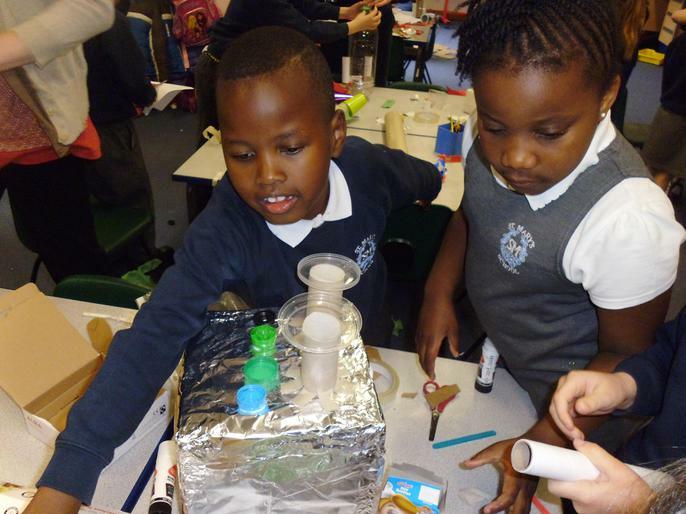 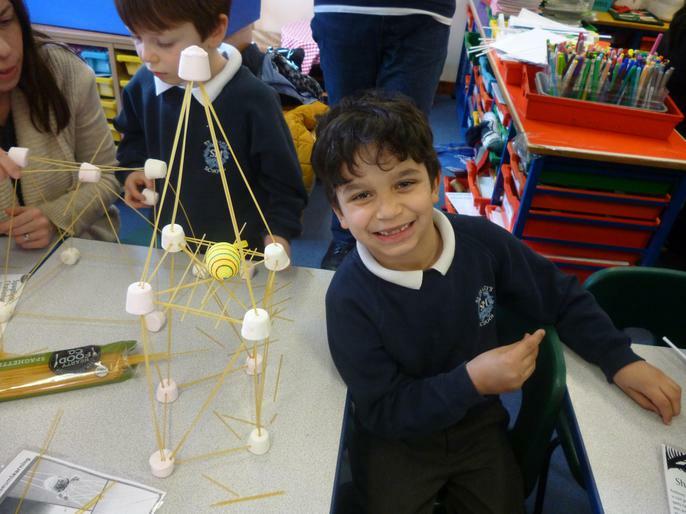 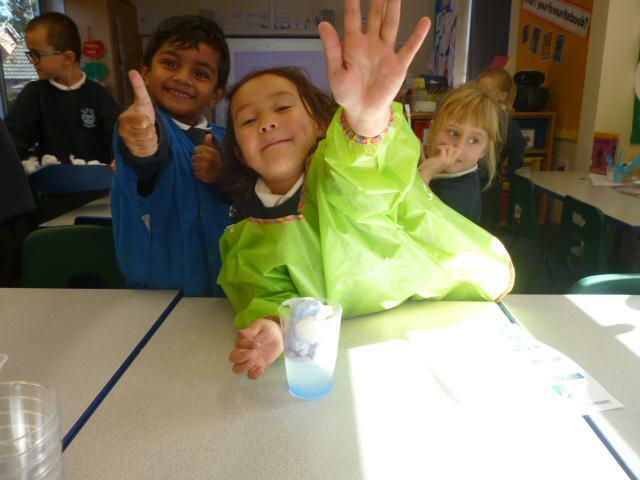 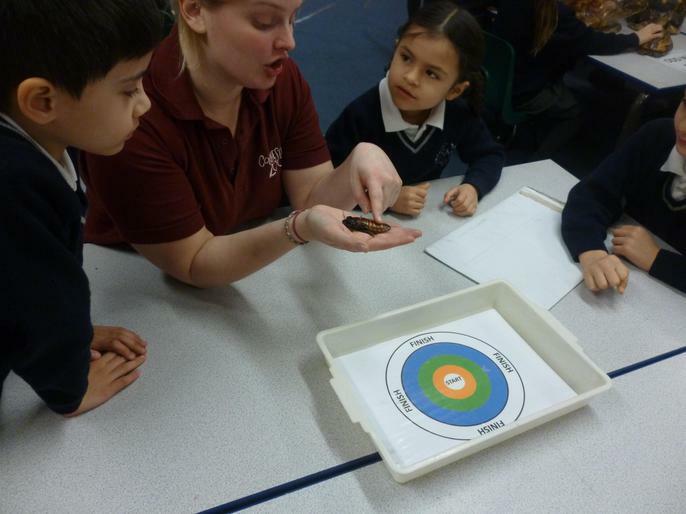 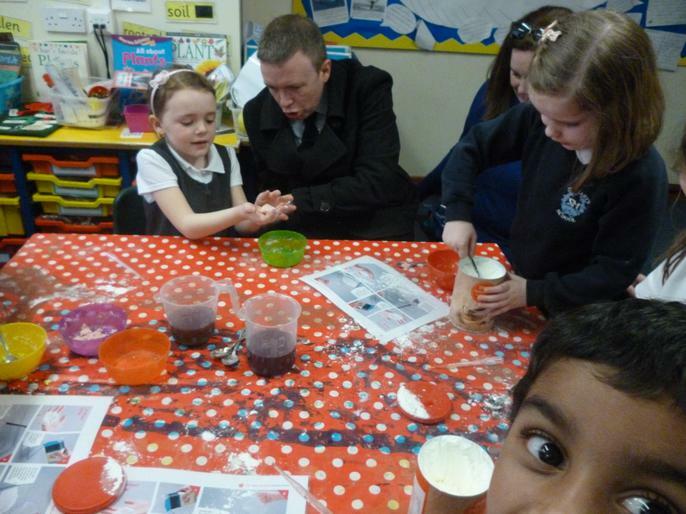 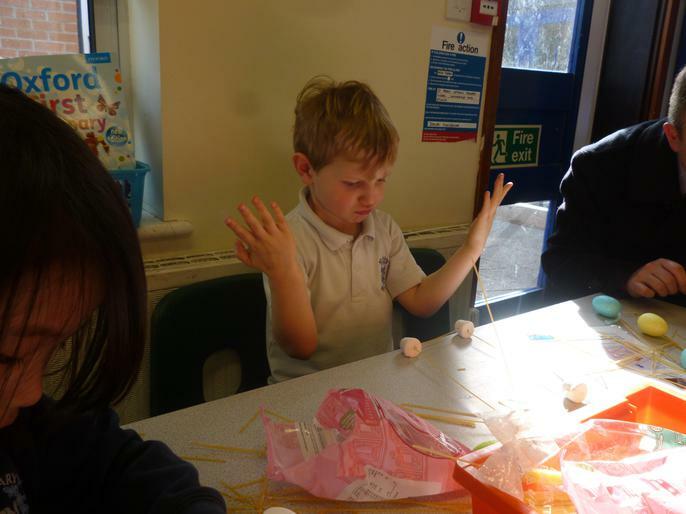 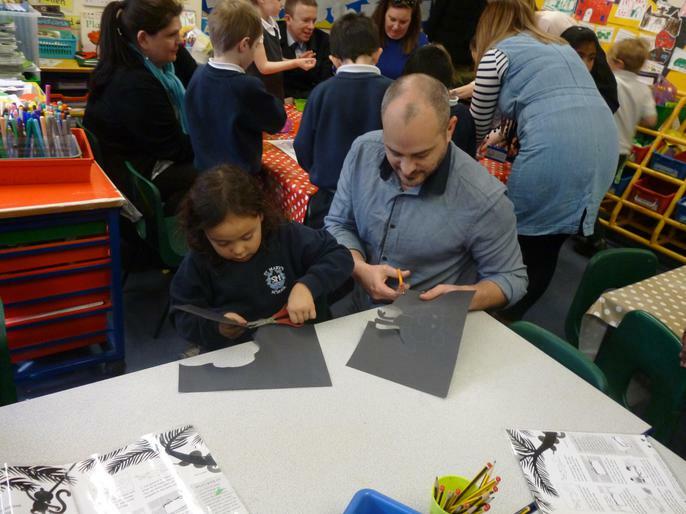 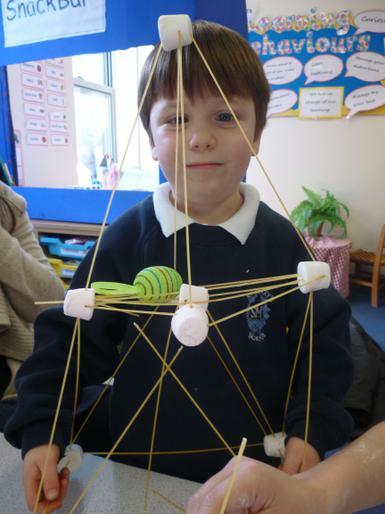 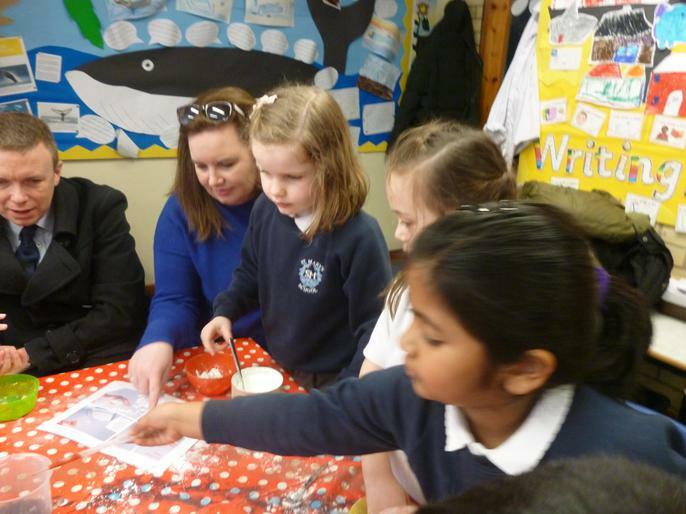 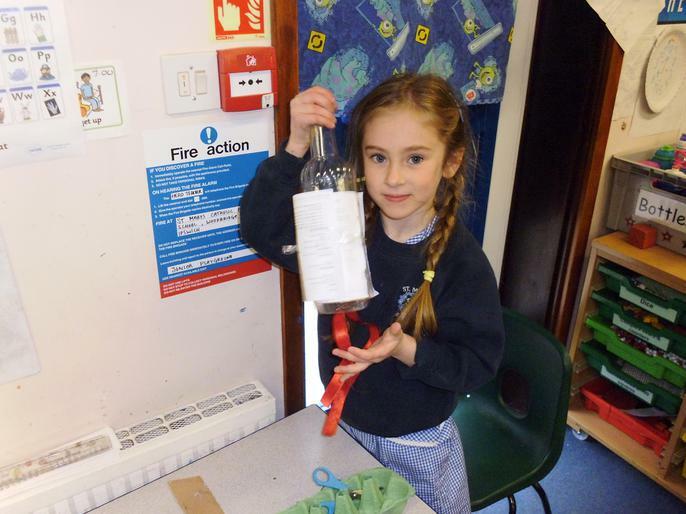 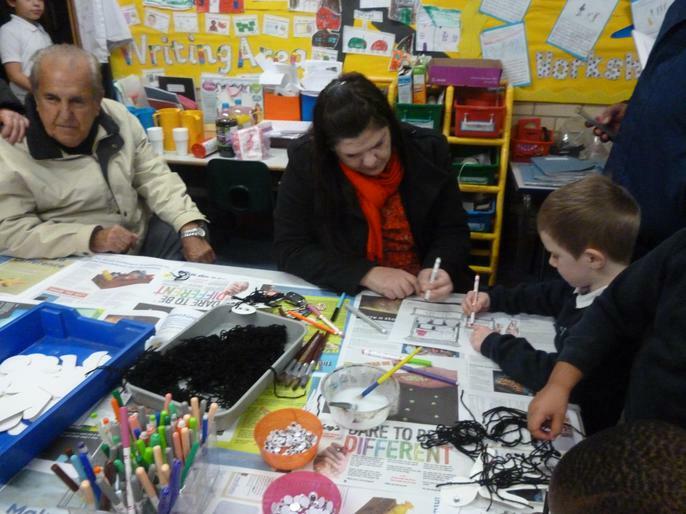 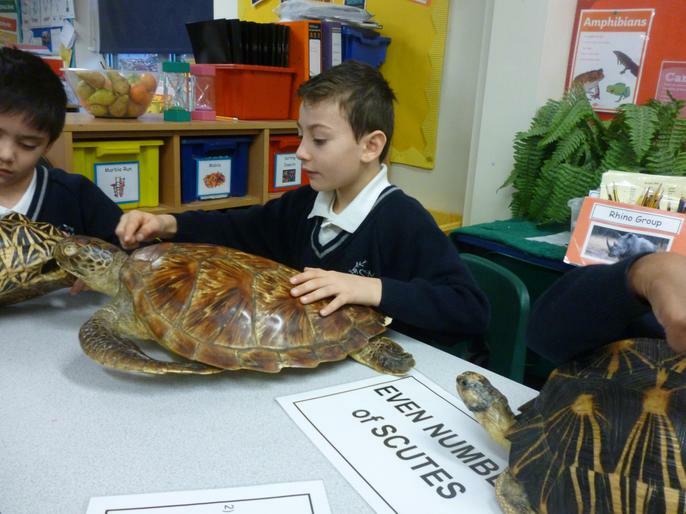 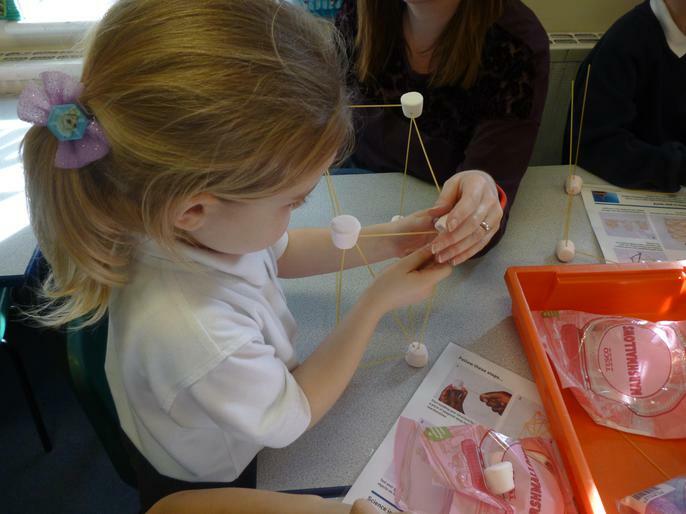 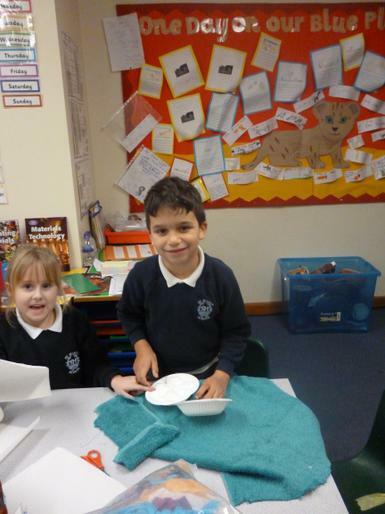 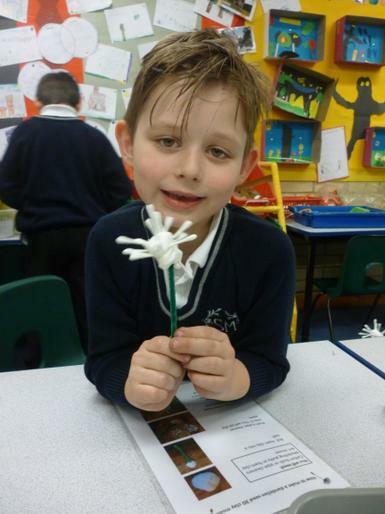 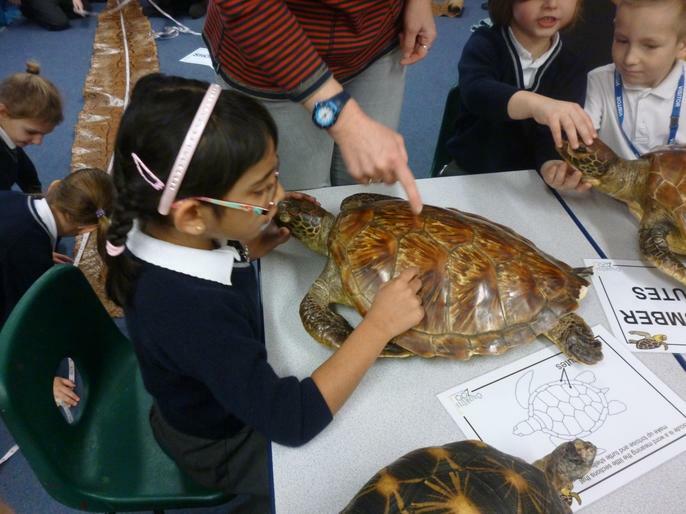 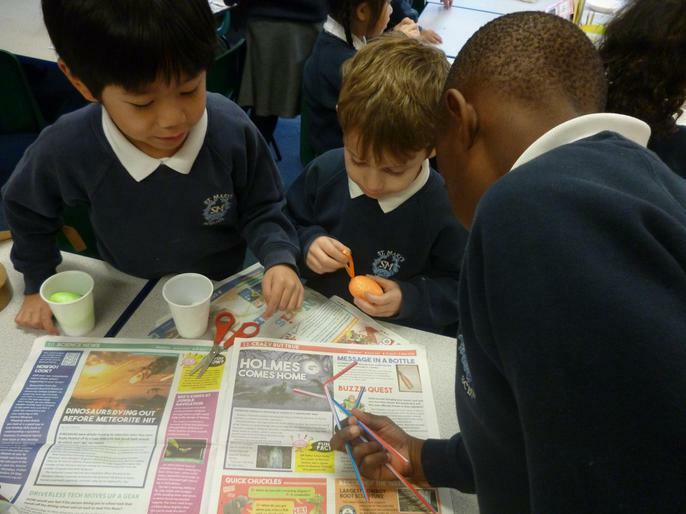 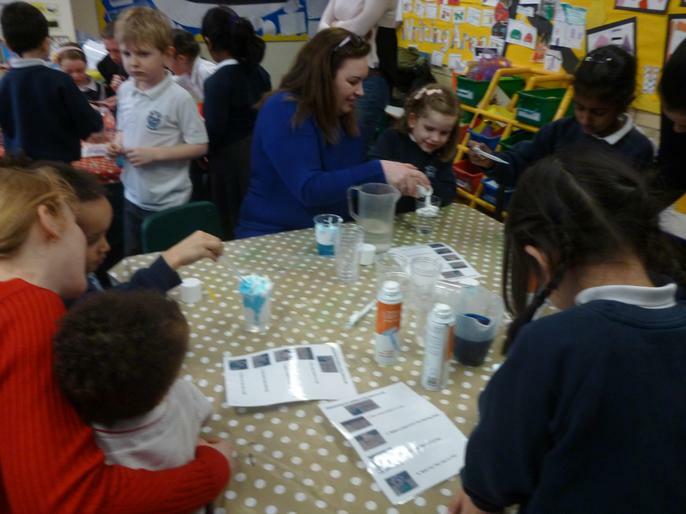 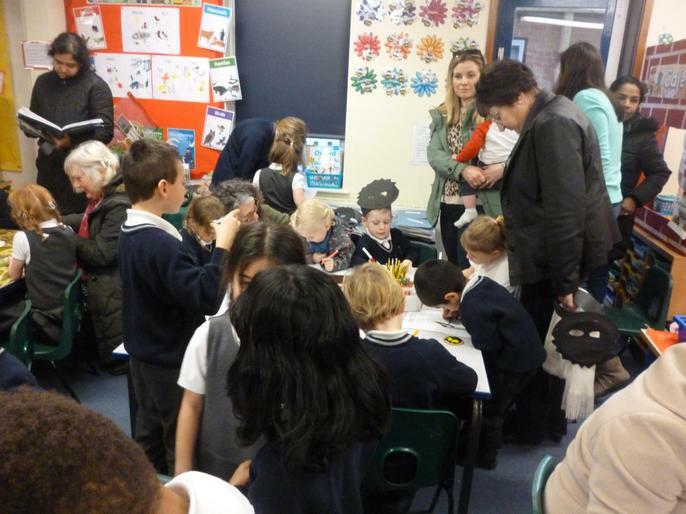 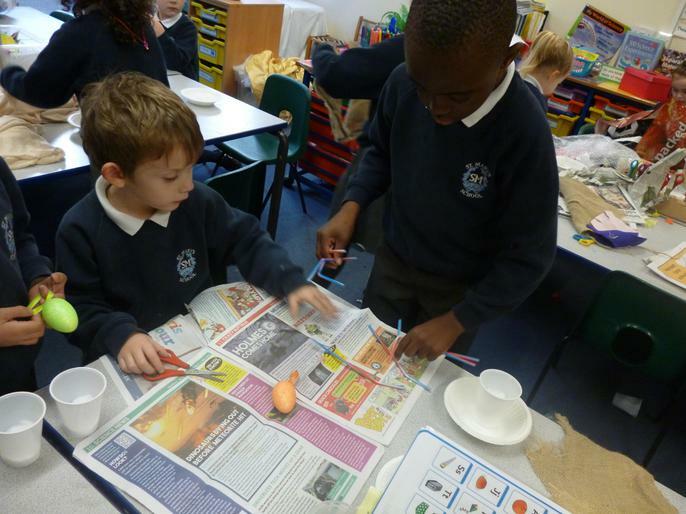 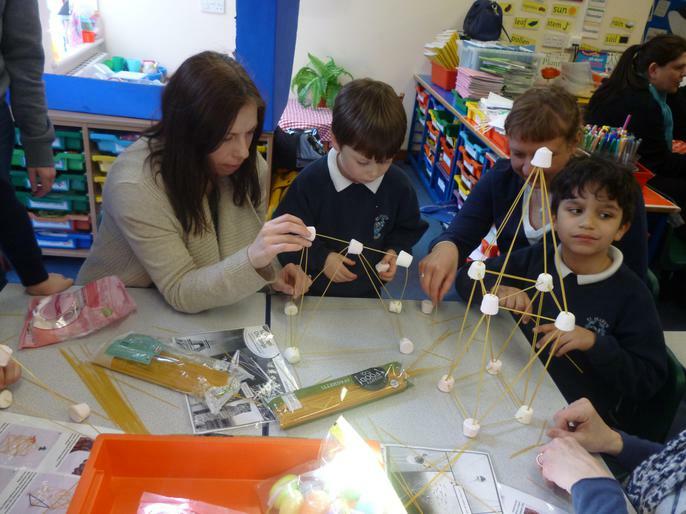 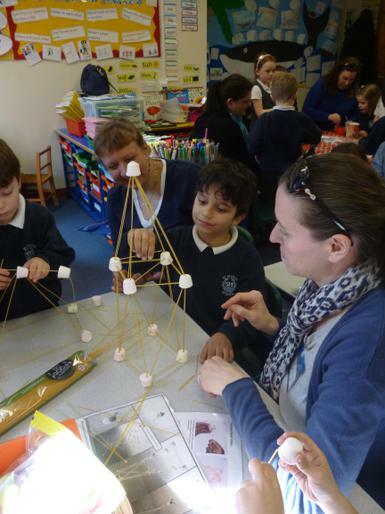 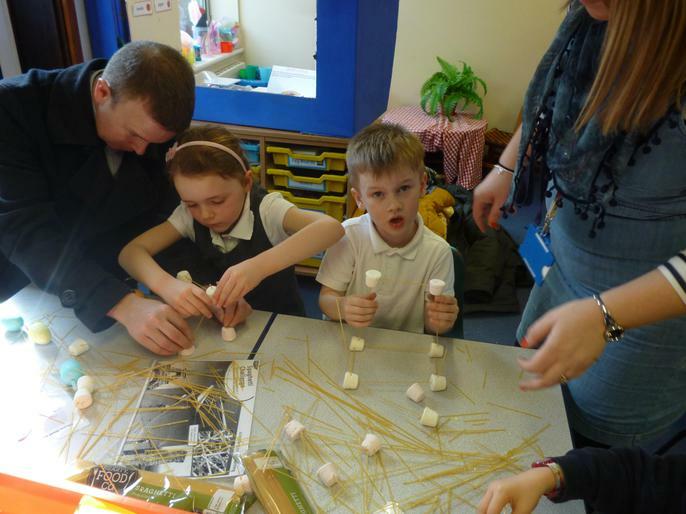 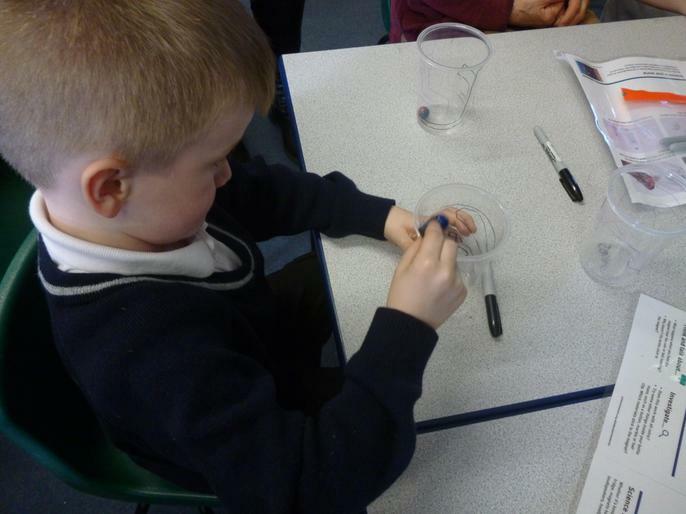 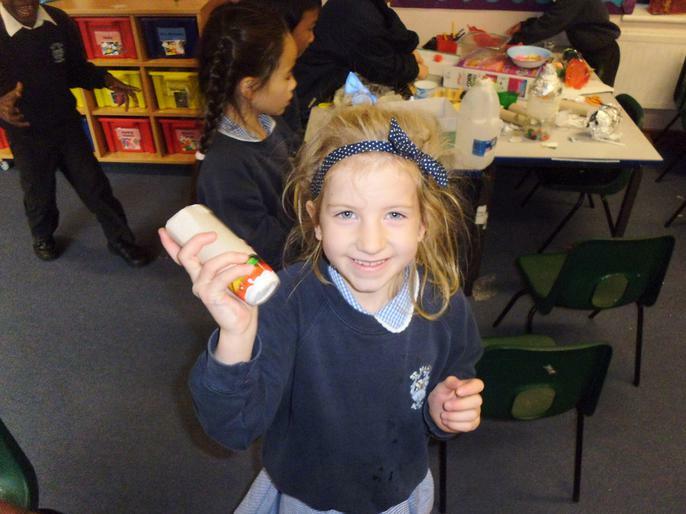 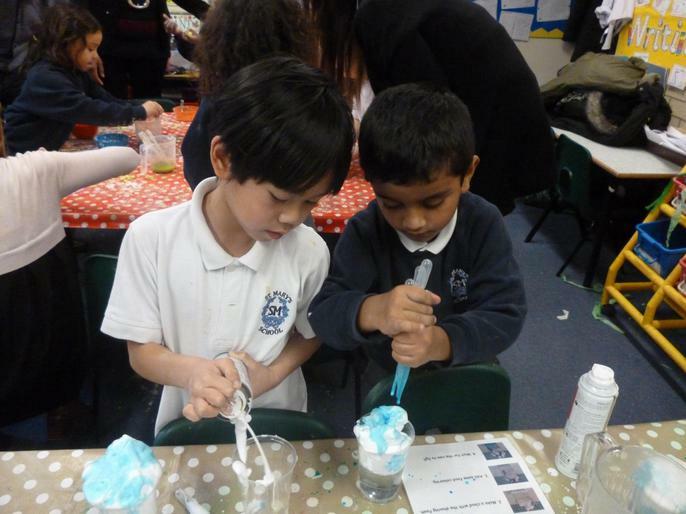 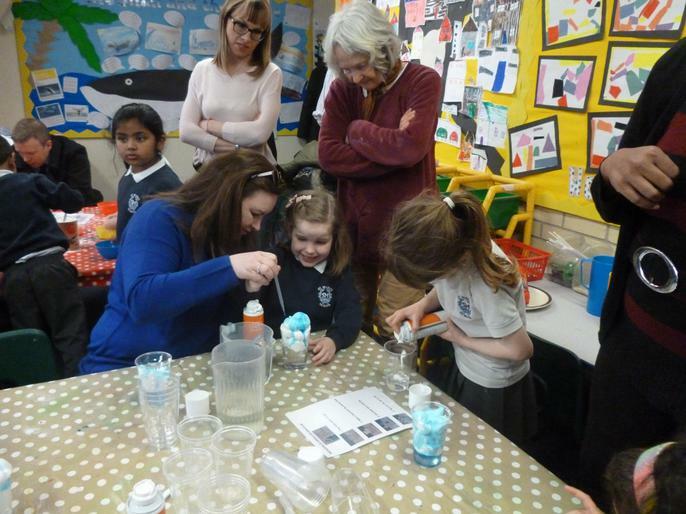 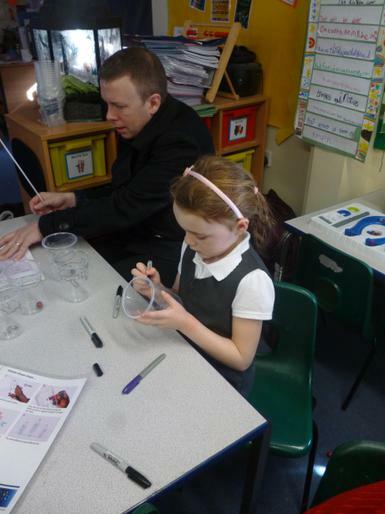 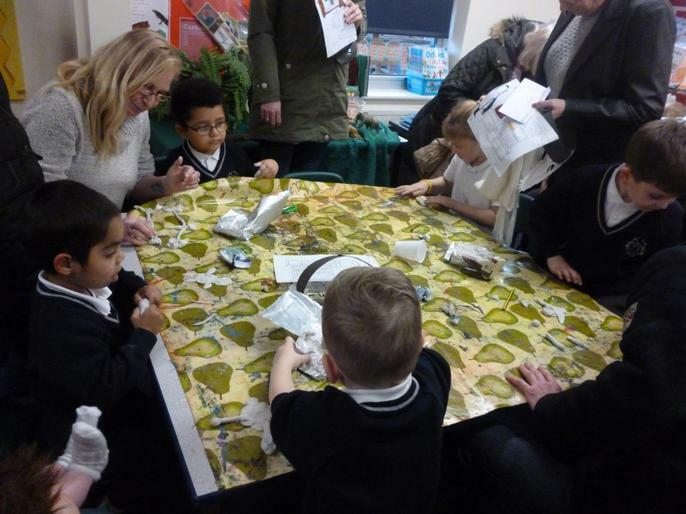 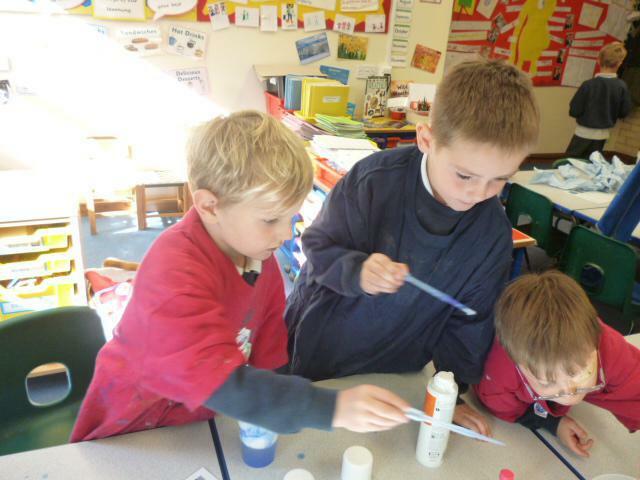 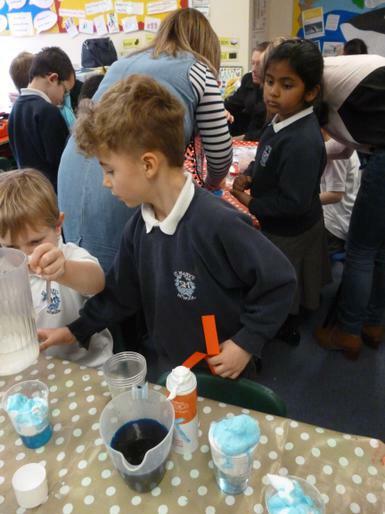 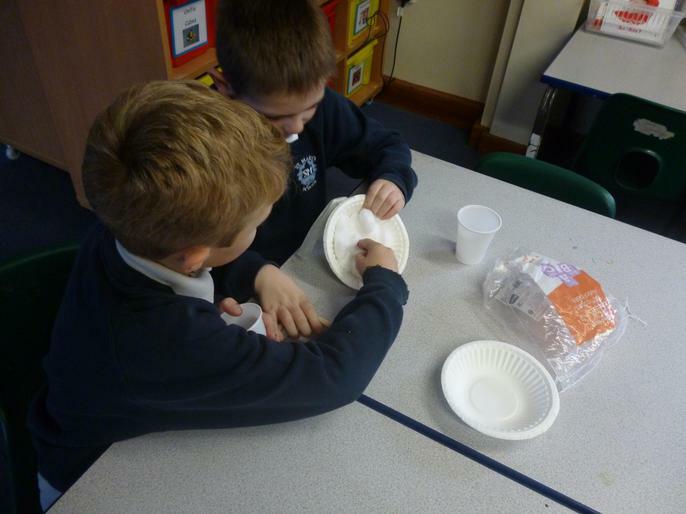 Science Afternoon - We had fun doing different science investigations with our grown up. 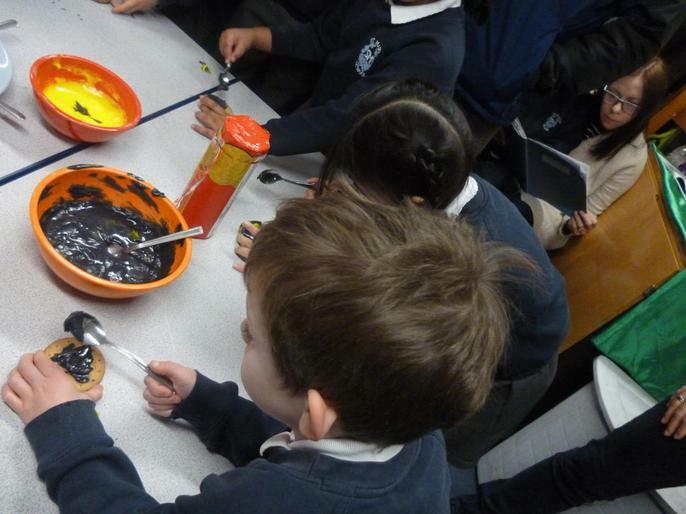 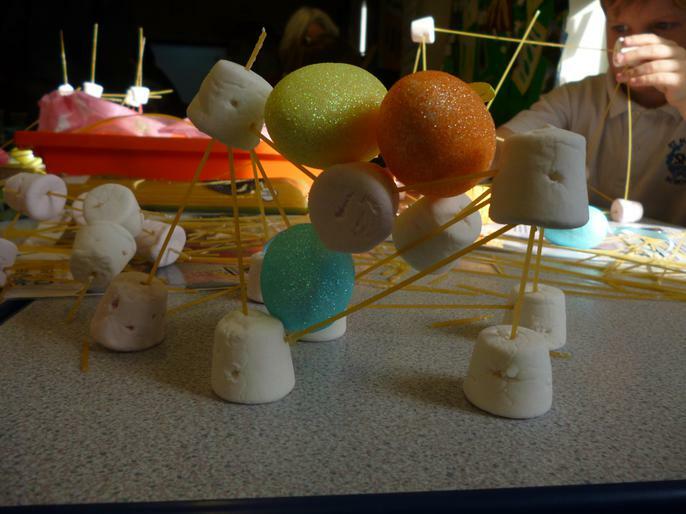 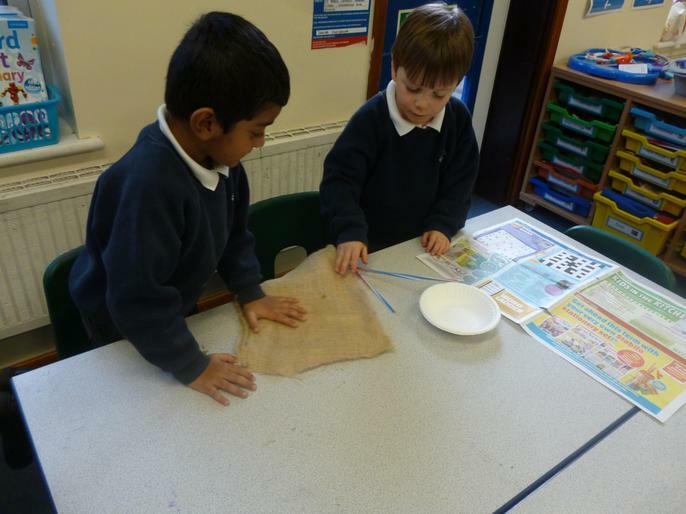 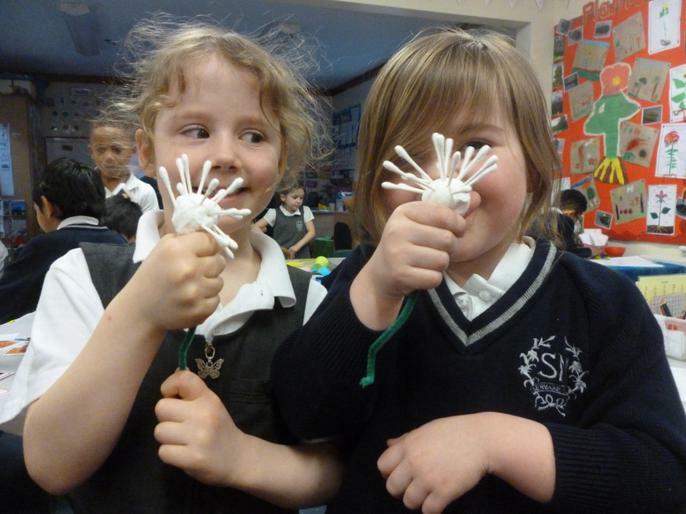 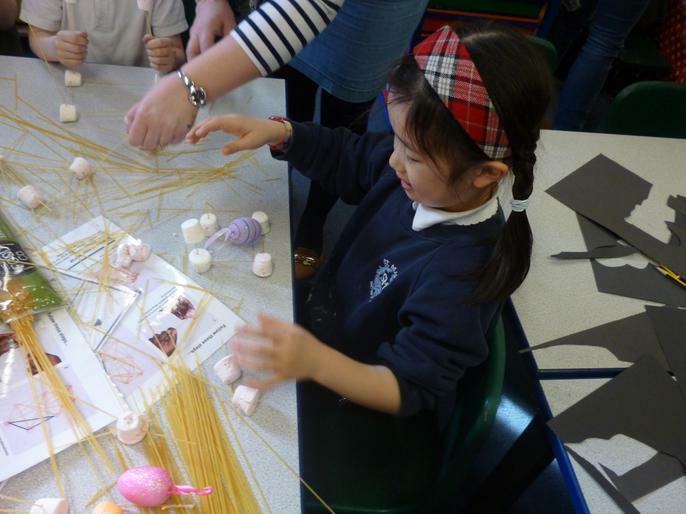 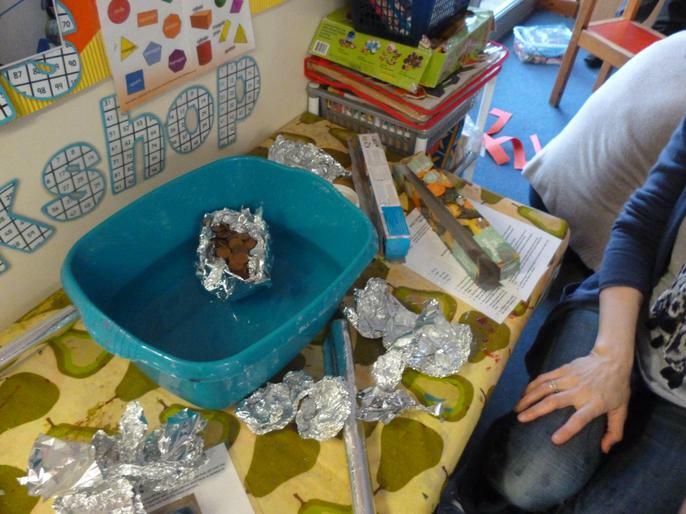 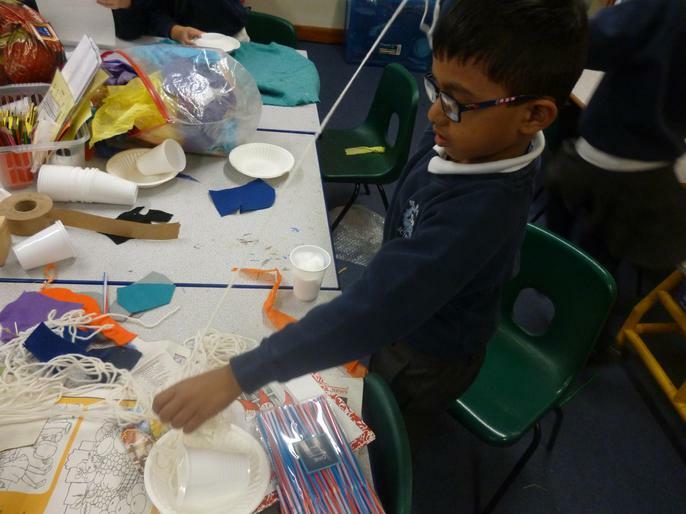 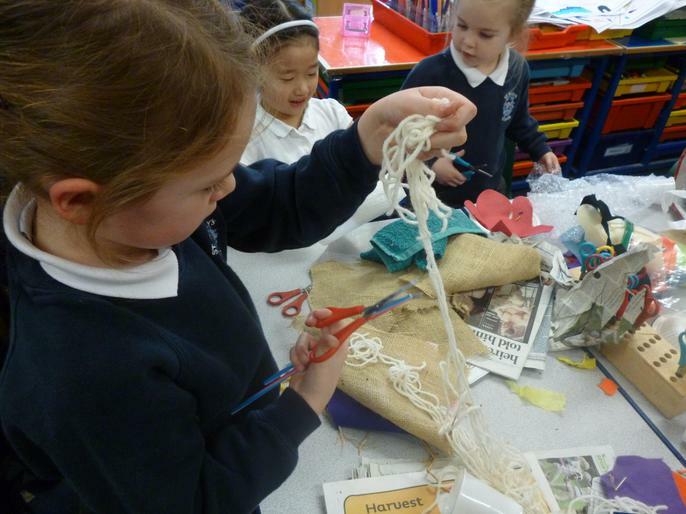 We made slime, spaghetti and marshmallow constructions, shadow puppets, tine foil boats and magnetic mazes. 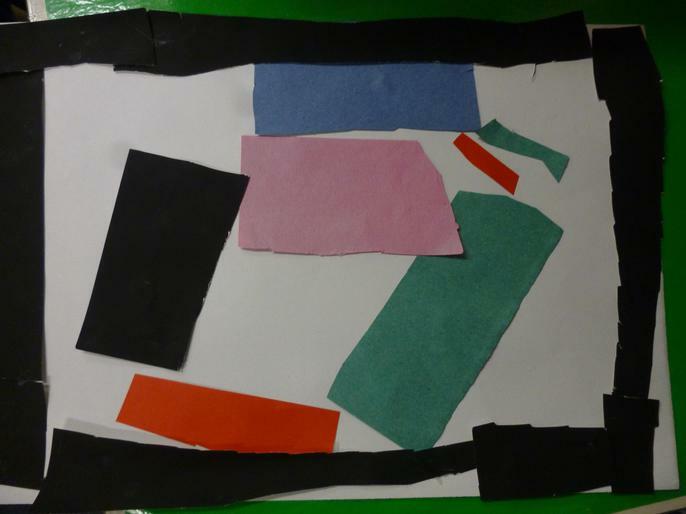 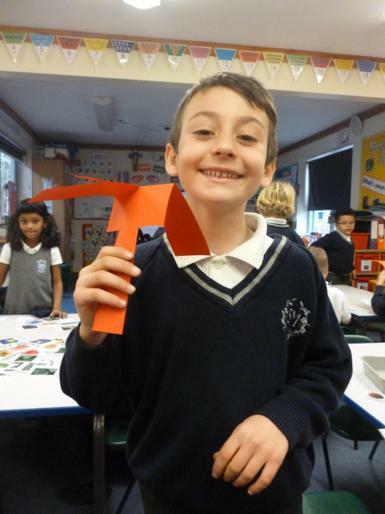 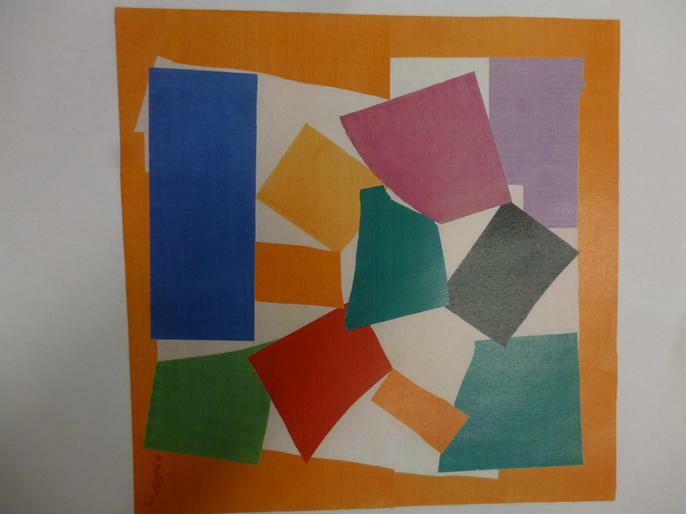 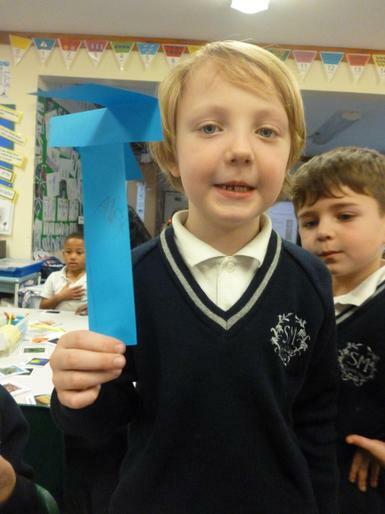 Matisse 'The Snail' - This afternoon we found out about the french artist Henri Matisse. 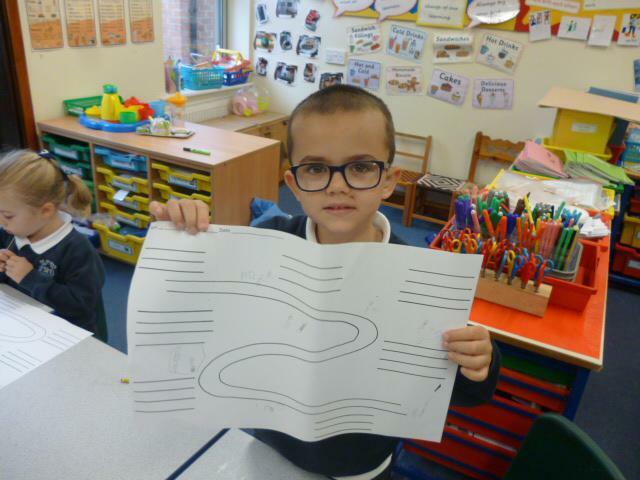 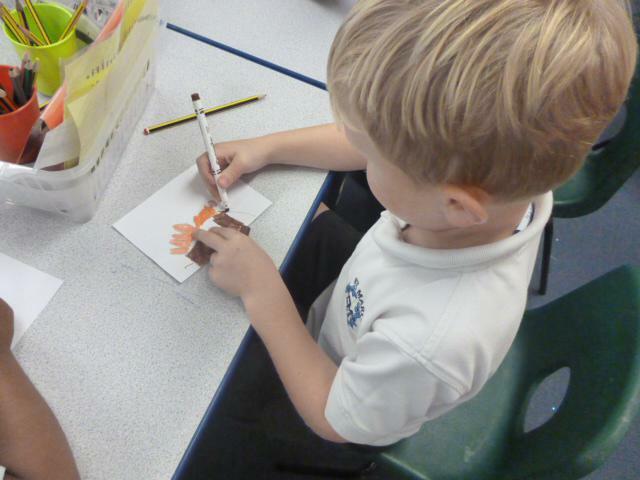 We looked at his picture called 'The Snail'. 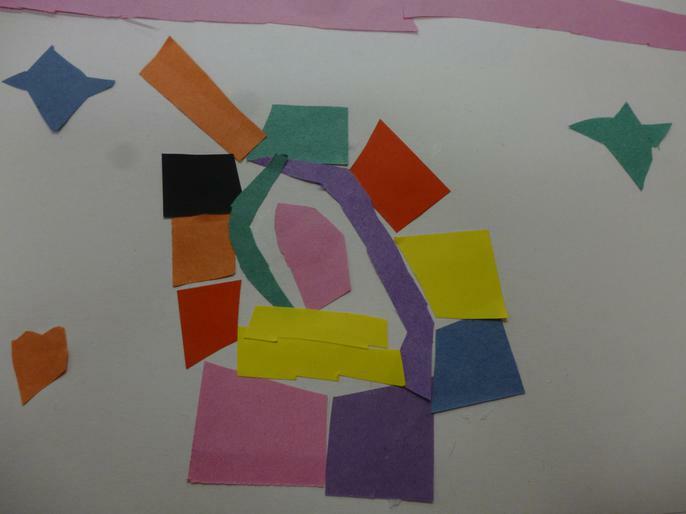 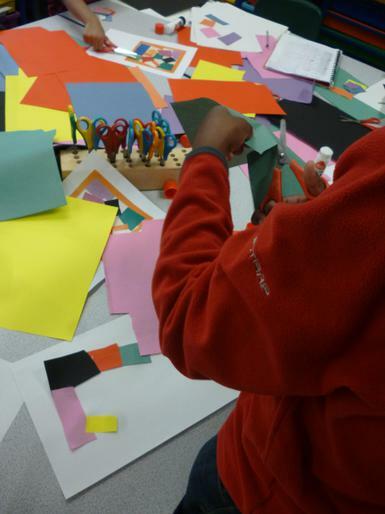 It is made up of cut out pieces of coloured paper. 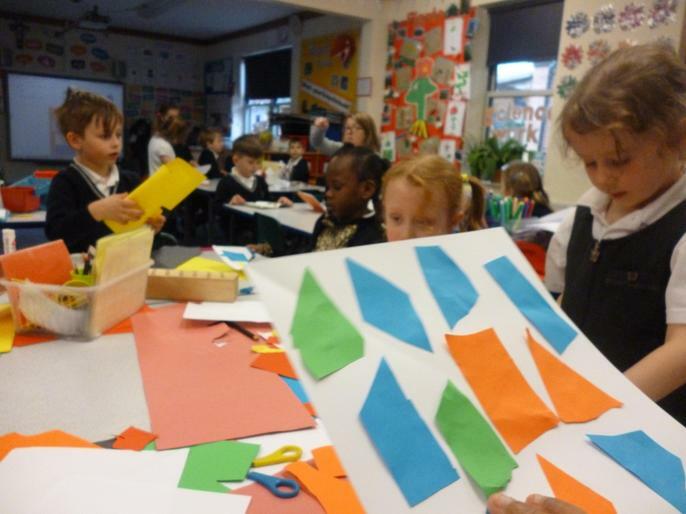 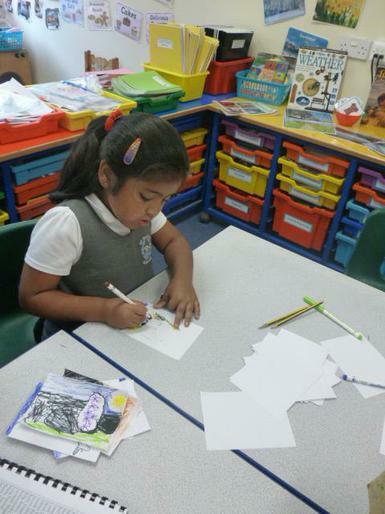 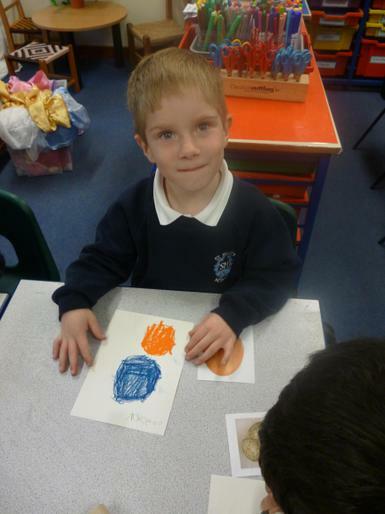 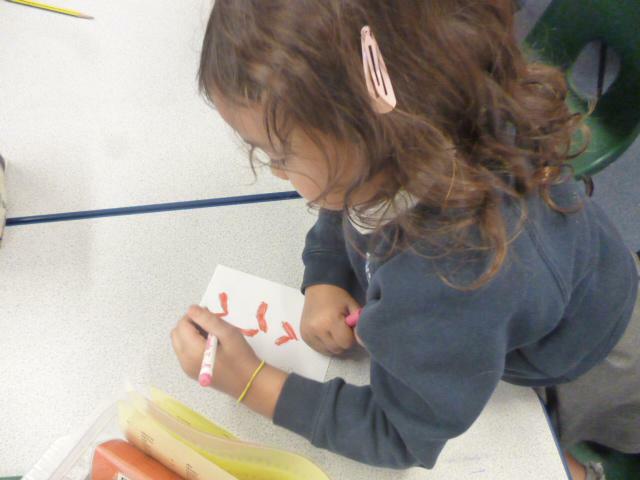 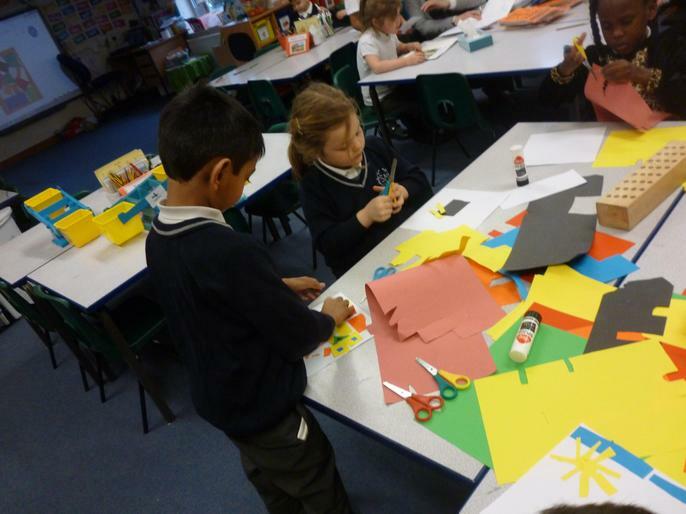 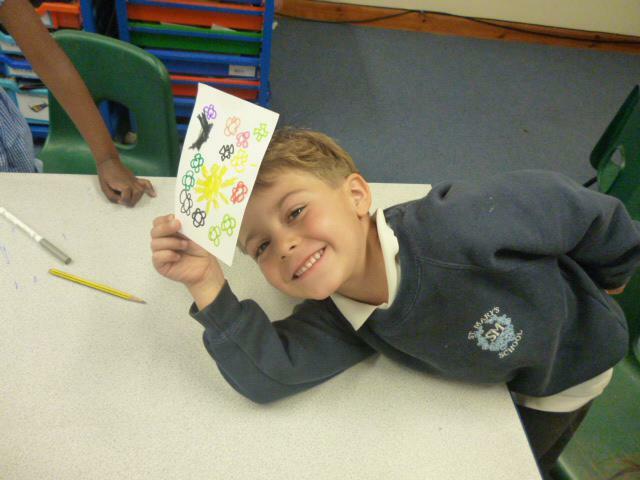 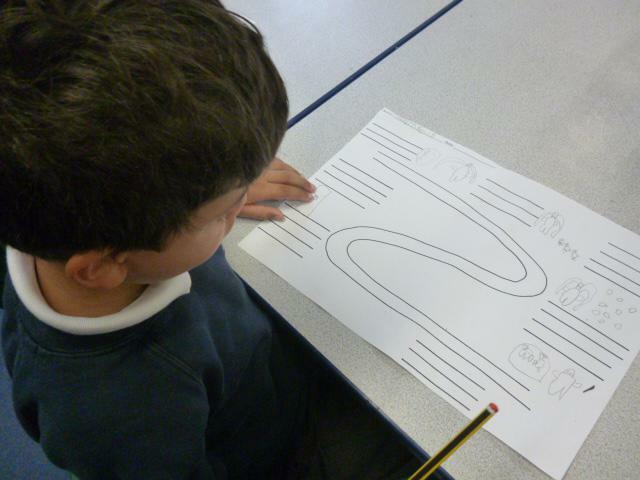 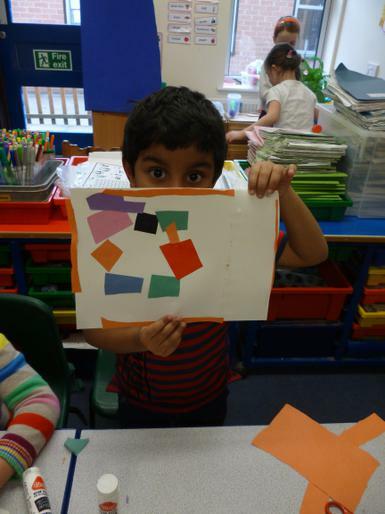 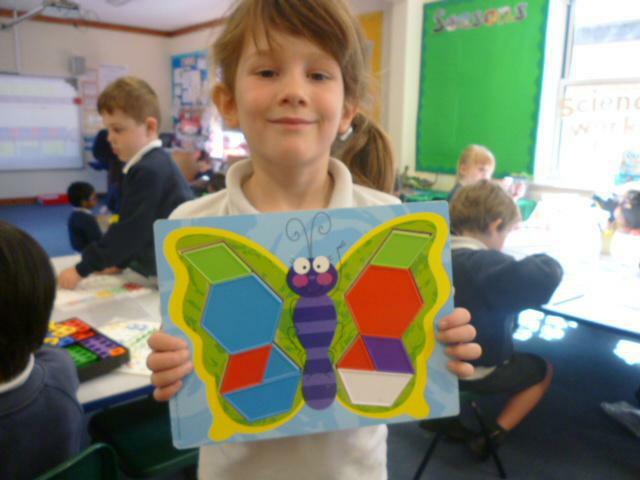 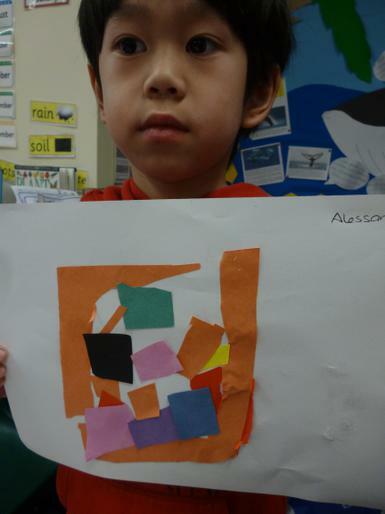 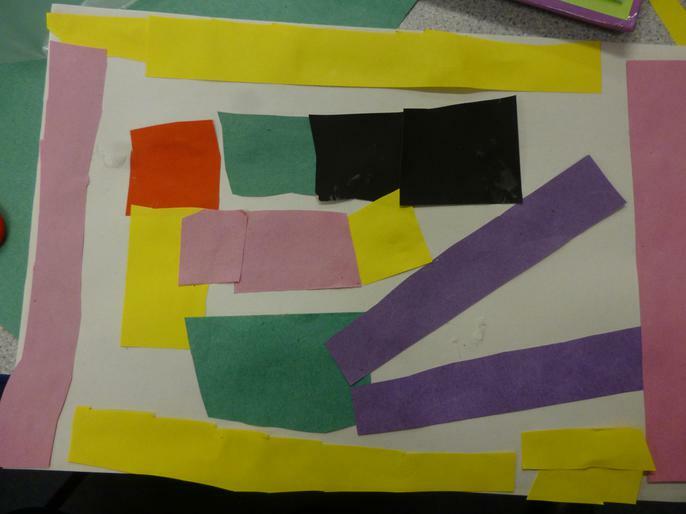 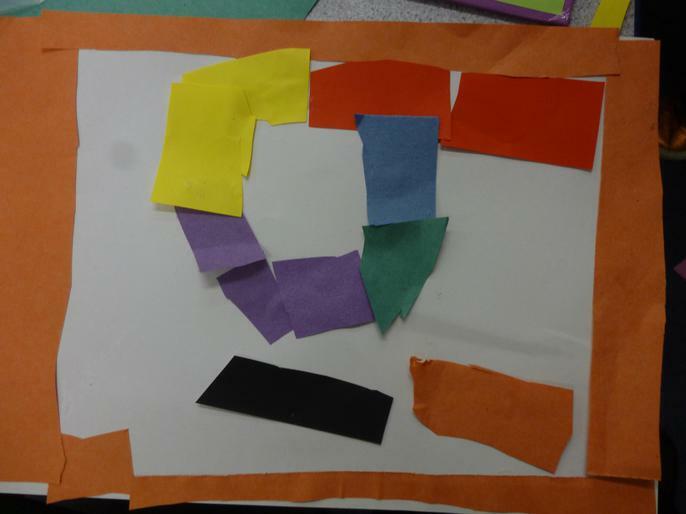 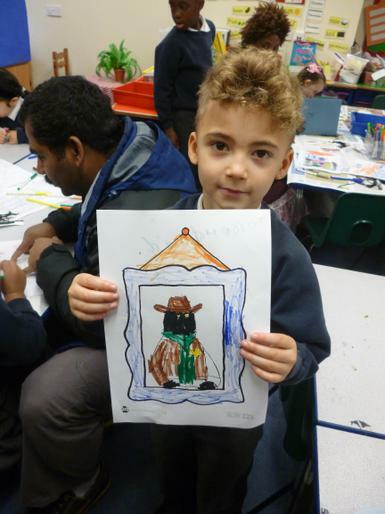 We created our own 'Snail'pictures in the style of Matisse. 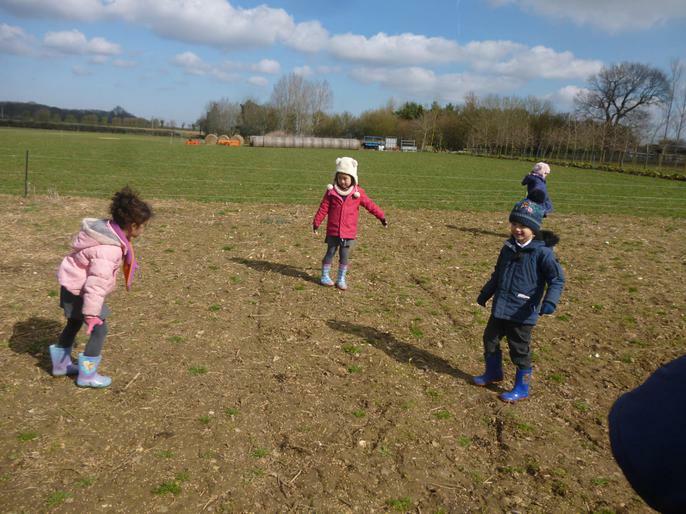 Local Walk - This afternoon we went on a walk around the local area. 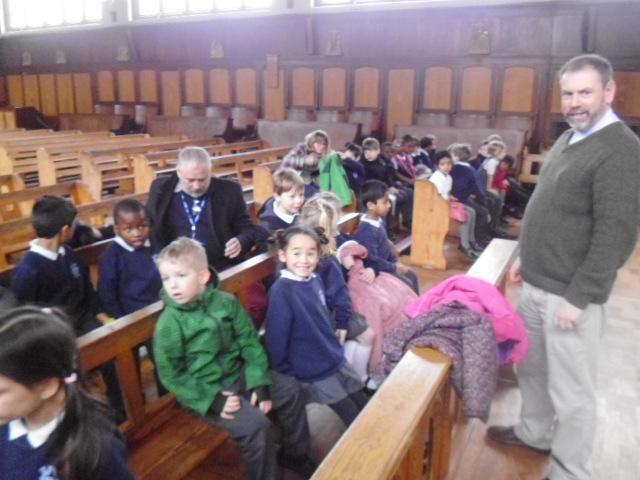 We saw houses, 3 cats, the church, a shop and lots of trees. 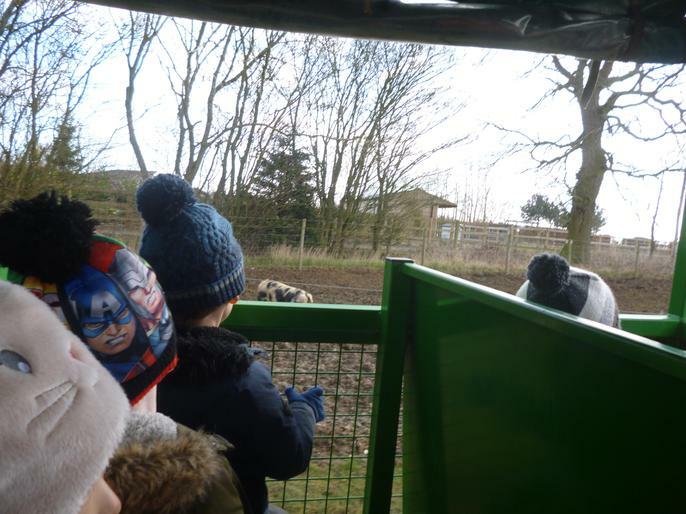 Tractor Visit - Today a farmer brought his tractor for us to look at. 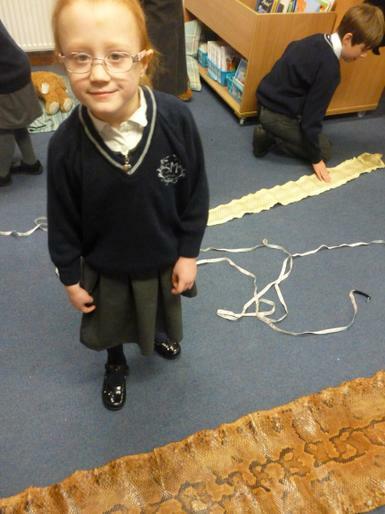 It was very big! 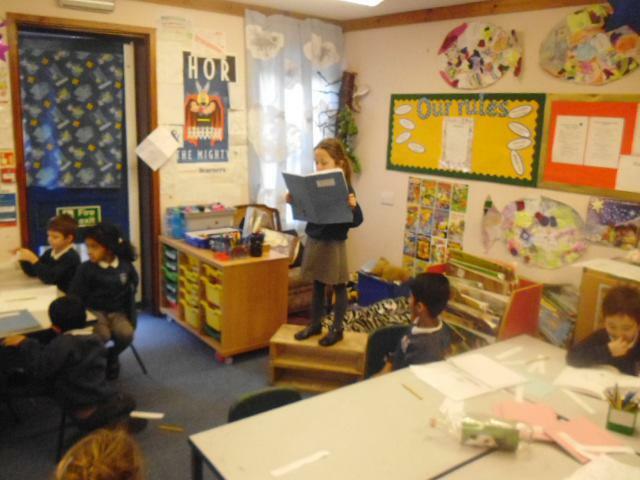 Class Work share - Today we had our class work share on 'The Lonely Beast'. 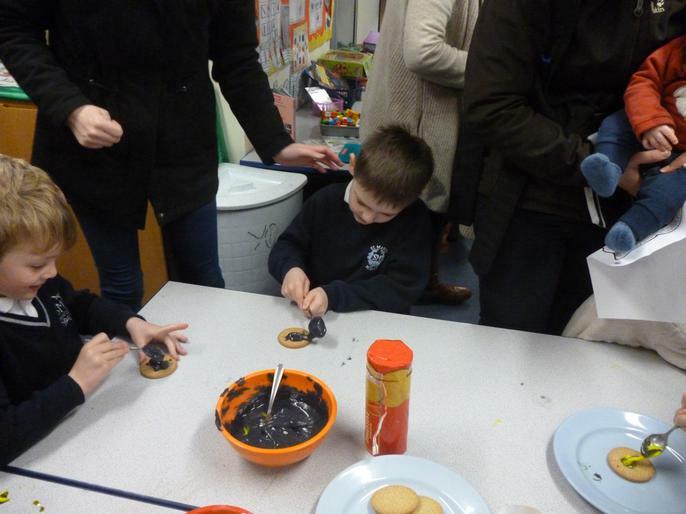 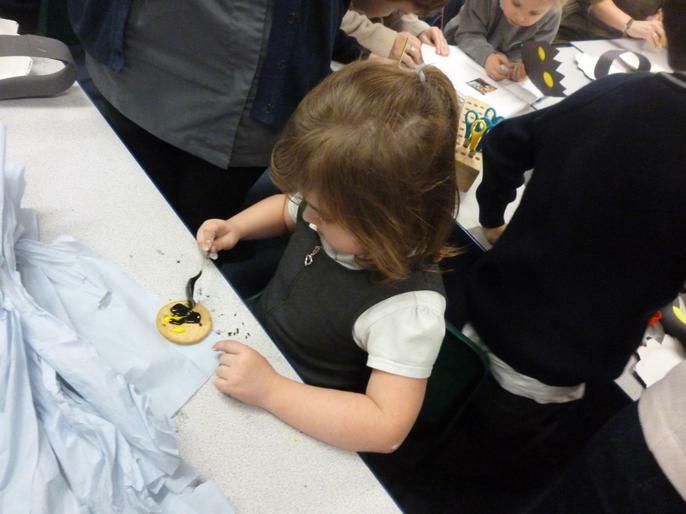 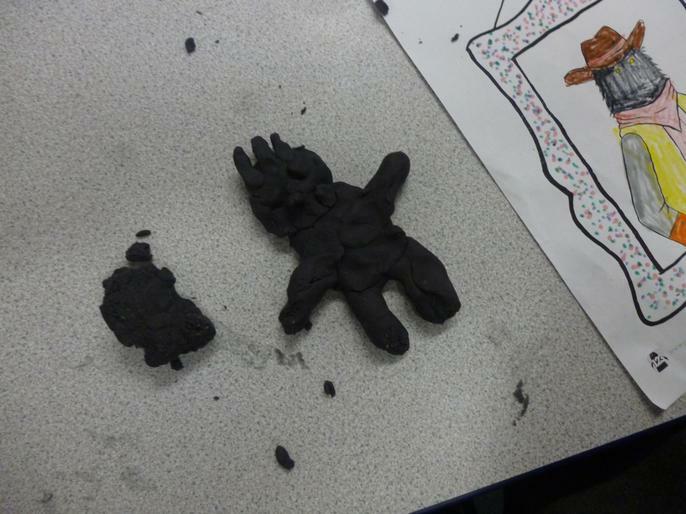 We performed a play, made play dough beasts, decorated biscuits and made puppets. 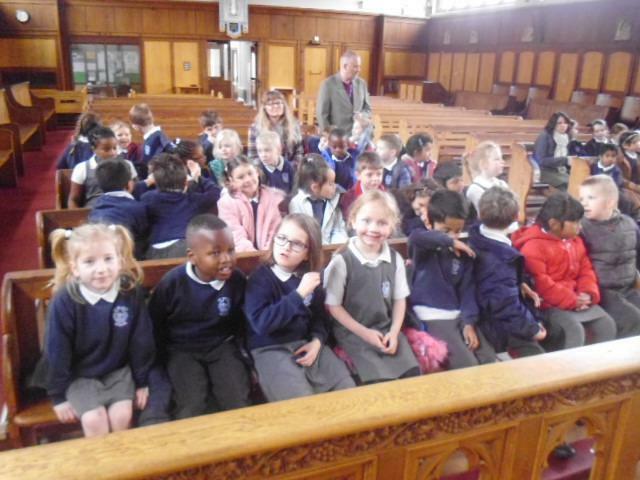 We had great fun! 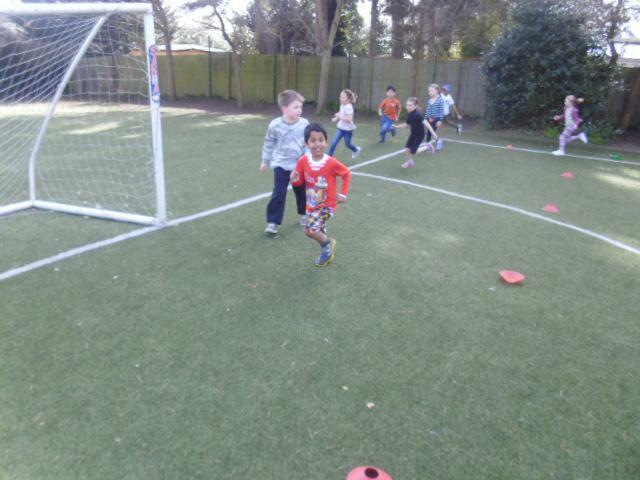 Fitness Day! 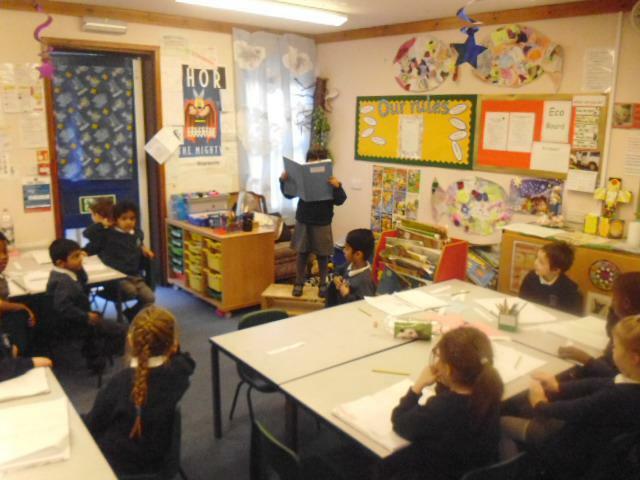 - Today we had the sprinted Tyrone come in to talk to us about his life as a sprinter. 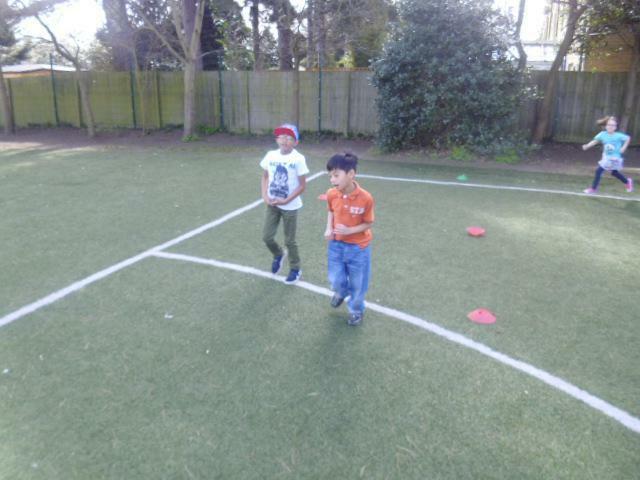 He also showed us how to improve our own fitness. 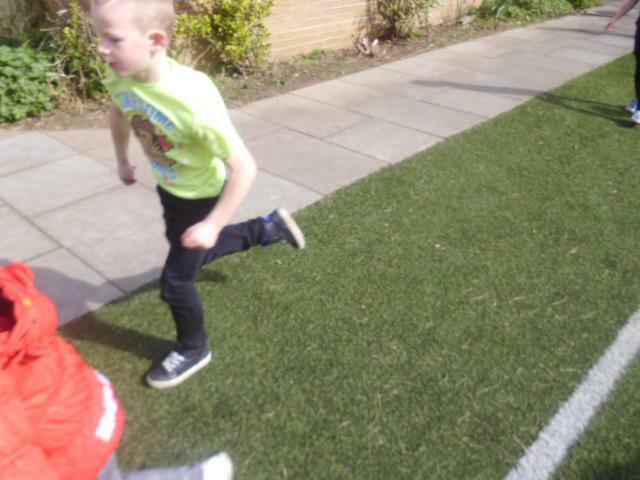 He was very fast! 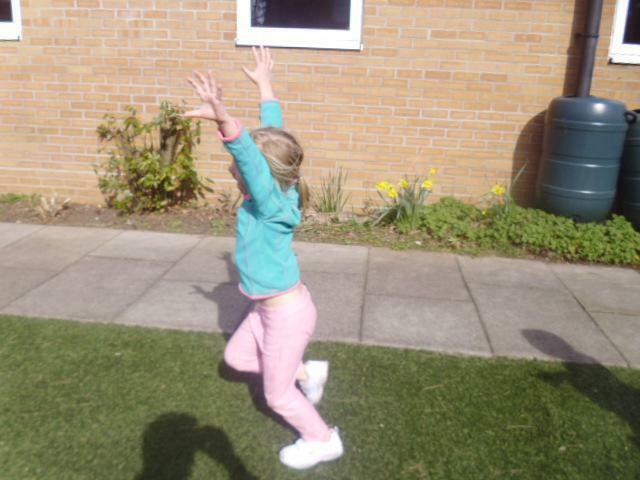 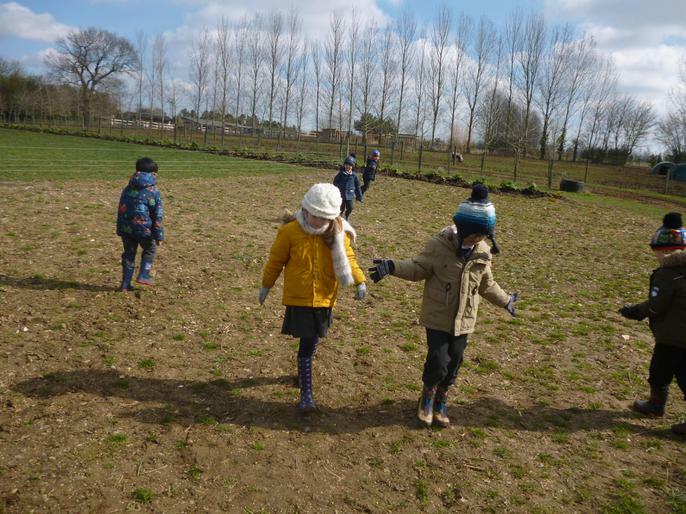 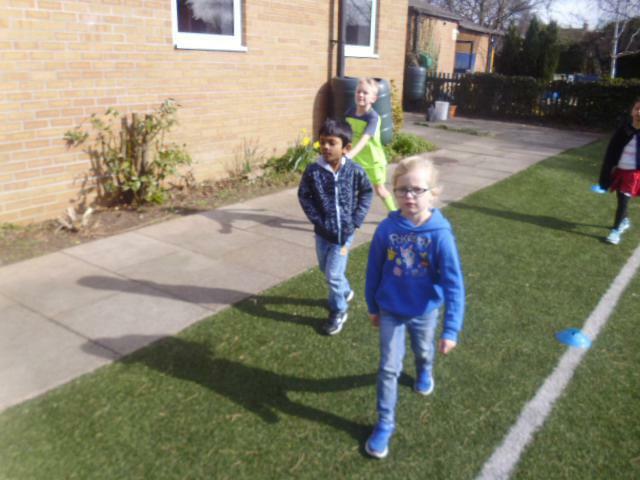 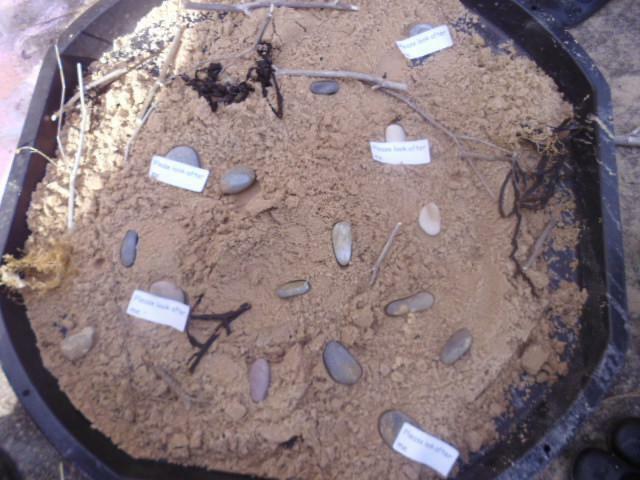 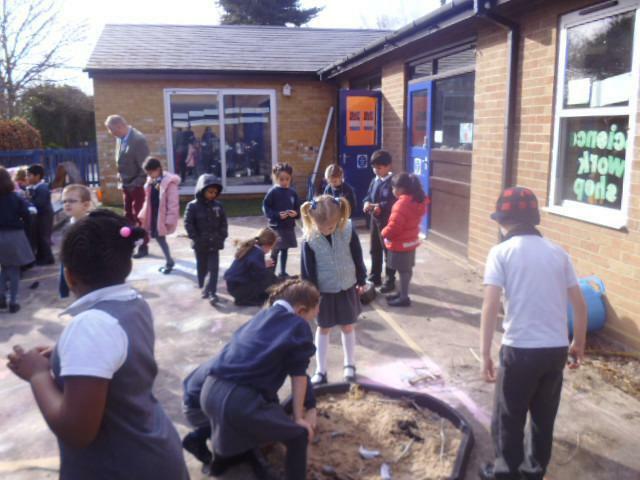 Plants - Today we went outside to look for different plants. 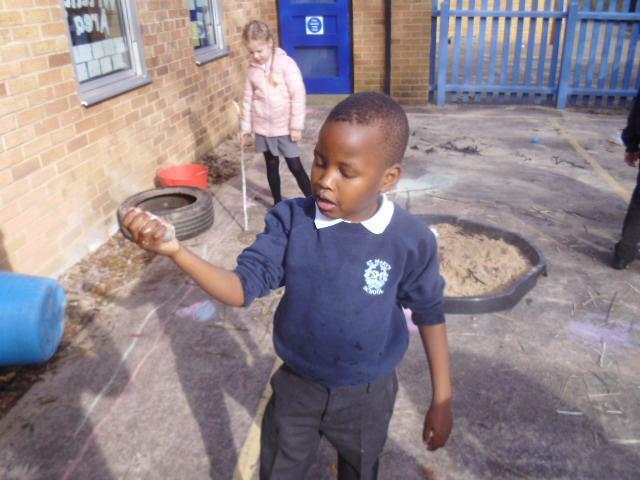 We found lots in the Willow Garden and then we drew them and described their colour and shape. 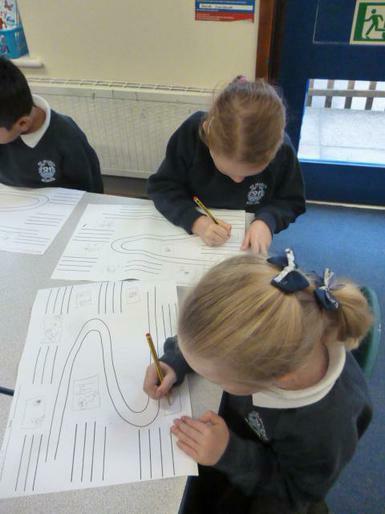 Using the Chrome Books - Today we used the Chrome books. 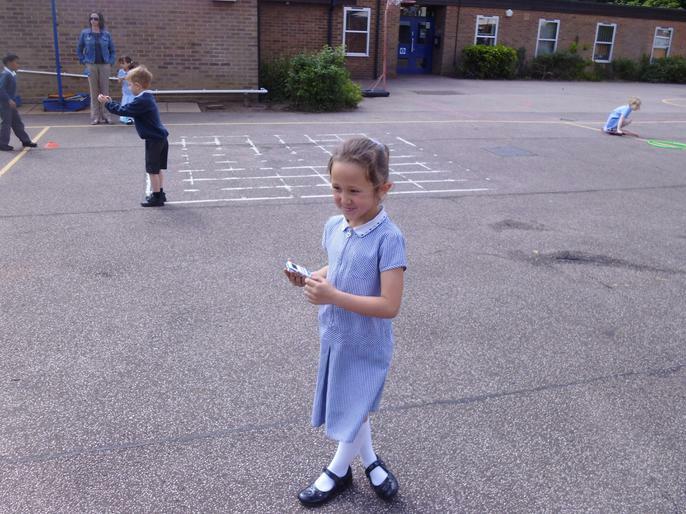 We are getting better at logging on and we played some great maths games. 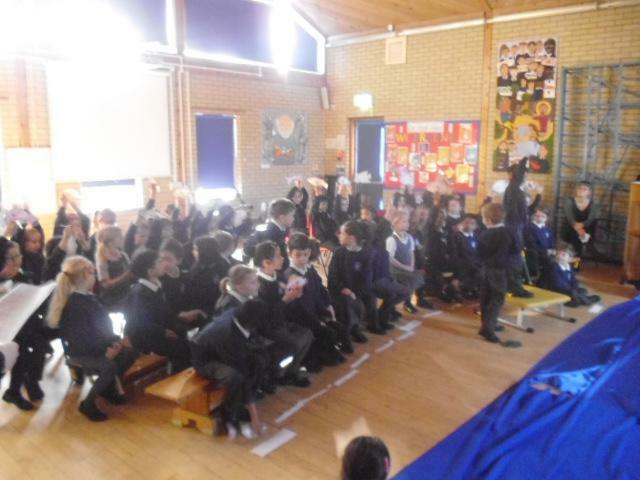 A fantastic play! 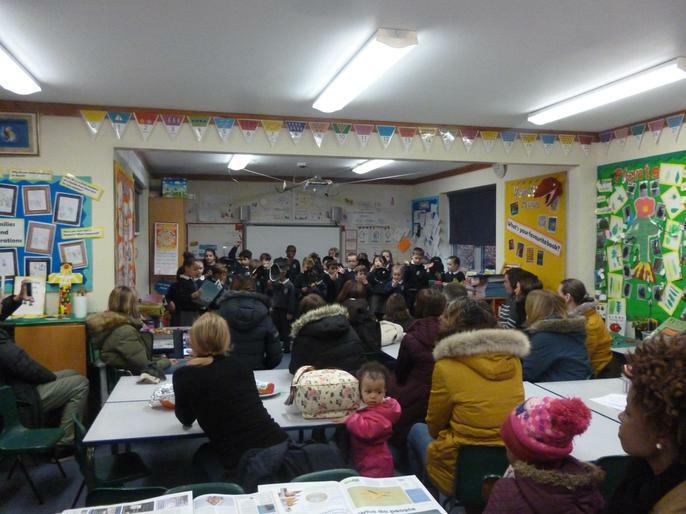 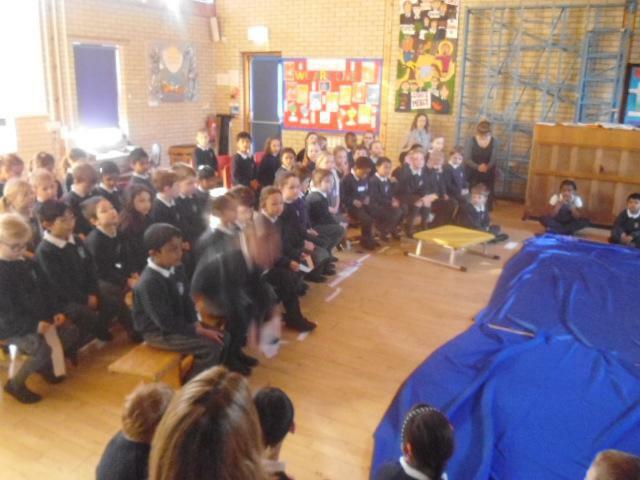 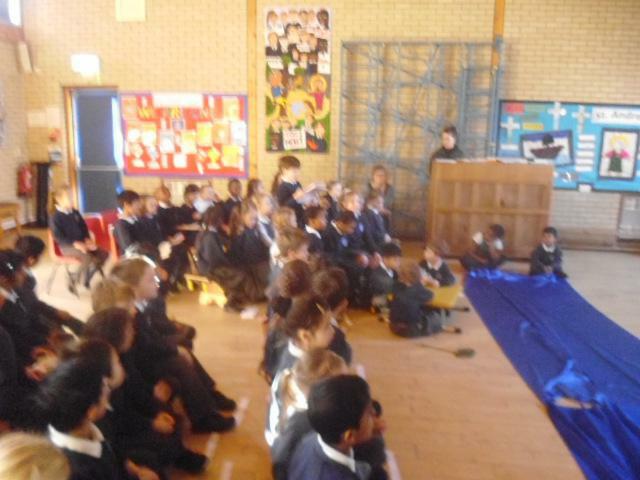 - Well done to all the children who took part in the Nativity play this afternoon. 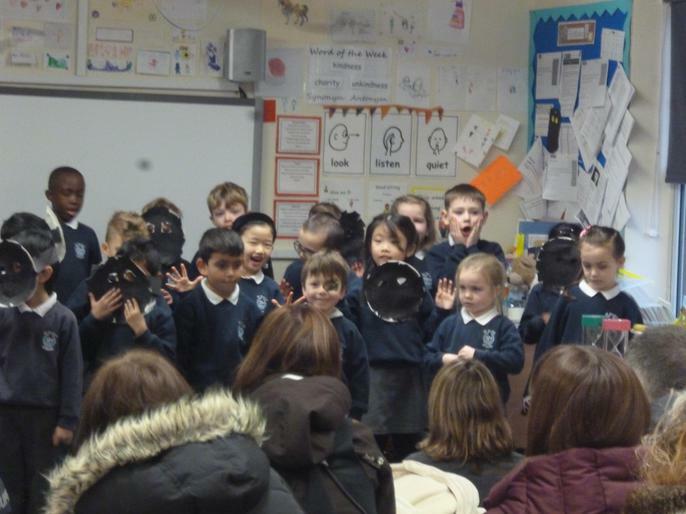 They all sang, acted, read and played their instruments beautifully. 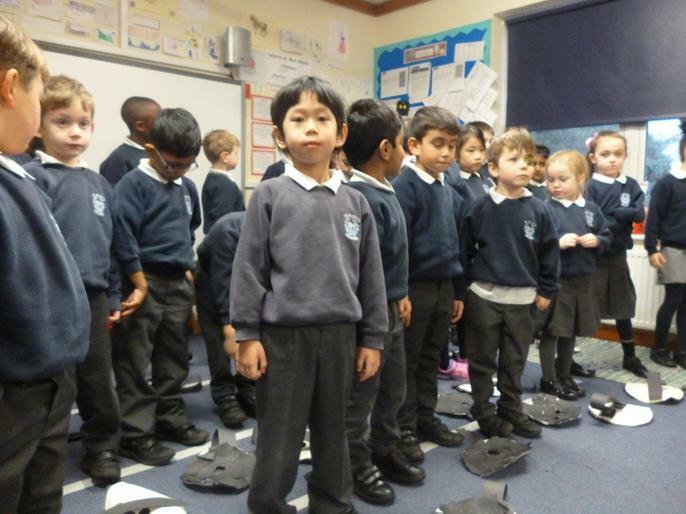 A great performance. 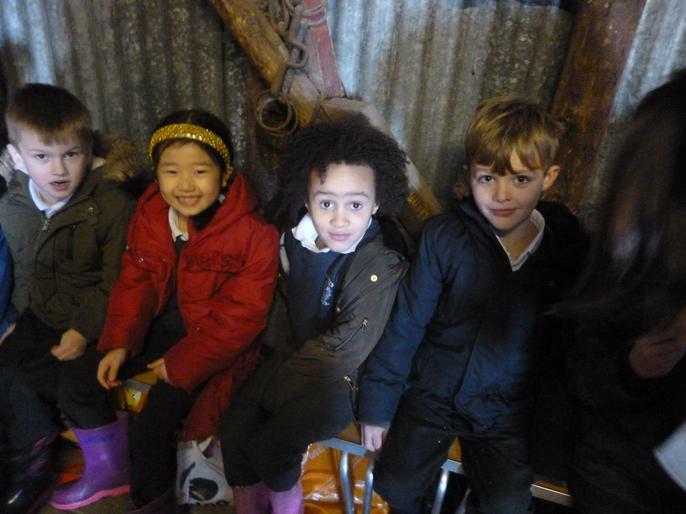 Fun at the Christmas Fair! 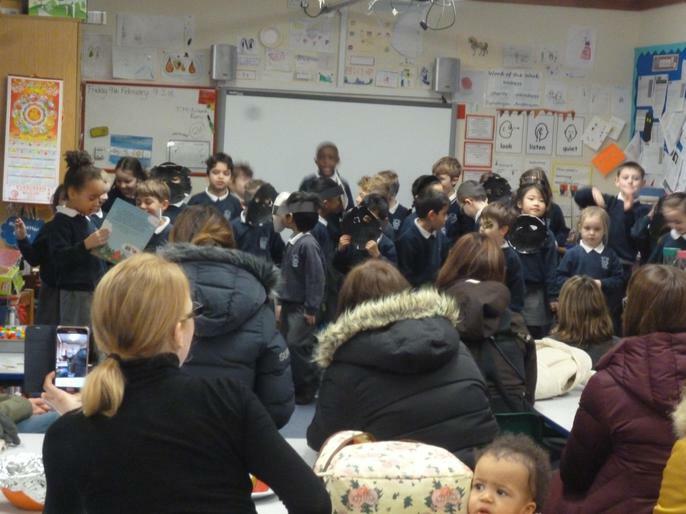 - This afternoon we went to the Christmas Fair. 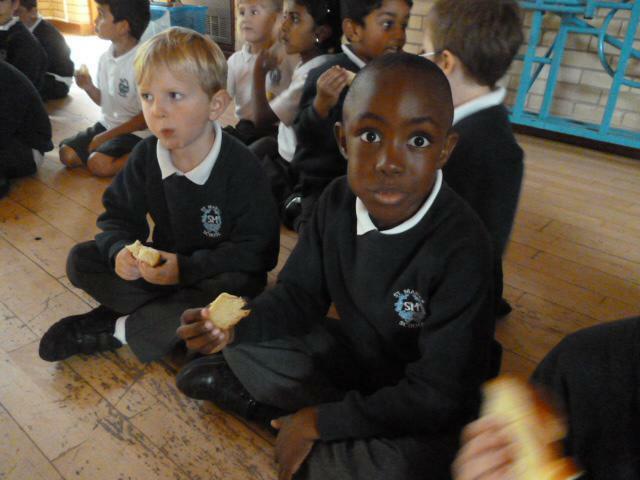 We had fun buying cakes, toys and books. 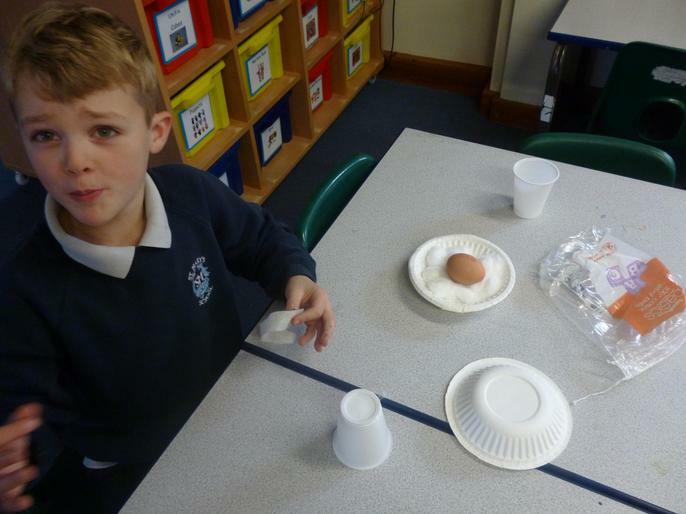 Egg Drop Experiment - Today in science we thought about the best materials to protect eggs. 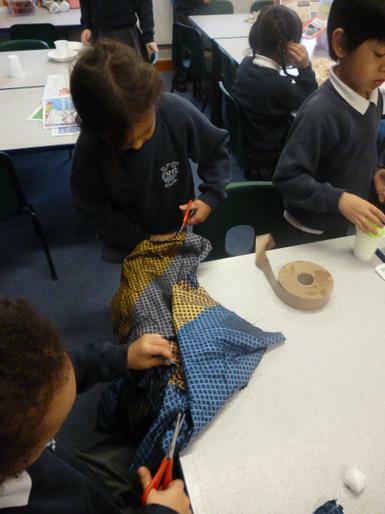 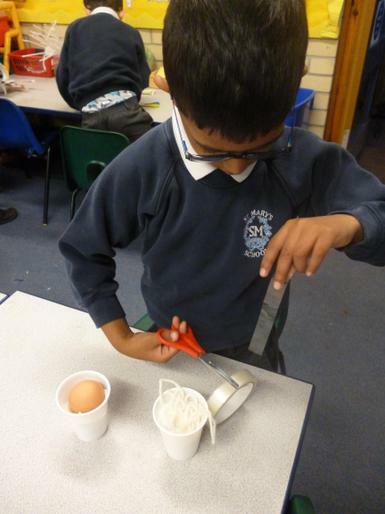 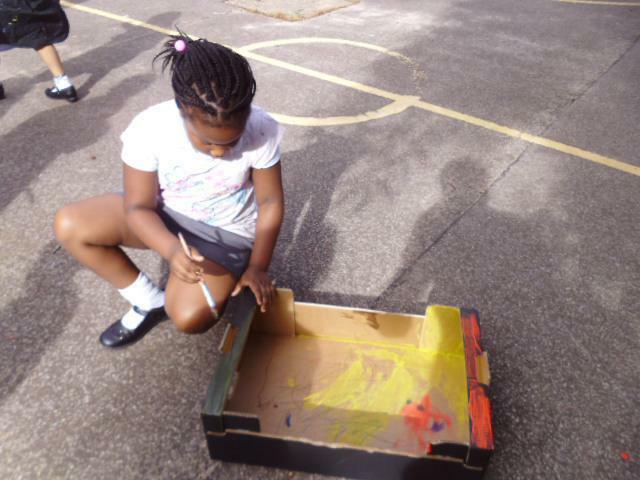 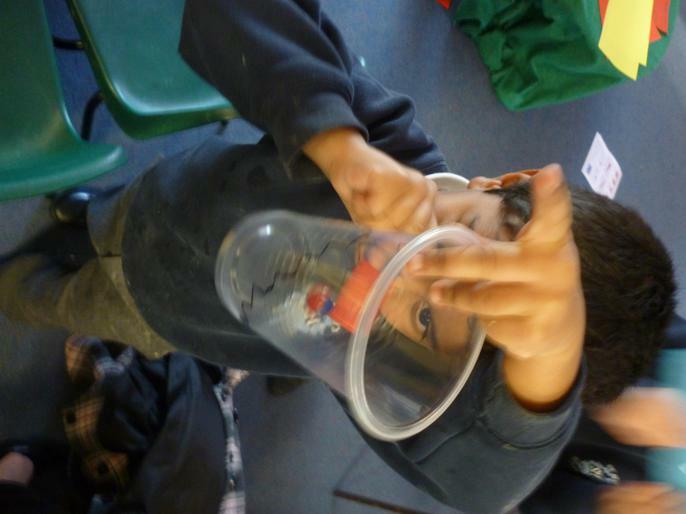 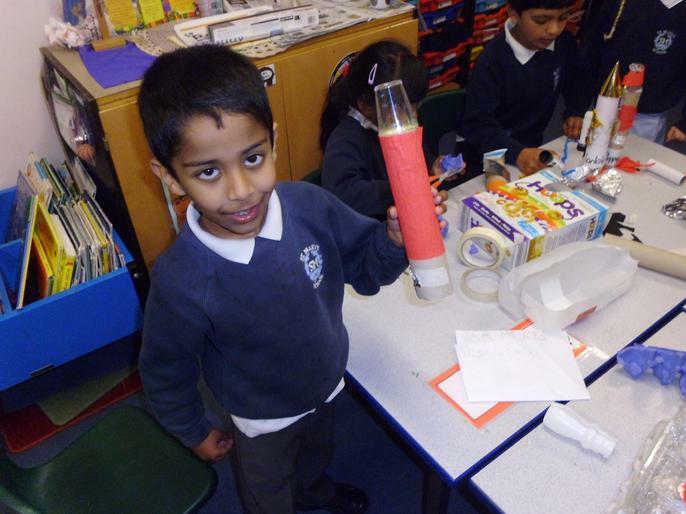 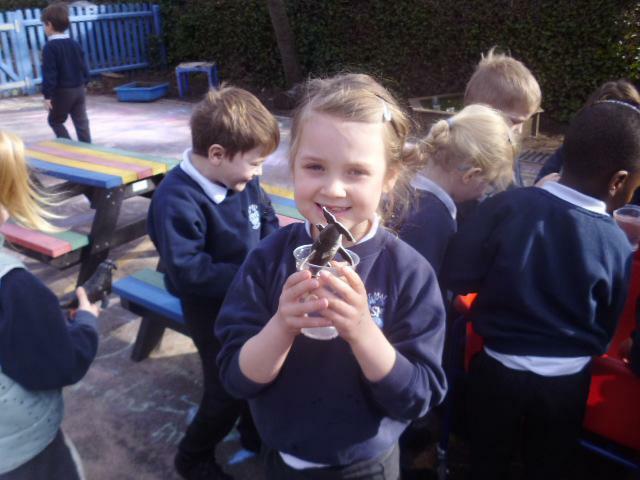 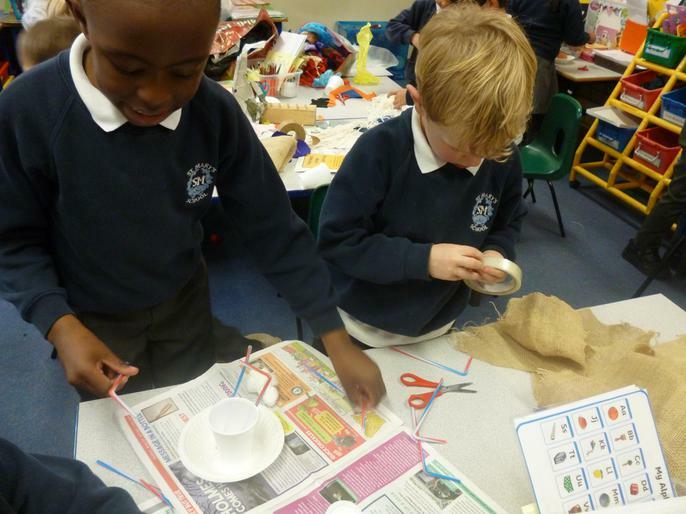 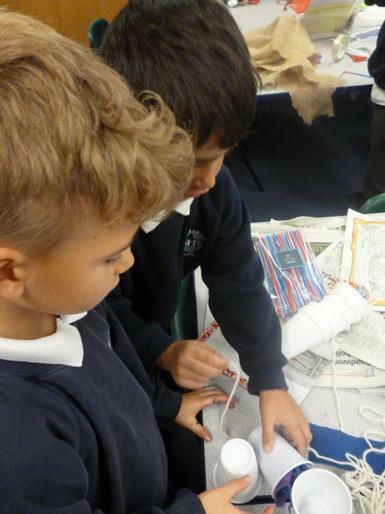 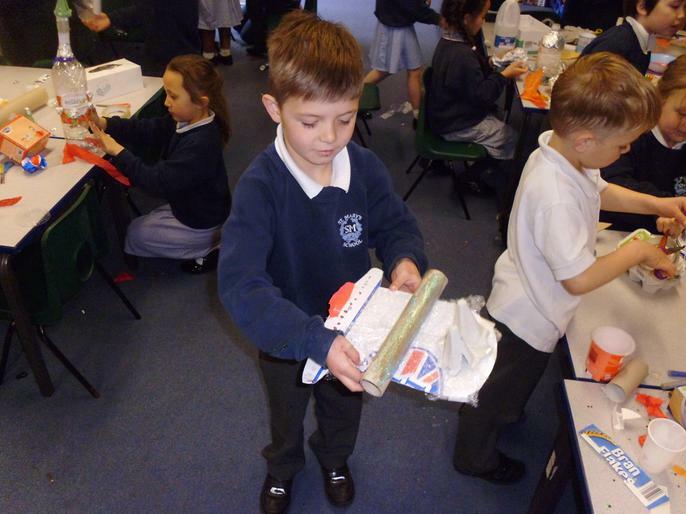 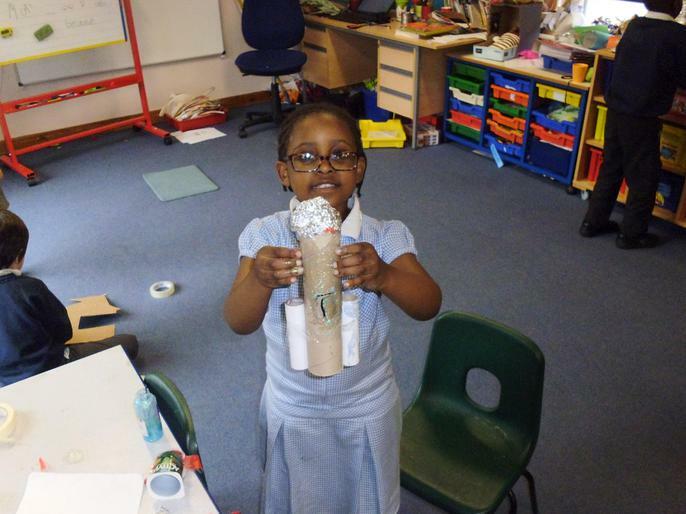 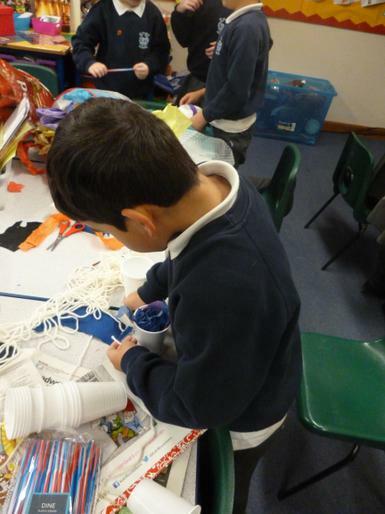 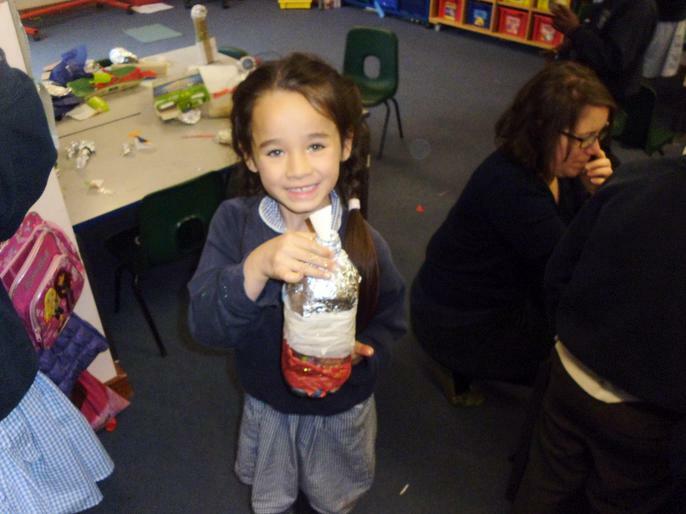 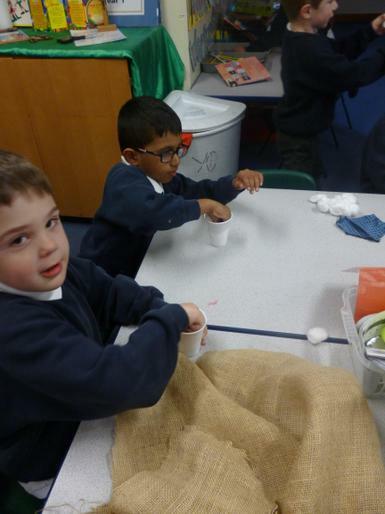 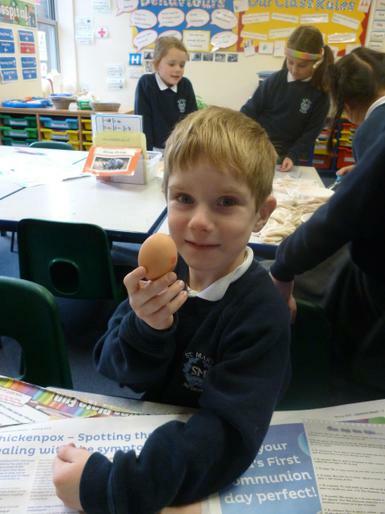 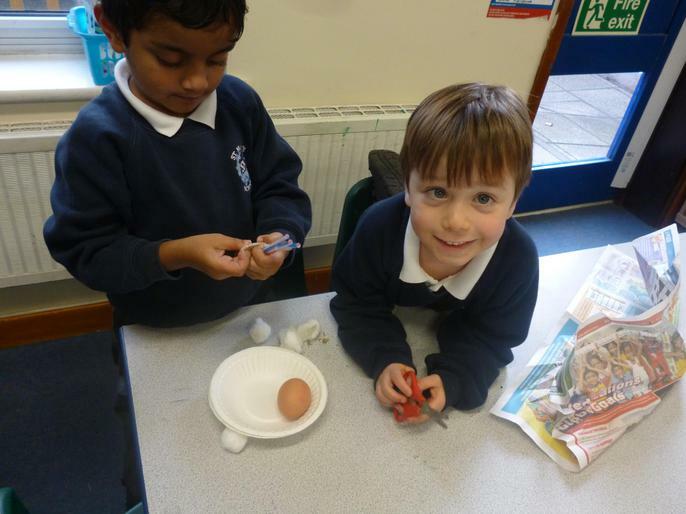 We then made containers to hold our eggs that we are then going to drop from a height of 1 metre. 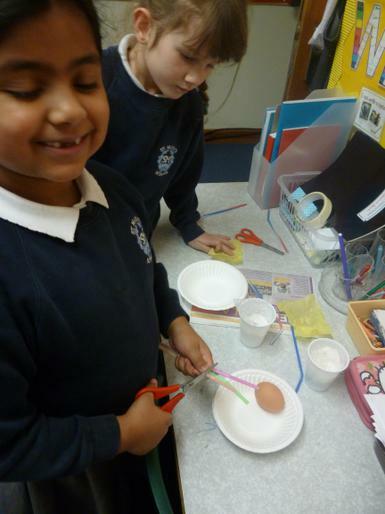 We hope that they are not going to break! 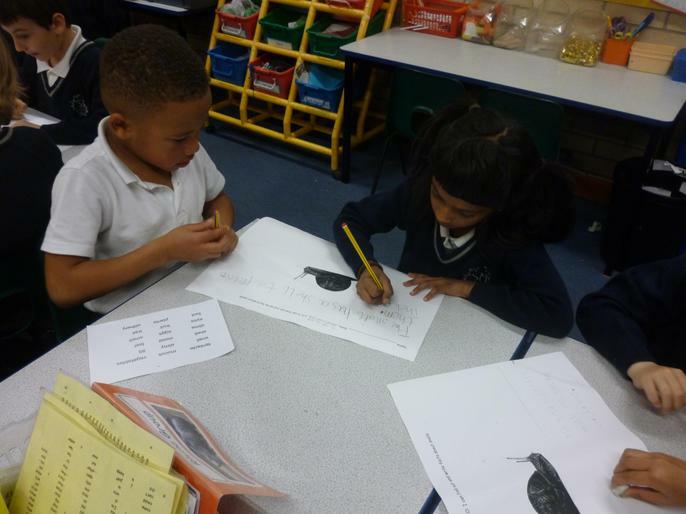 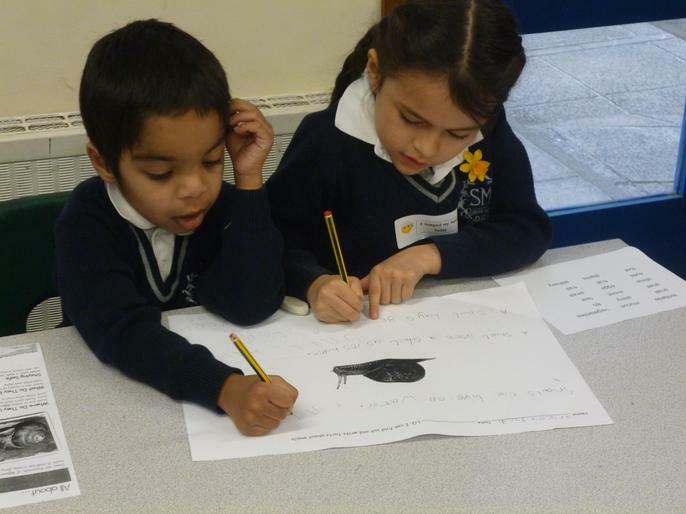 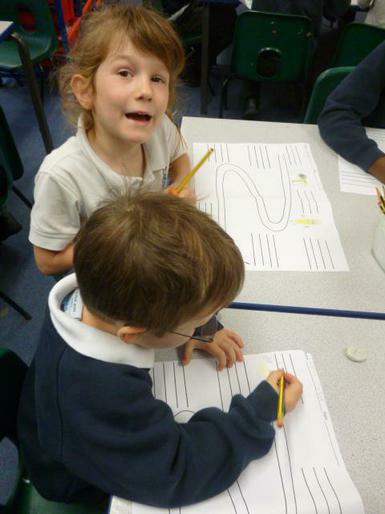 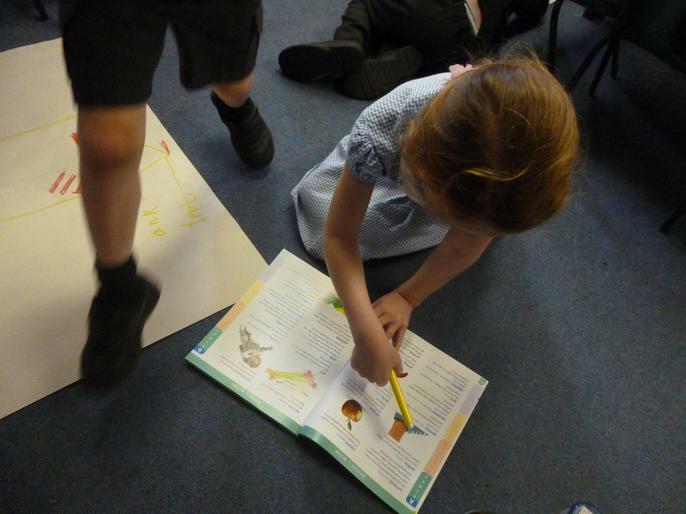 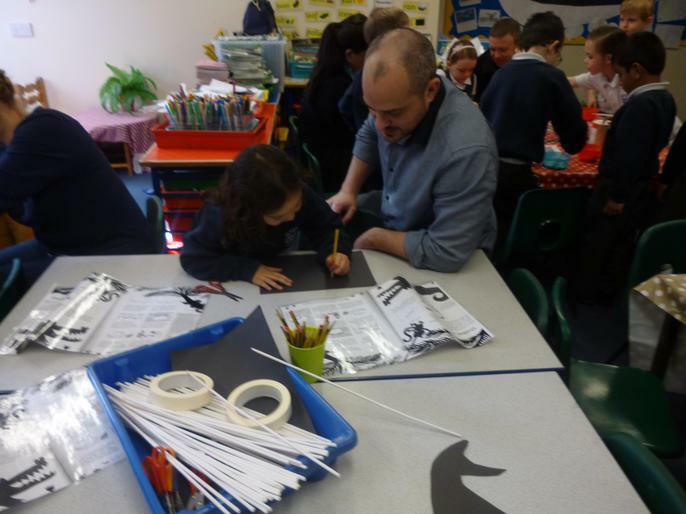 Croc and Bird pictures - Today we drew pictures of Croc and Bird from our book. 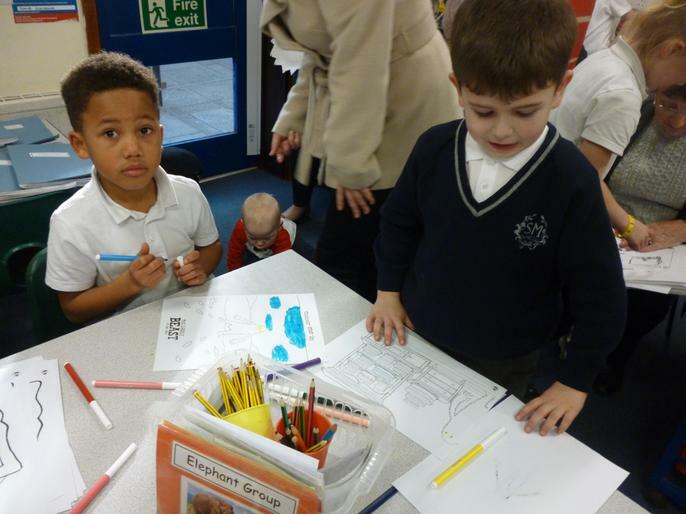 We watched a film of how Alexis Deacon drew the characters in the book and then used water colours to draw our own pictures. 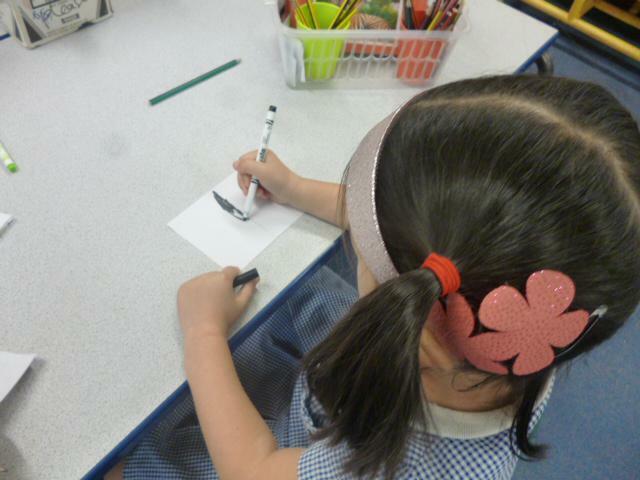 Croc and Bird - Today we started our new book 'Croc and Bird' by Alexis Deacon that we are looking at for book week. 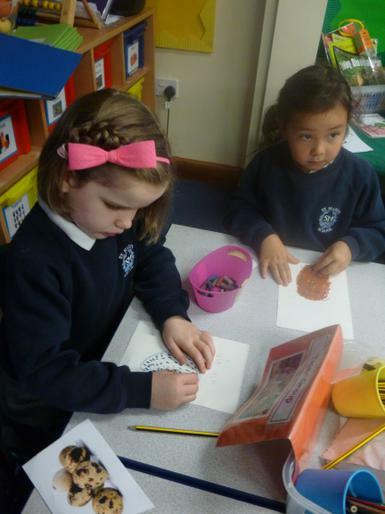 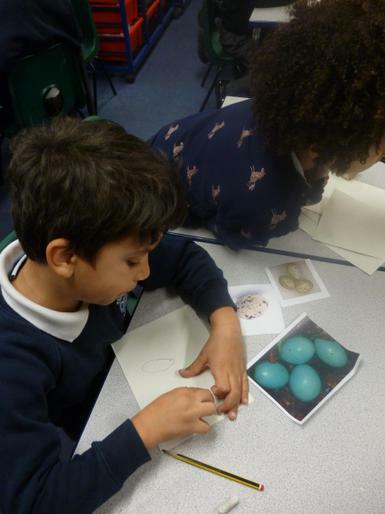 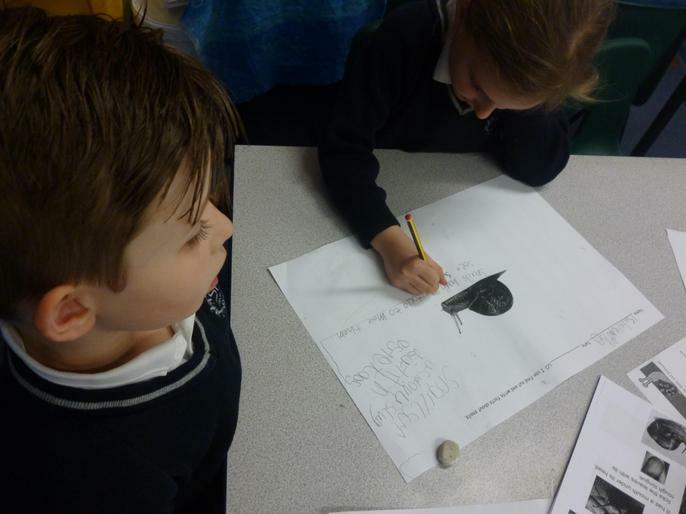 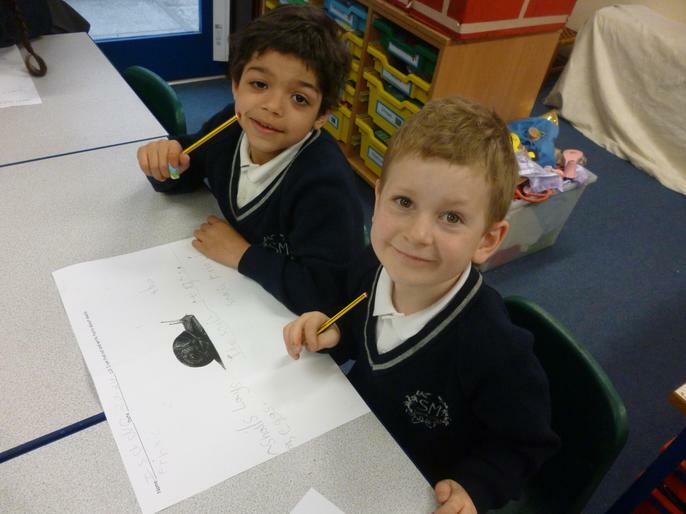 It is all about eggs so we looked at different eggs and then drew them and wrote words to describe them. 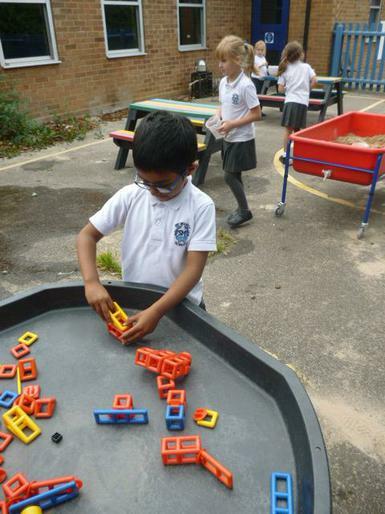 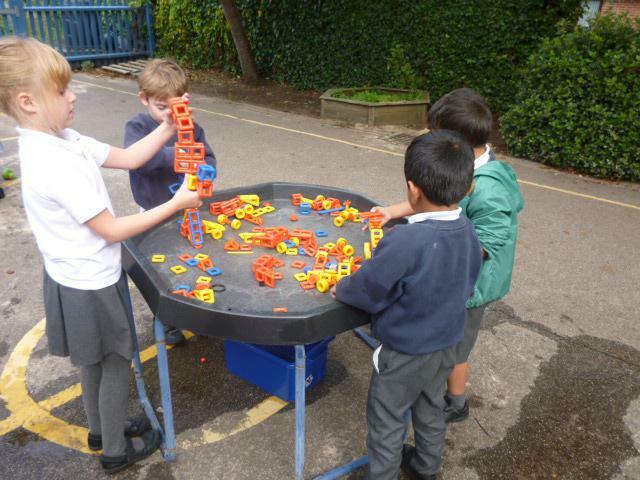 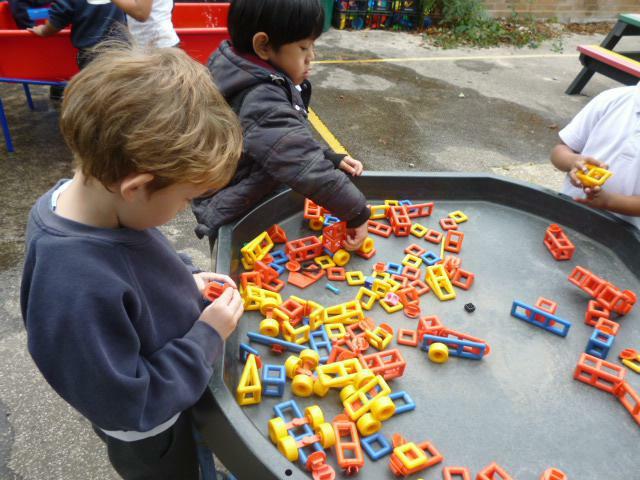 New Blocks - Today we had great fun unpacking our new wooden blocks for the outside area! 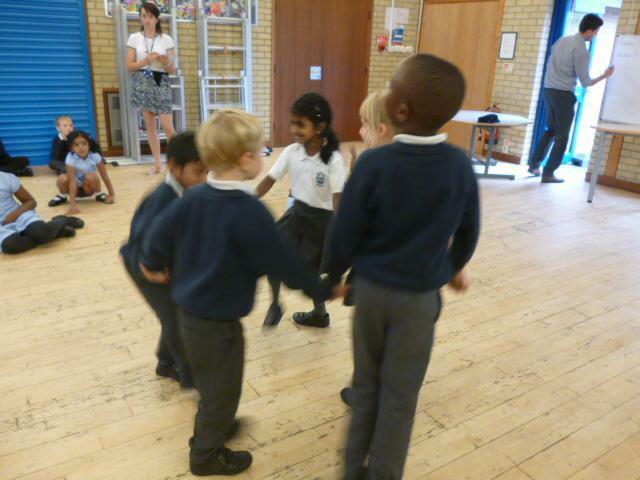 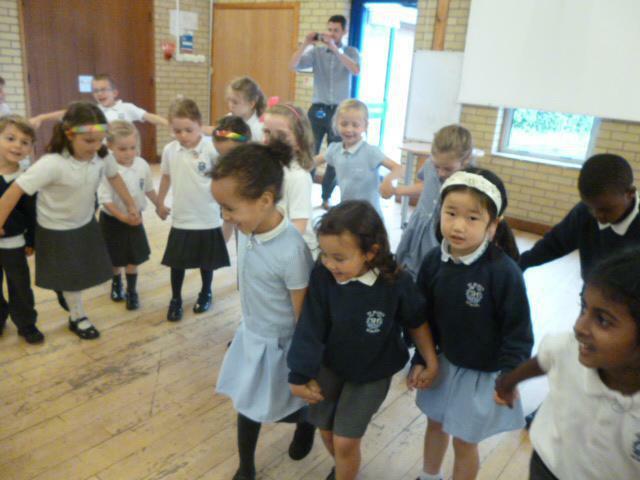 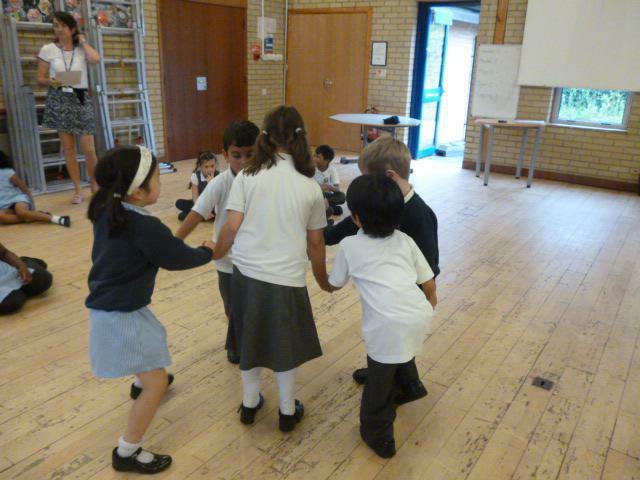 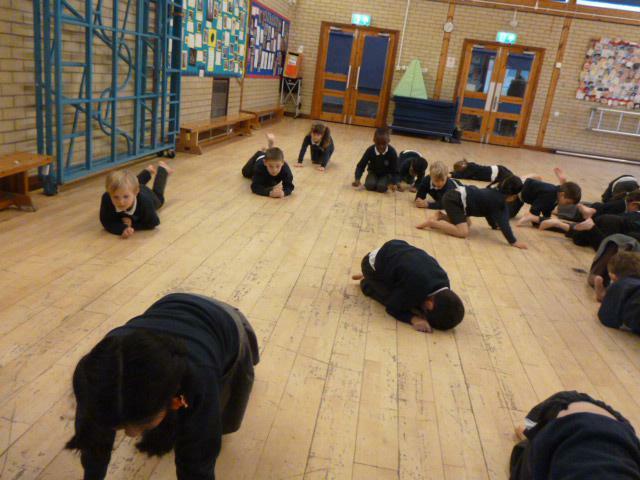 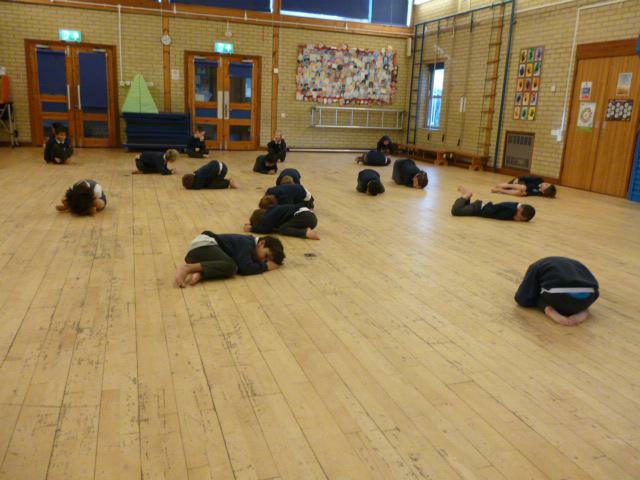 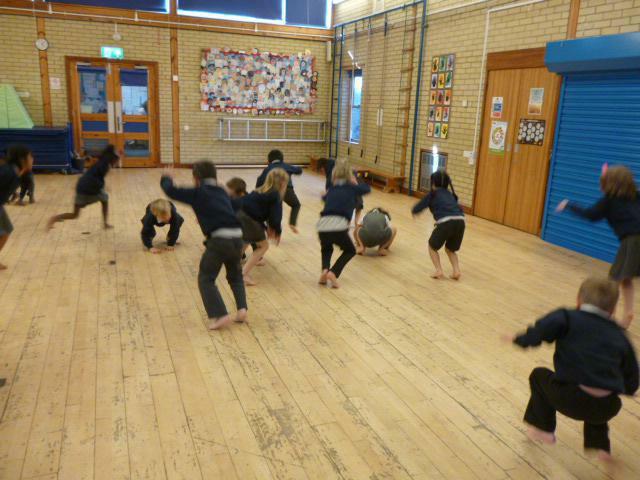 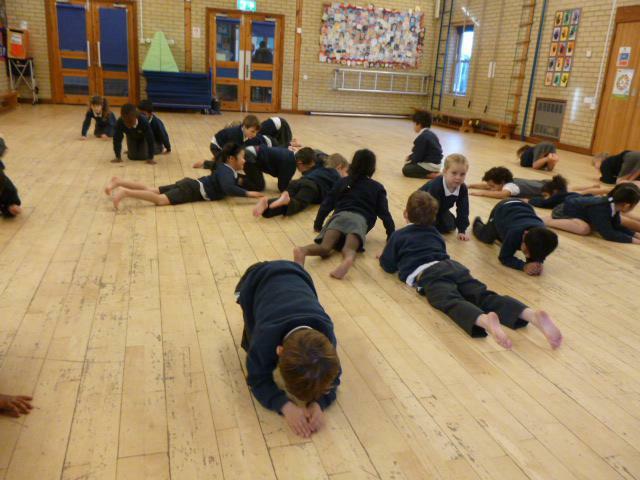 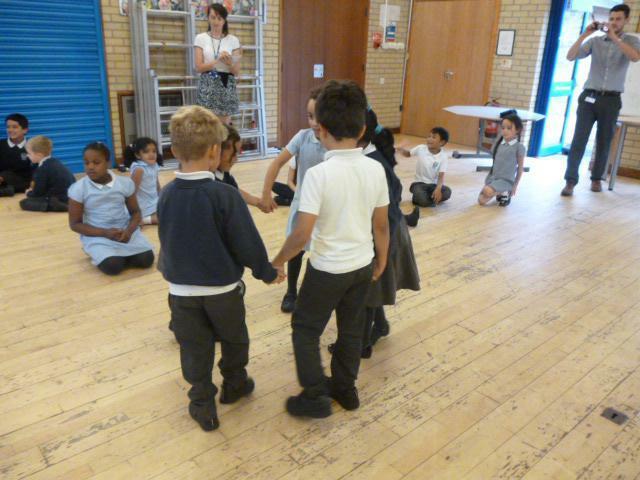 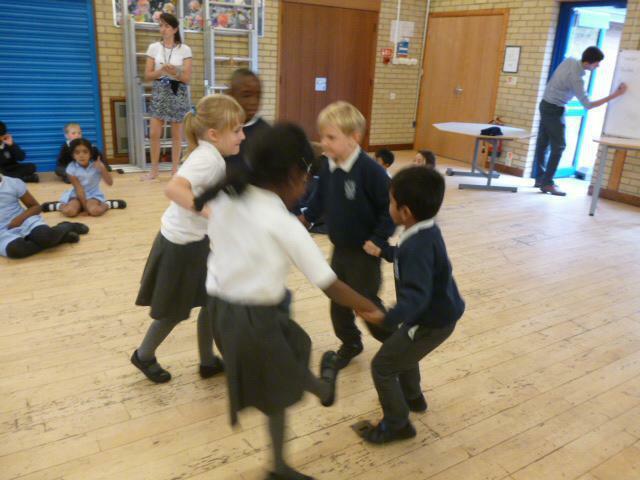 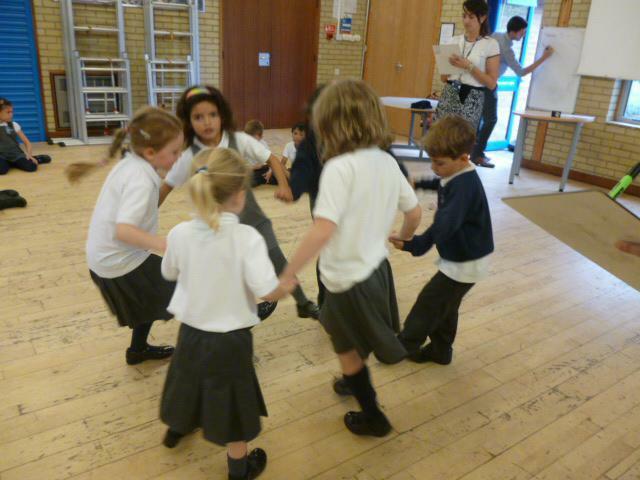 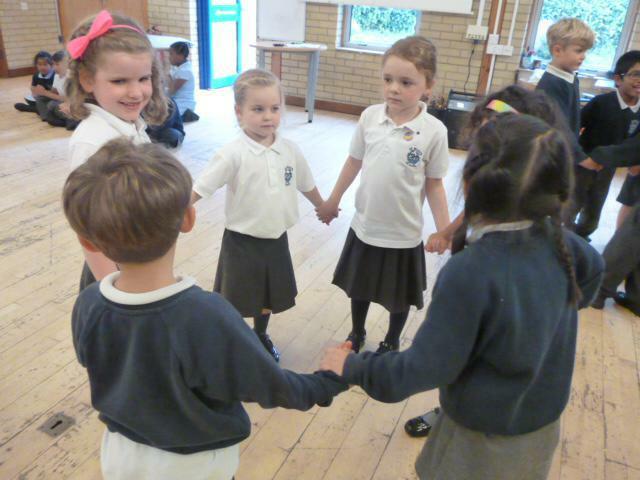 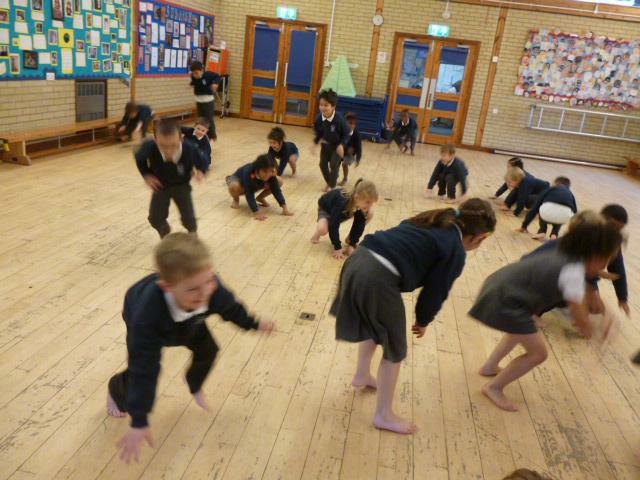 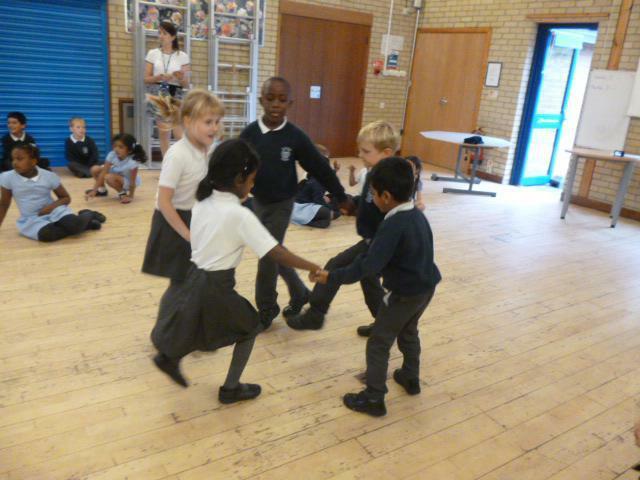 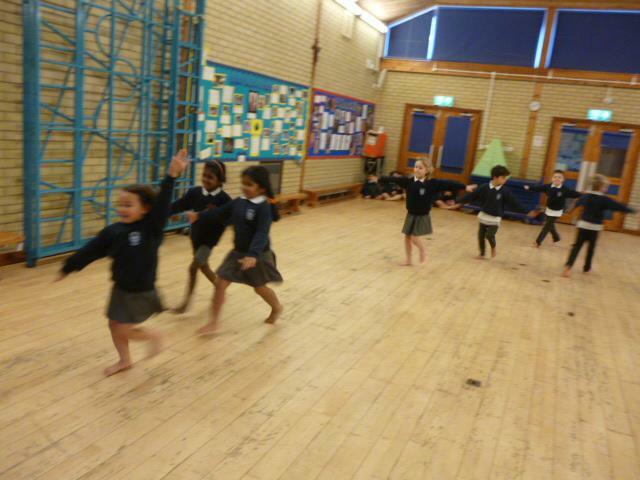 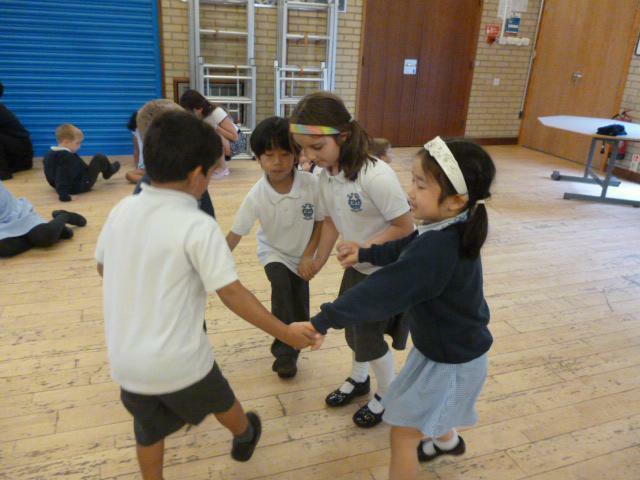 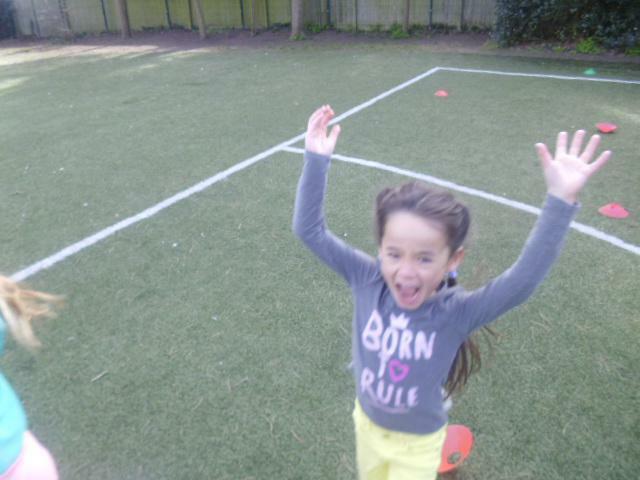 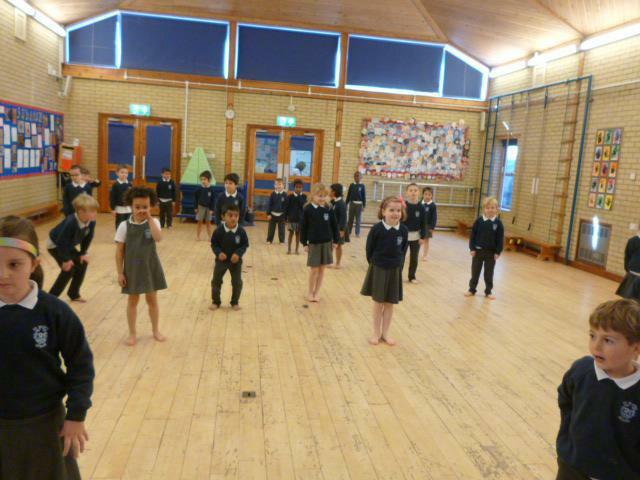 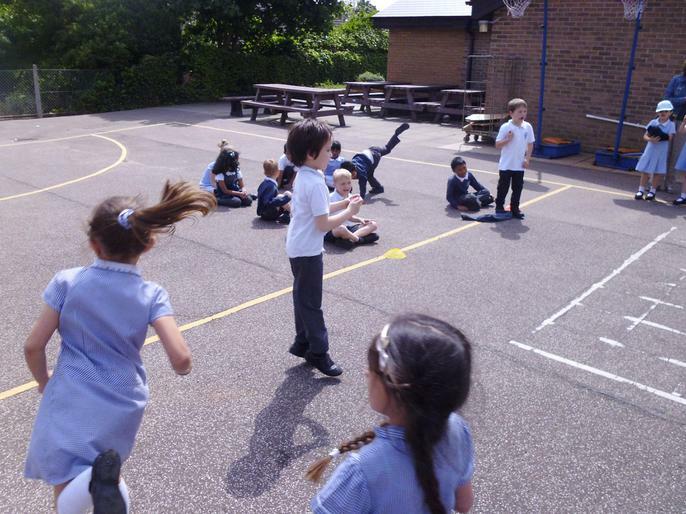 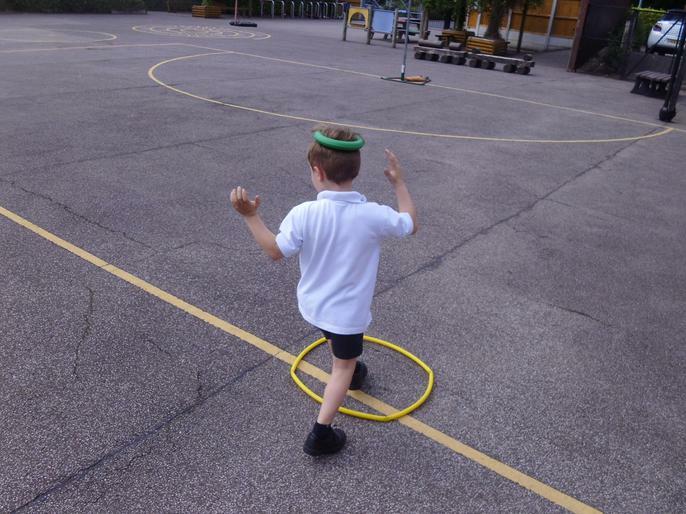 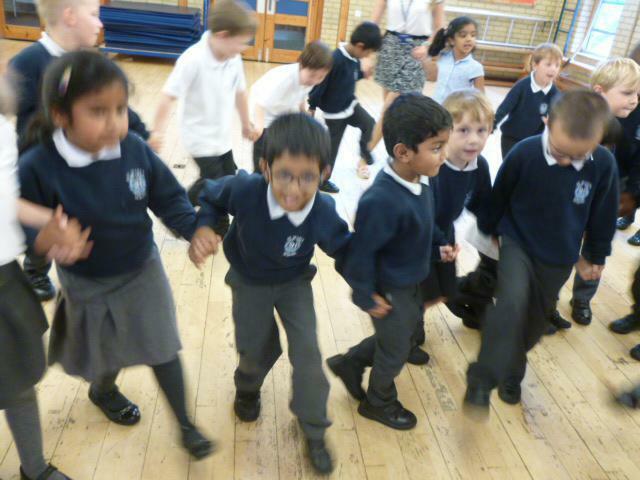 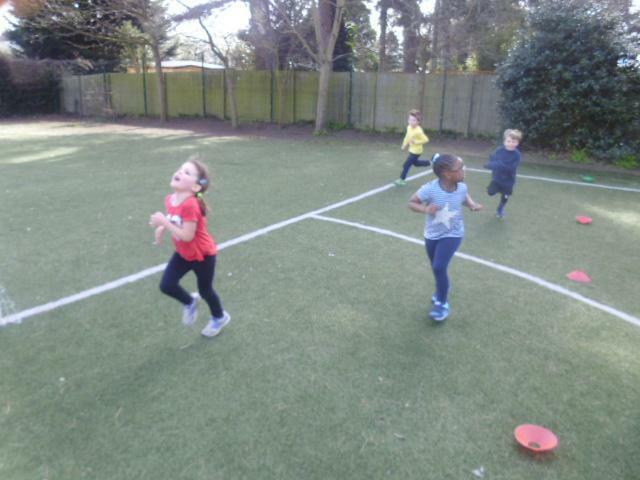 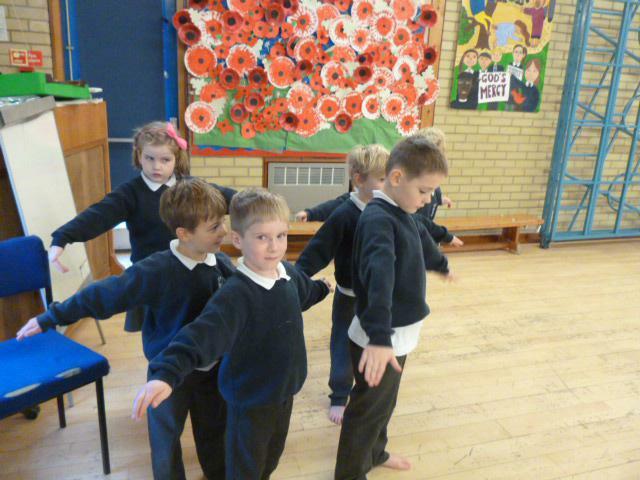 Dance - In PE today we pretended to be different Autumn animals including squirrels, geese and caterpillars. 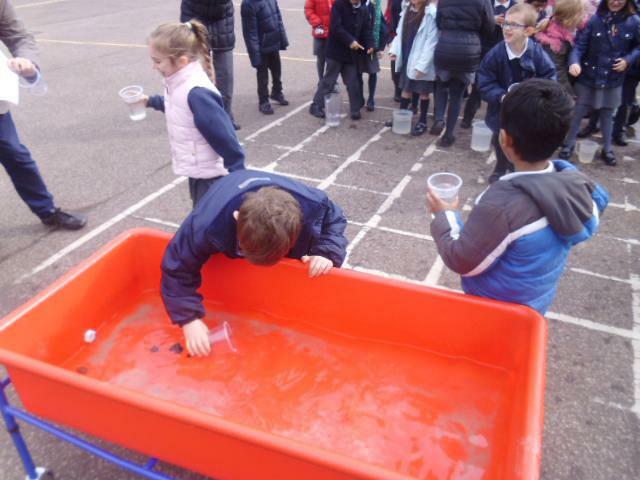 It was great fun! 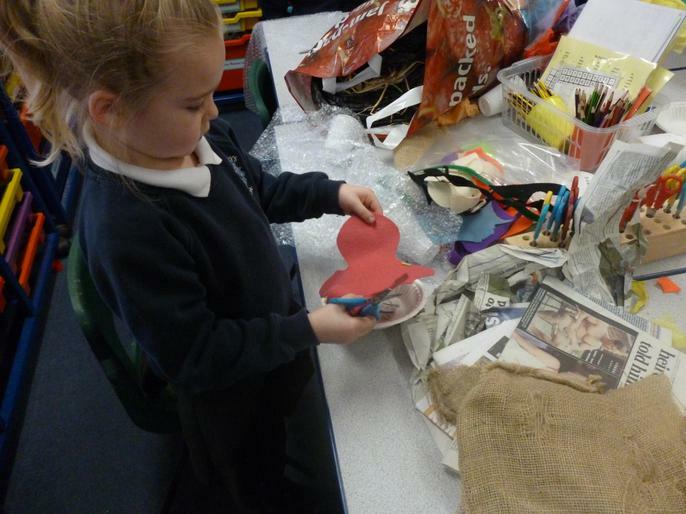 Savannah Sorting! 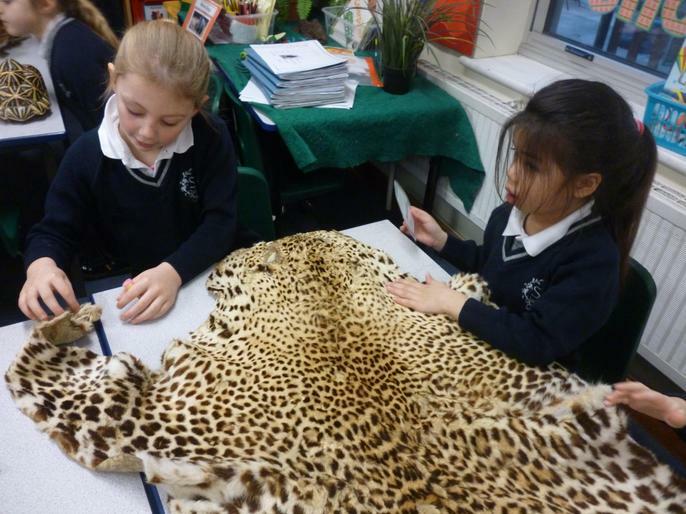 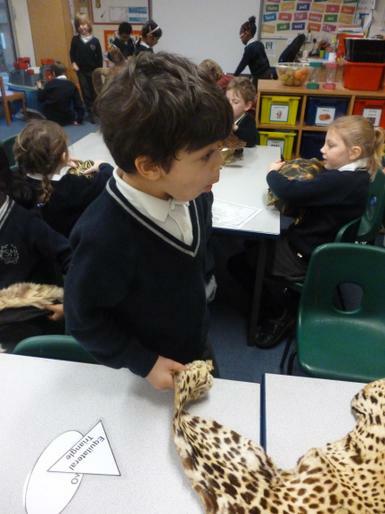 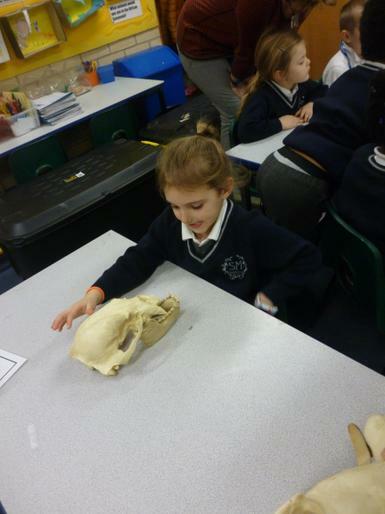 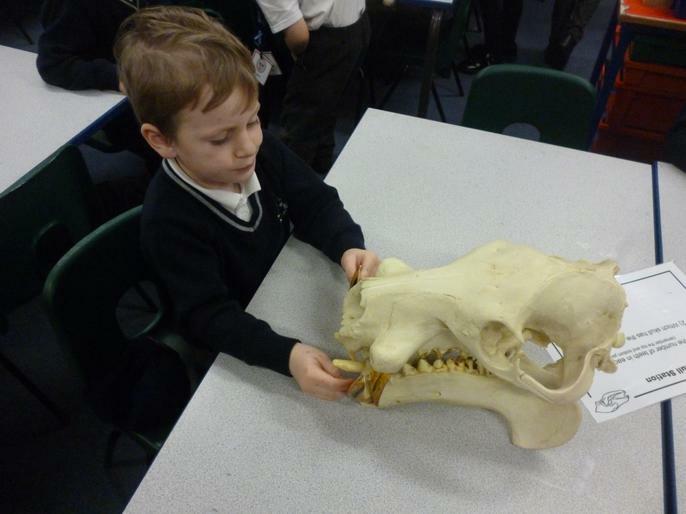 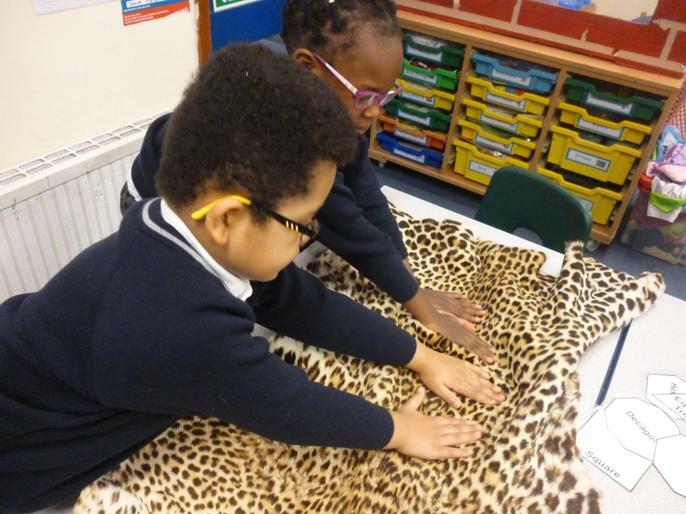 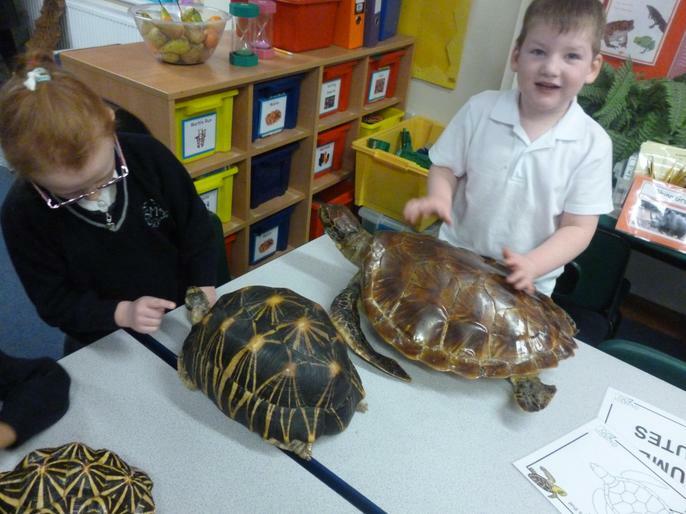 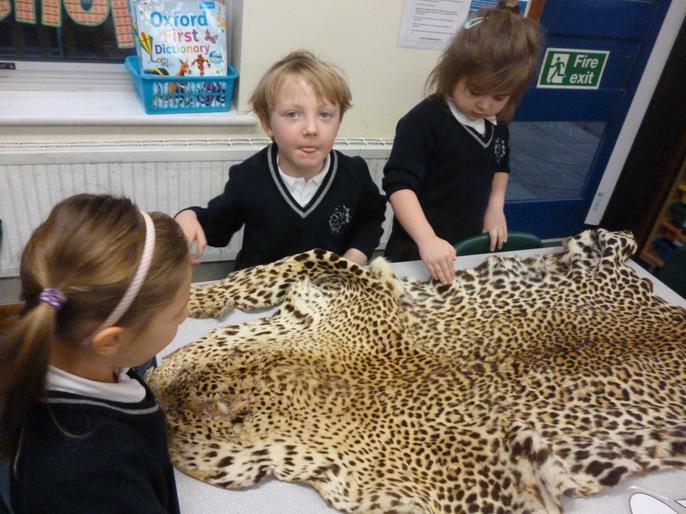 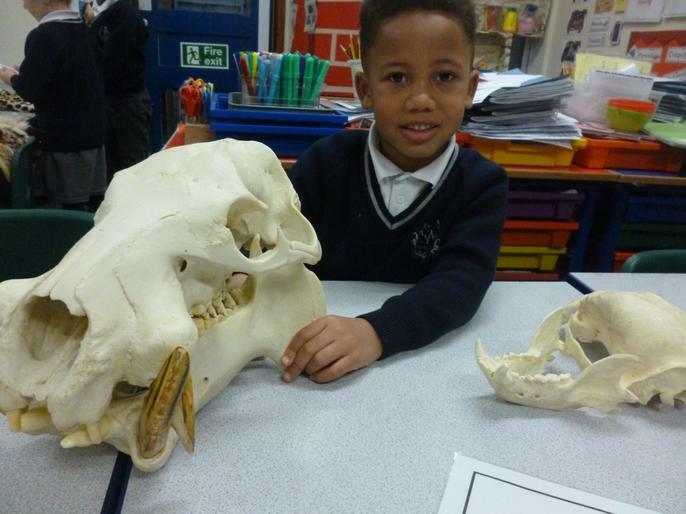 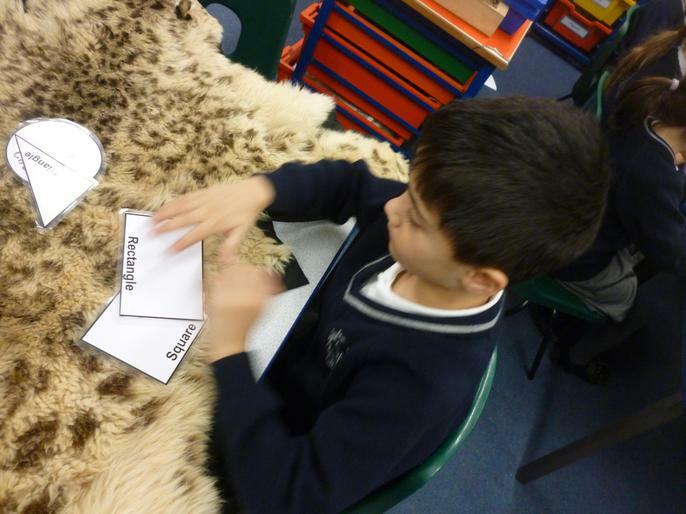 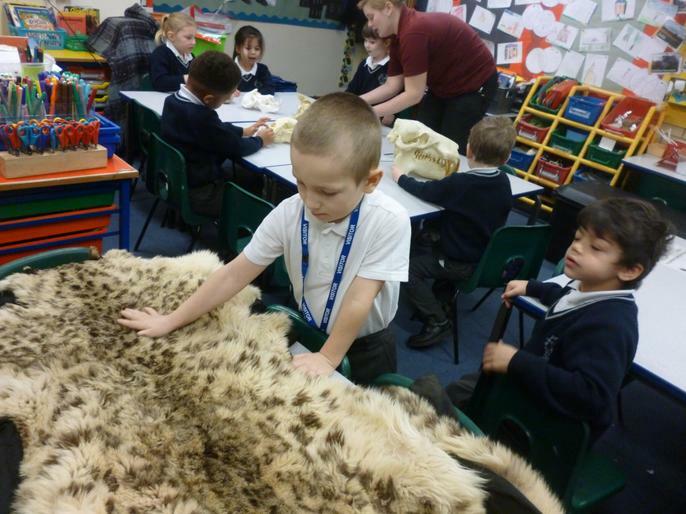 - In literacy today we sorted the animals from the Savannah into groups. 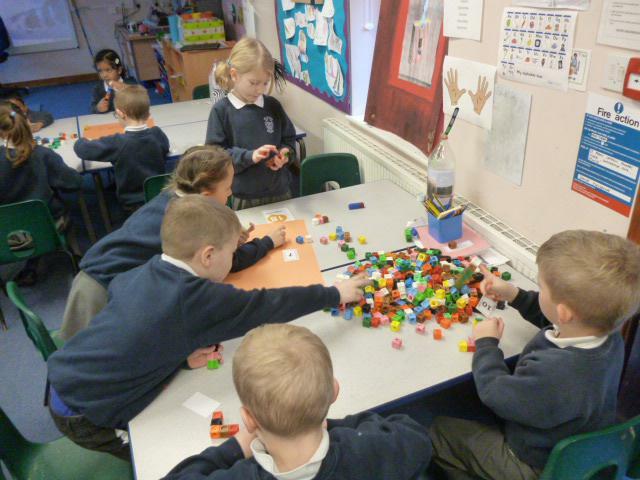 We chose how to sort them. 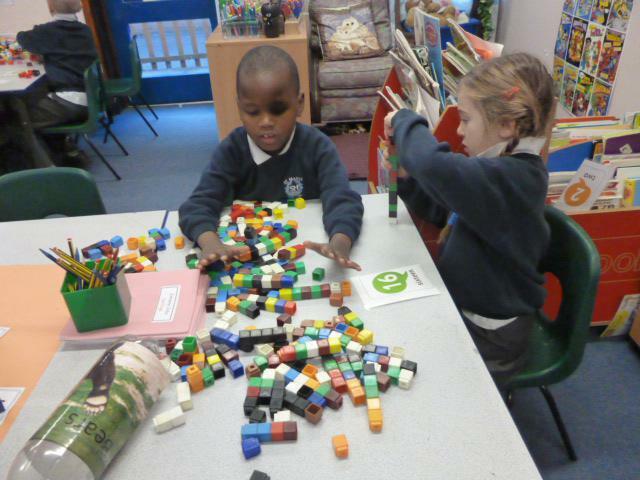 Some sorted them according to how they moved, what colour there were or their size. 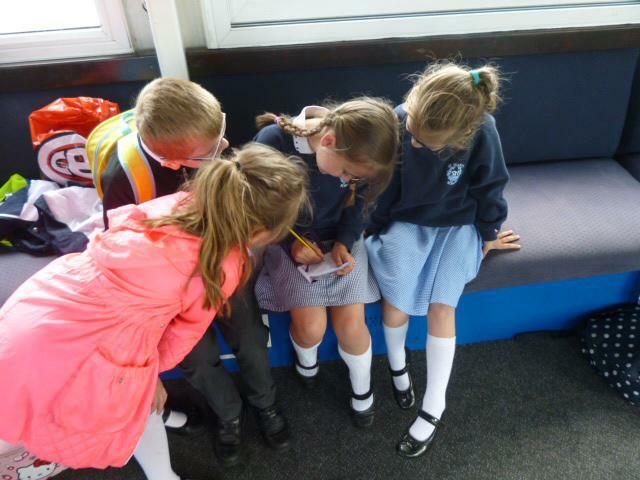 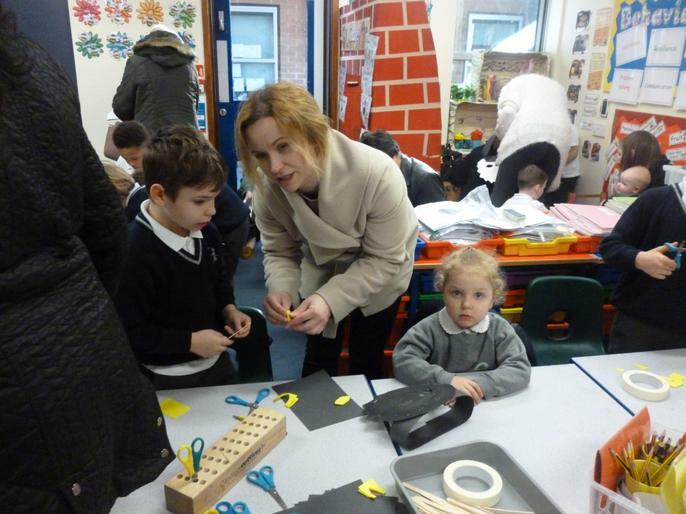 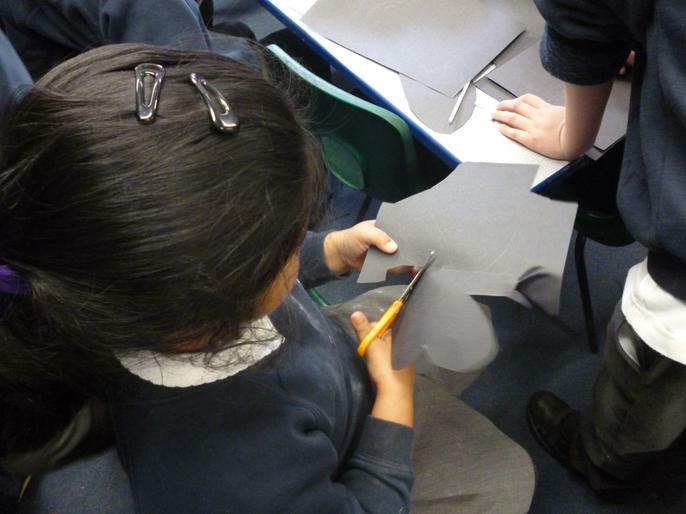 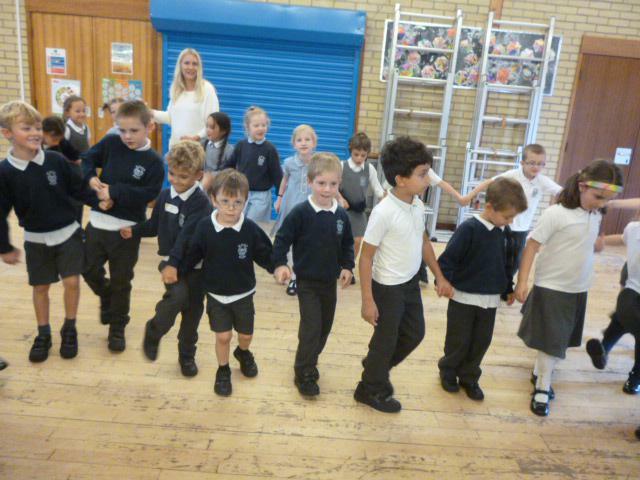 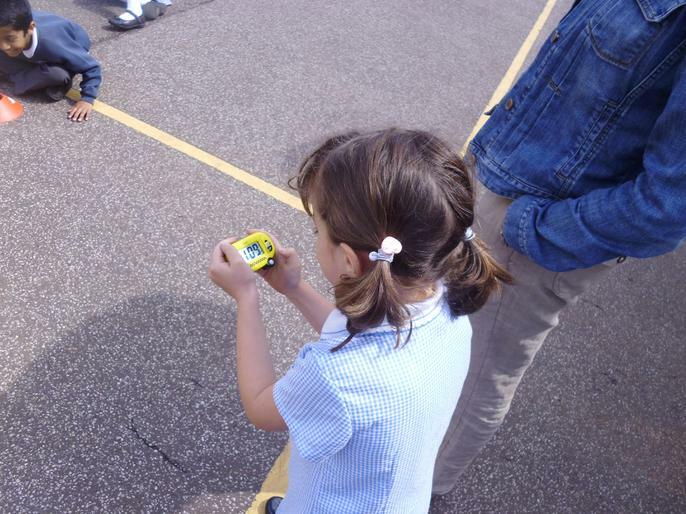 Materials Walk - This afternoon we went on a walk around the school to find different materials. 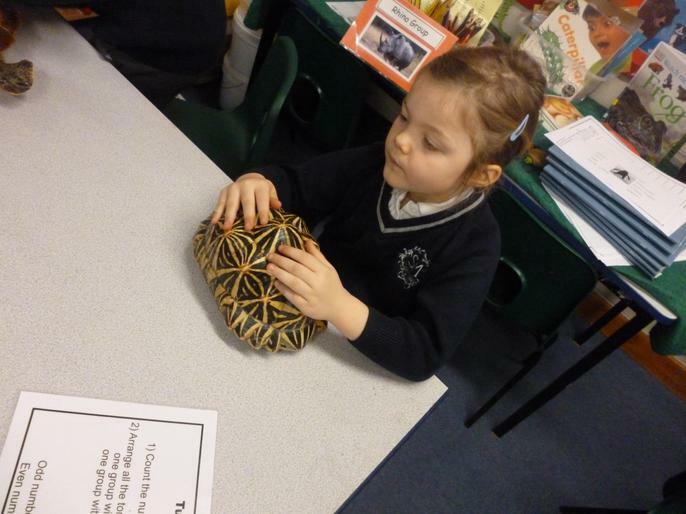 We found things made of wood, plastic, glass,, metal and brick. 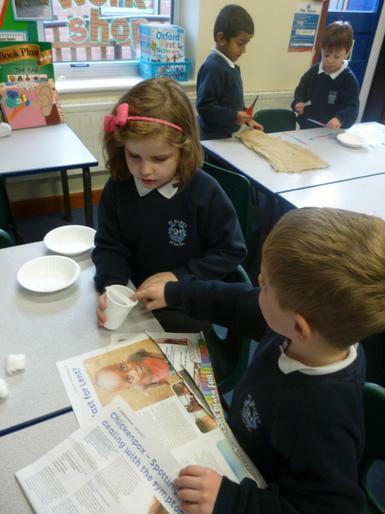 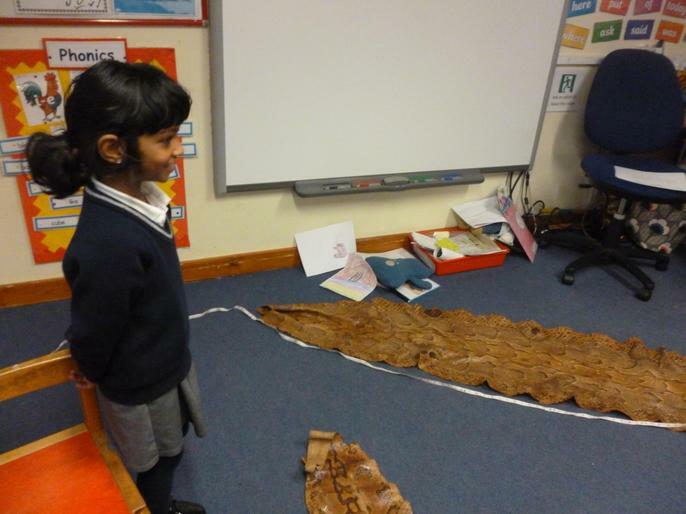 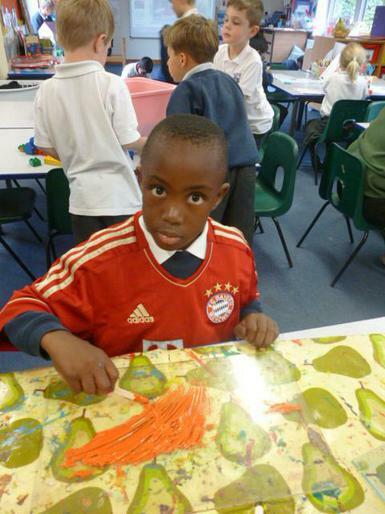 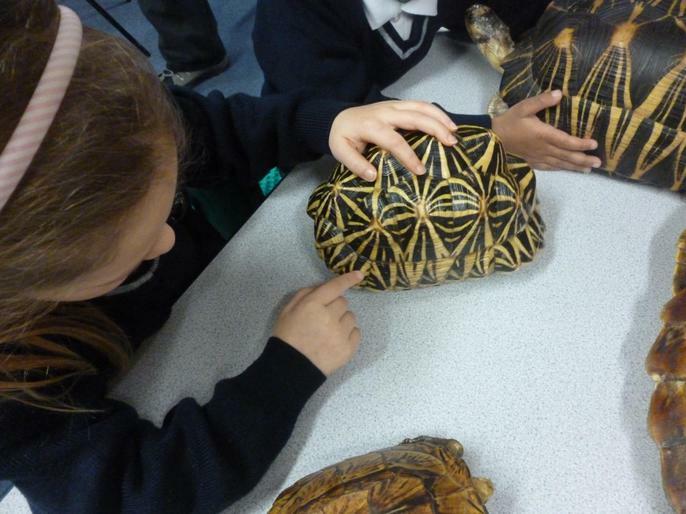 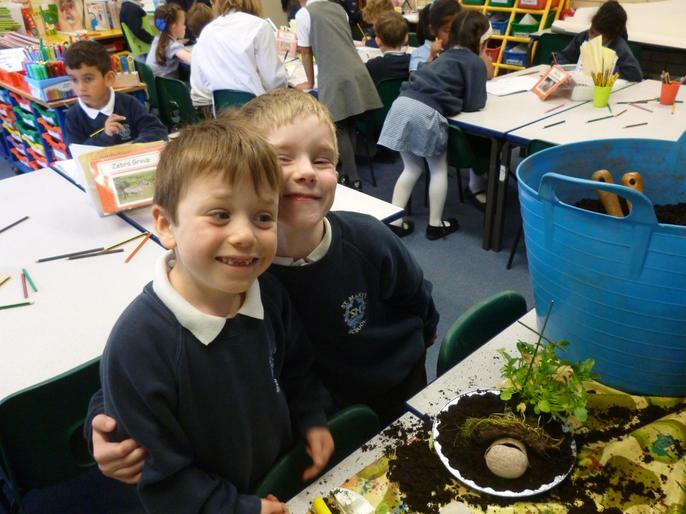 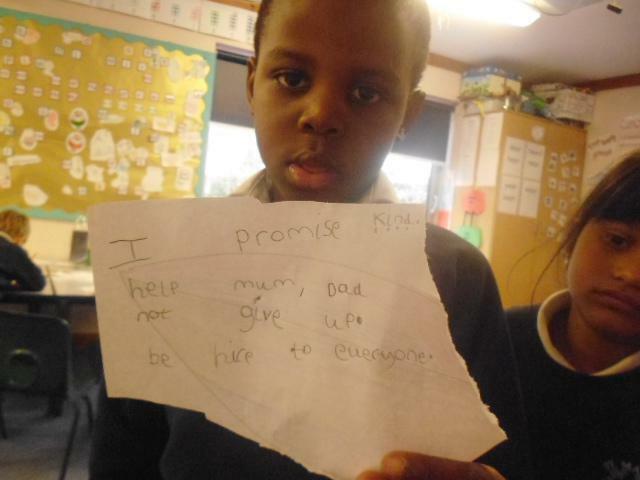 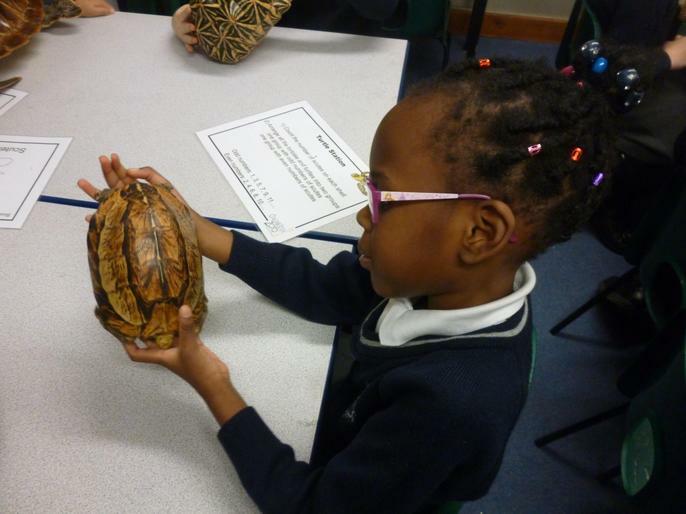 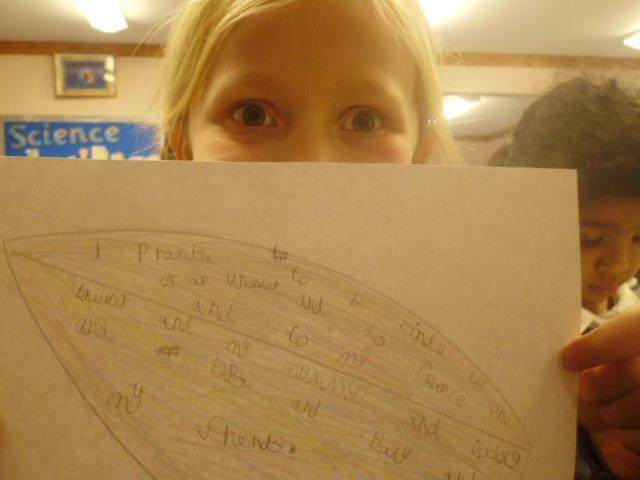 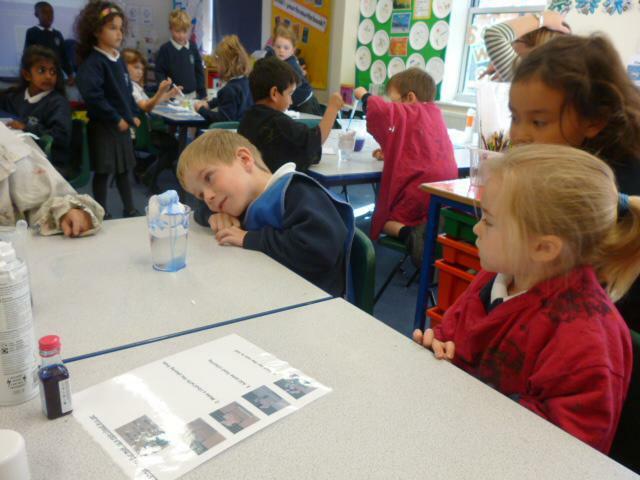 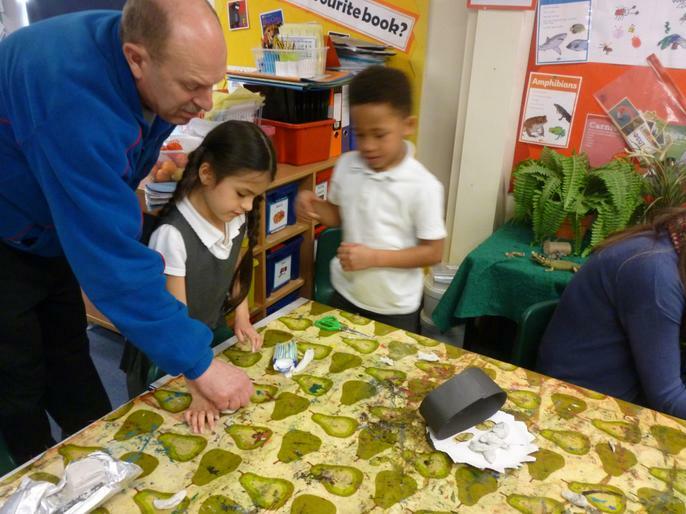 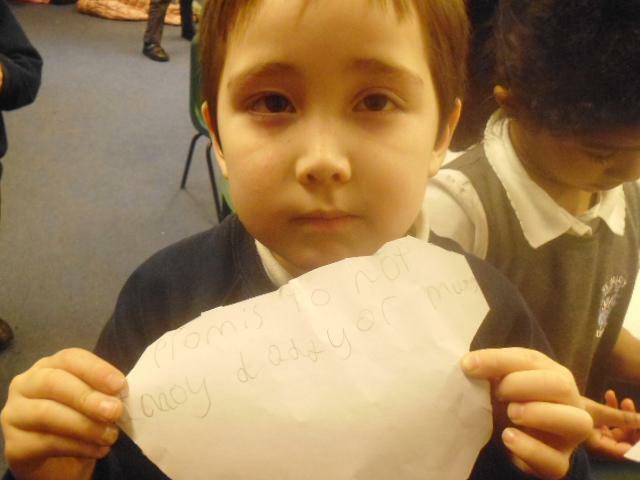 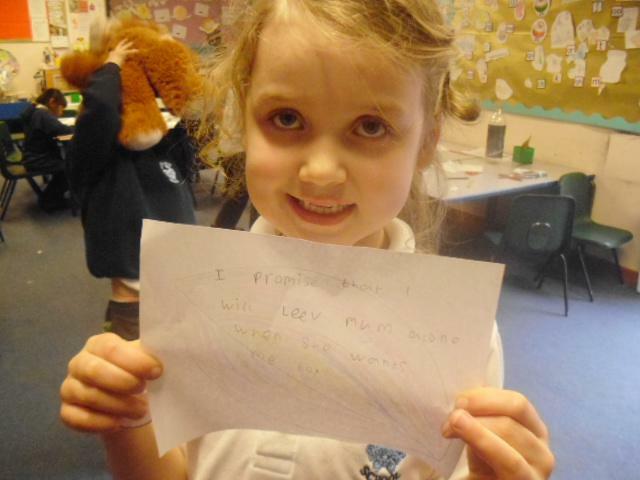 Looking after the World - We talked about ways we could look after the wonderful world that God created. 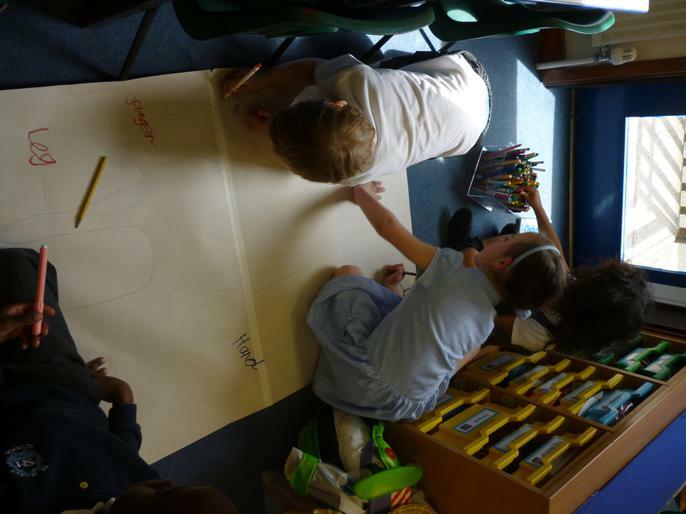 We made posters to show different ways we could help. 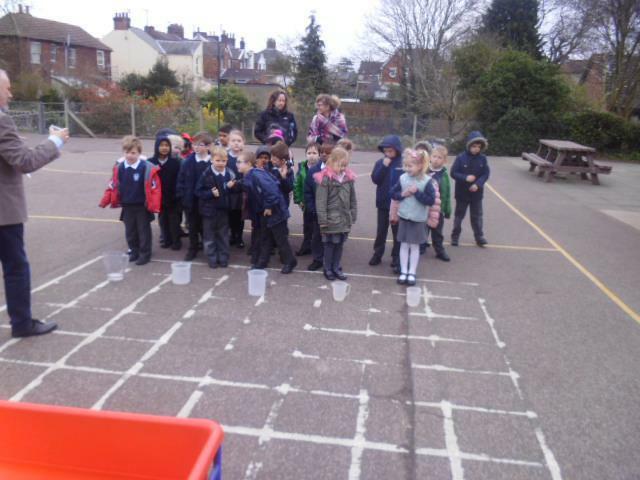 Rain Gauges - This afternoon we made rain gauges to measure the rainfall. 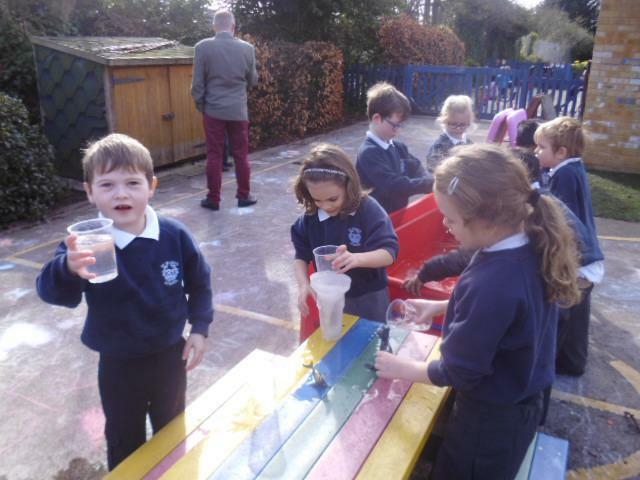 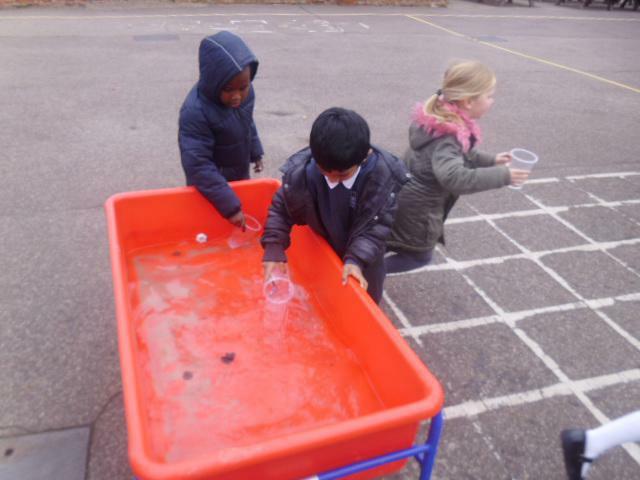 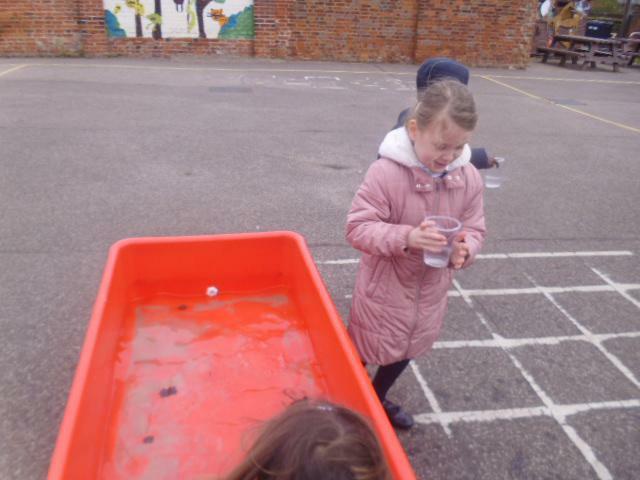 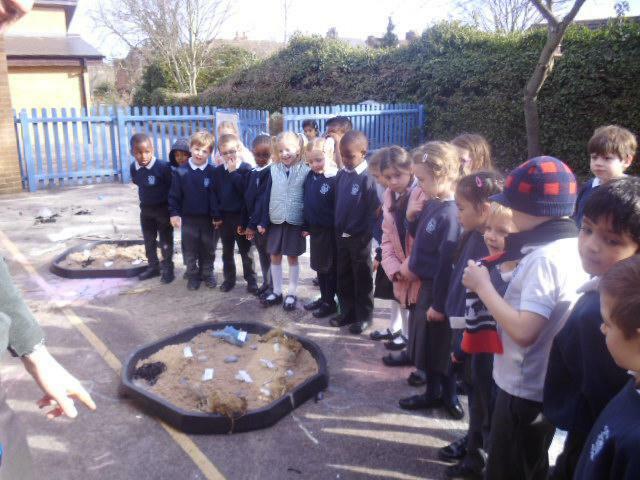 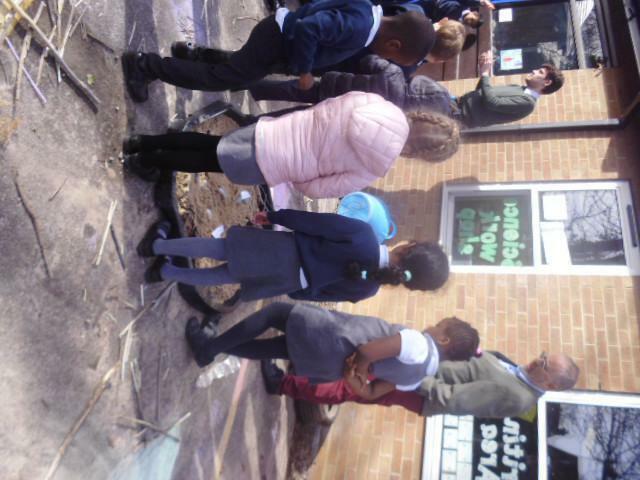 We used plastic bottles, made a scale and then put them outside. 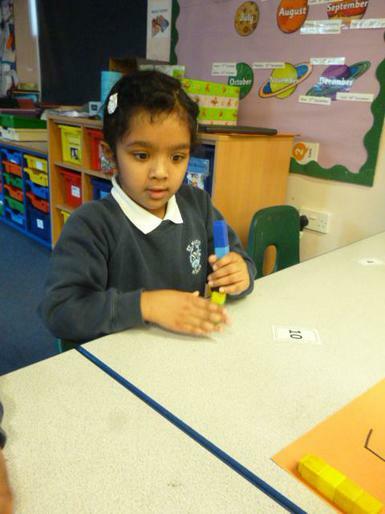 Addition - Today in numeracy we partitioned numbers and then wrote what we had done as addition sentences. 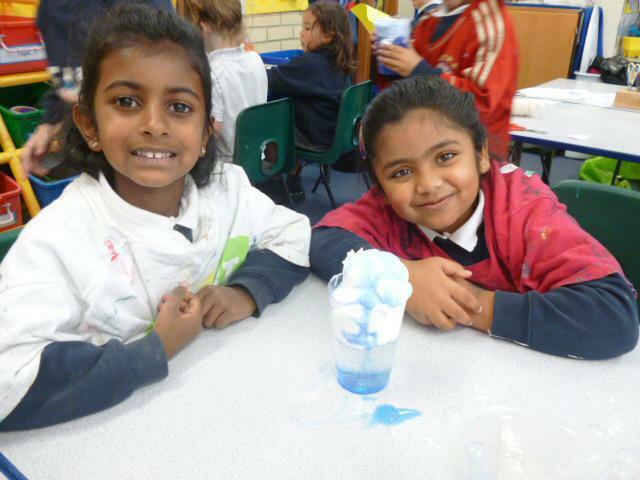 Clouds - We had great fun in science today. 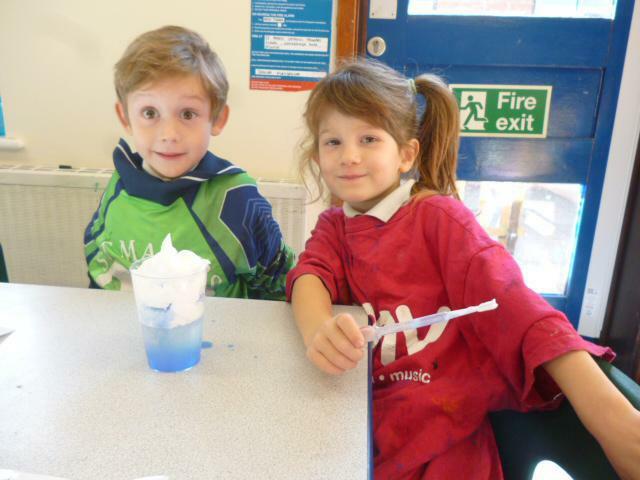 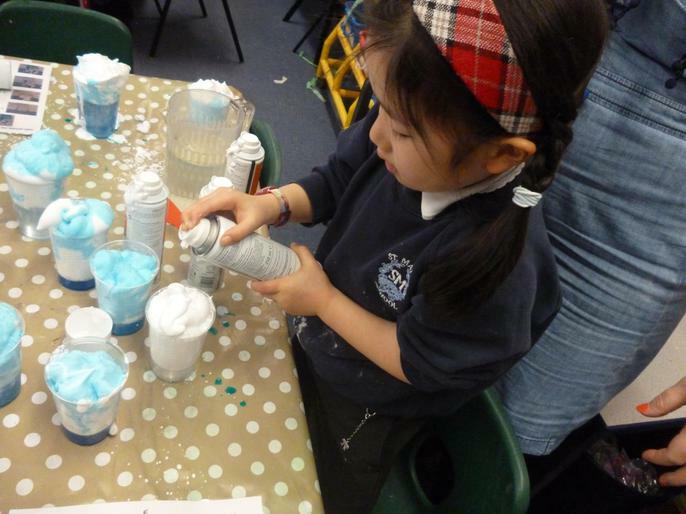 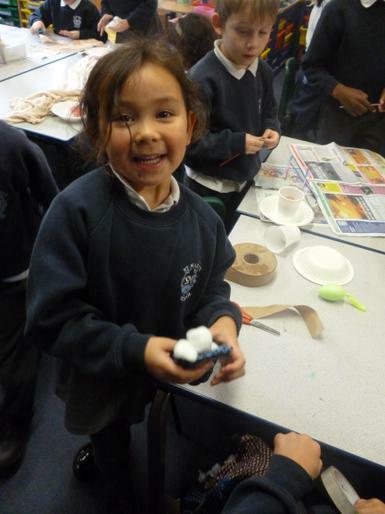 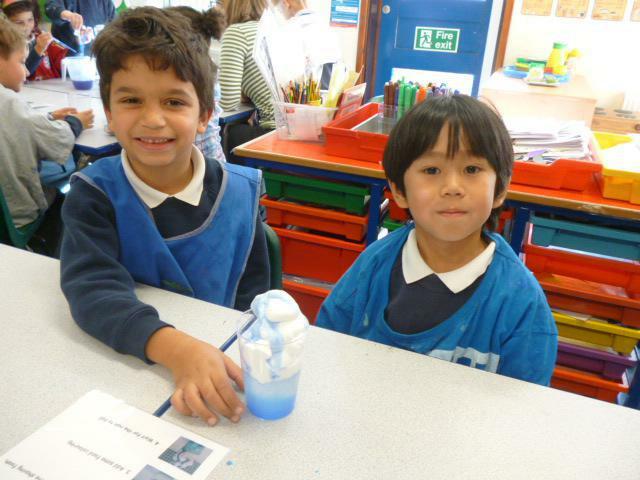 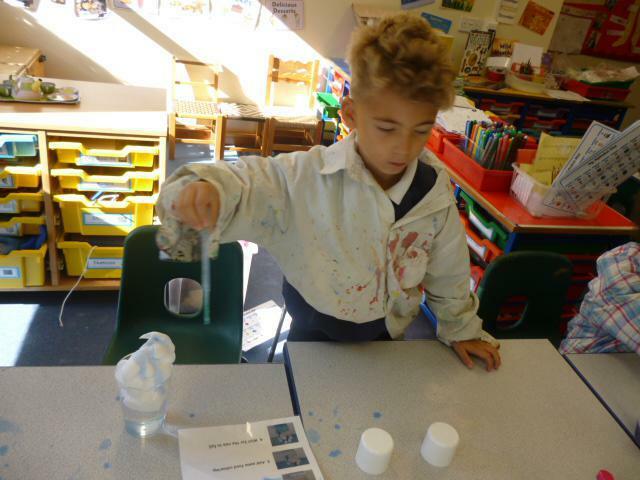 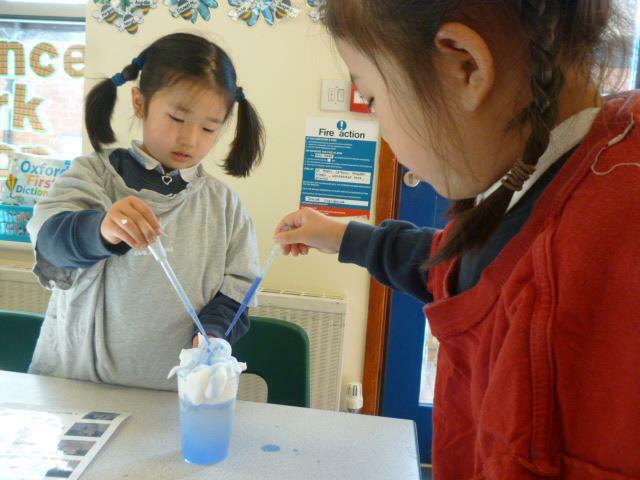 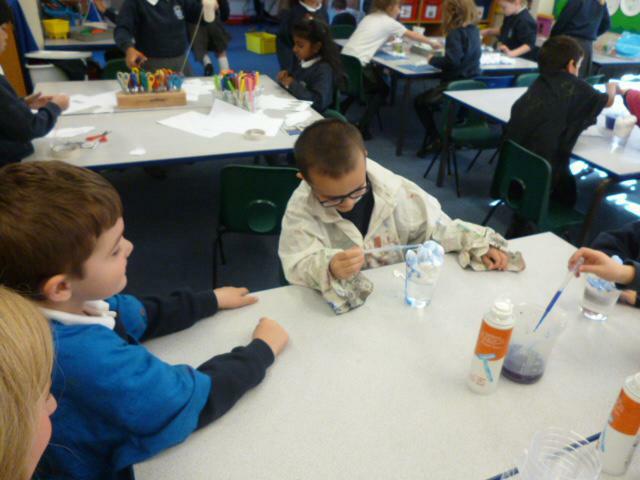 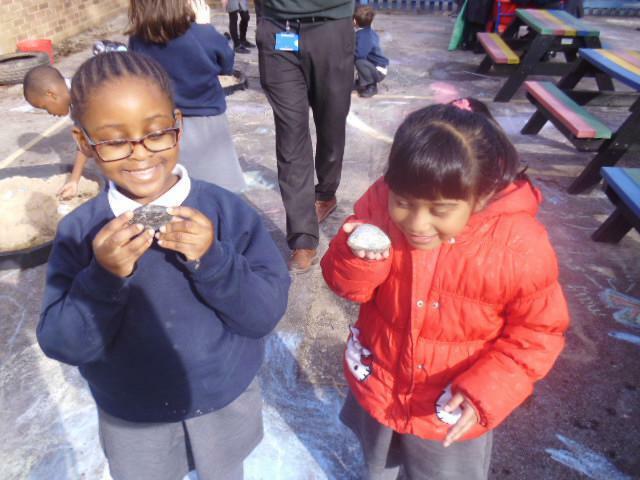 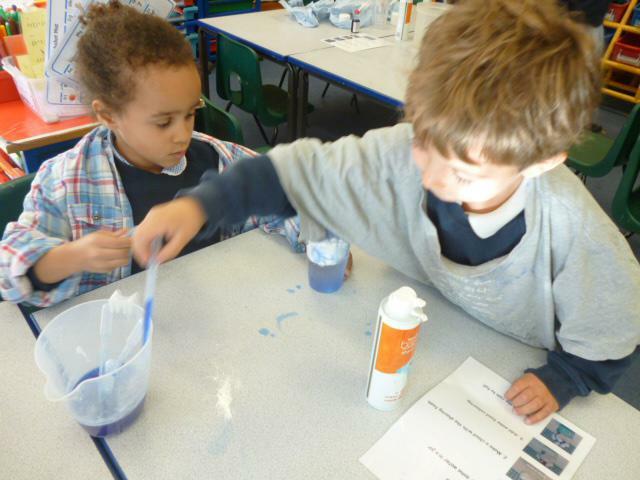 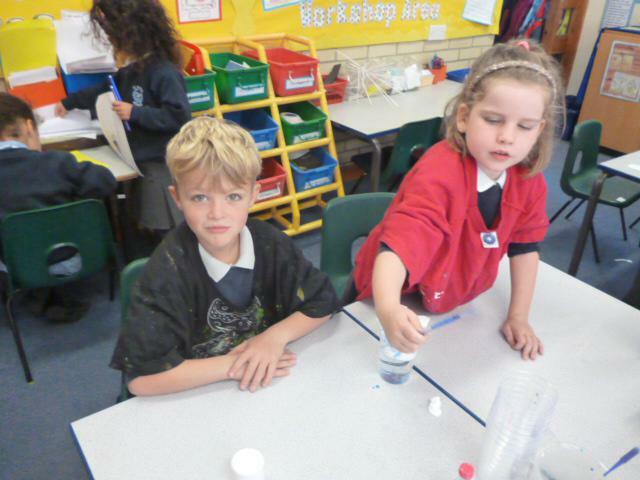 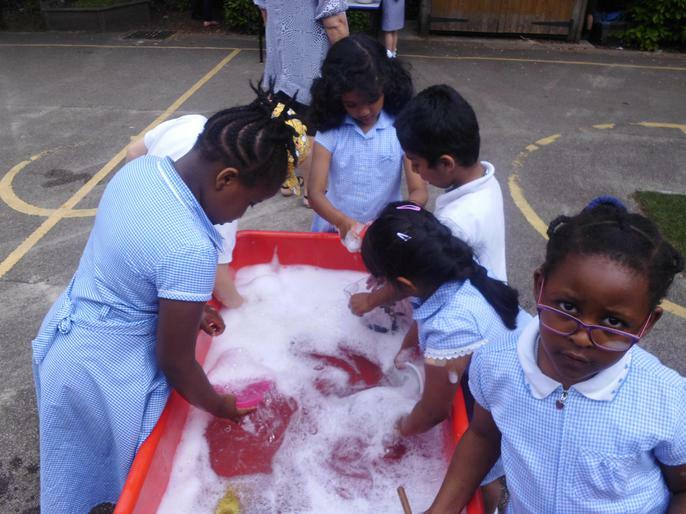 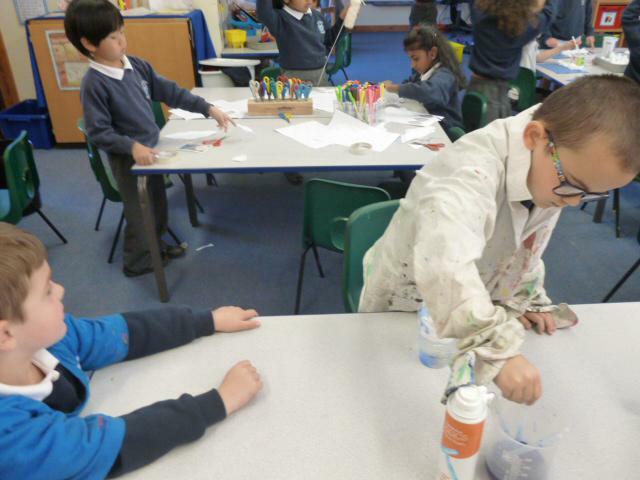 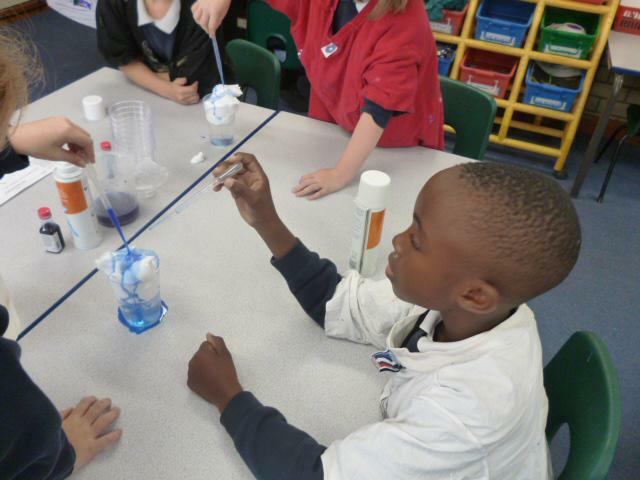 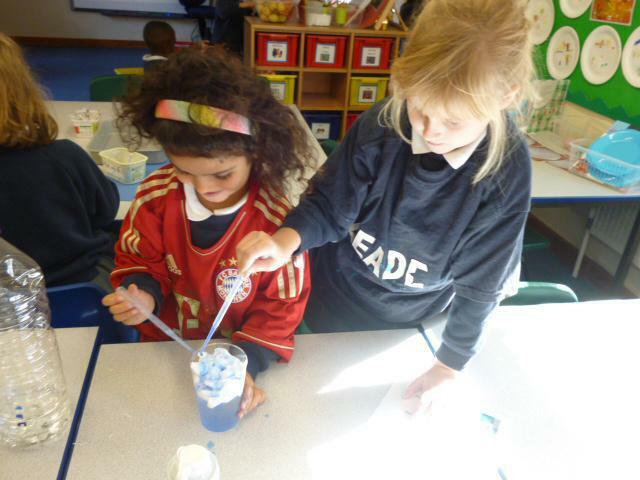 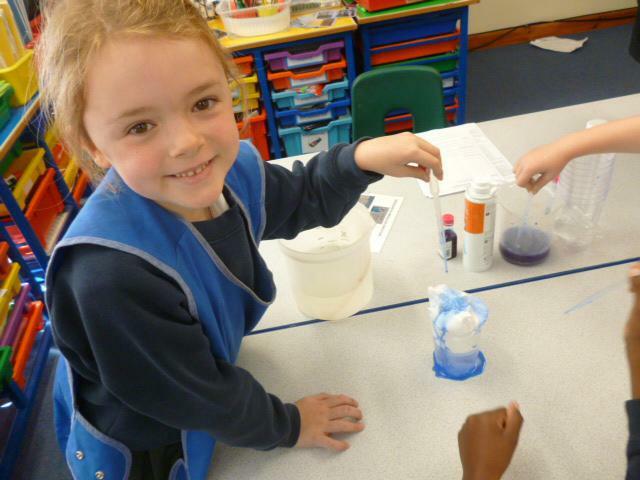 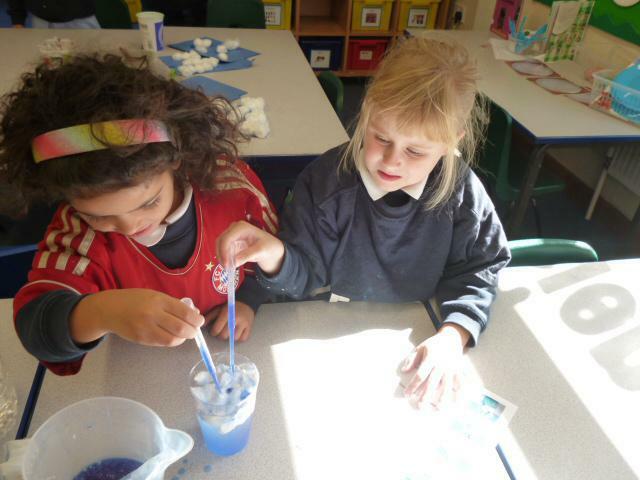 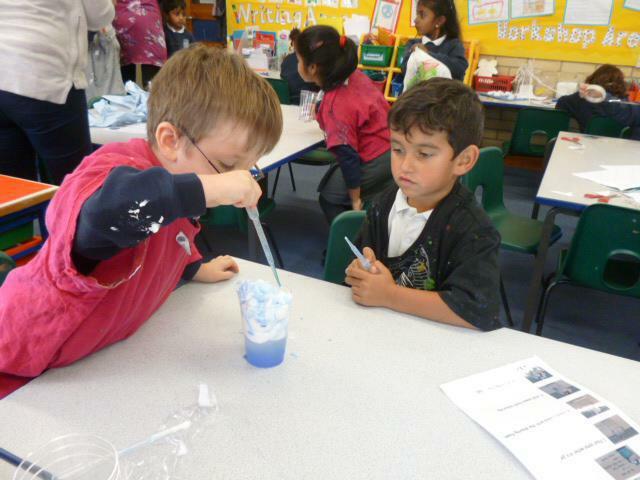 We made clouds using shaving foam and then dropped water on to them to see what would happen. 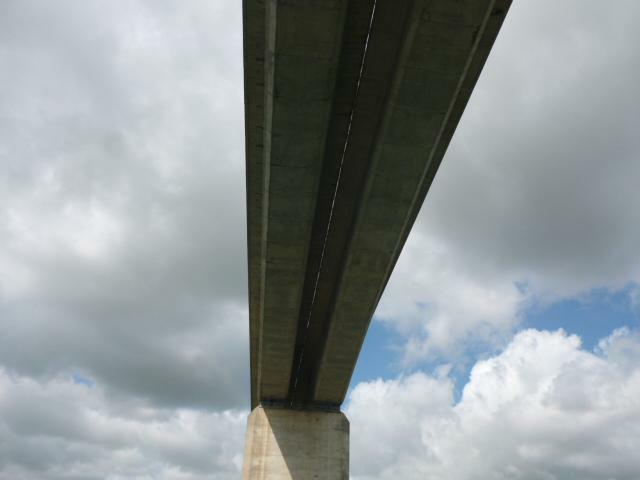 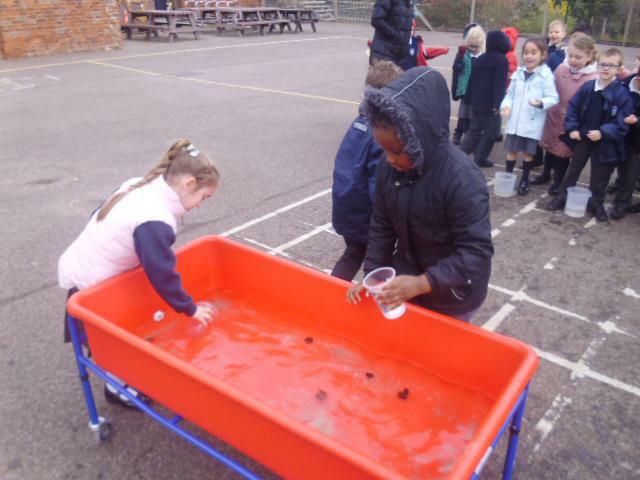 When clouds get too heavy with water it fall as rain. 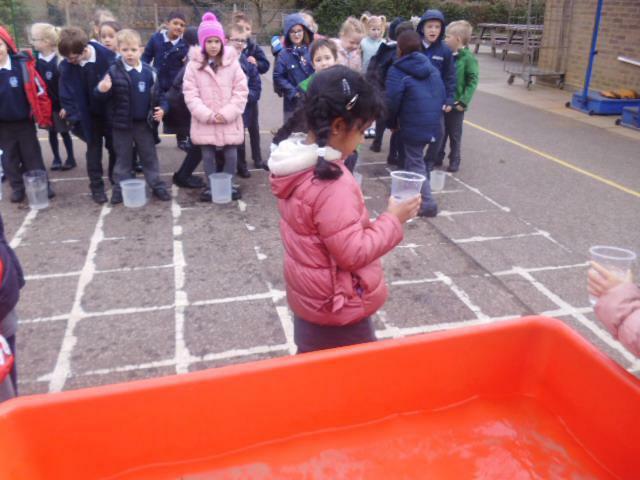 The water came through our clouds too like rain. 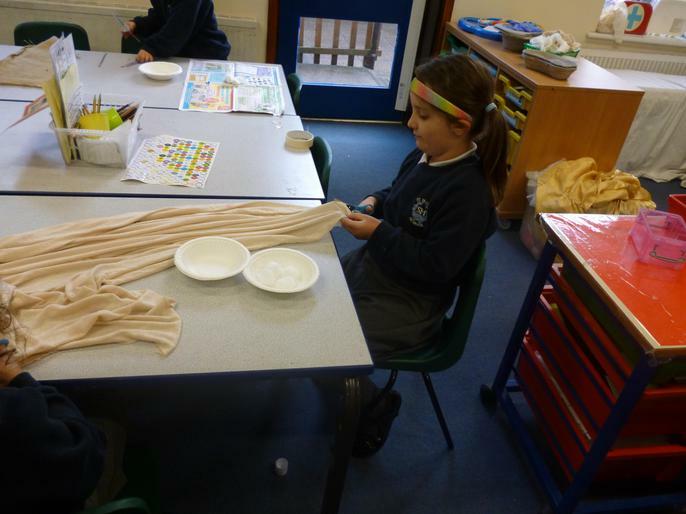 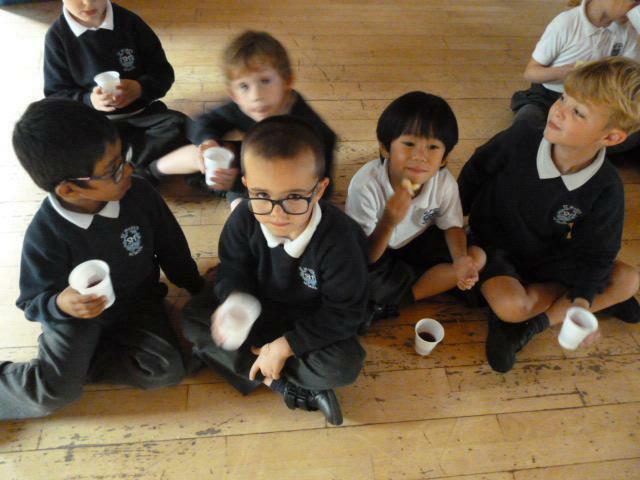 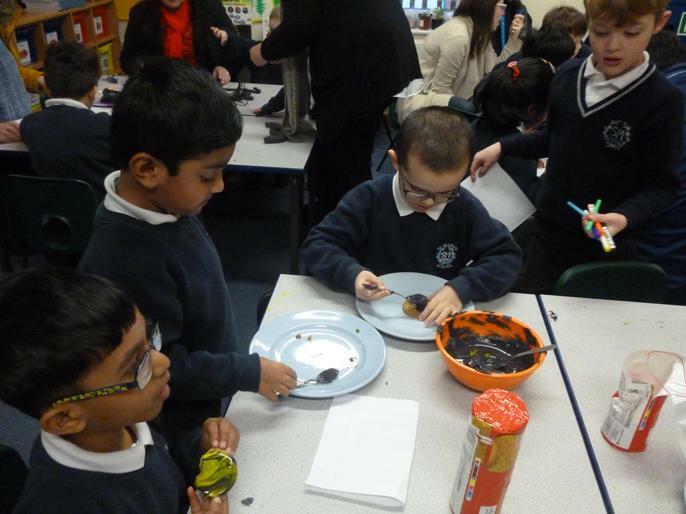 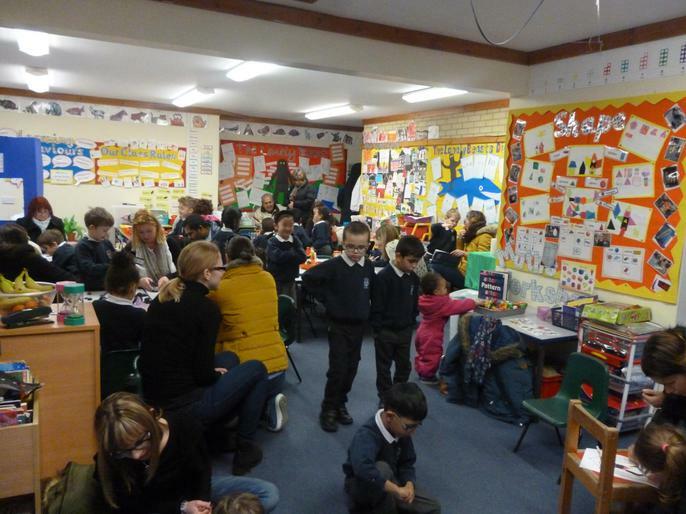 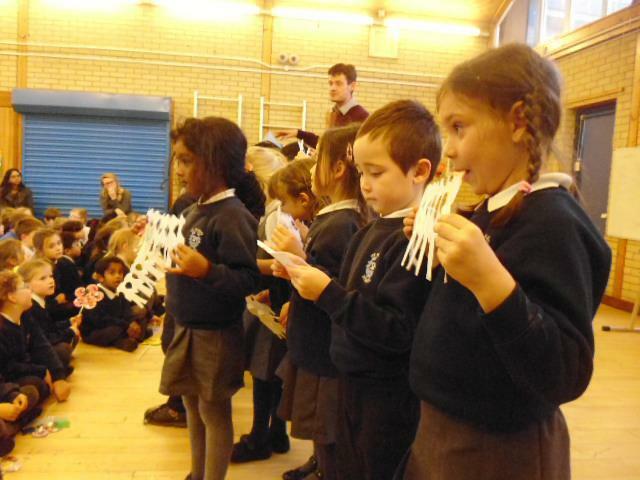 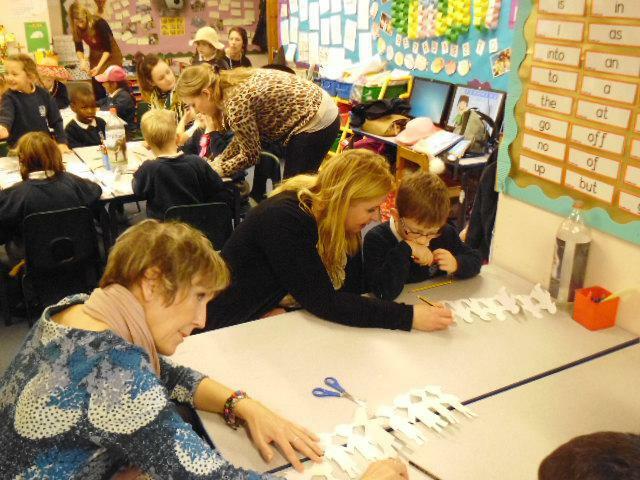 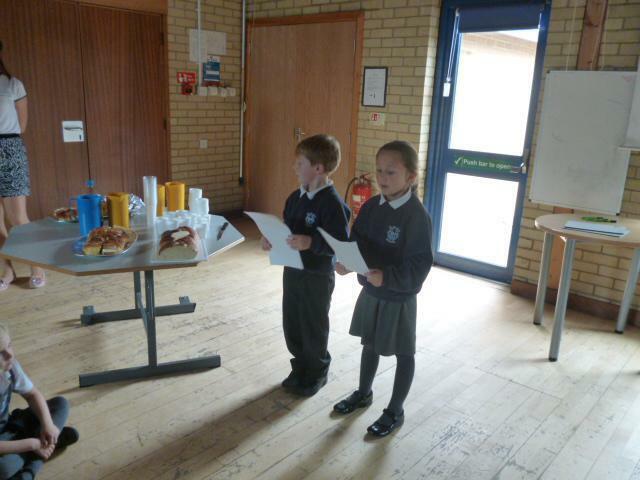 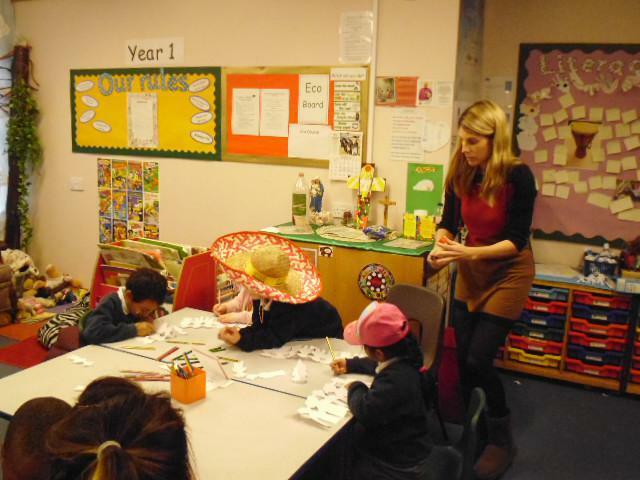 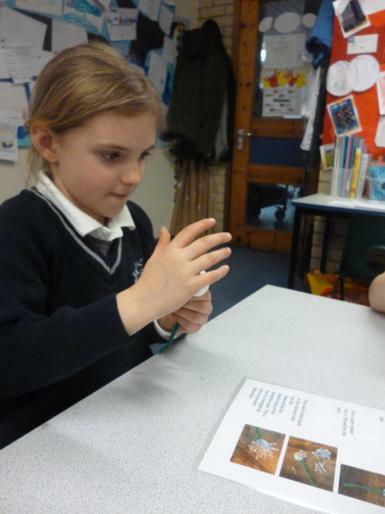 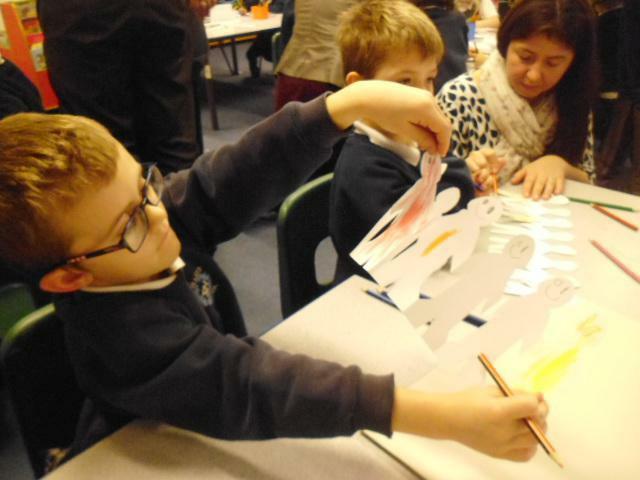 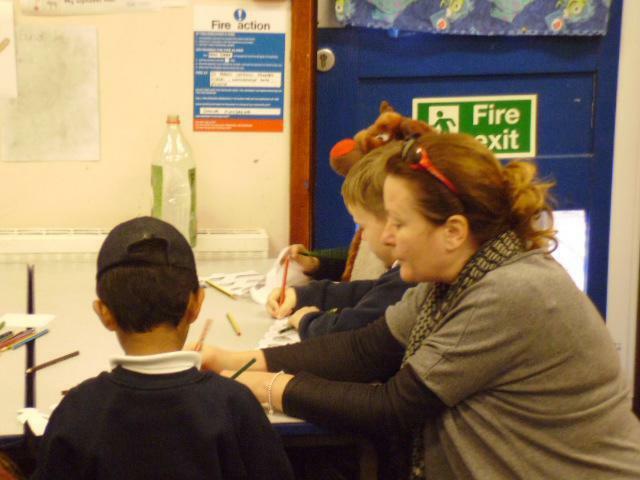 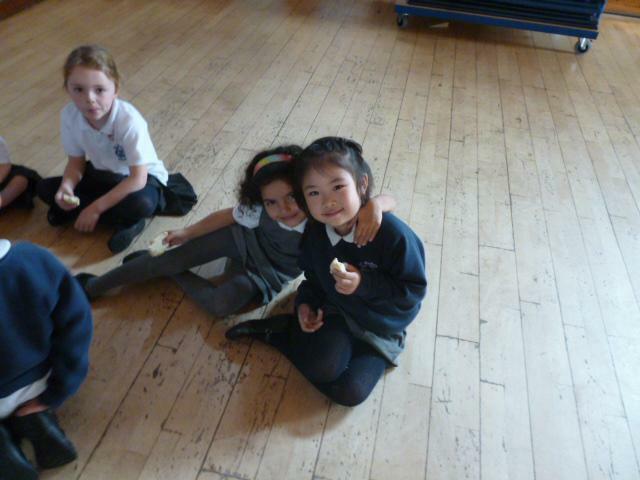 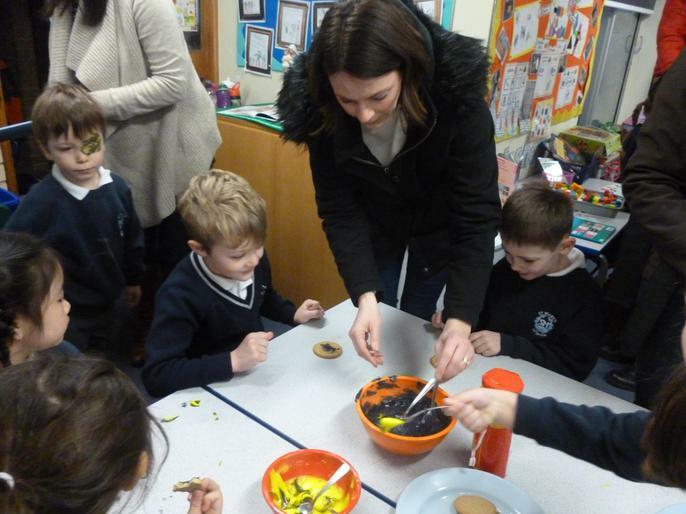 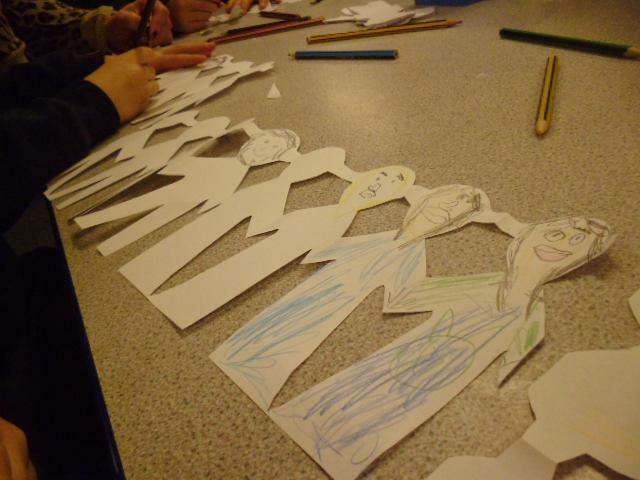 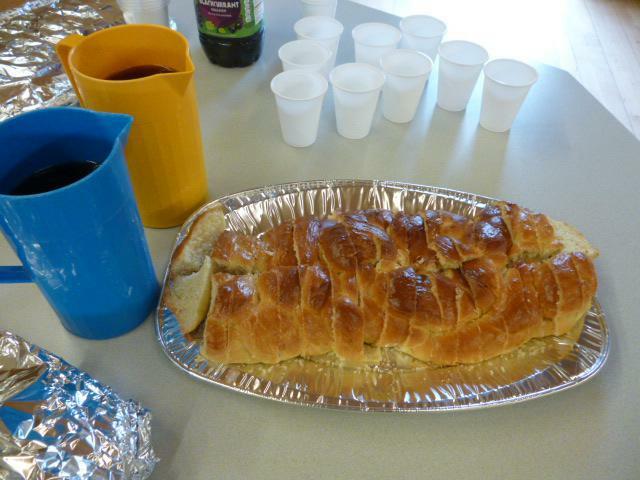 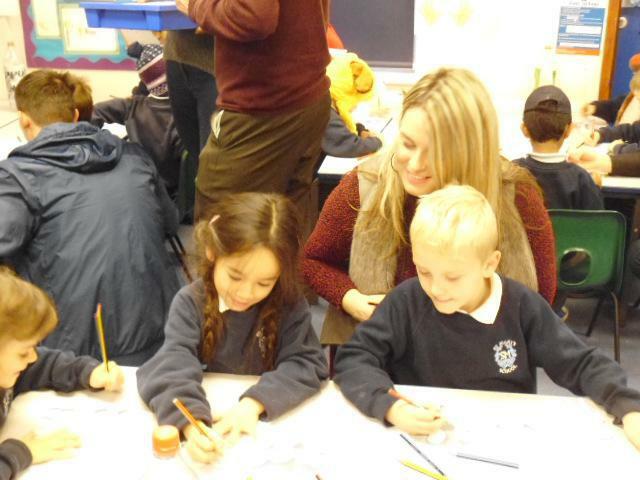 Our Jewish Party - As part of Judaism fortnight we held a special Shabbat party. 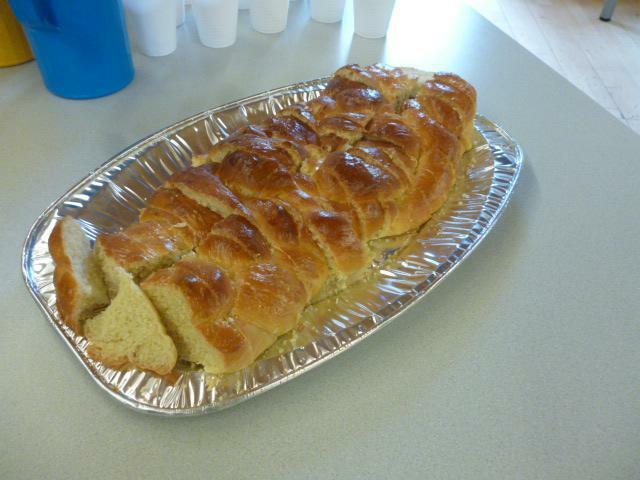 WE had Challah bread and juice and did some Jewish dancing. 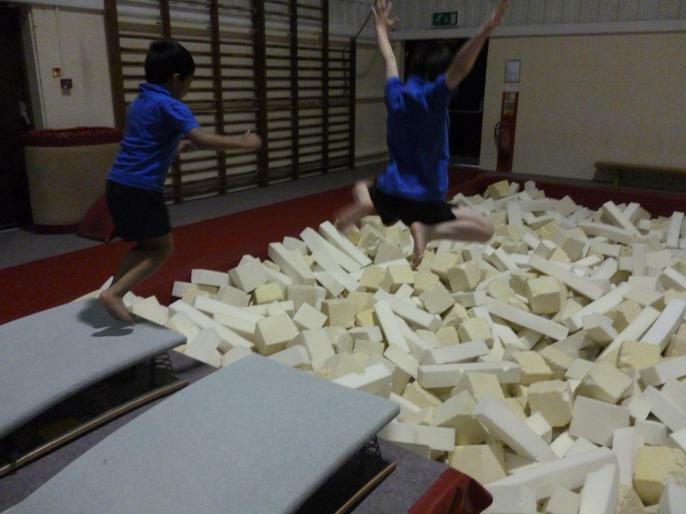 It was great fun! 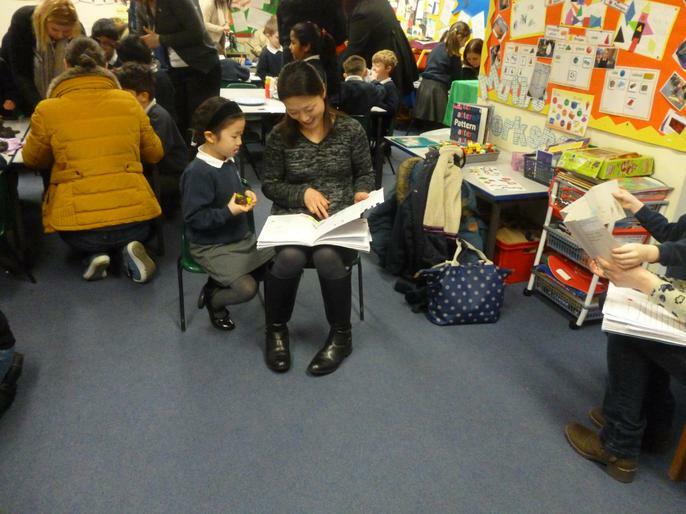 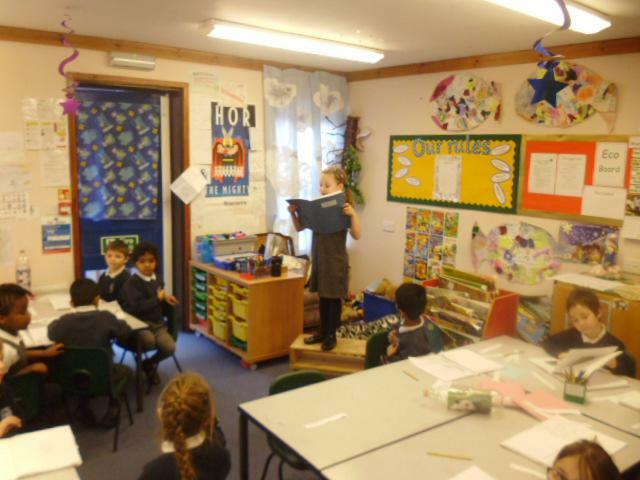 Stories with Year 5. 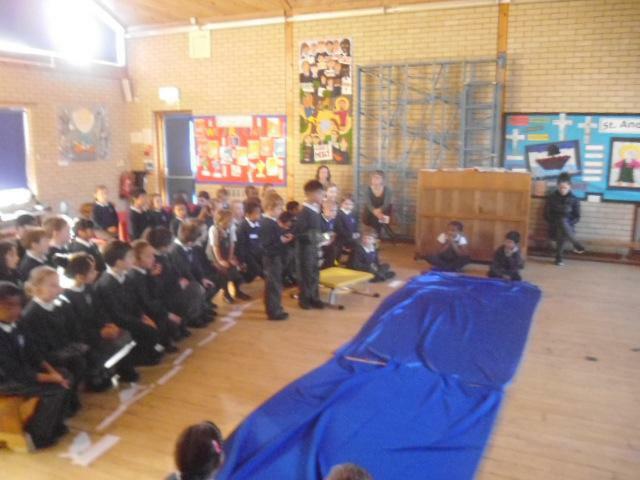 This afternoon Year 5 came in to read us their stories about how God created the world. 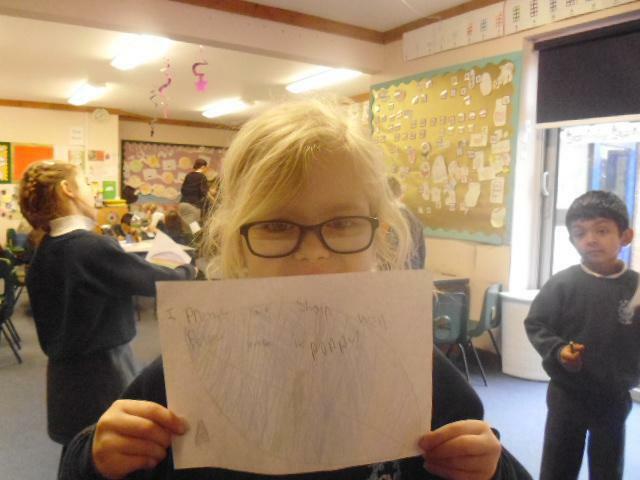 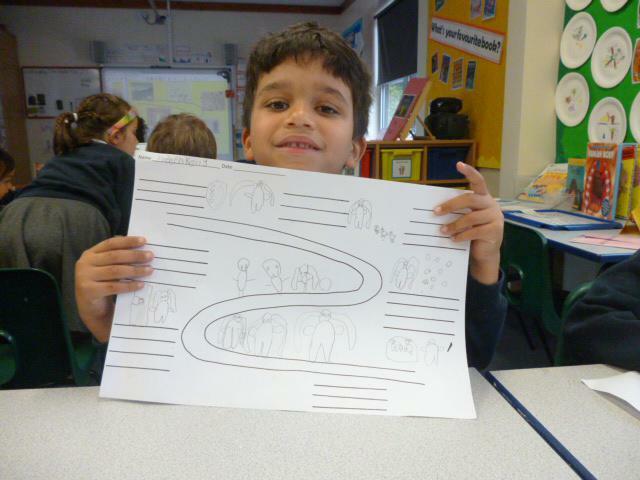 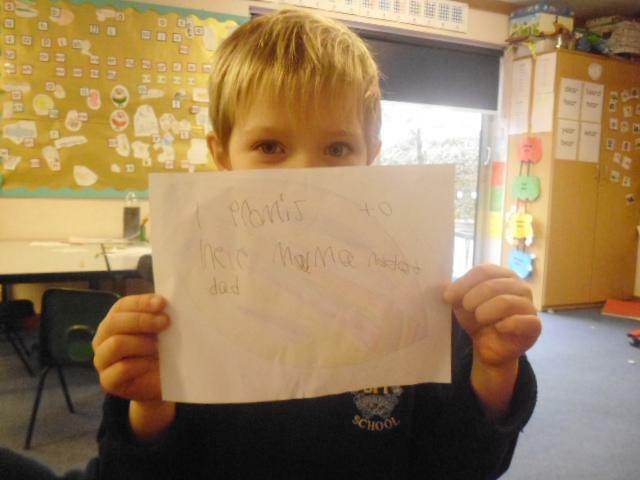 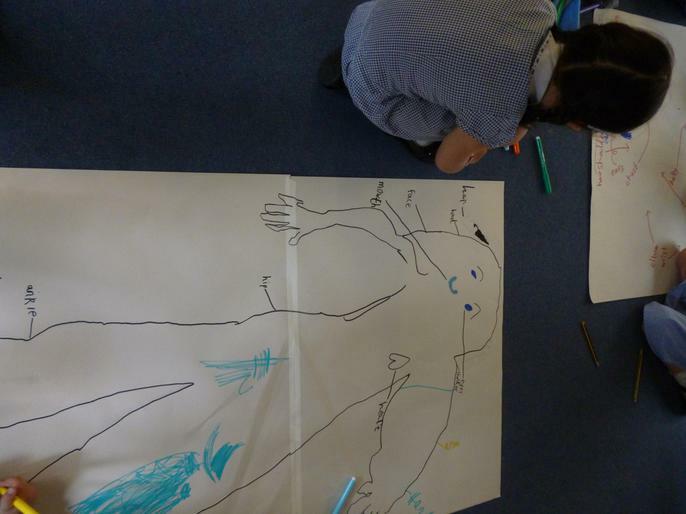 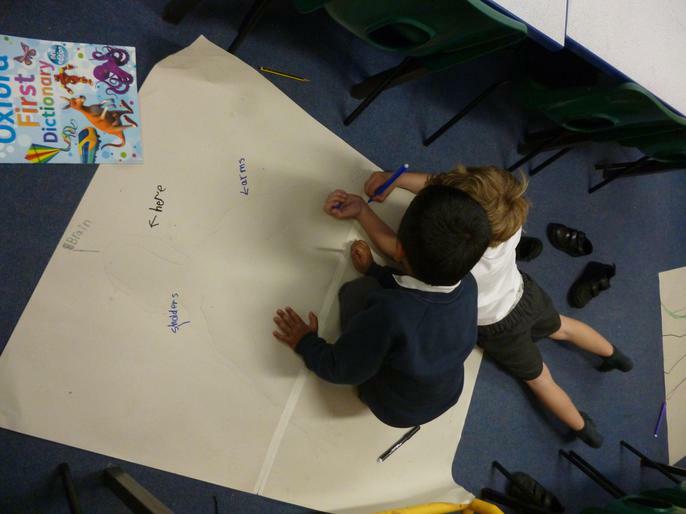 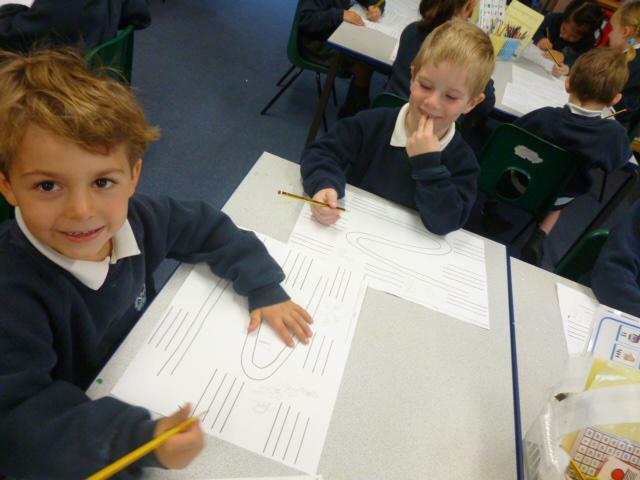 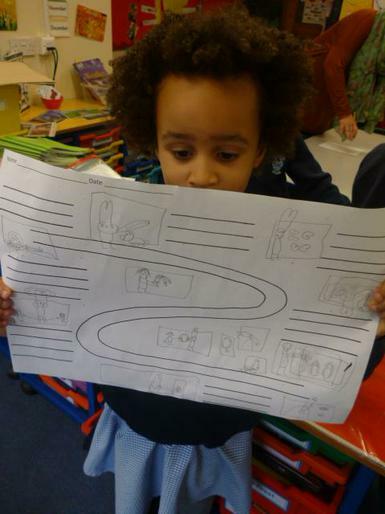 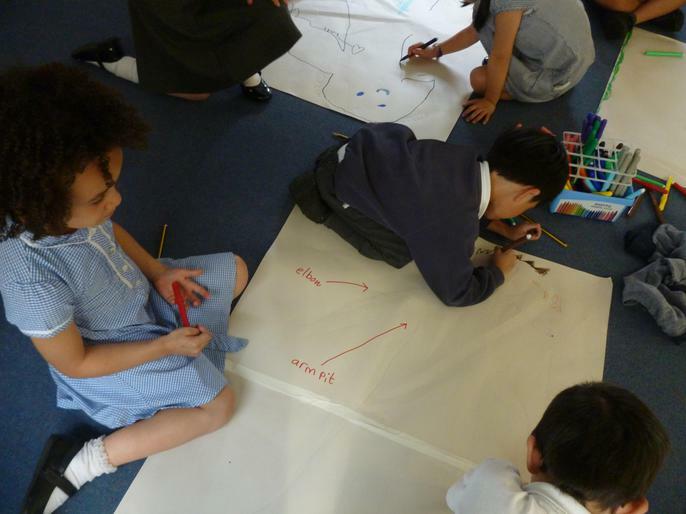 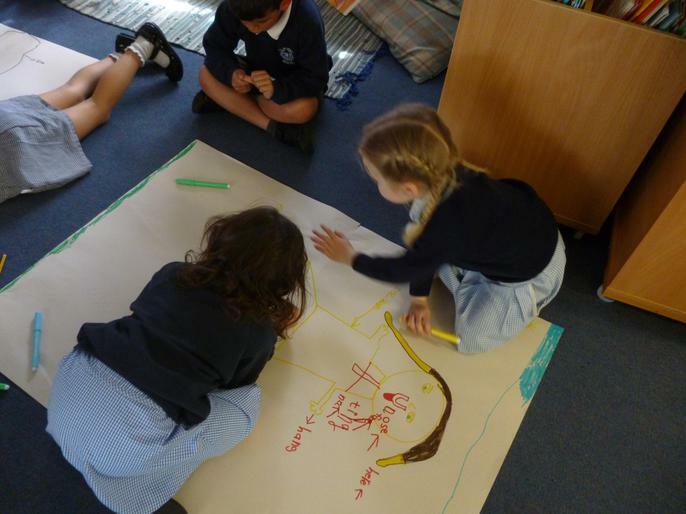 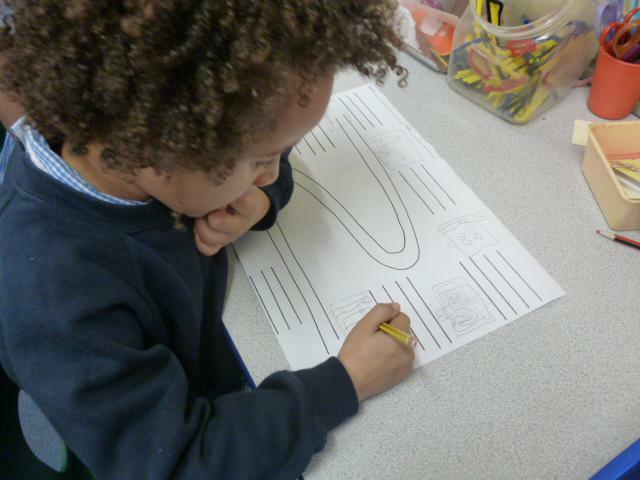 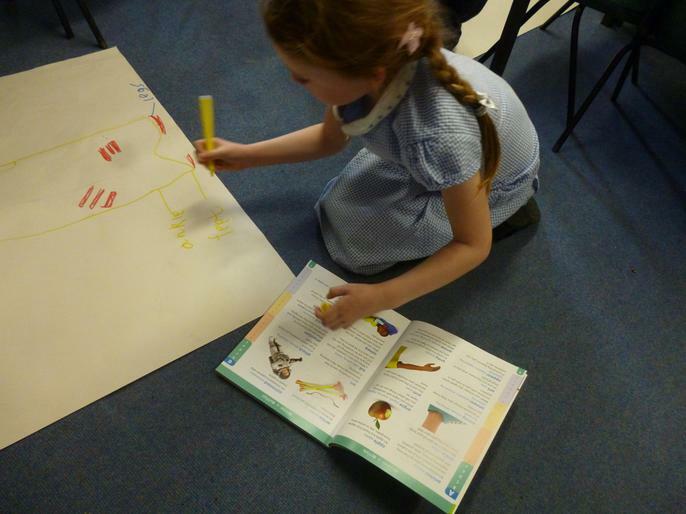 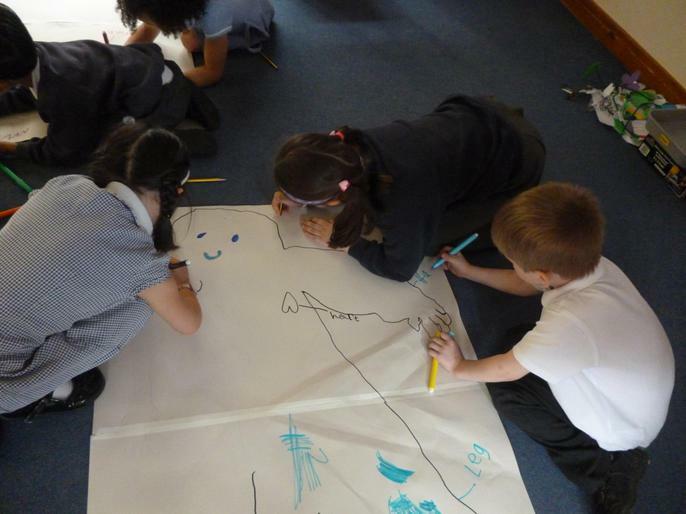 Story Maps - Today we drew story maps of Beegu's story. 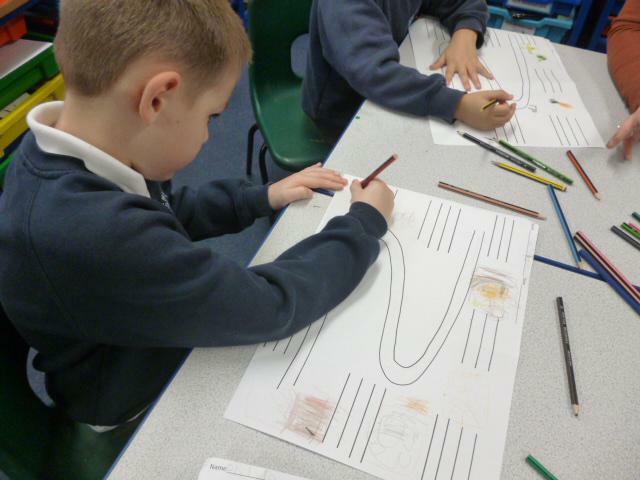 We thought about the main events and then drew them in seqeunce. 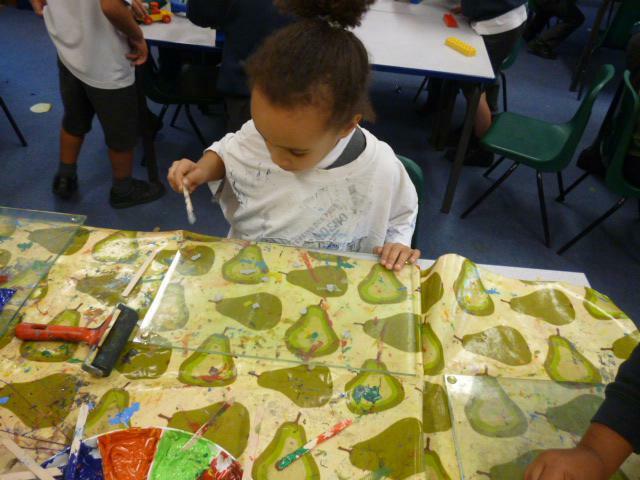 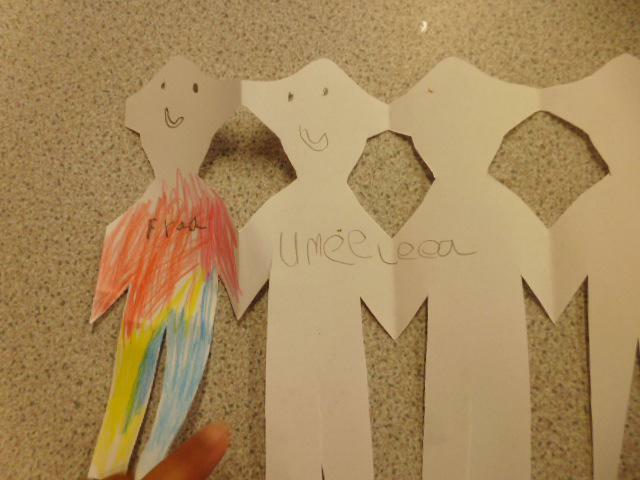 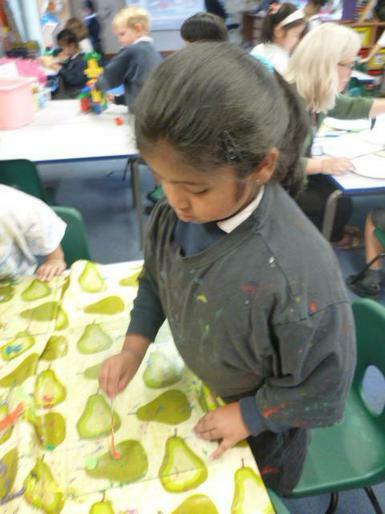 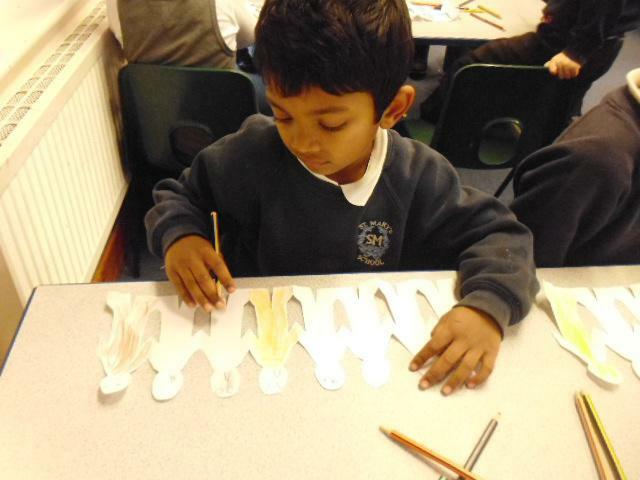 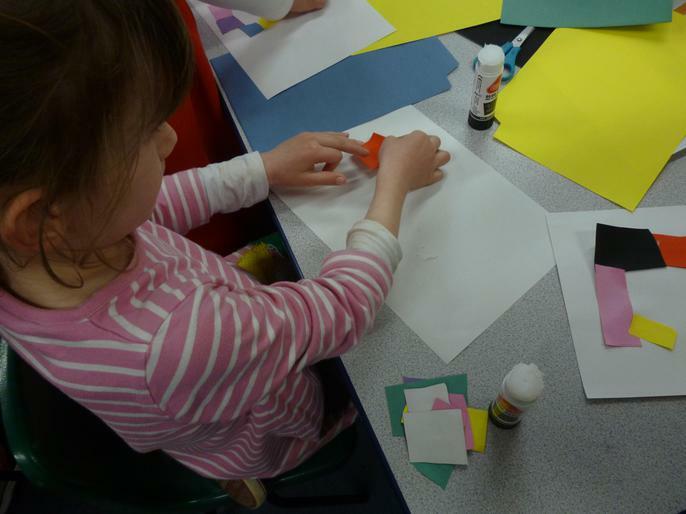 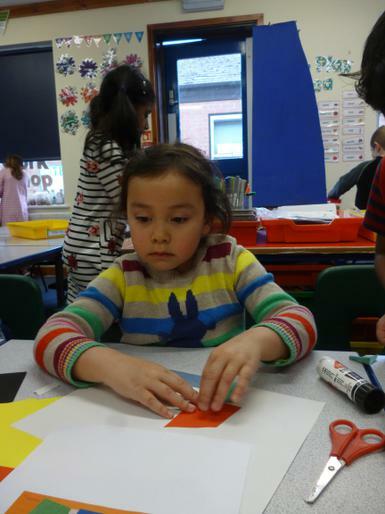 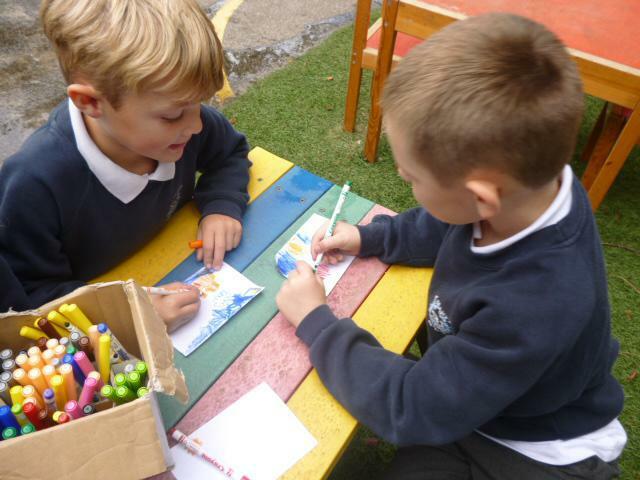 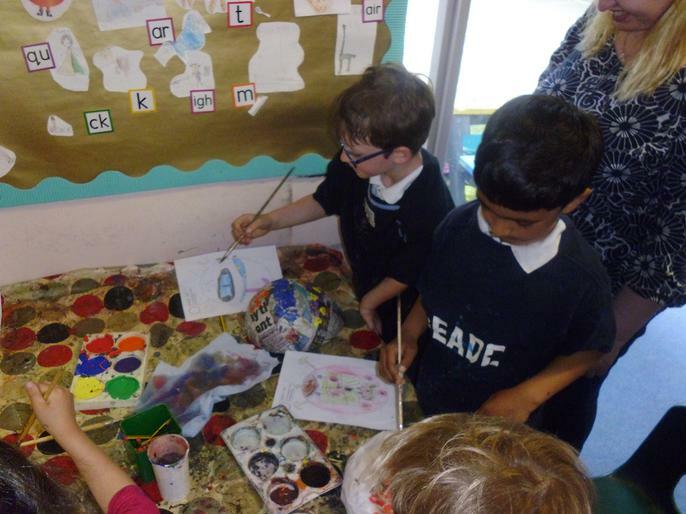 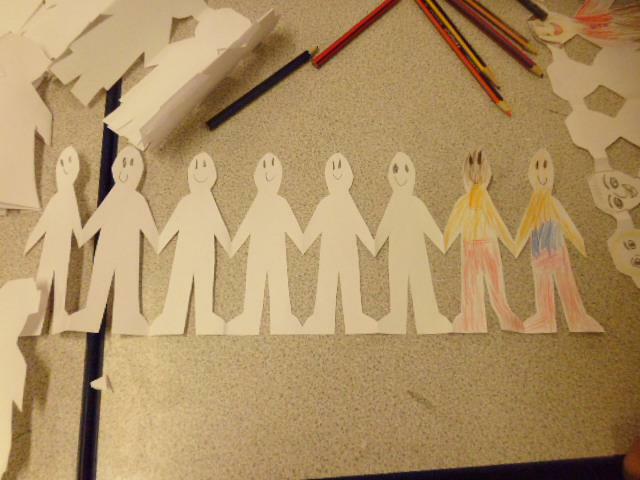 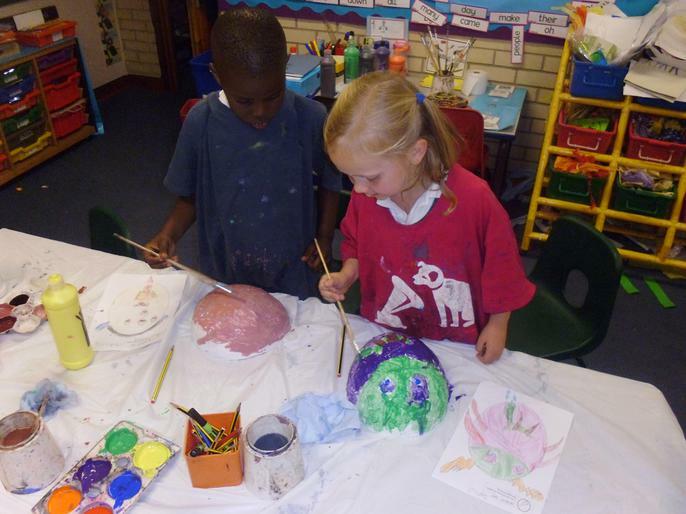 Beegu's Friends - Today we painted out beautiful models of friends we had made for Beegu. 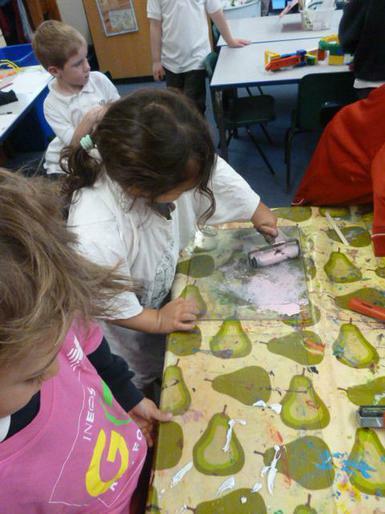 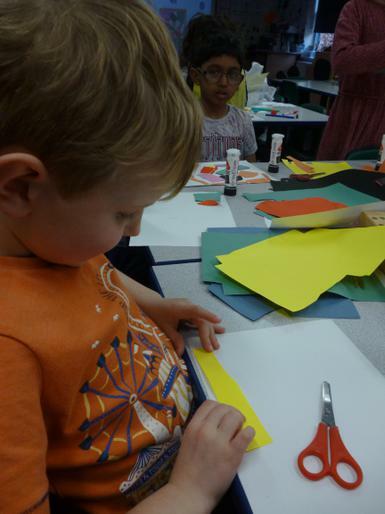 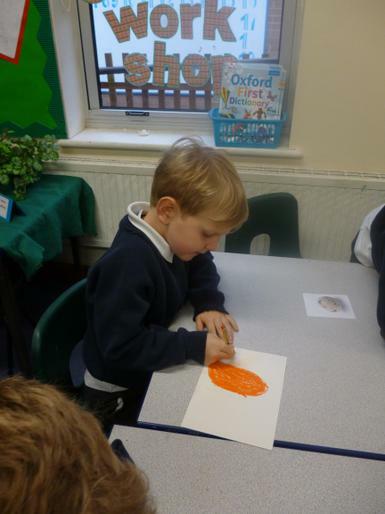 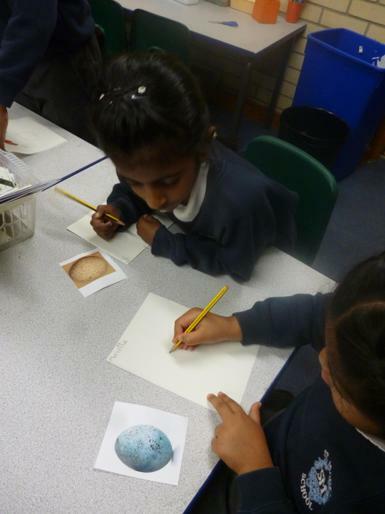 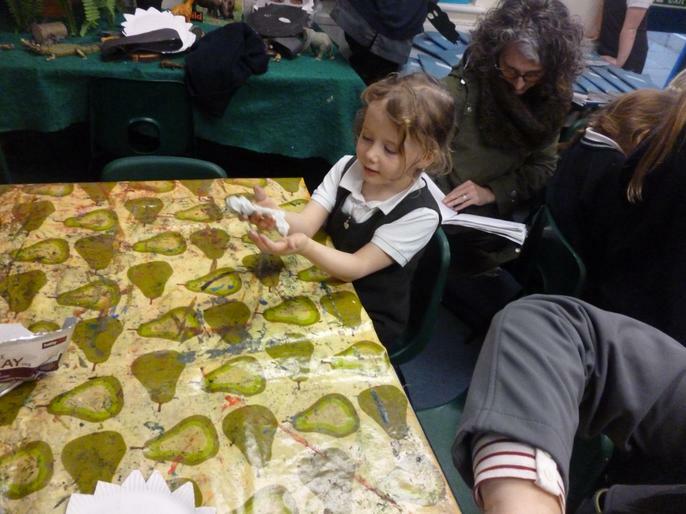 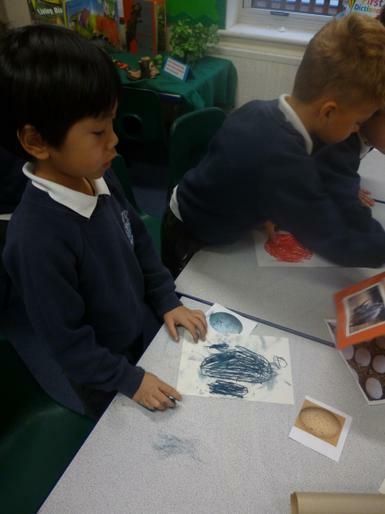 Weather Prints - Today we used the printing blocks to create weather pictures. 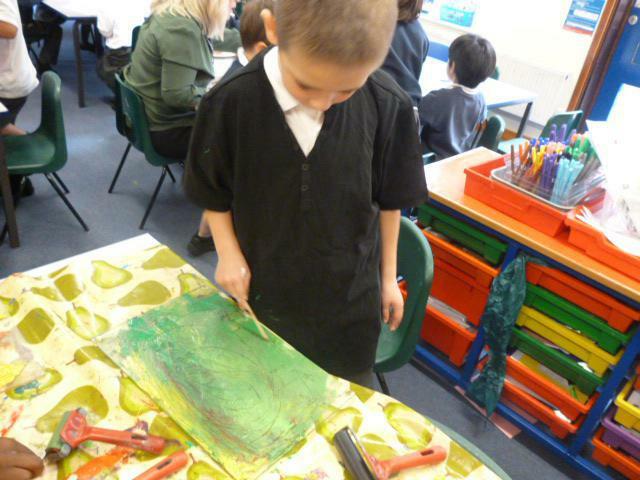 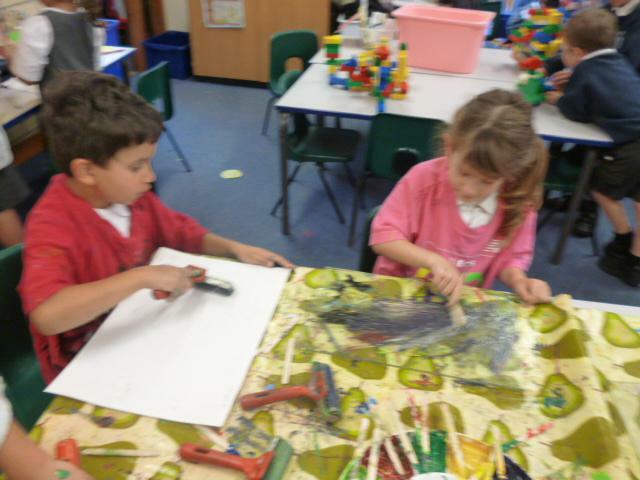 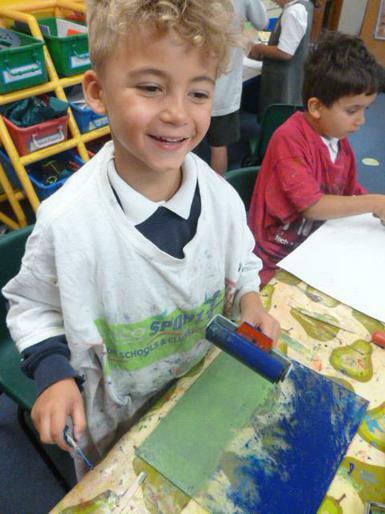 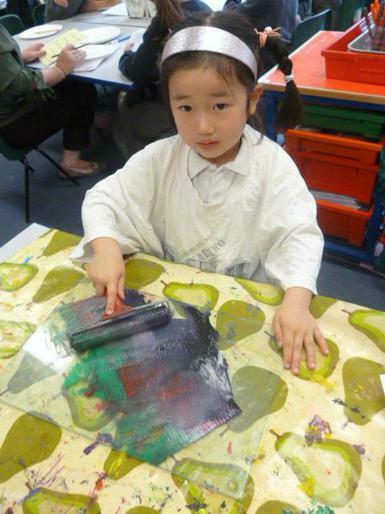 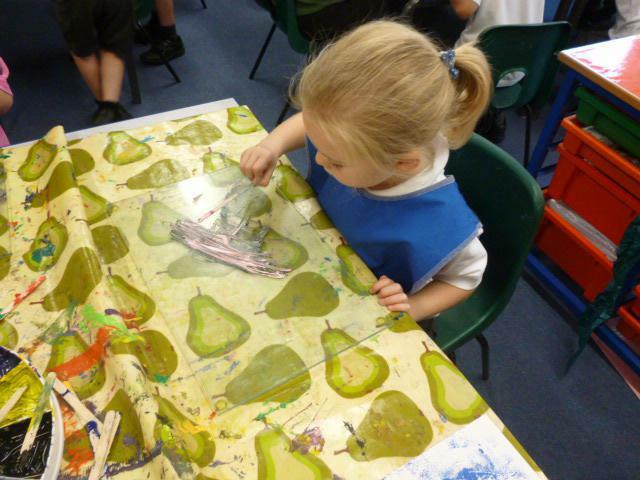 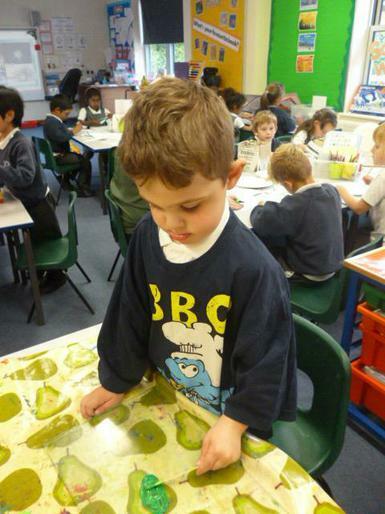 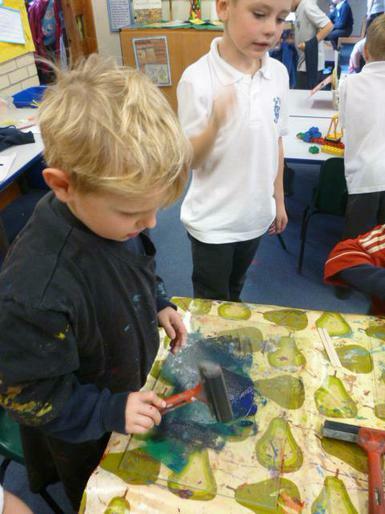 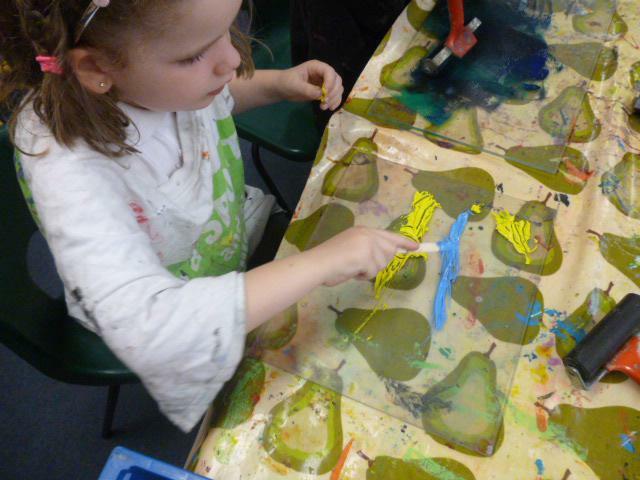 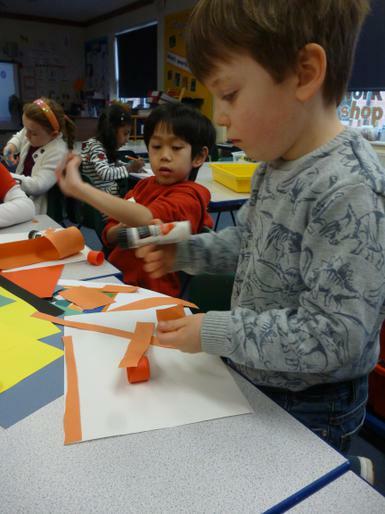 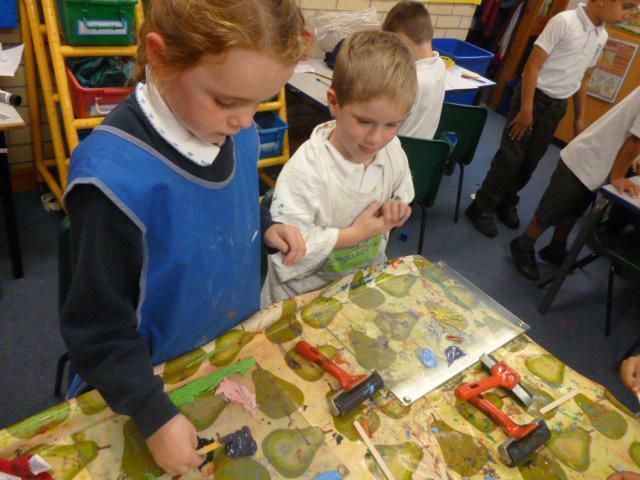 We chose our colours and then used the rollers to spread them on the printing blocks. 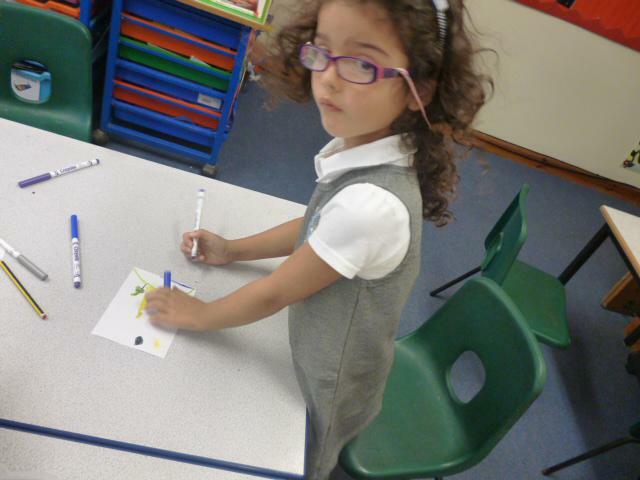 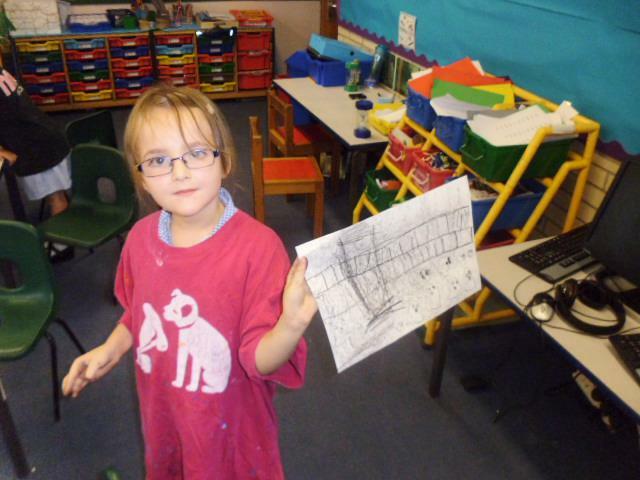 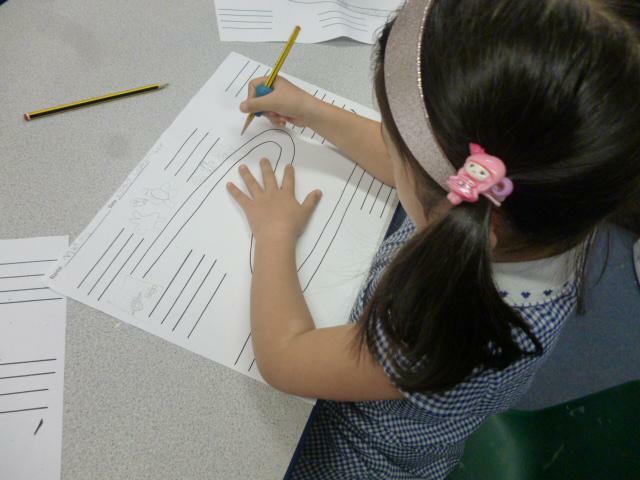 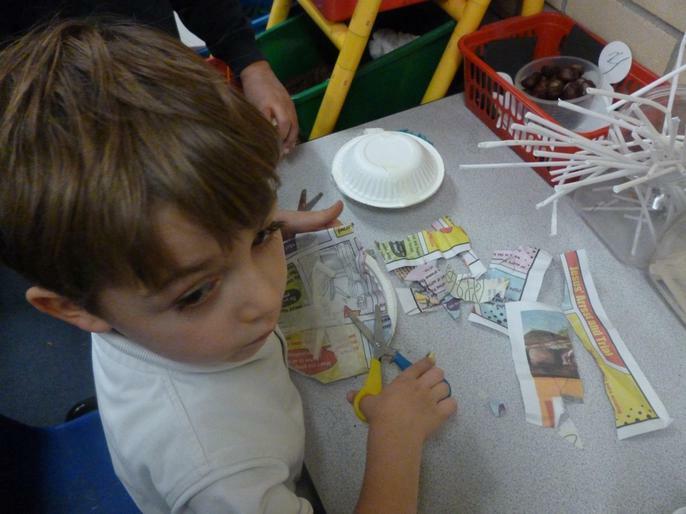 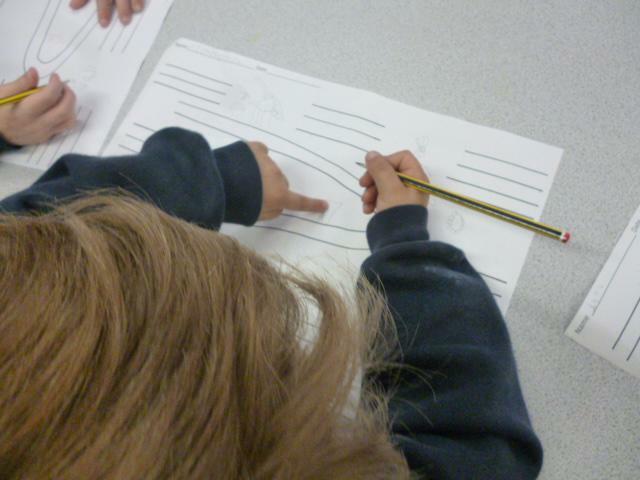 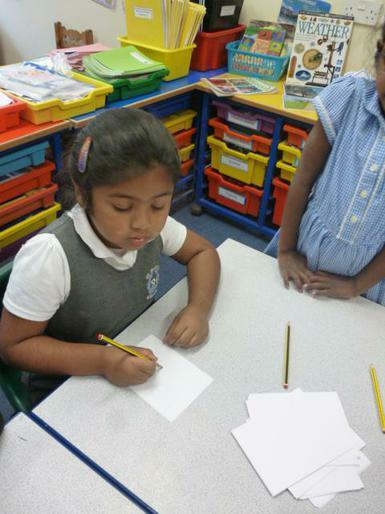 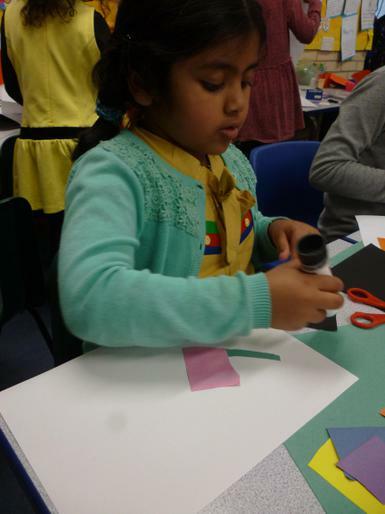 Then we used lollipop sticks to create our picture and then printed them on to paper. 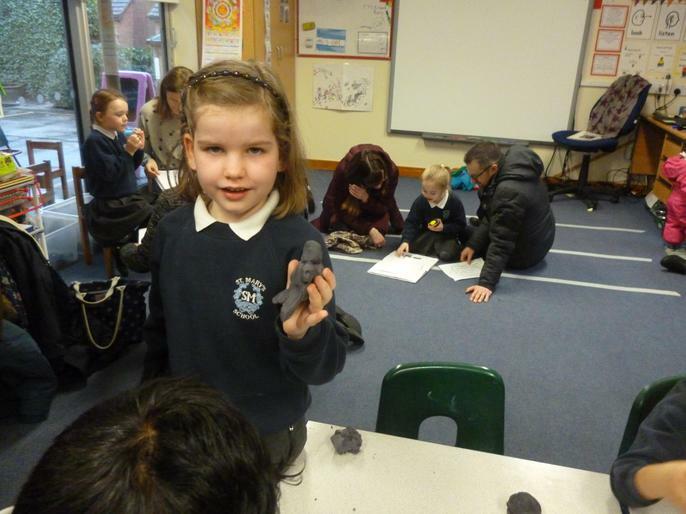 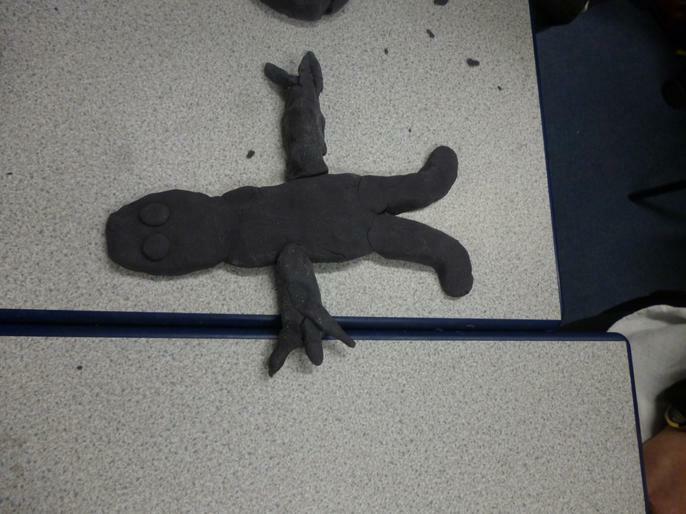 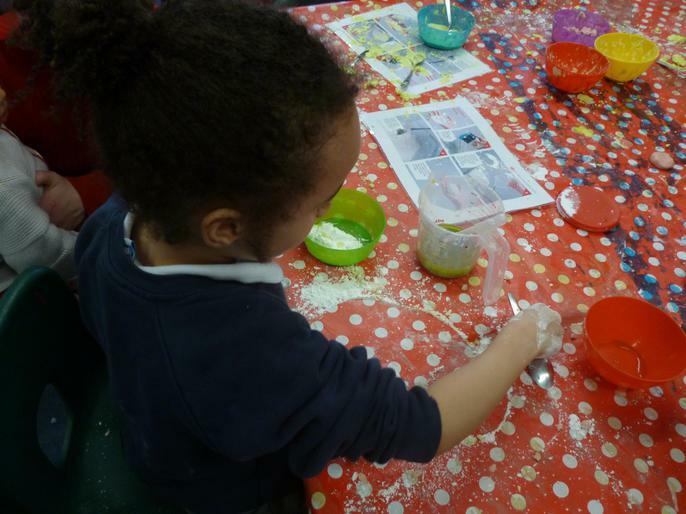 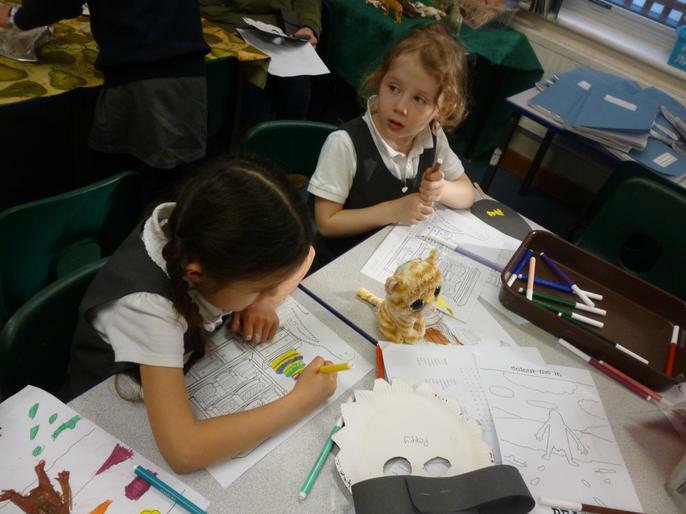 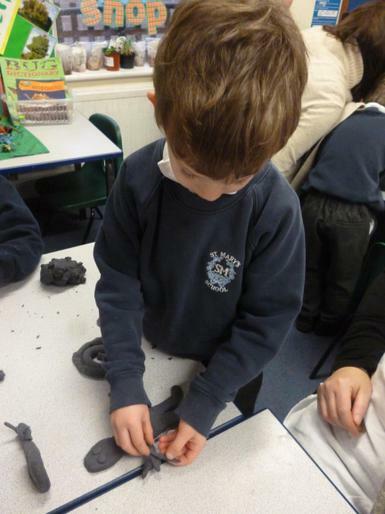 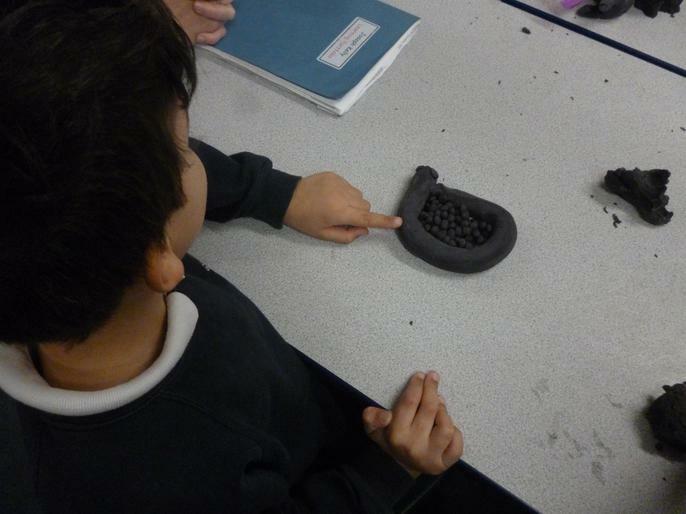 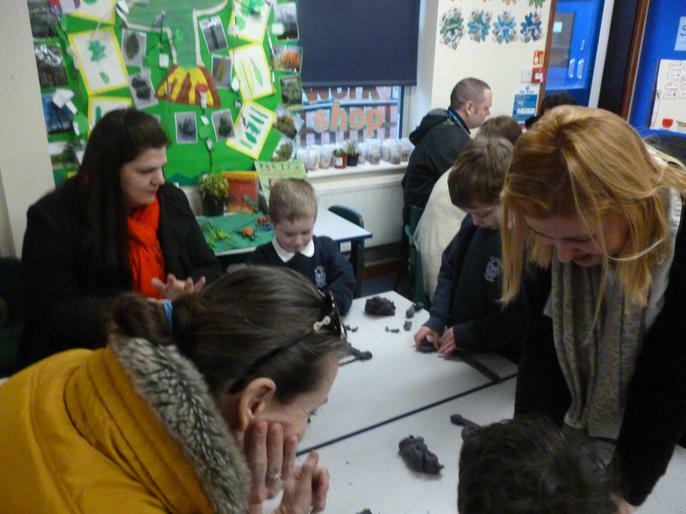 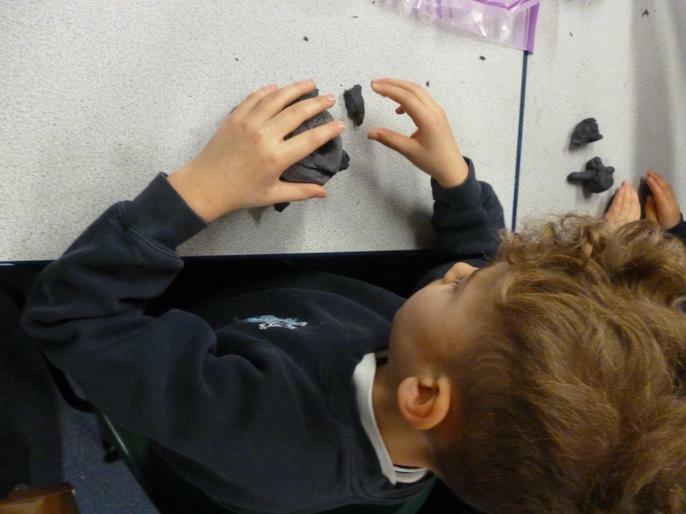 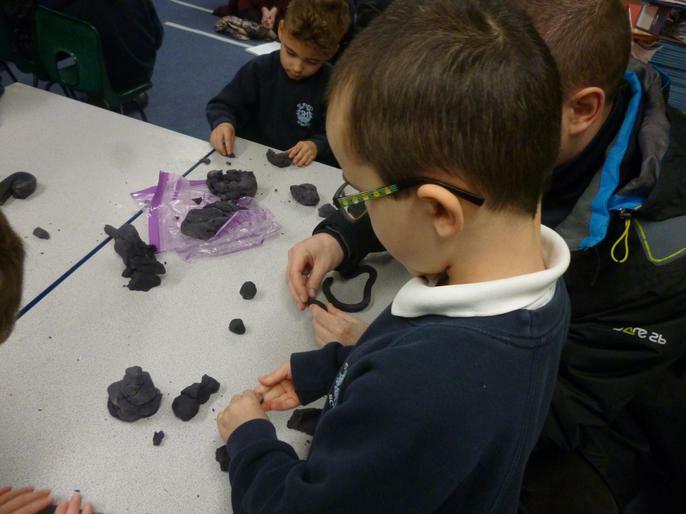 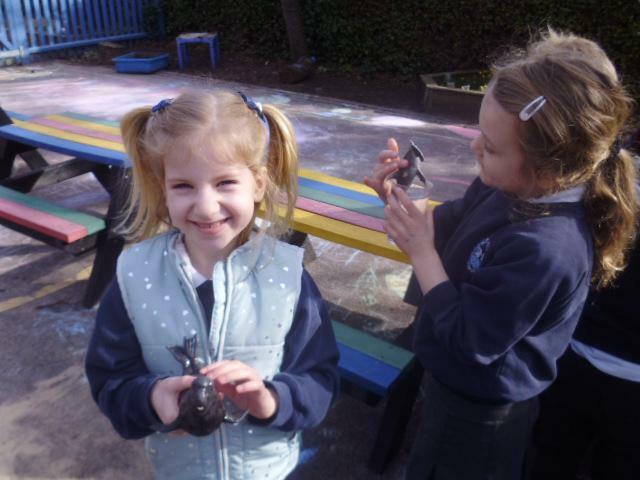 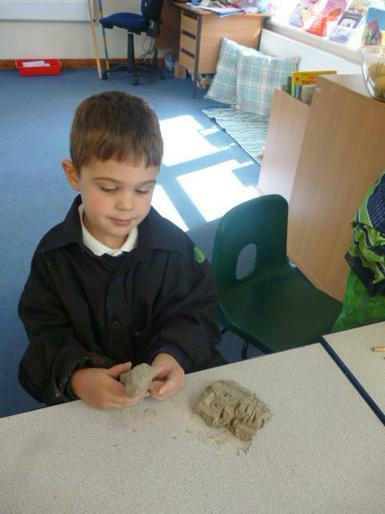 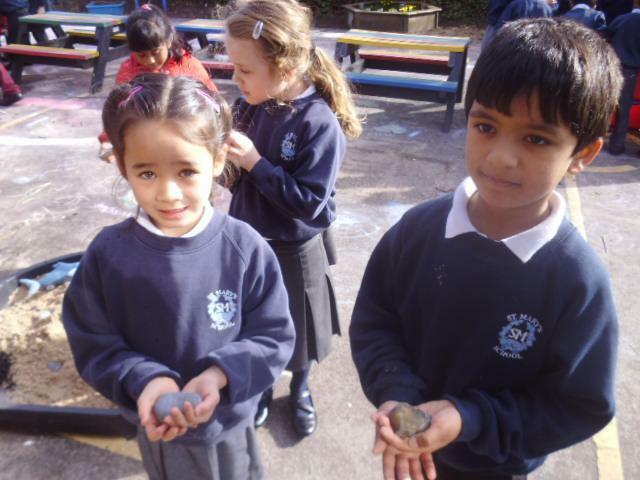 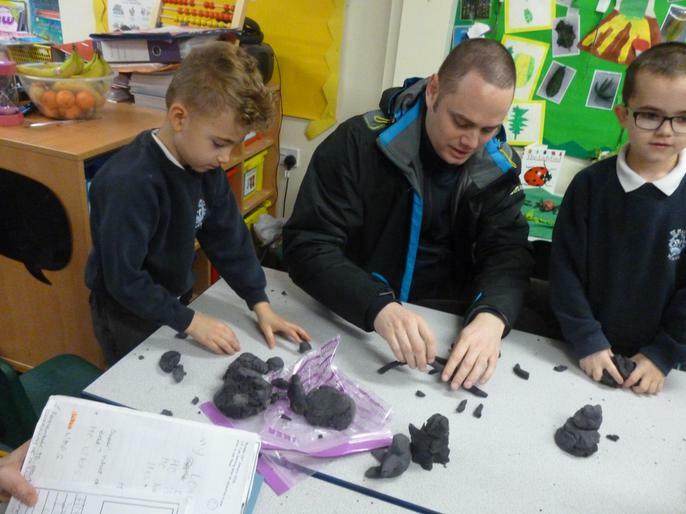 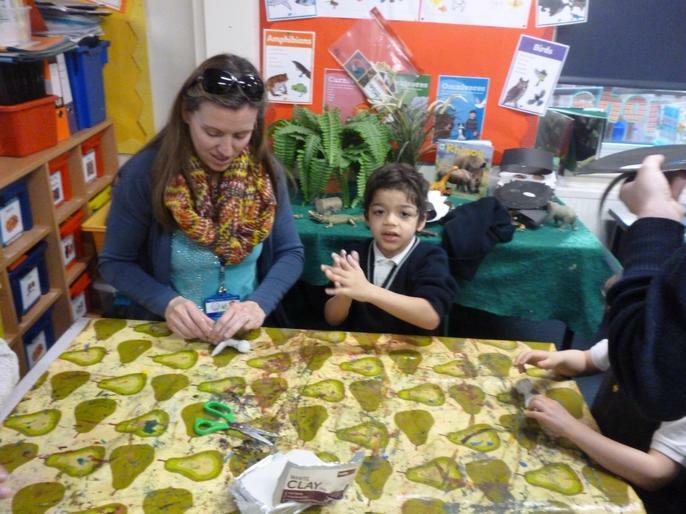 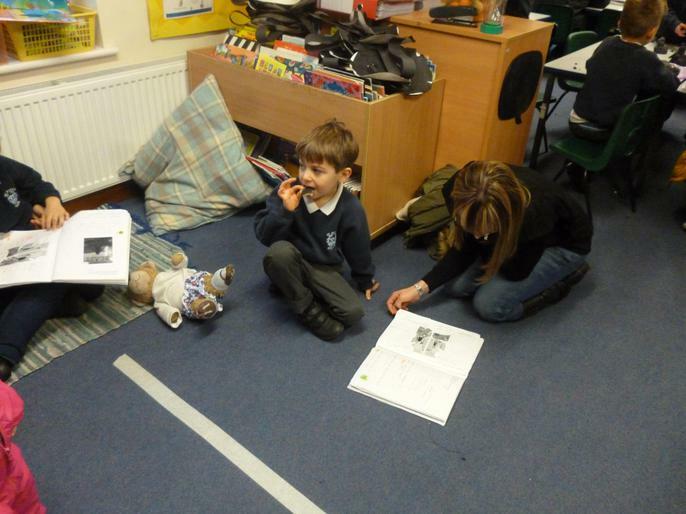 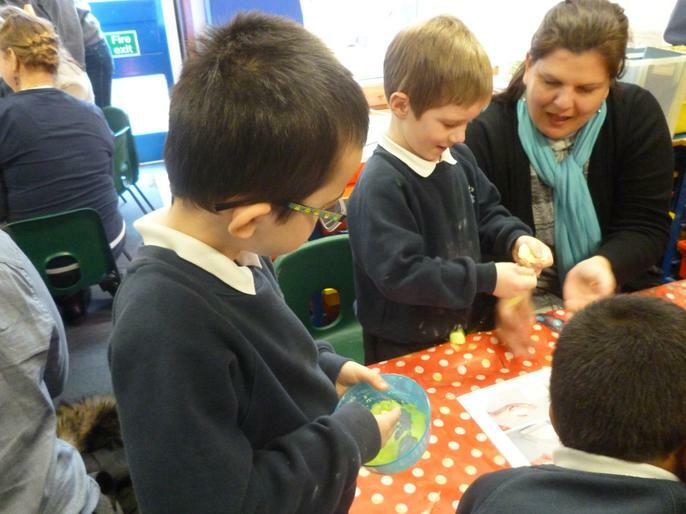 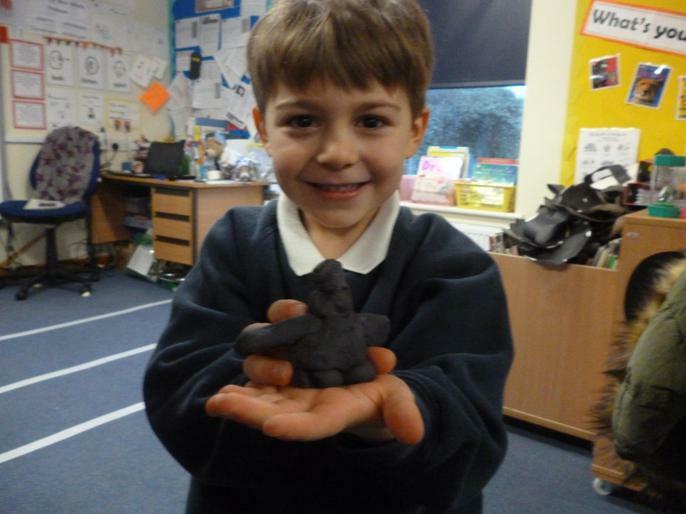 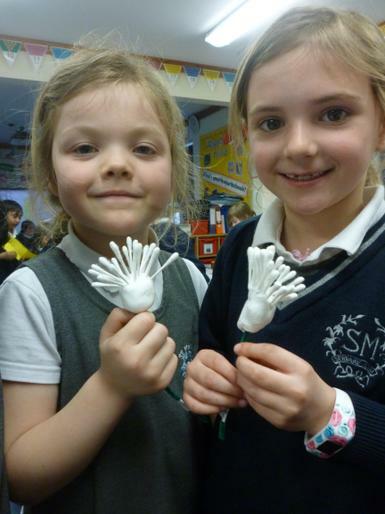 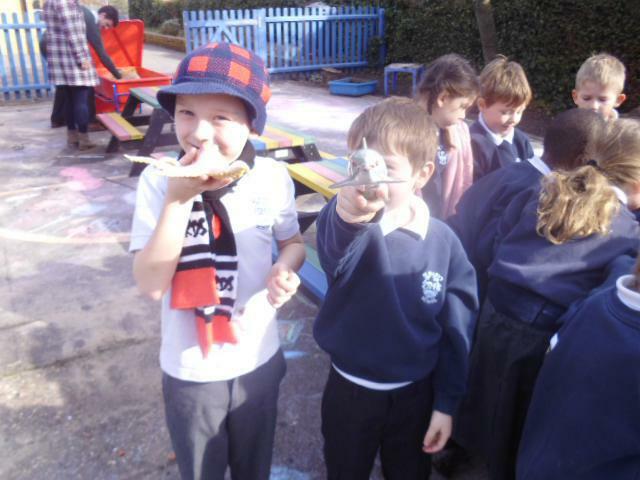 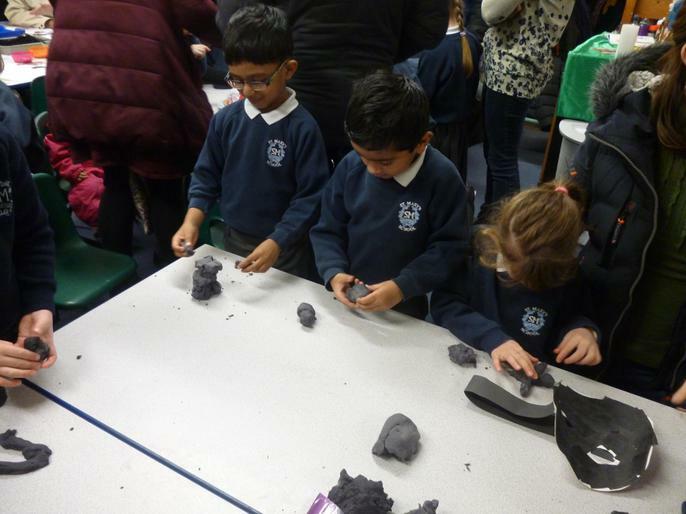 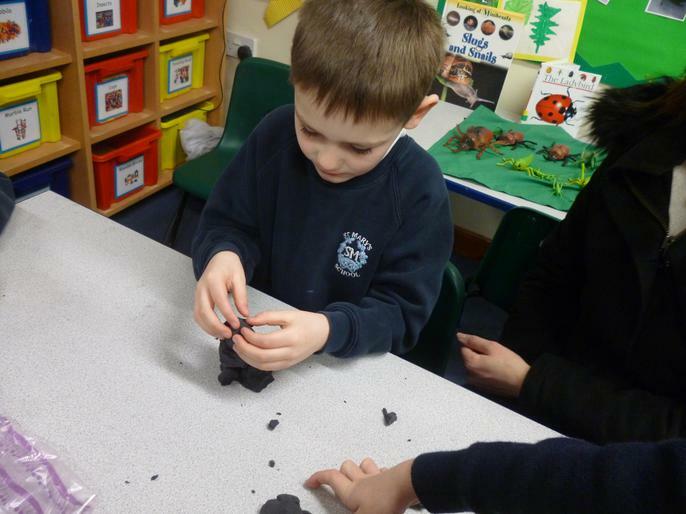 Beegu - Today in literacy we made friends for Beegu using clay. 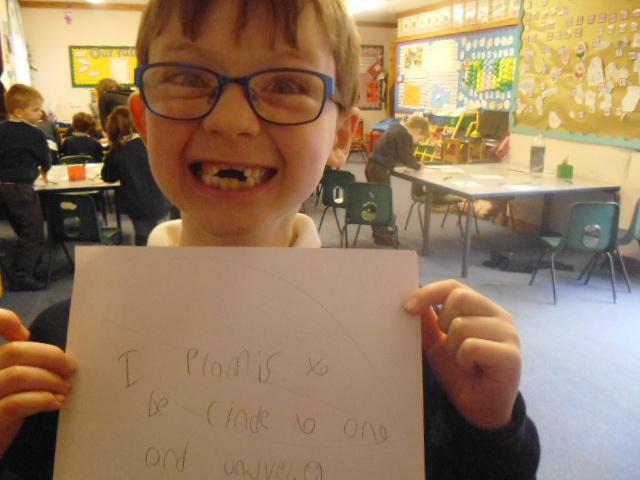 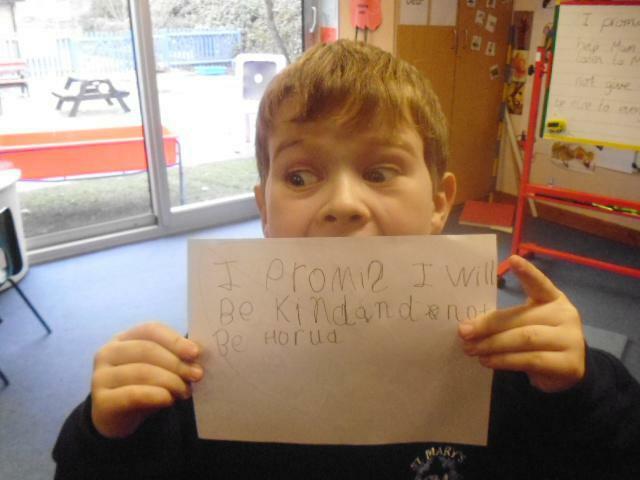 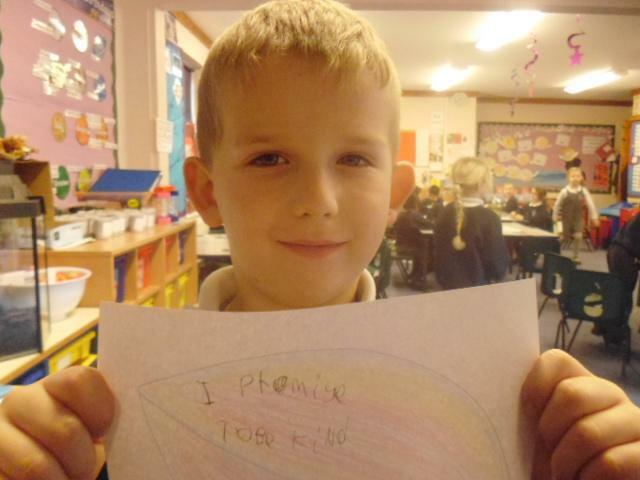 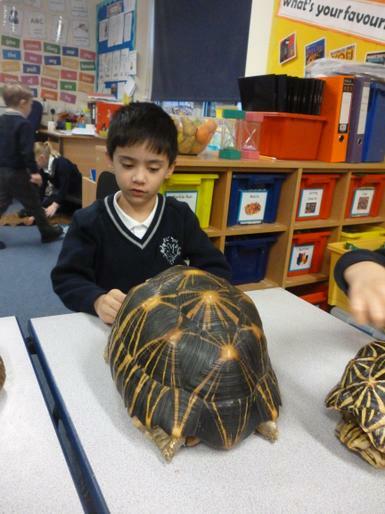 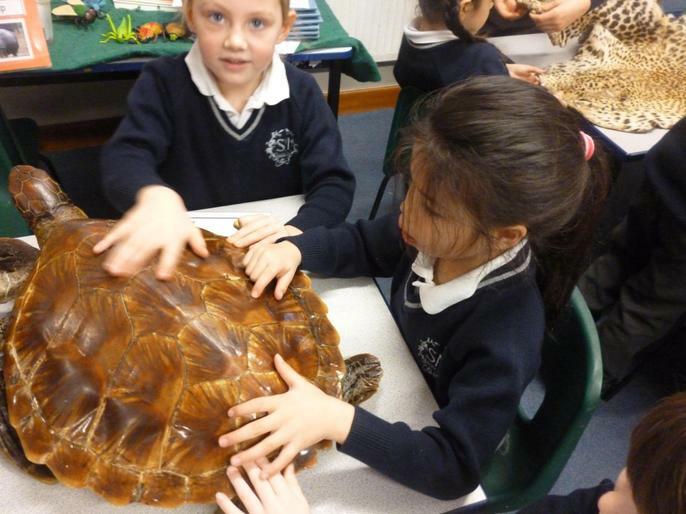 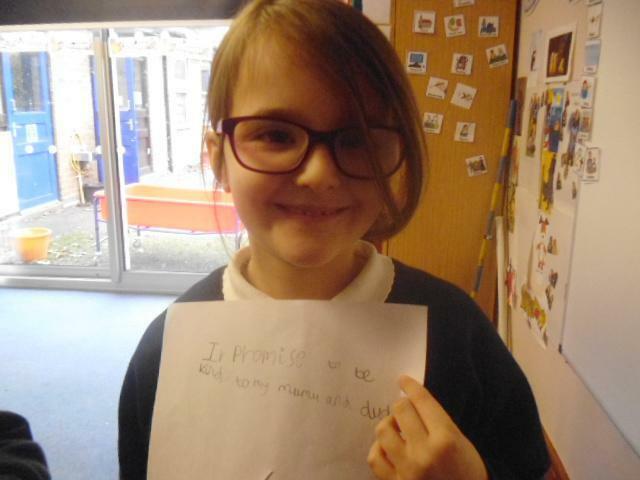 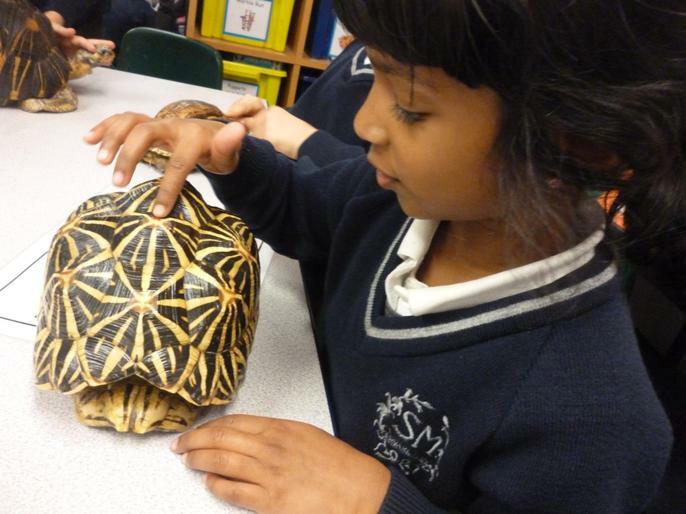 We thought about what would make a good friend. 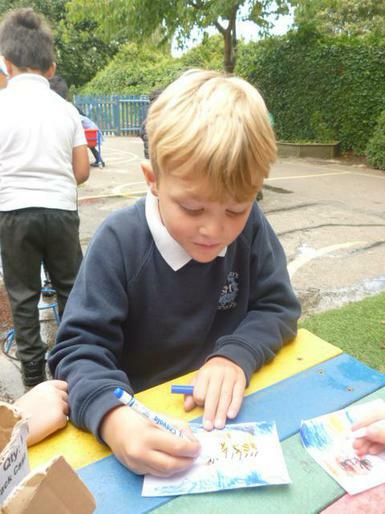 Busy Day! 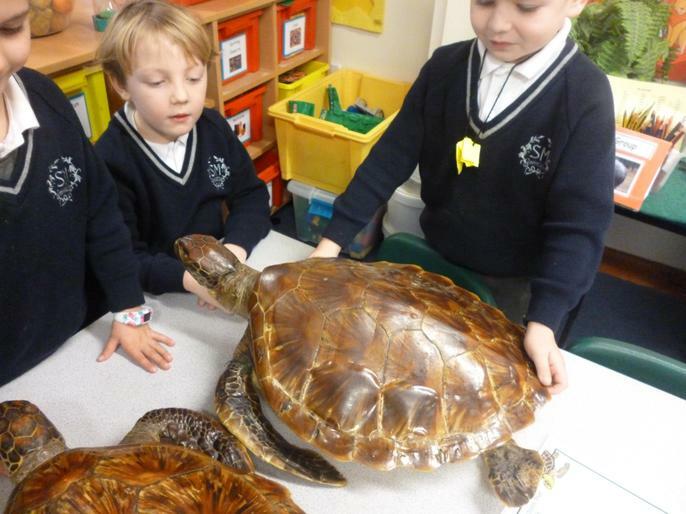 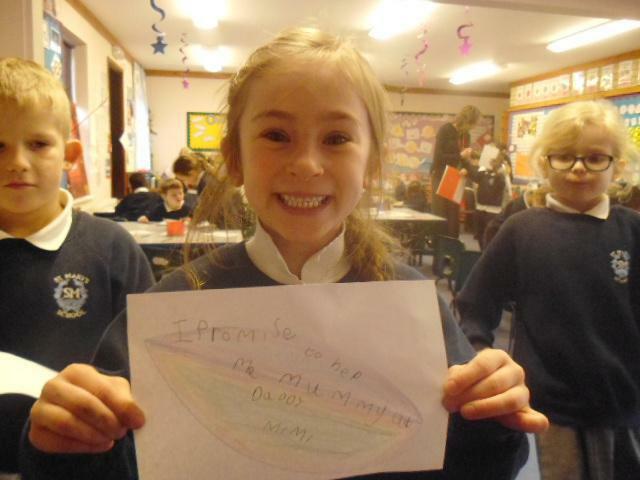 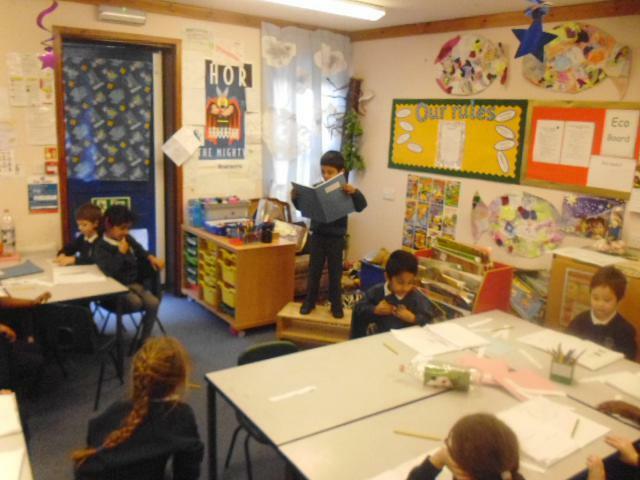 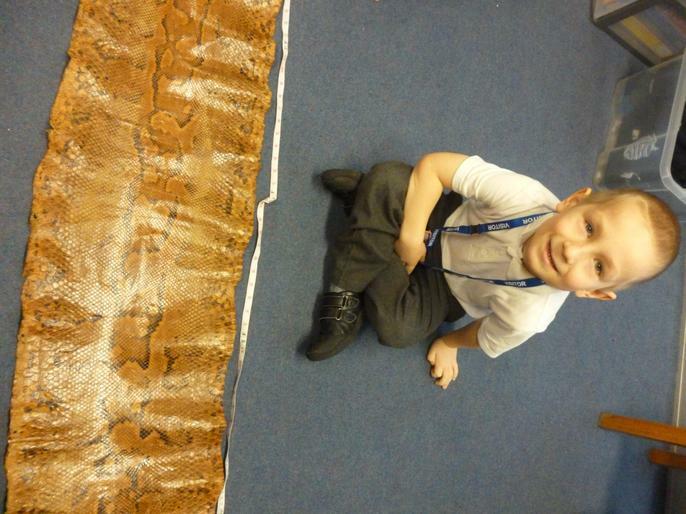 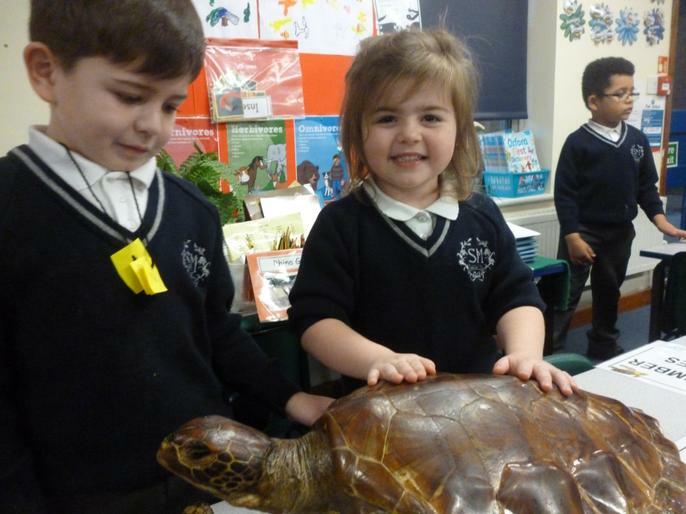 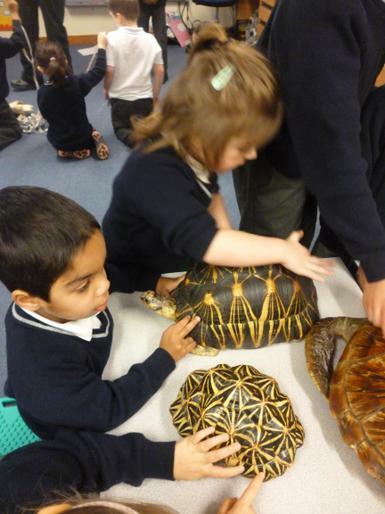 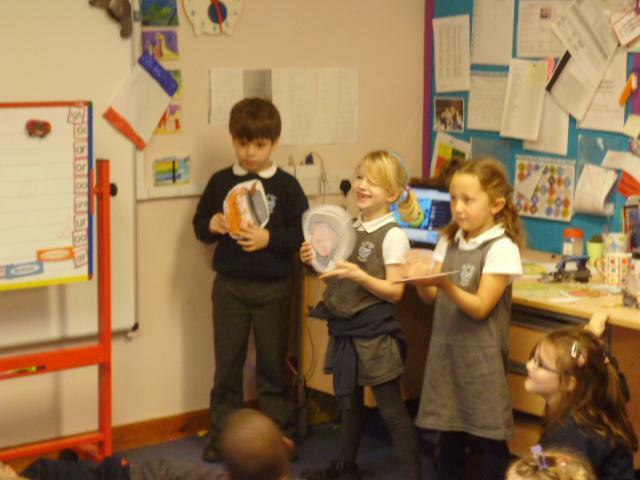 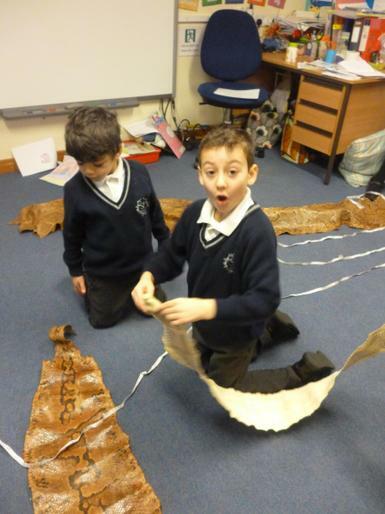 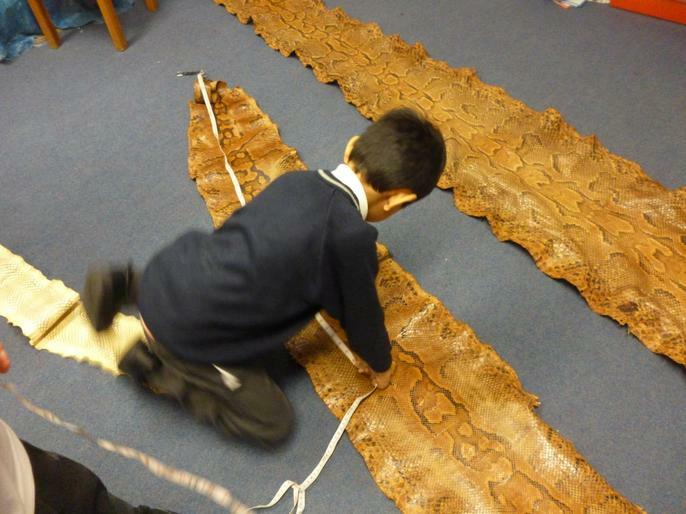 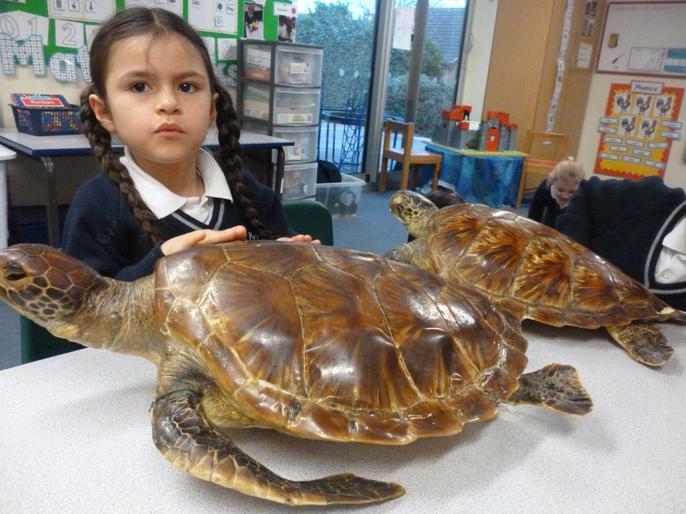 - In RE today we have been learning about the Creation story. 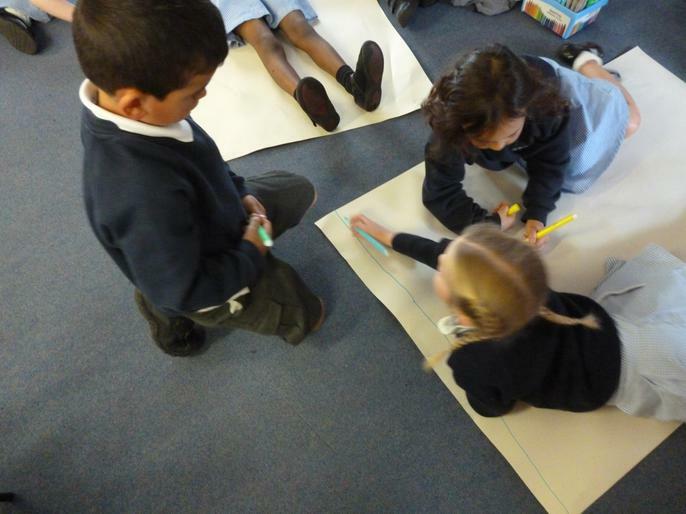 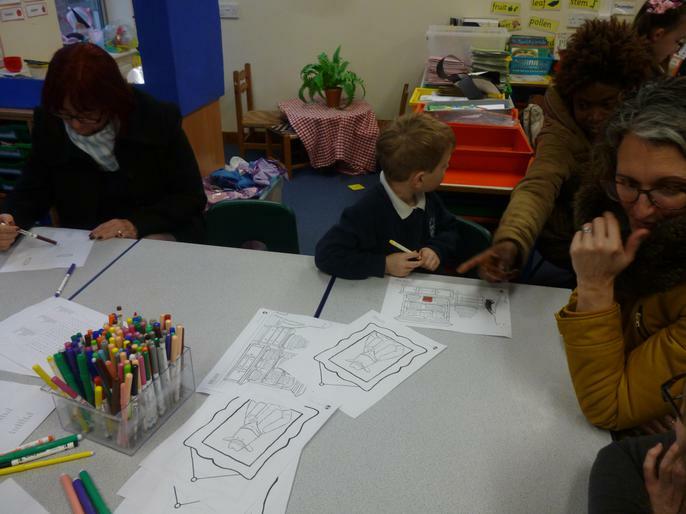 We then drew pictures for our Creation display. 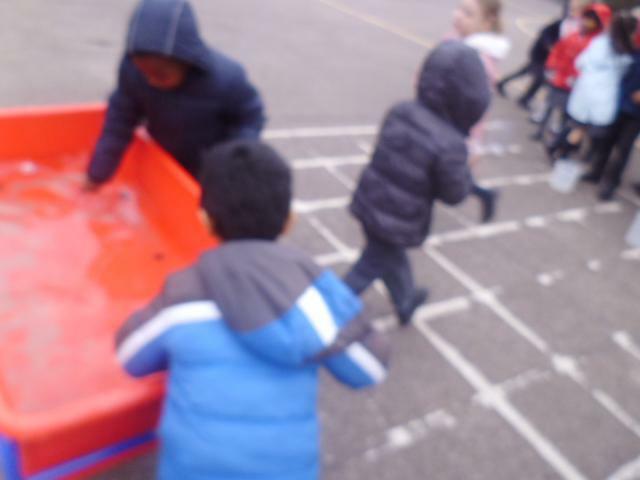 We also had a lot of fun outside! 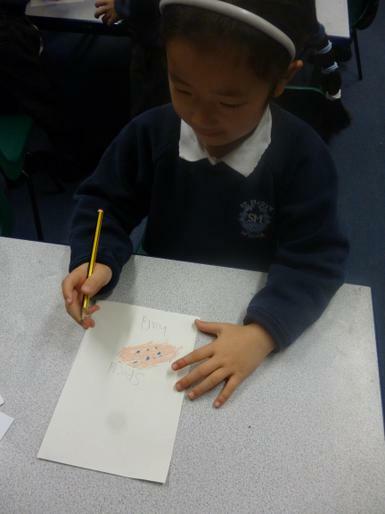 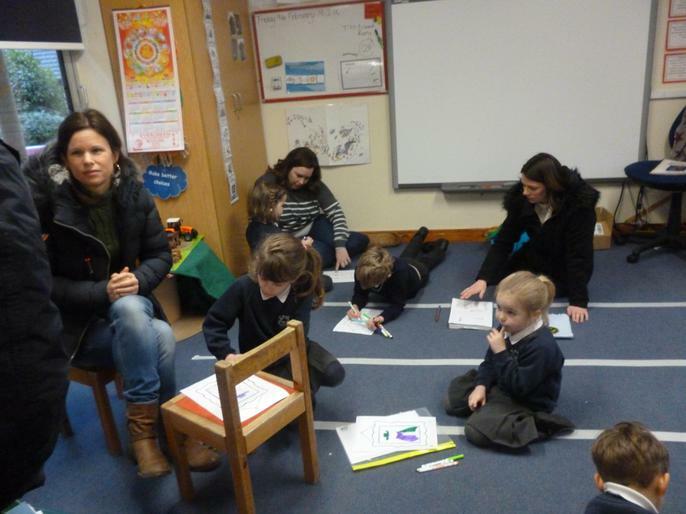 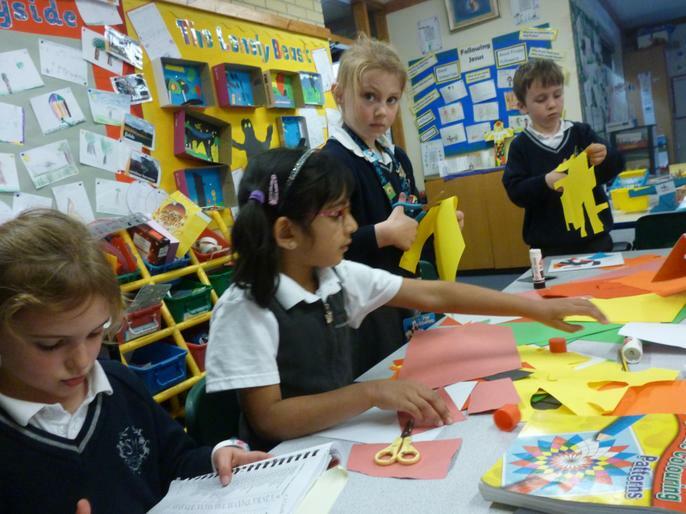 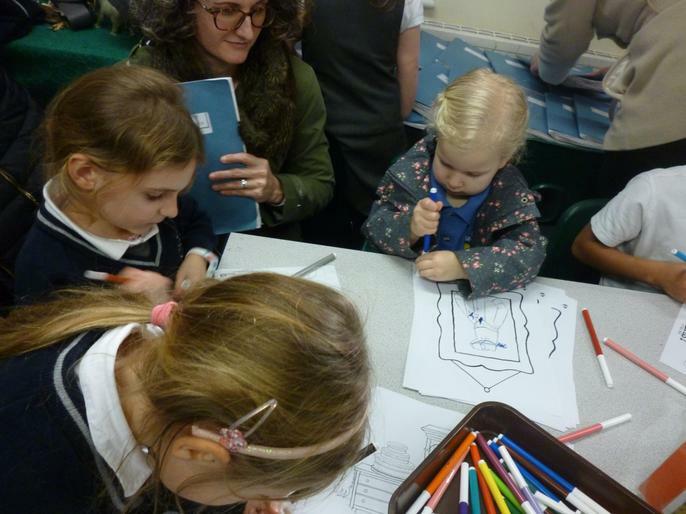 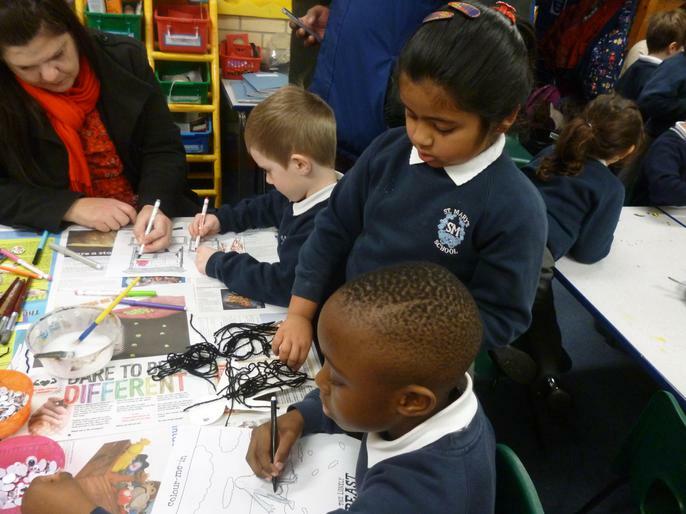 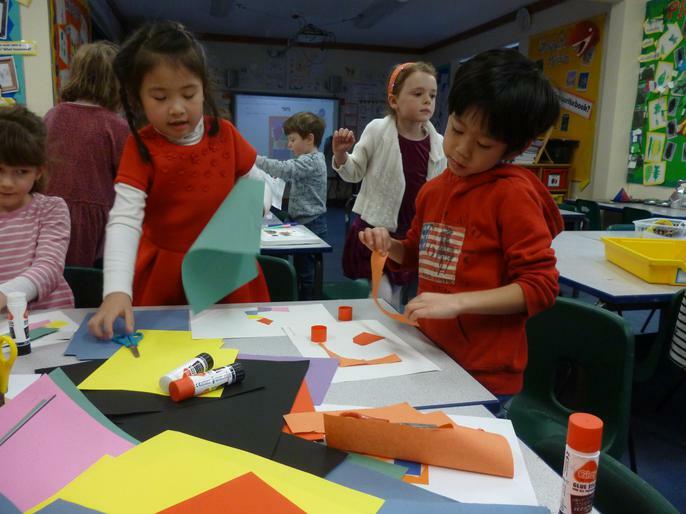 Beegu - In literacy we have begun work on the book 'Beegu' by Alexis Deacon. 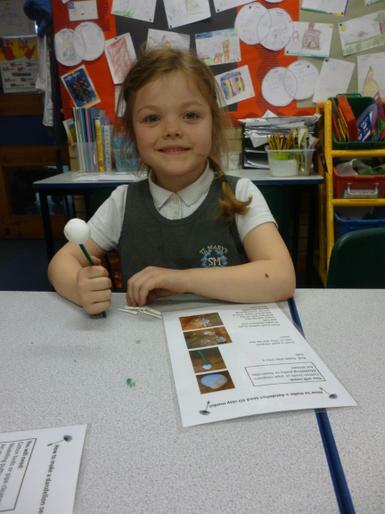 We made models of Beegu using play dough and puppets using card and lollypop sticks. 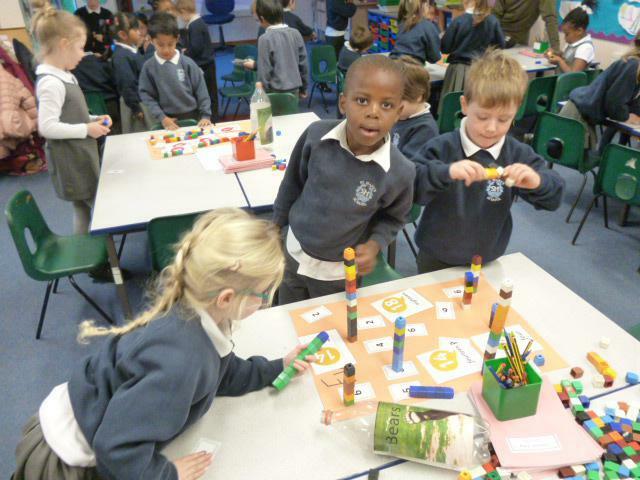 Sorting - We have been sorting groups of objects in different ways. 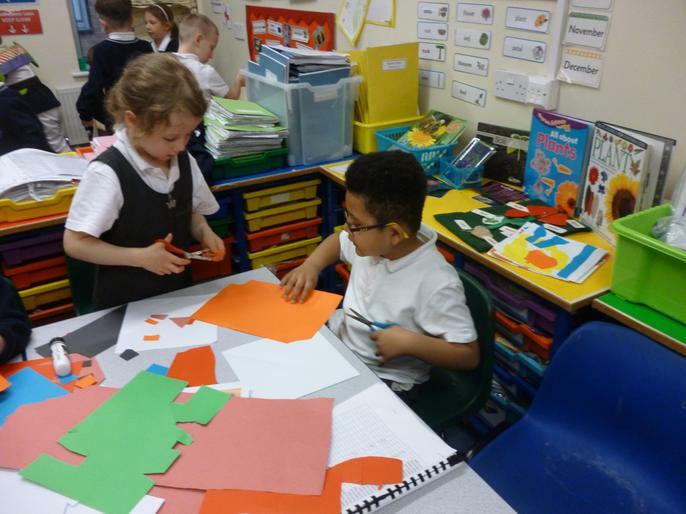 We sorted by colour, shapes and type. 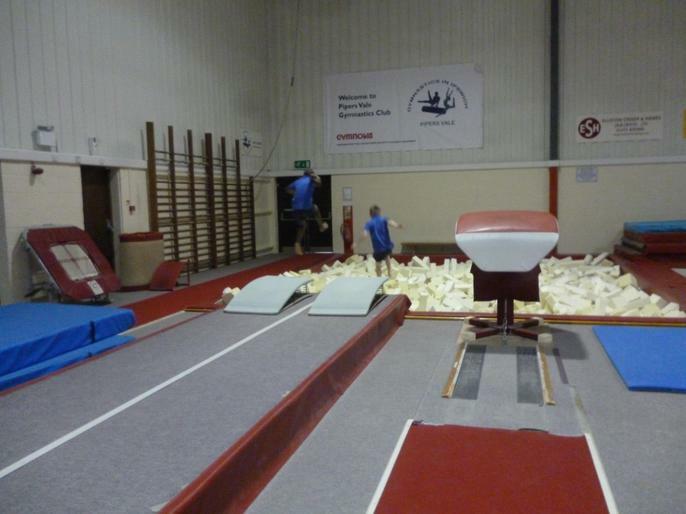 Welcome Back!! 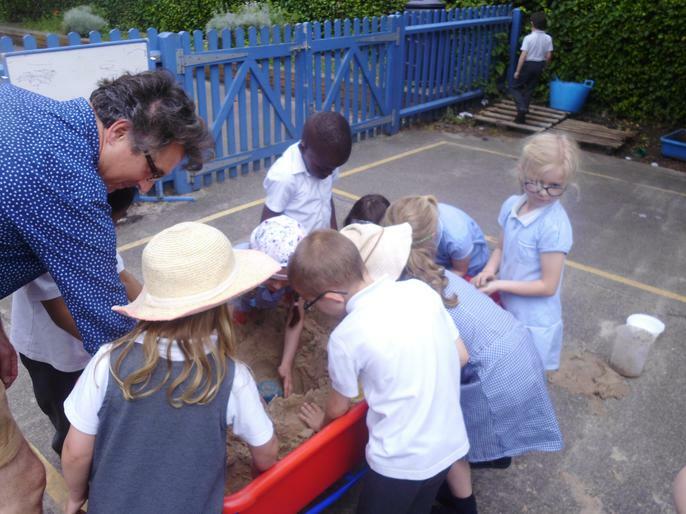 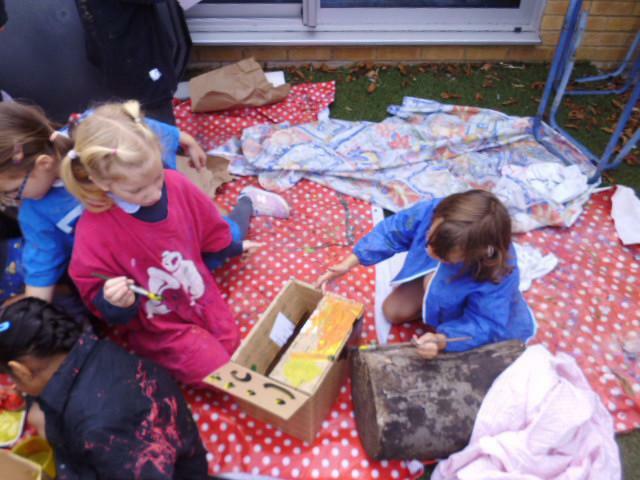 Please have a read of the Year 1 Autumn newsletter to find out some of the things we will be doing this term. 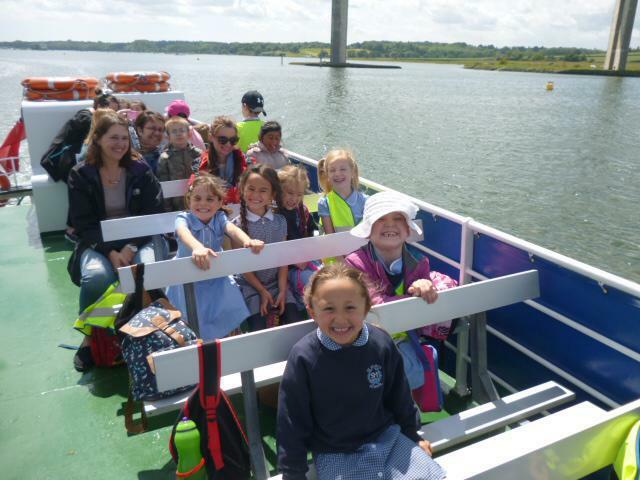 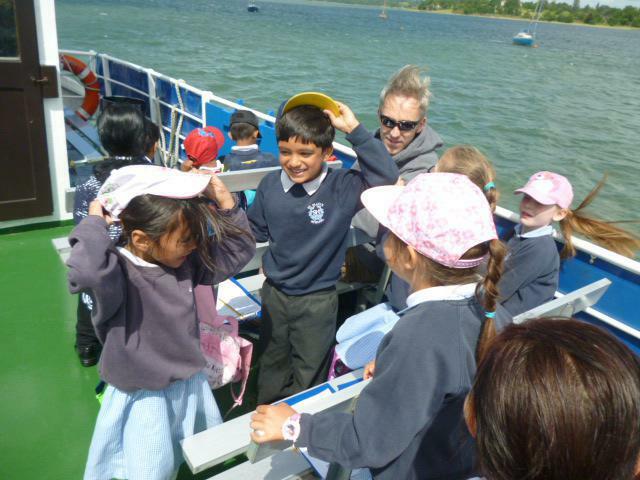 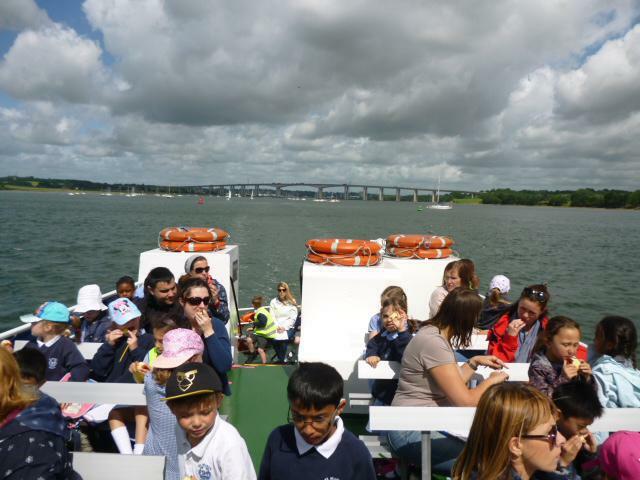 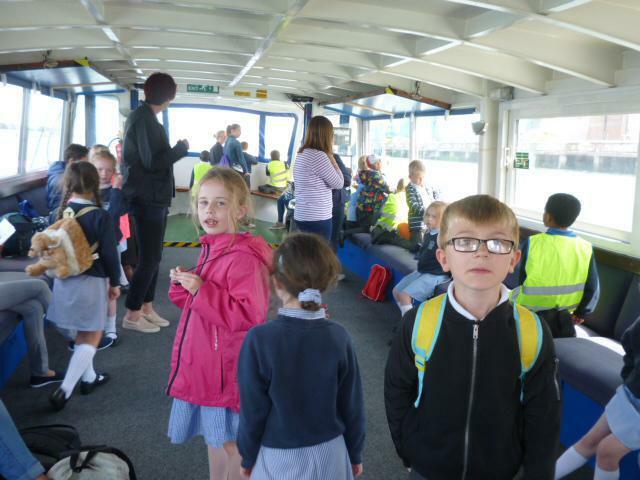 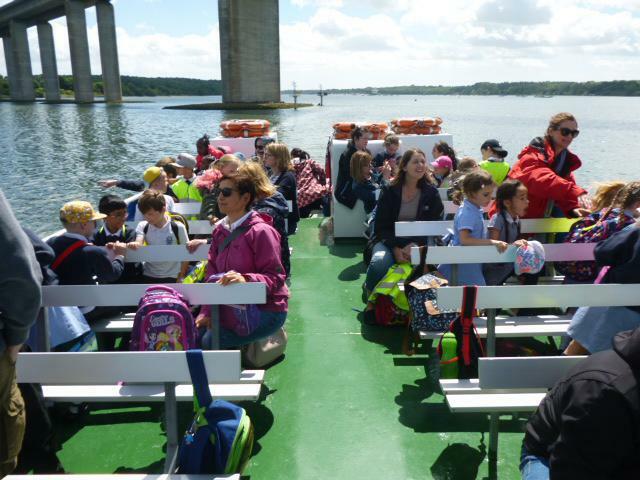 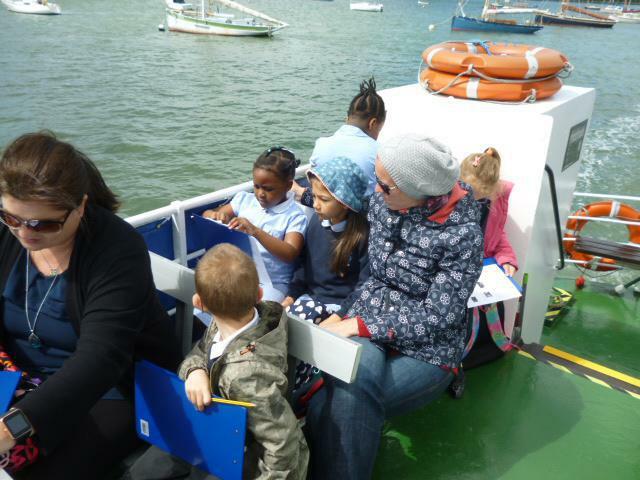 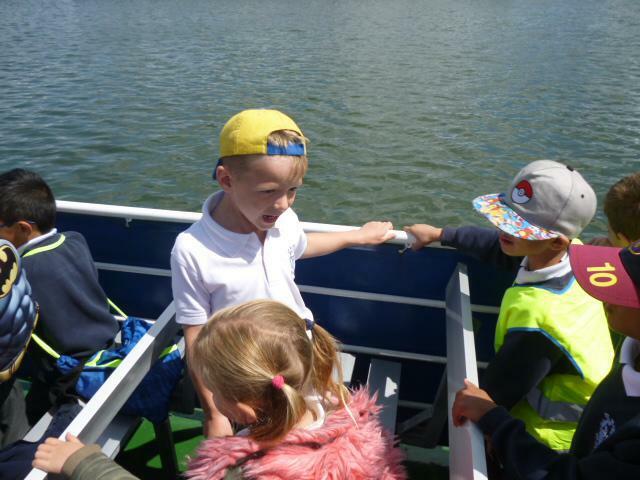 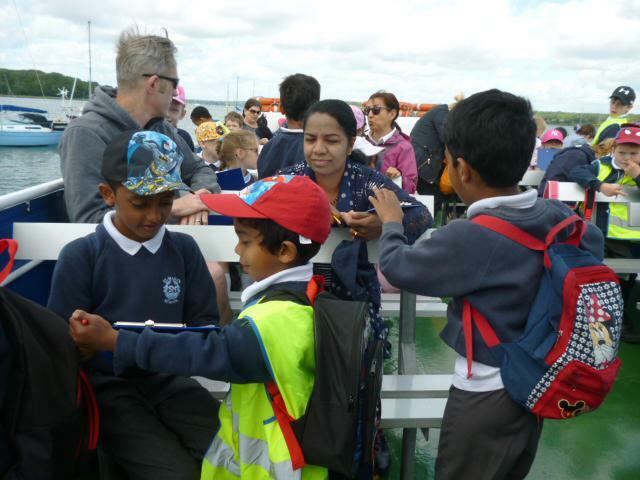 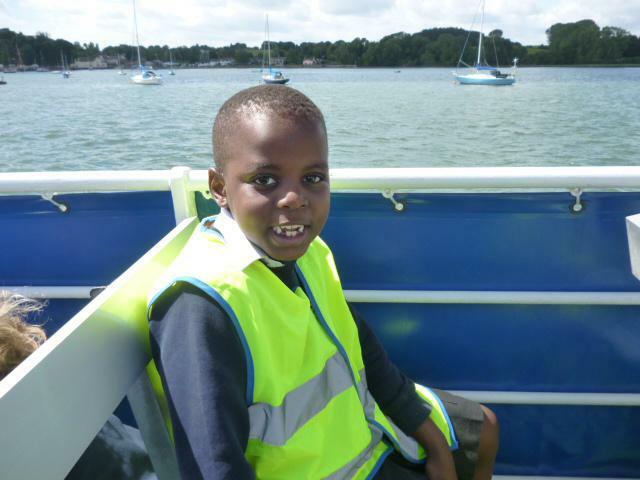 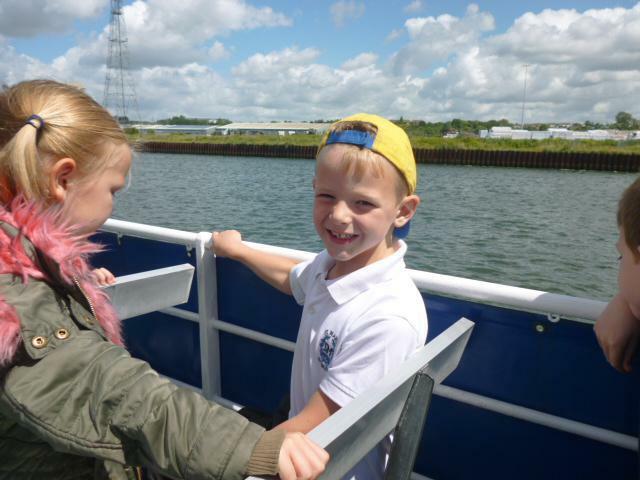 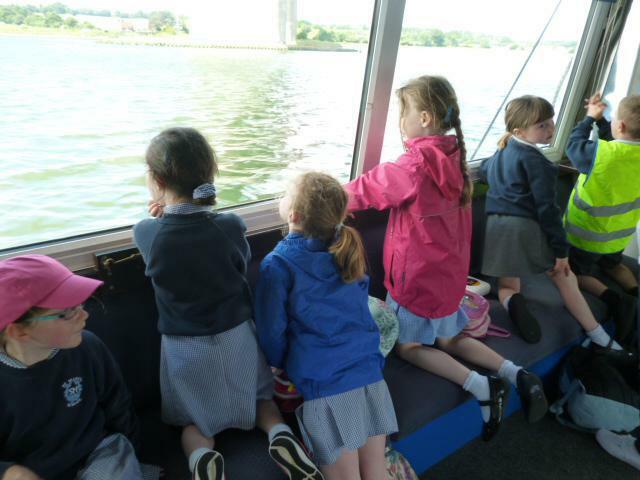 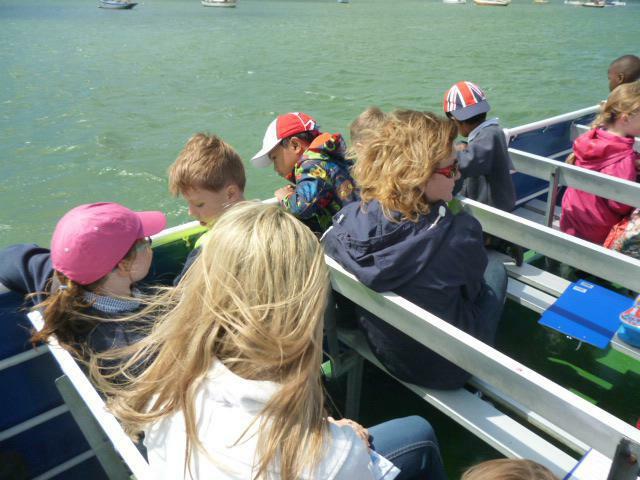 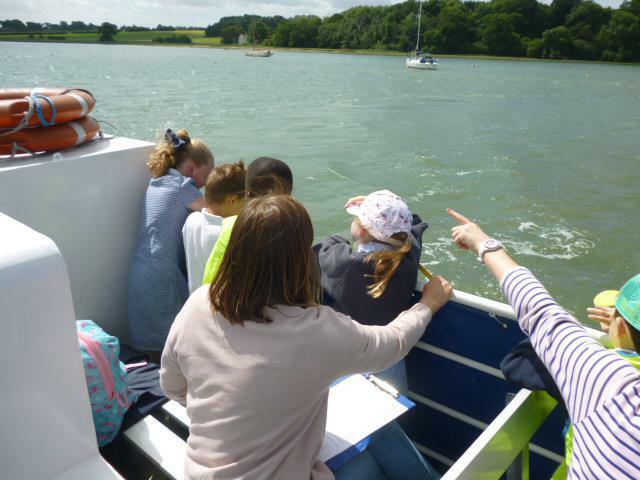 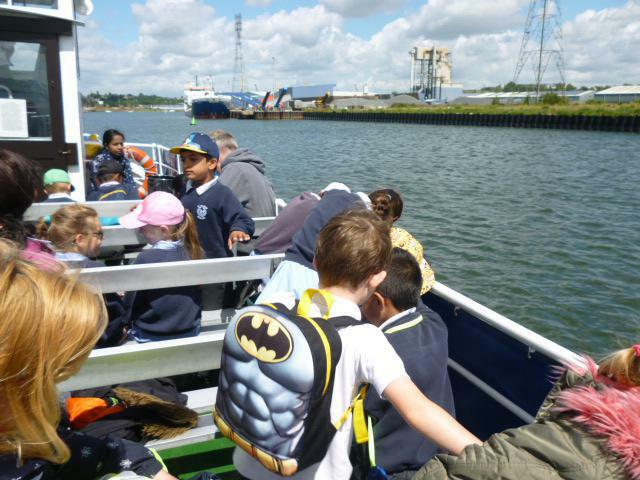 Year 1 and 2 had a fantastic day out on the river. 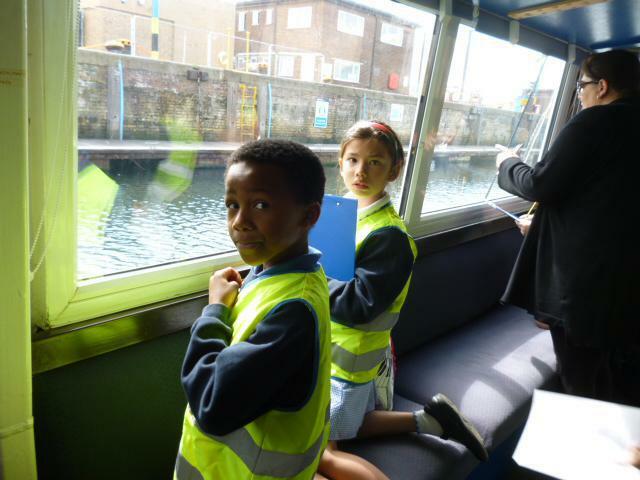 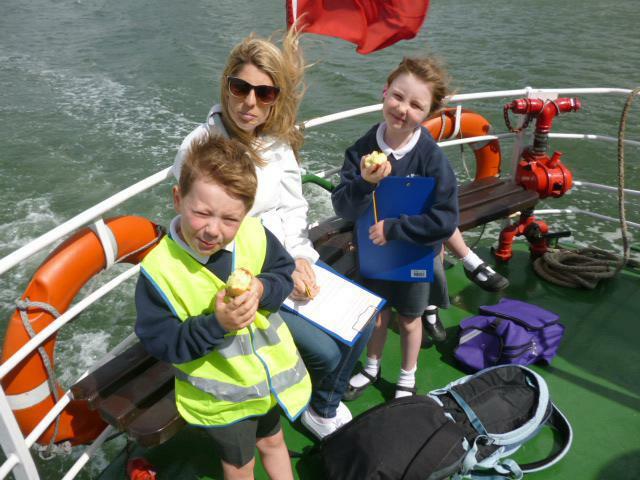 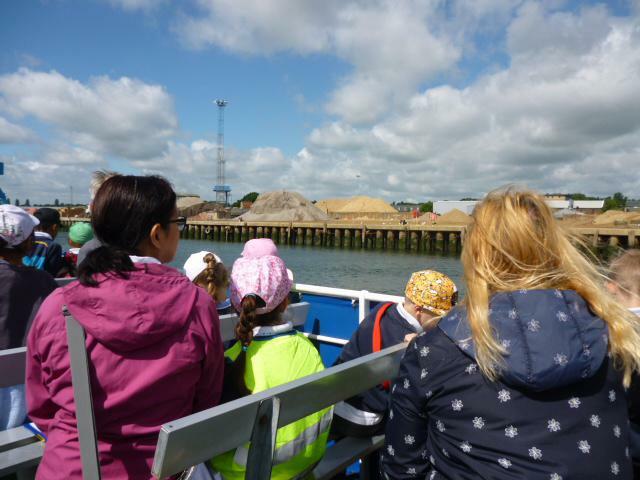 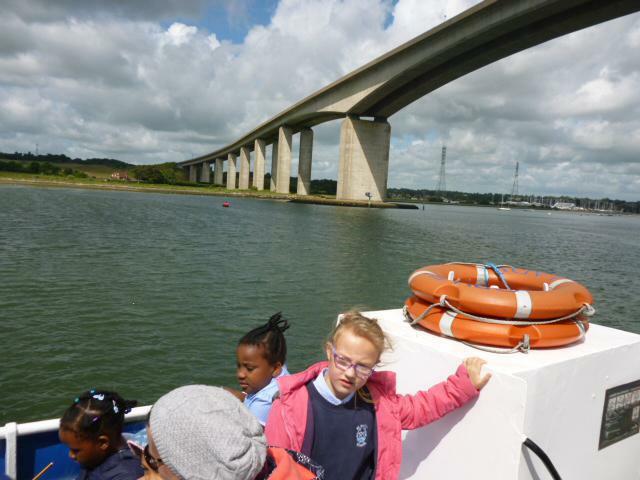 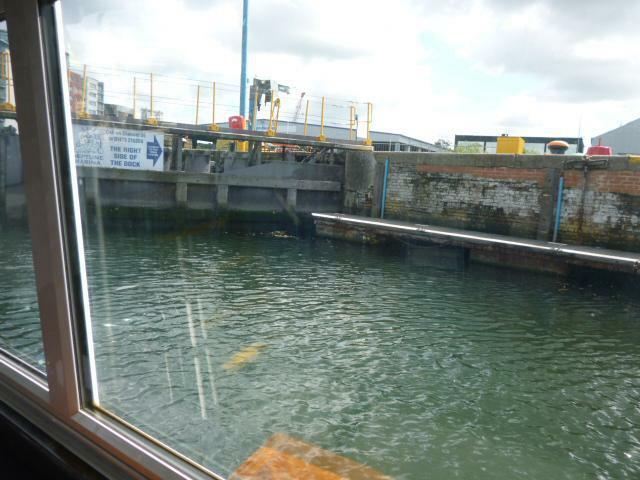 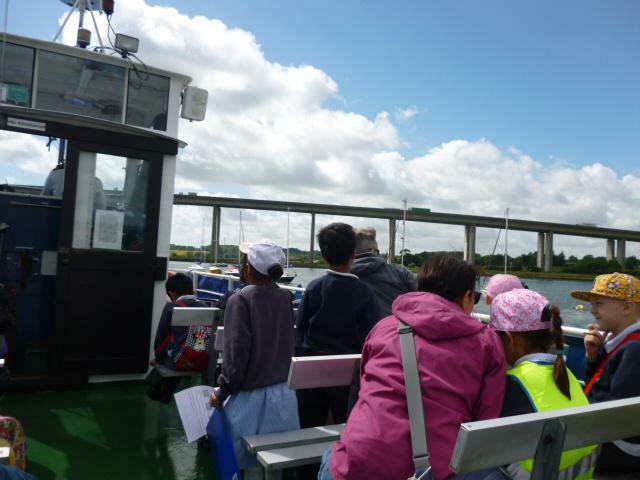 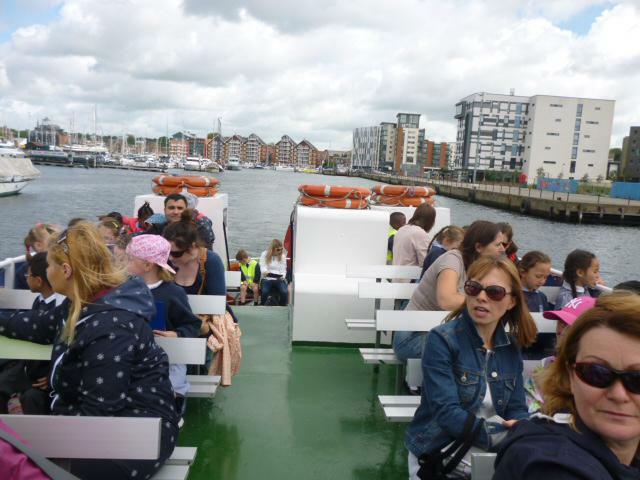 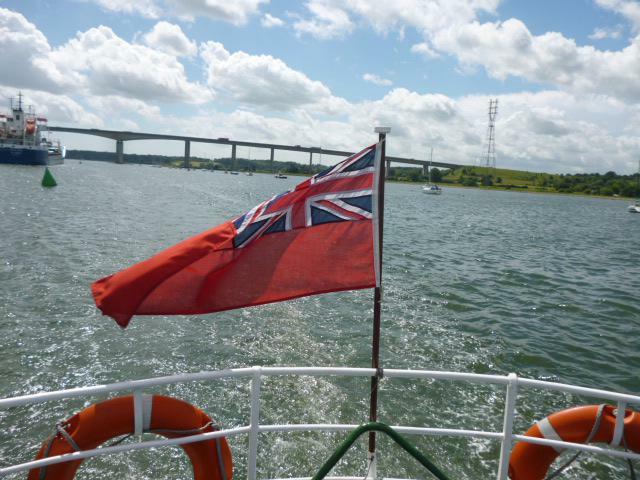 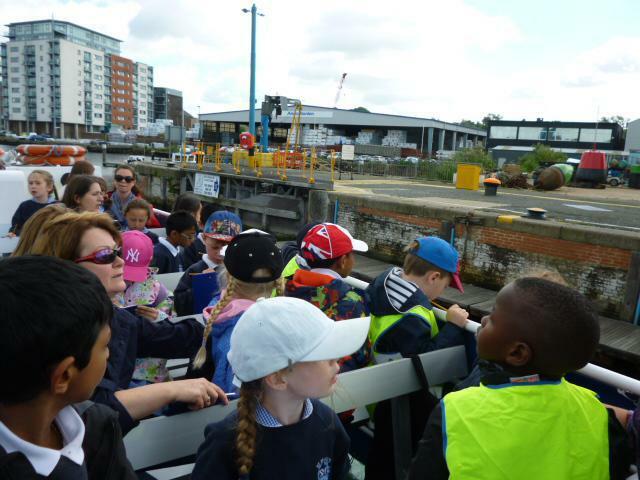 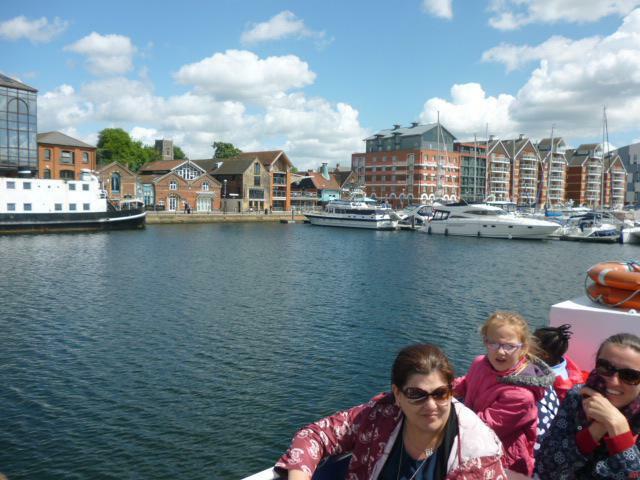 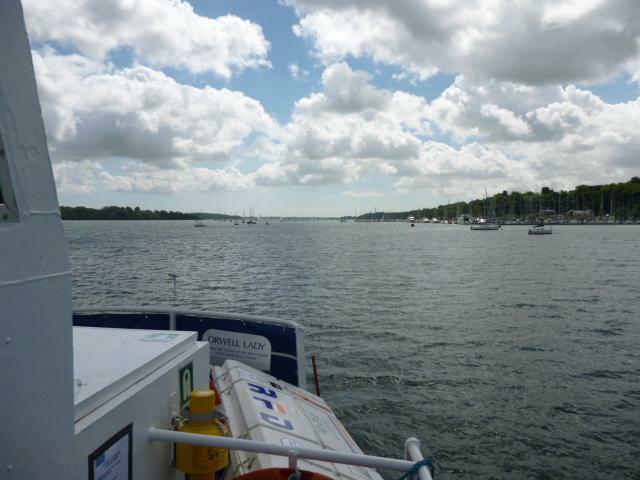 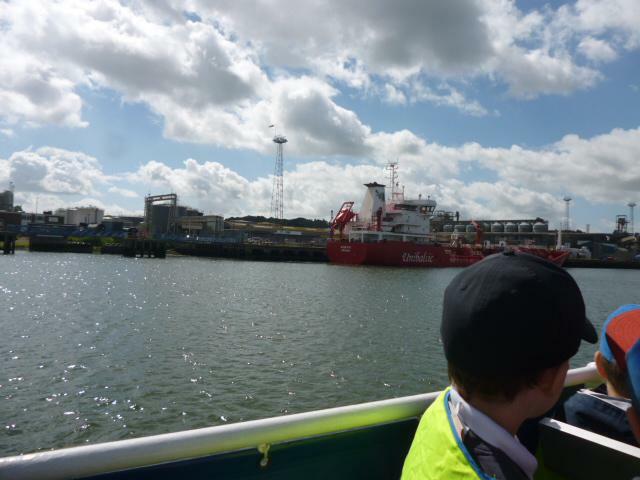 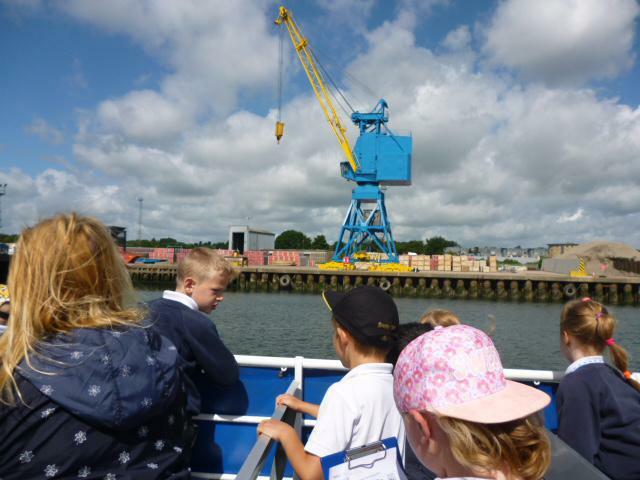 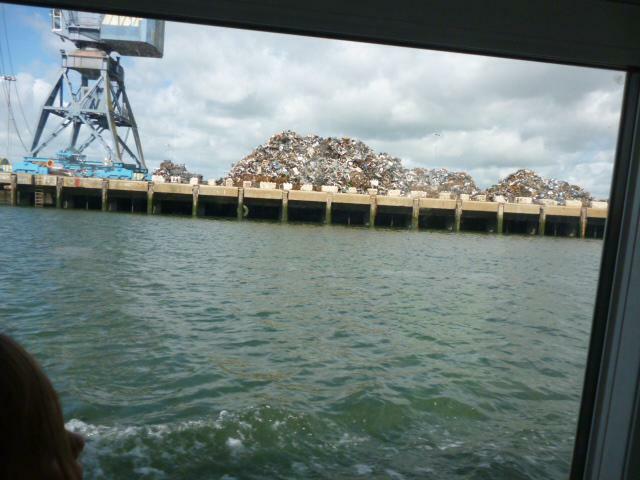 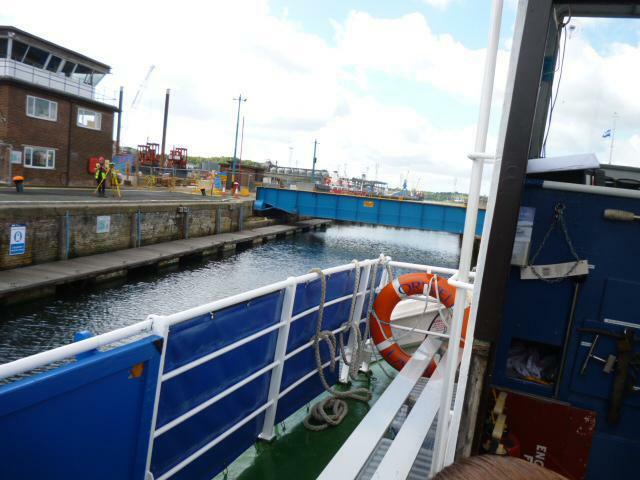 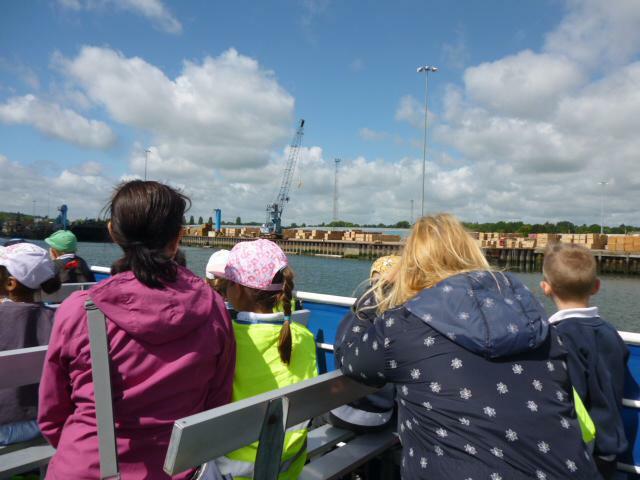 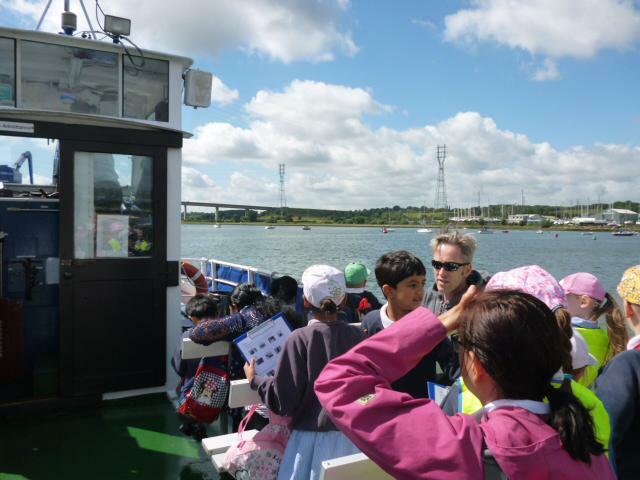 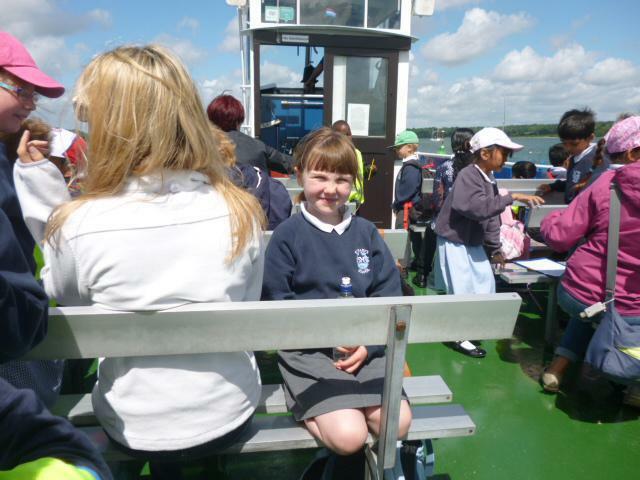 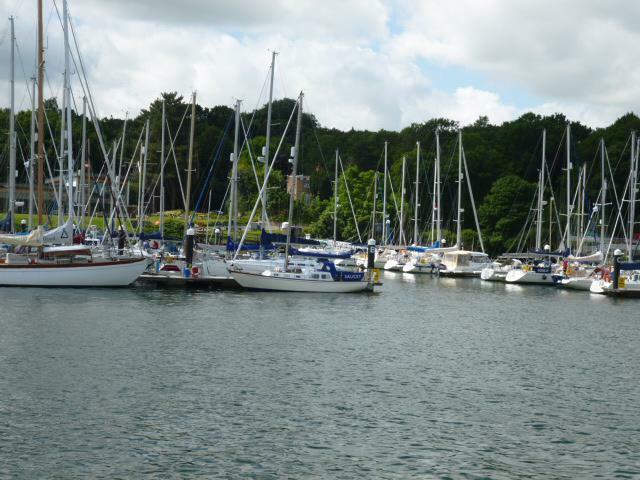 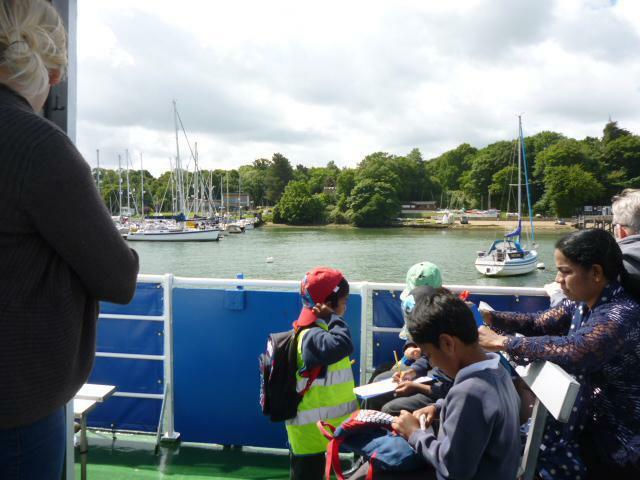 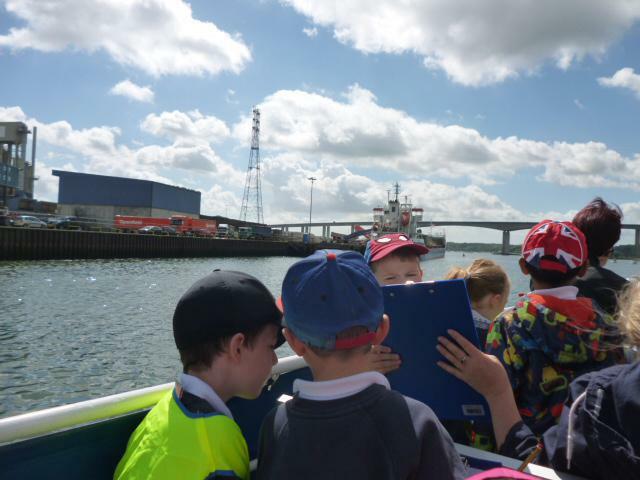 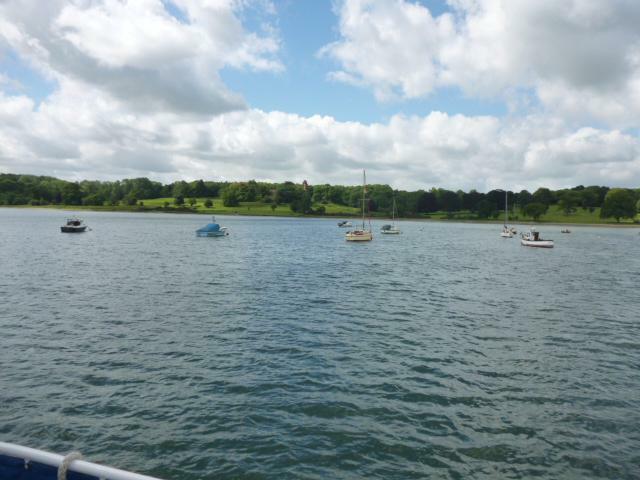 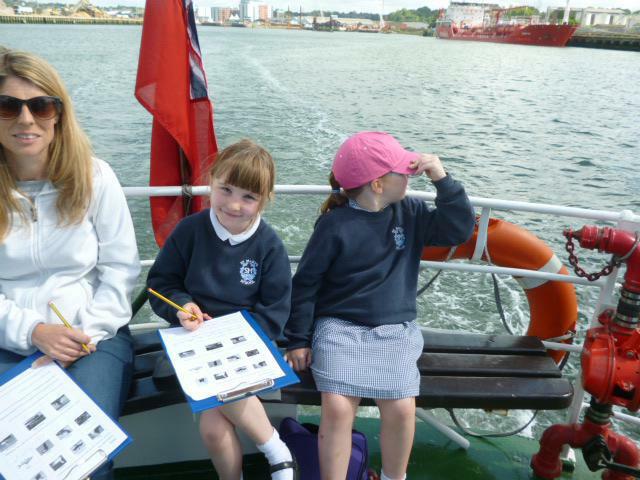 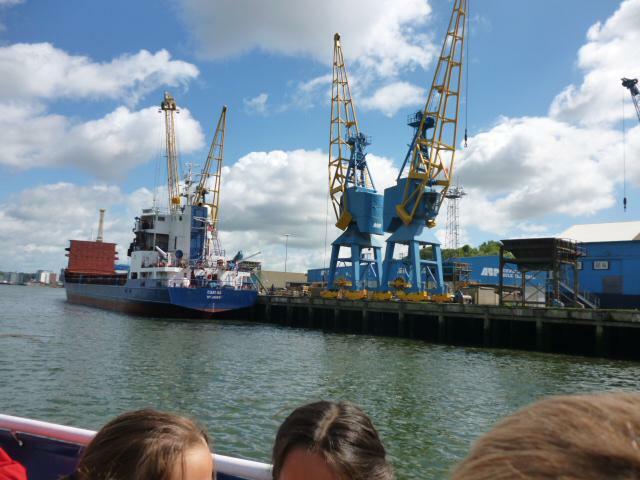 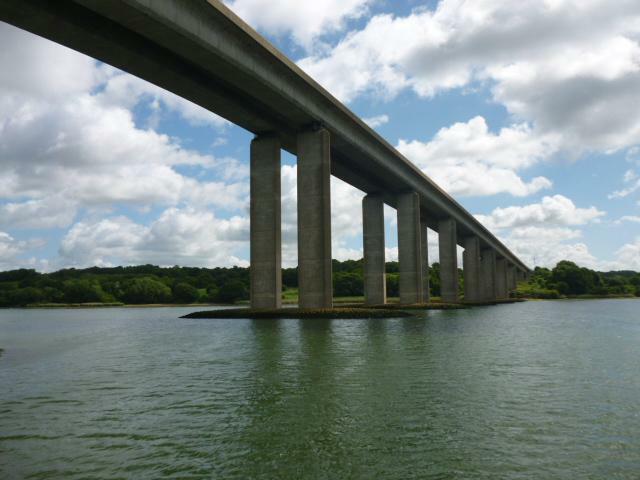 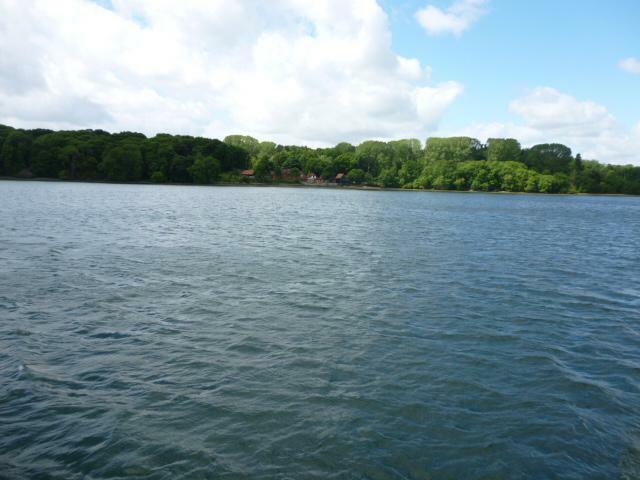 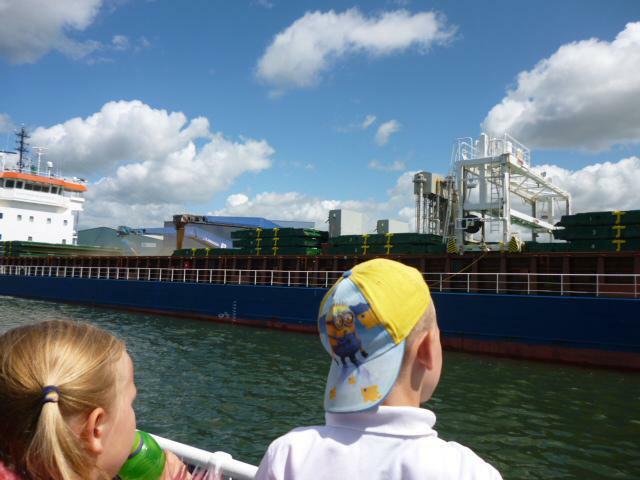 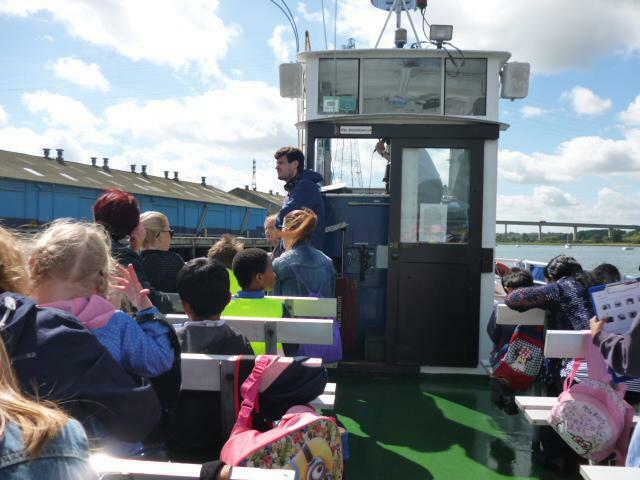 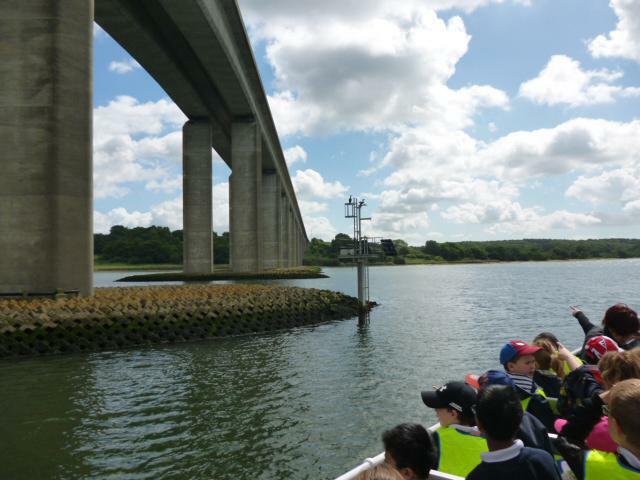 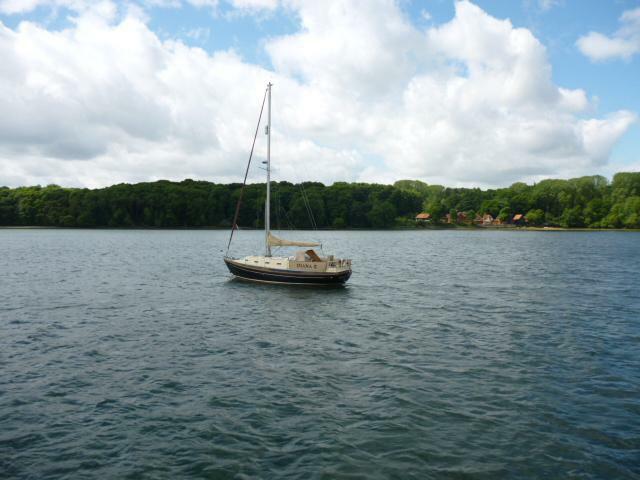 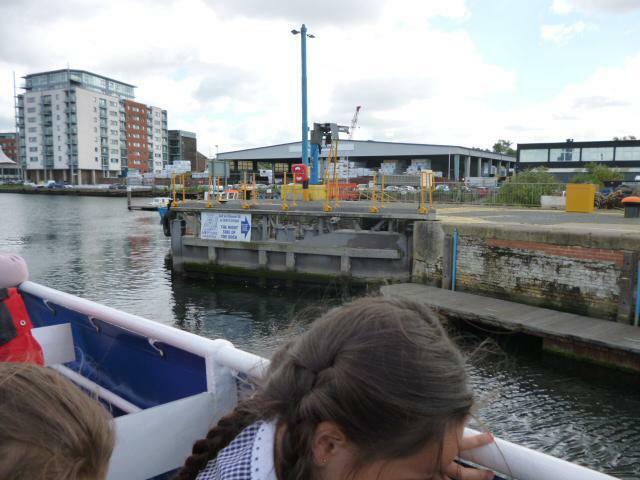 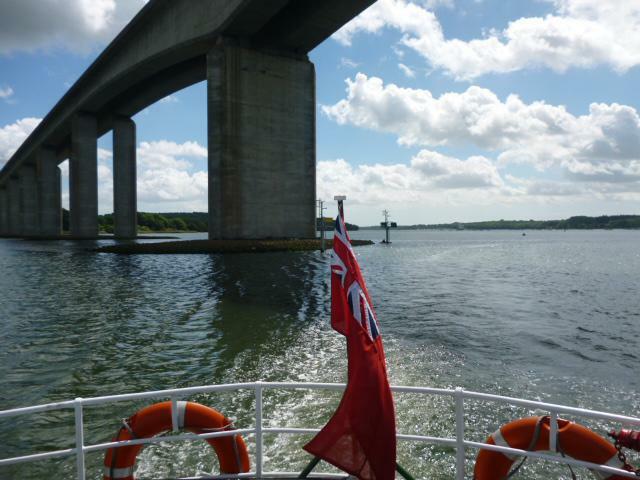 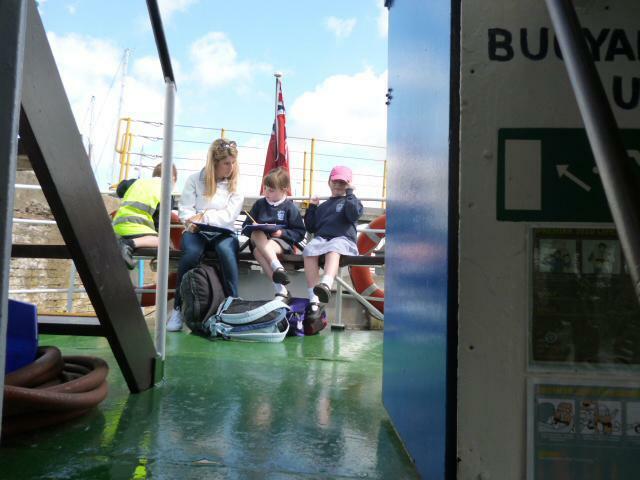 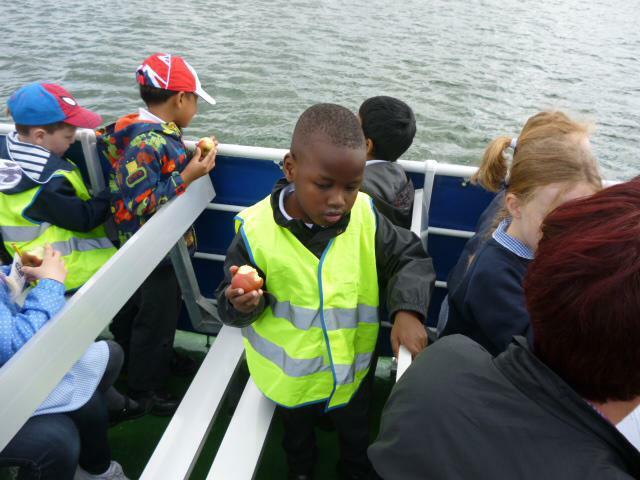 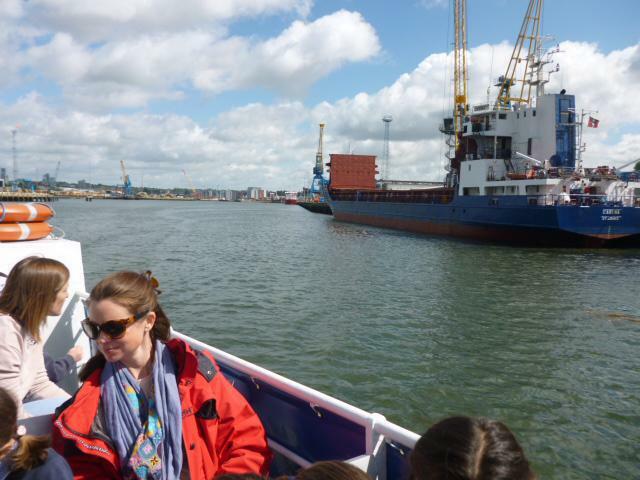 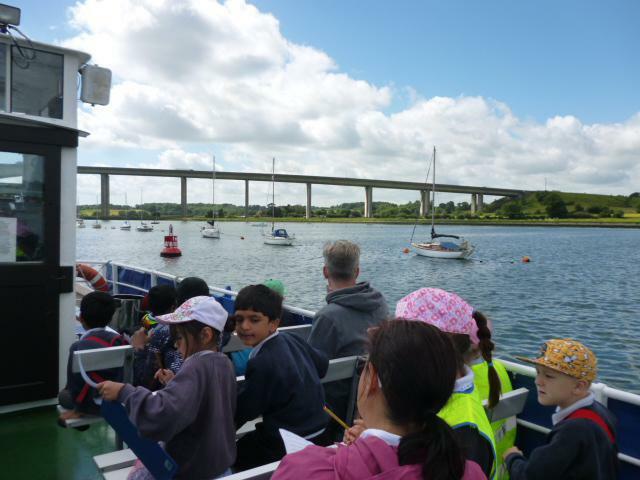 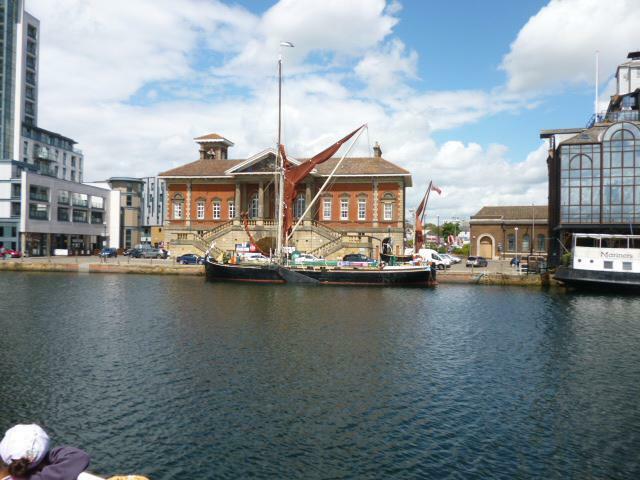 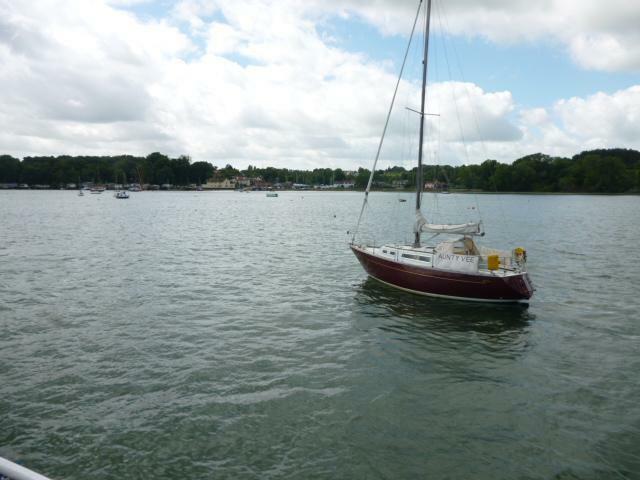 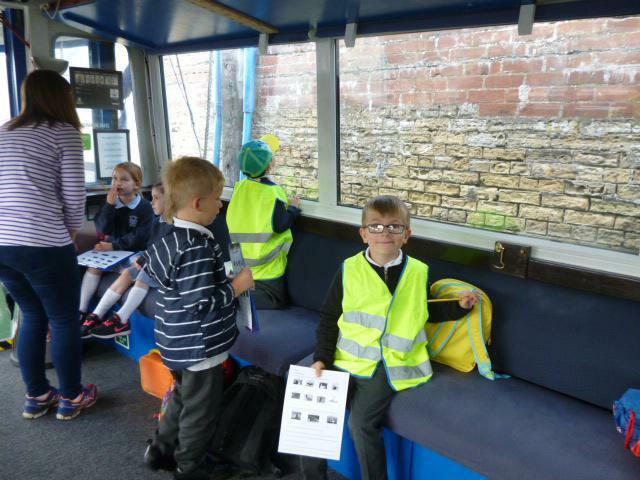 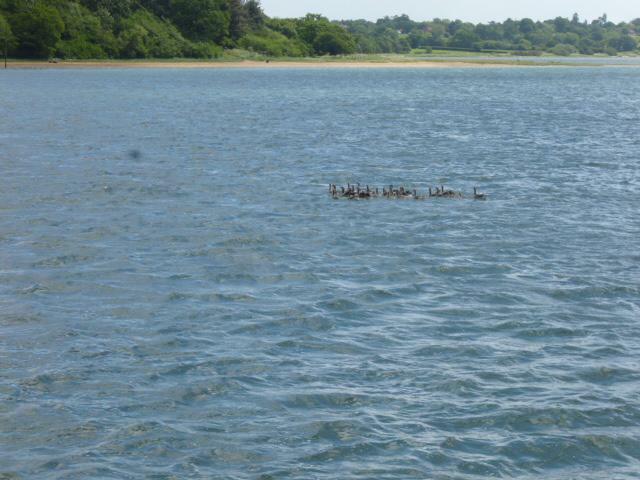 We saw lots of wildlife, landmarks, other boats and much more. 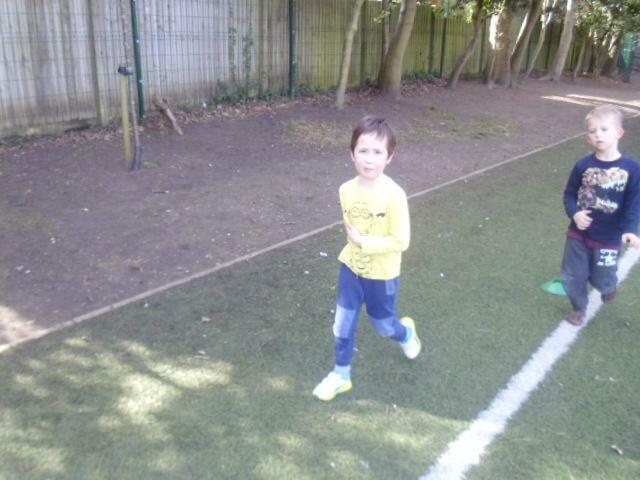 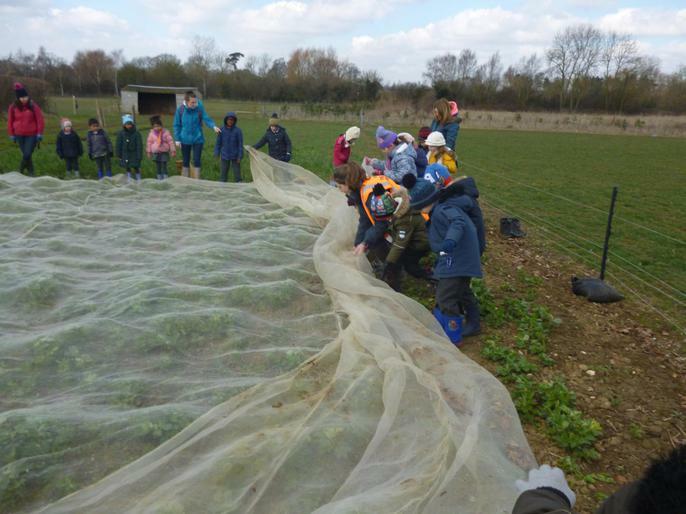 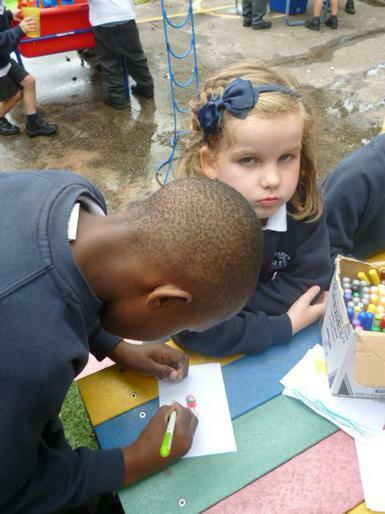 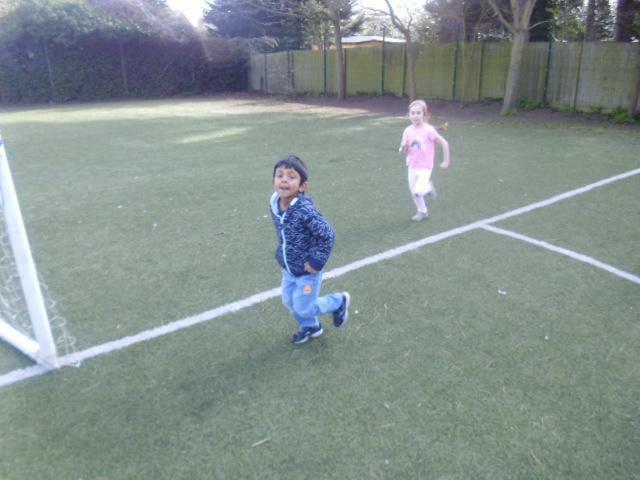 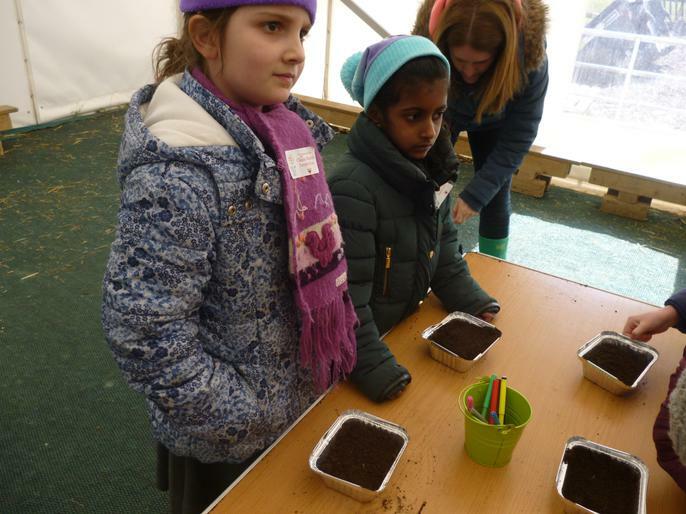 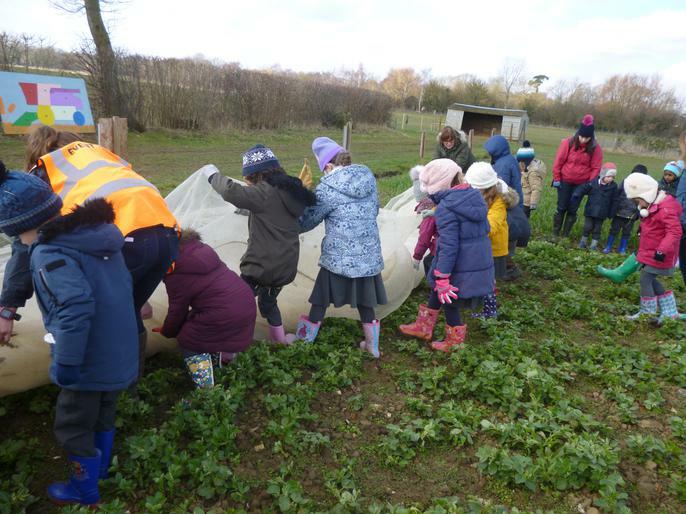 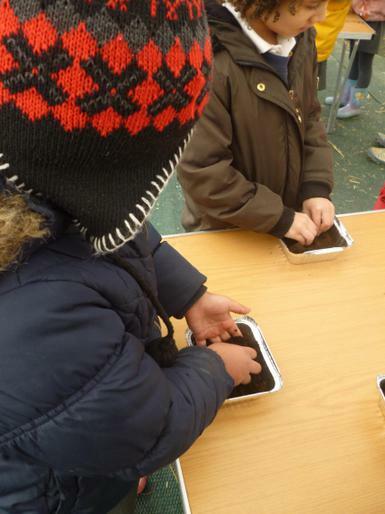 The rain stayed away and the children learnt so much whilst having a great time. 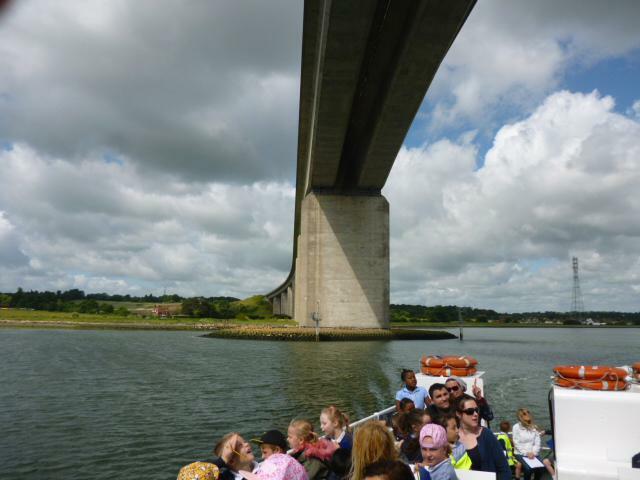 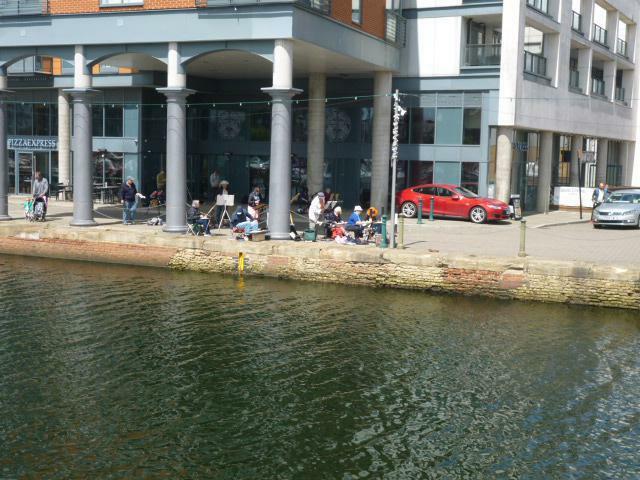 Many thanks to all the adults who helped and to all the people along the river who put up with us waving at them. 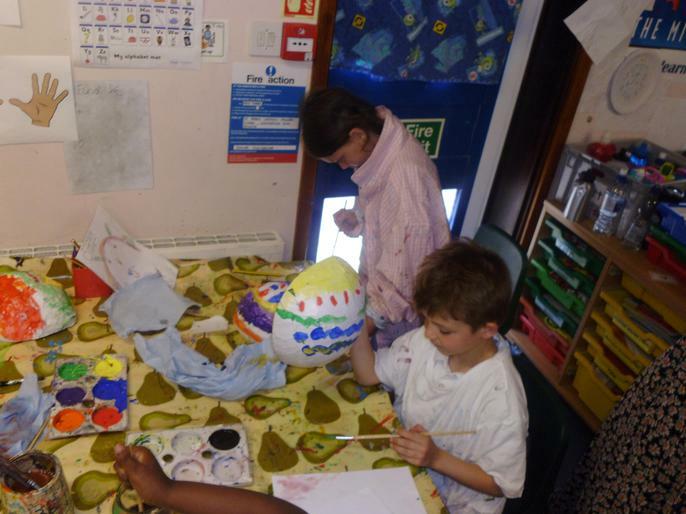 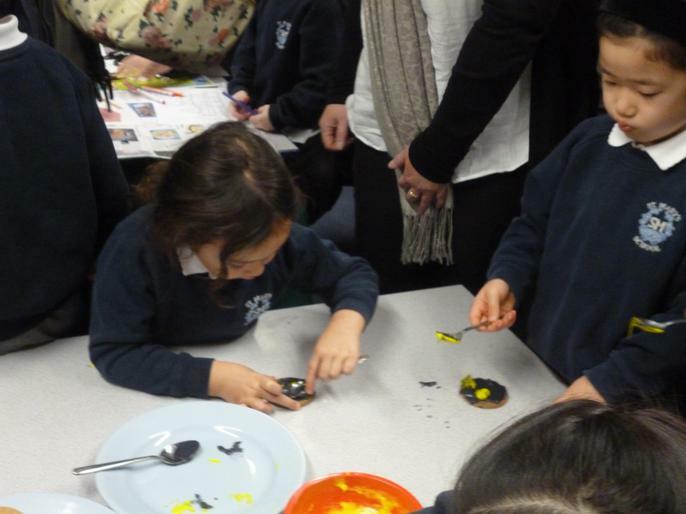 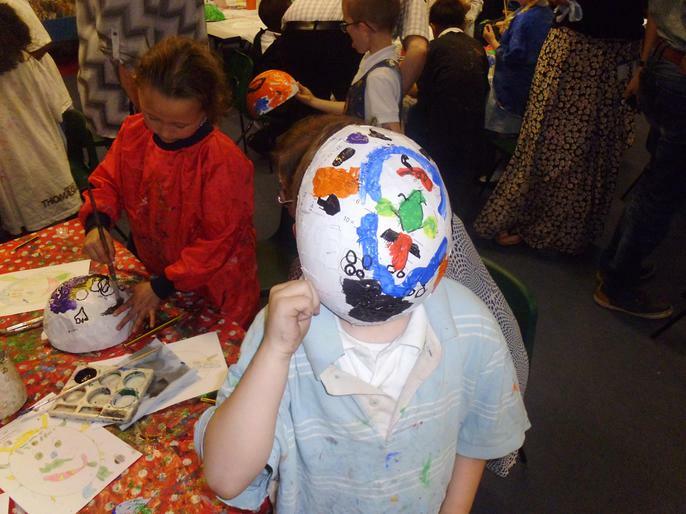 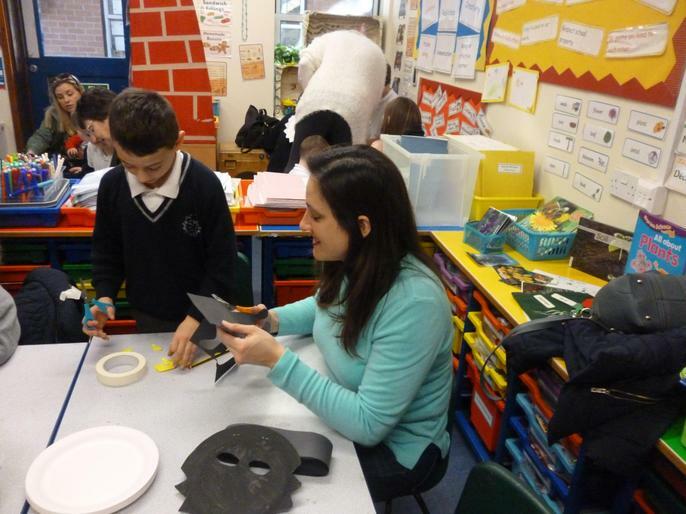 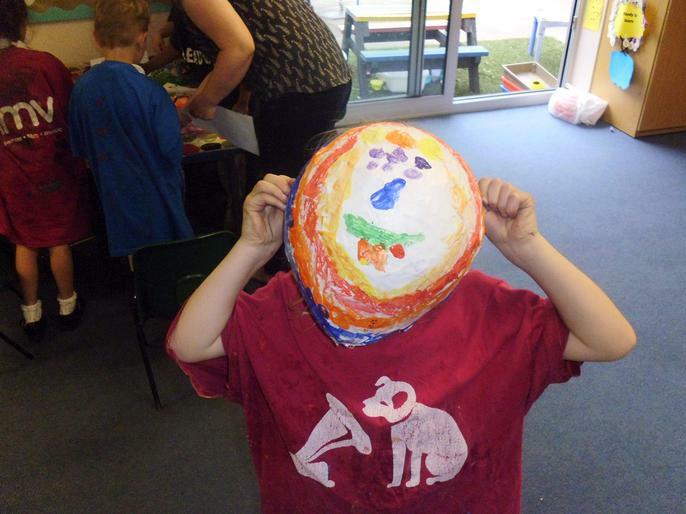 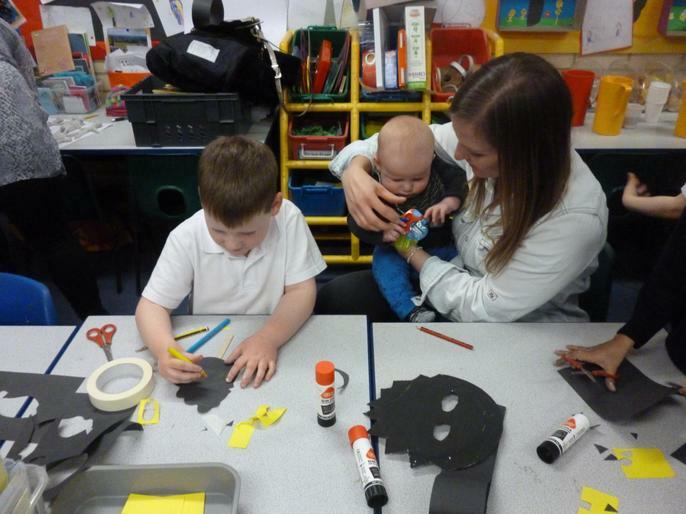 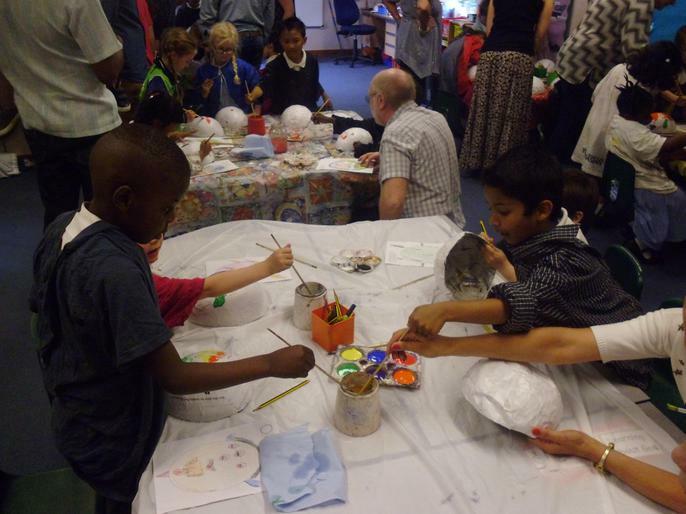 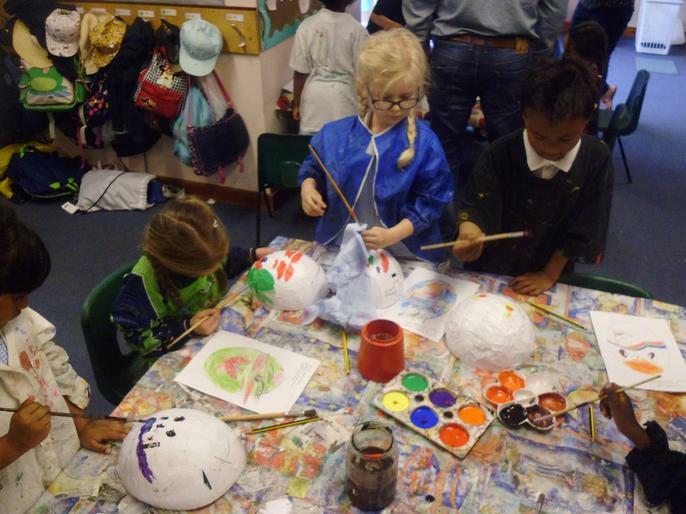 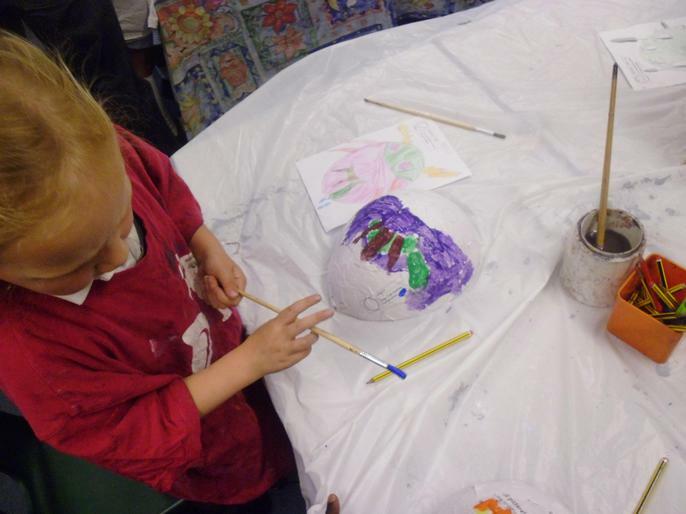 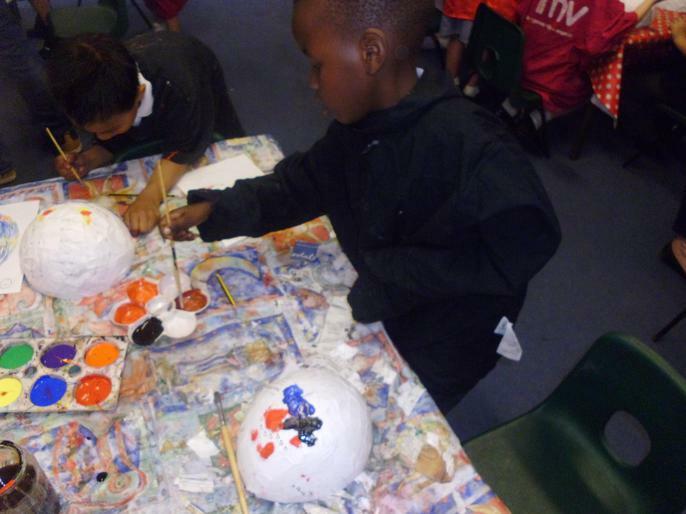 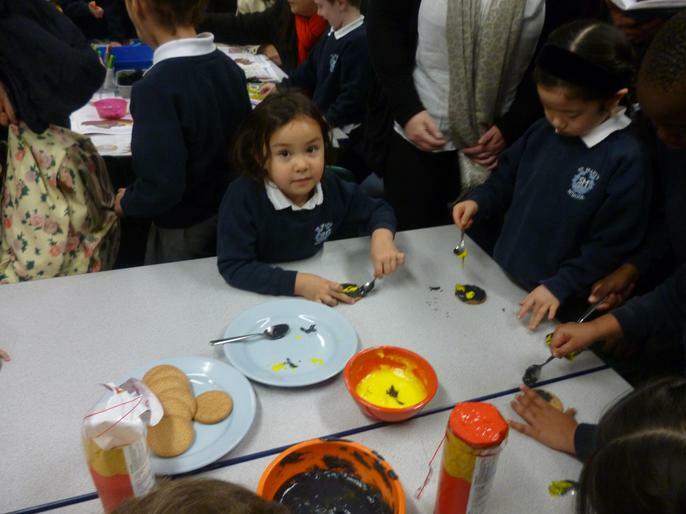 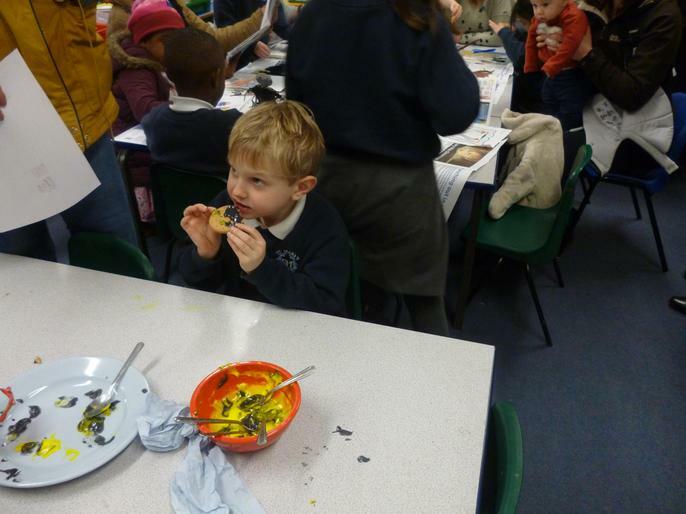 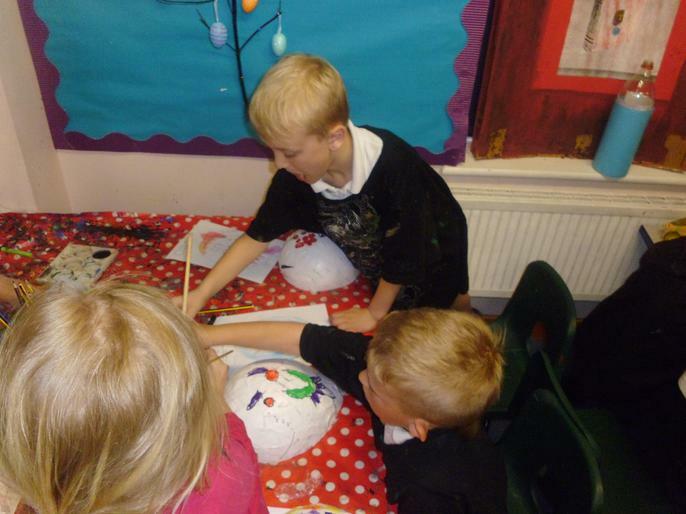 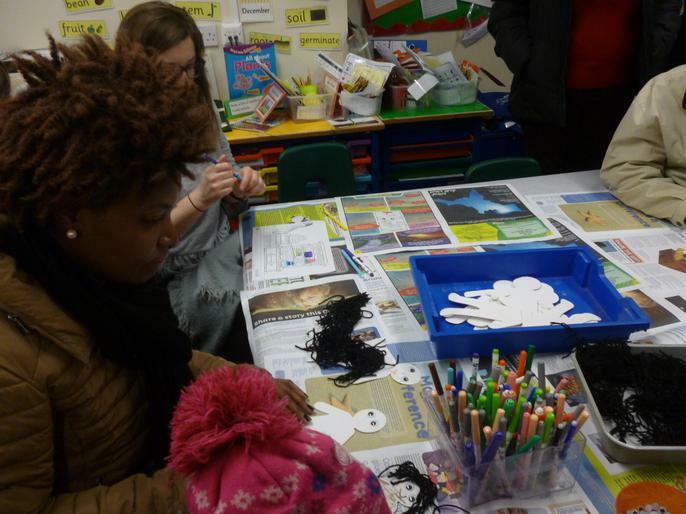 We had a great time at our share afternoon painting the alien masks. 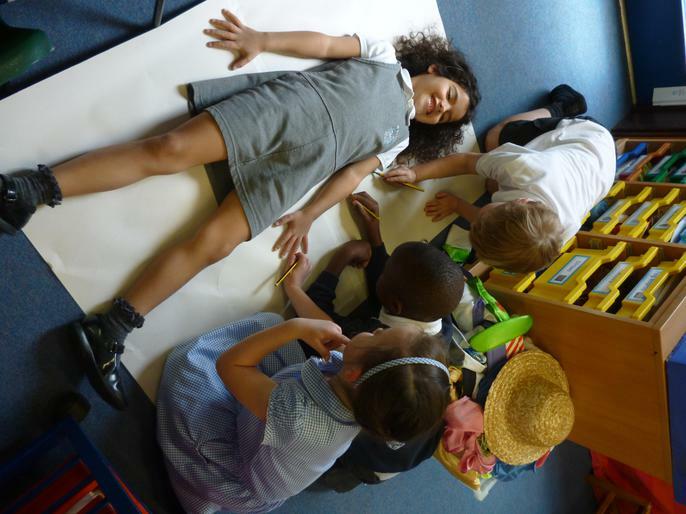 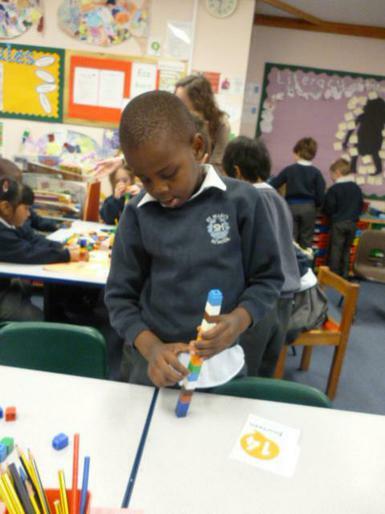 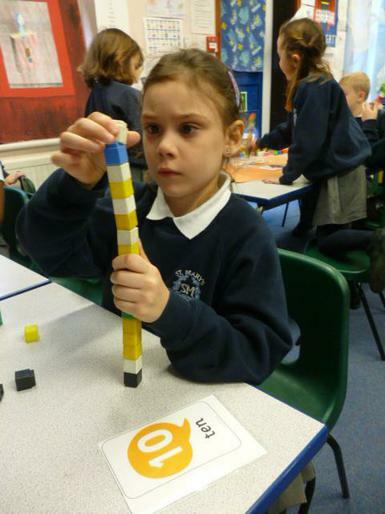 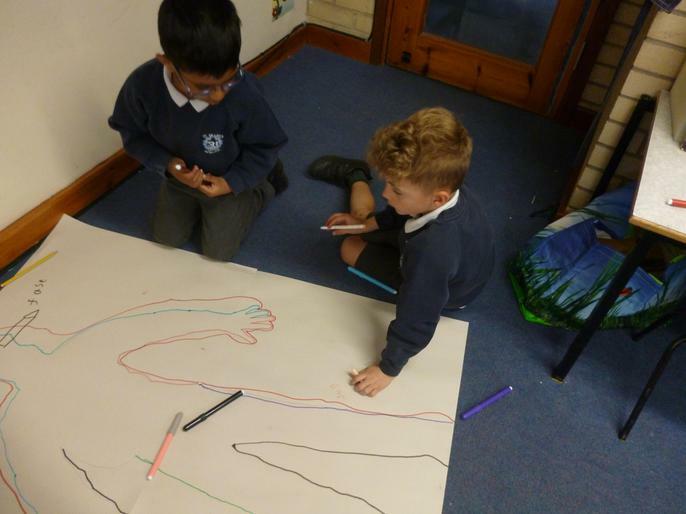 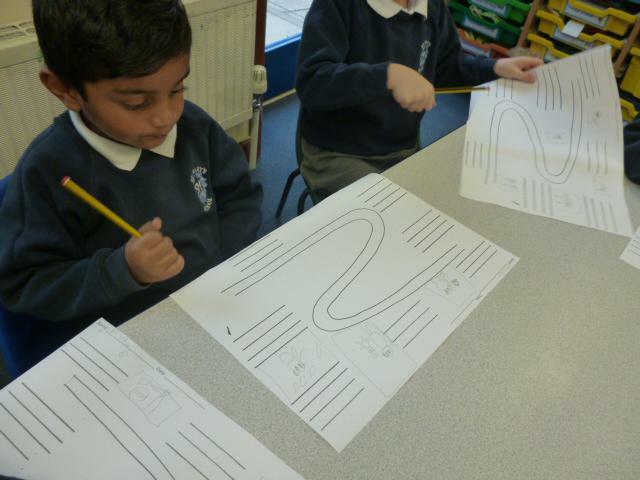 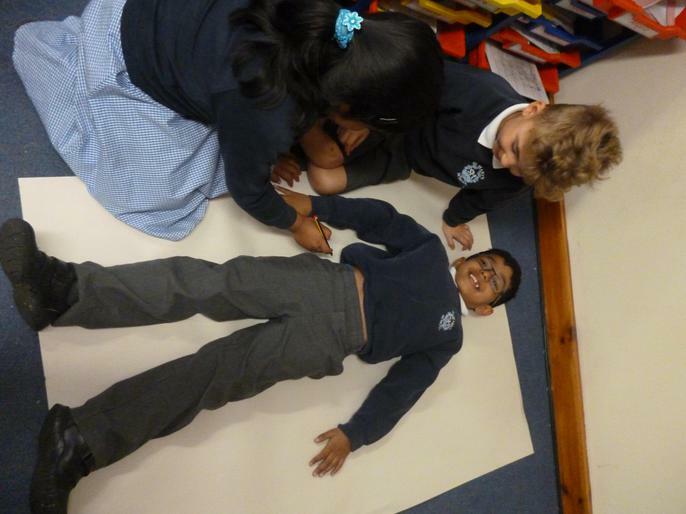 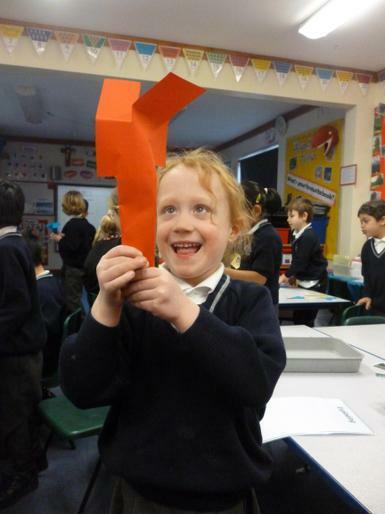 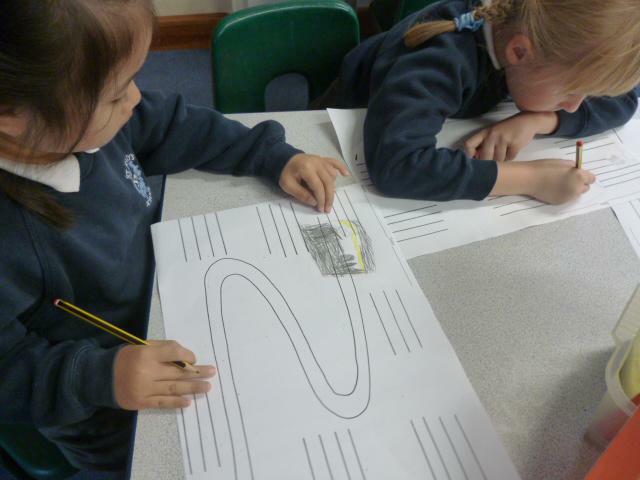 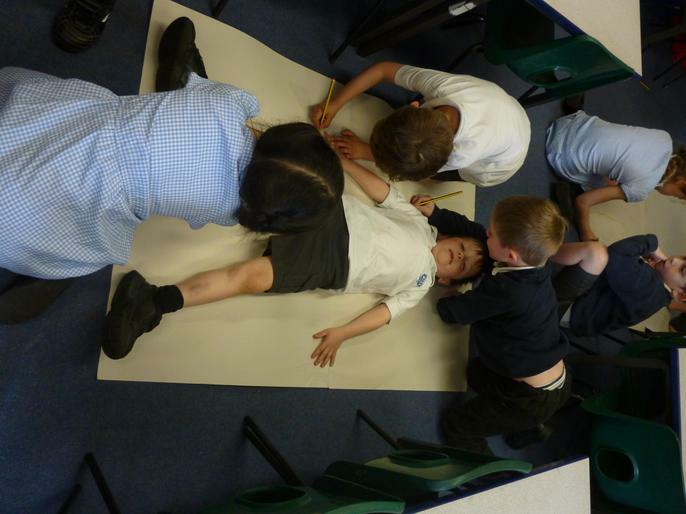 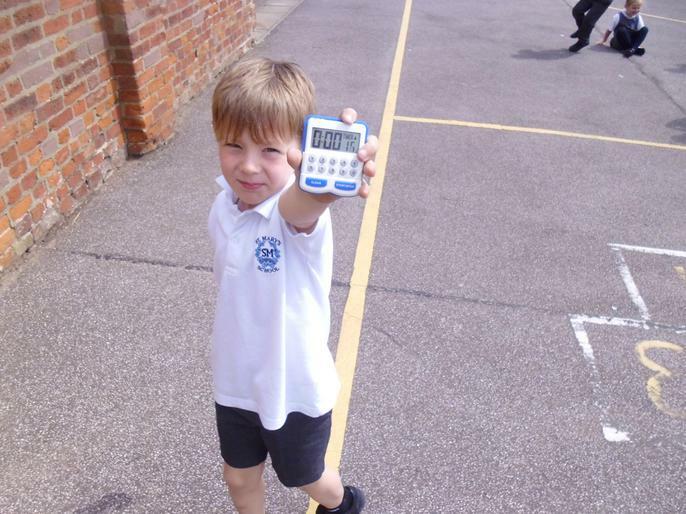 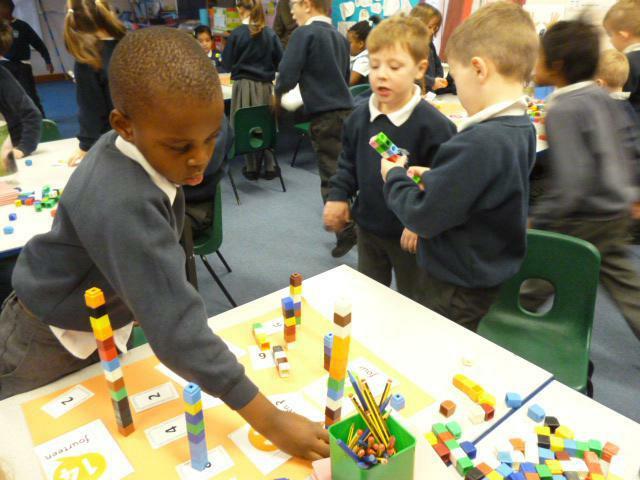 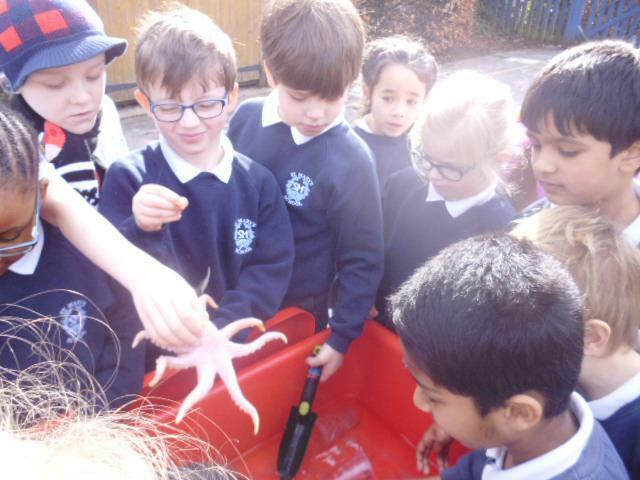 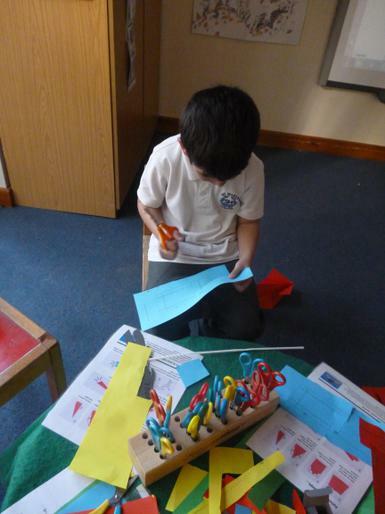 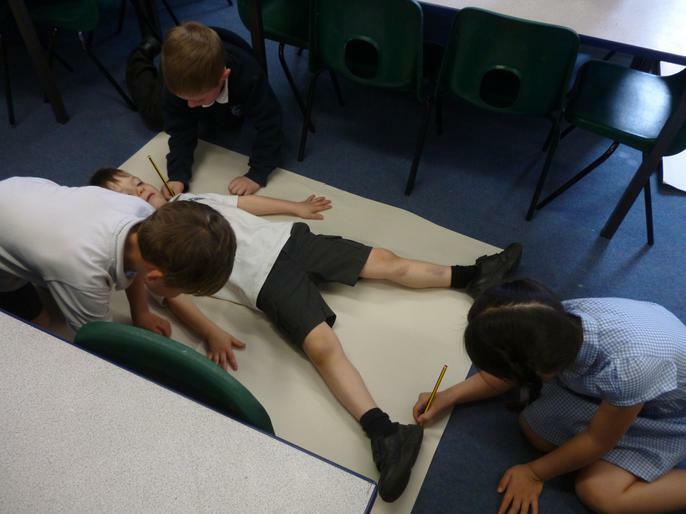 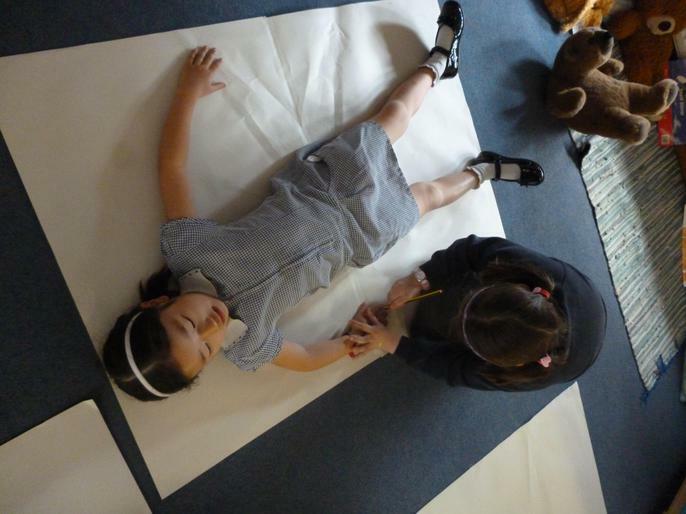 Year 1 have been studying measurement this week. 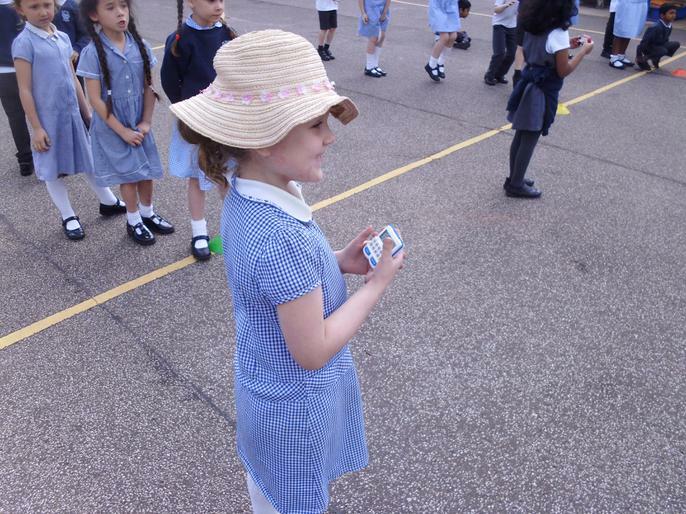 Today we were using the timers to record how quickly teams could complete their races. 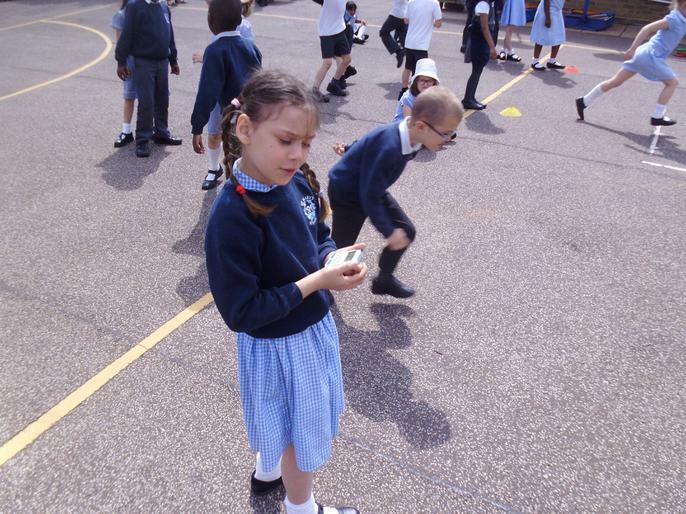 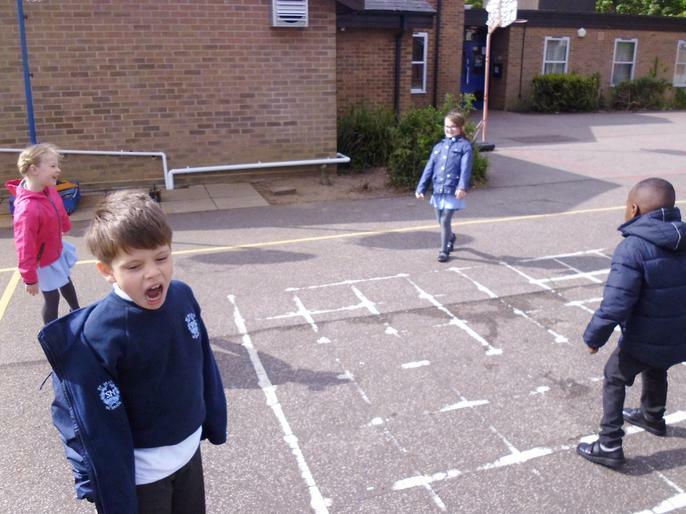 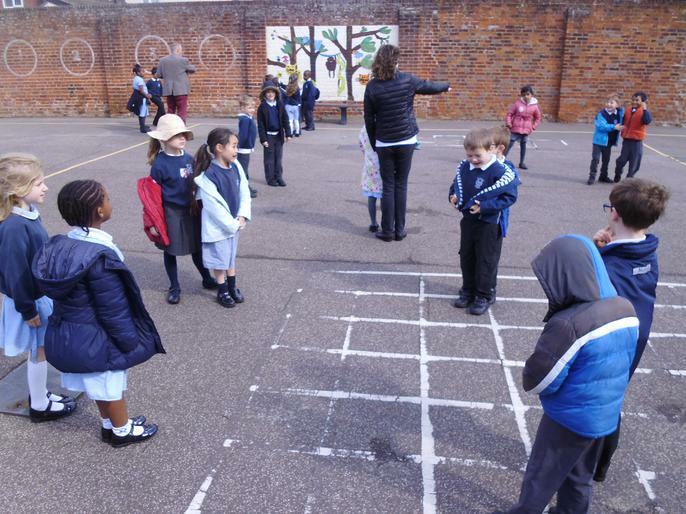 Learning about fractions on the playground. 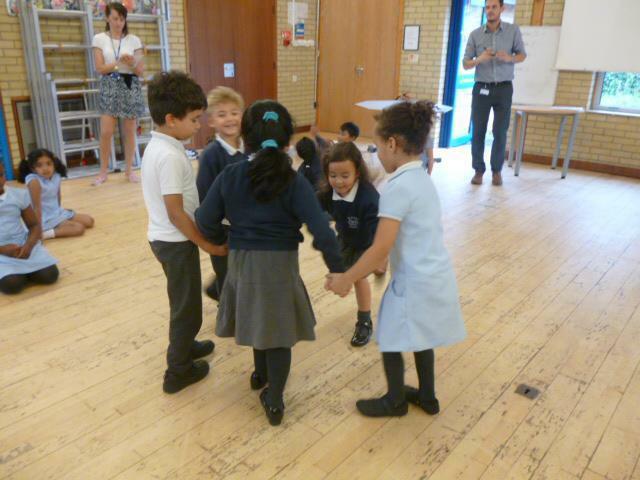 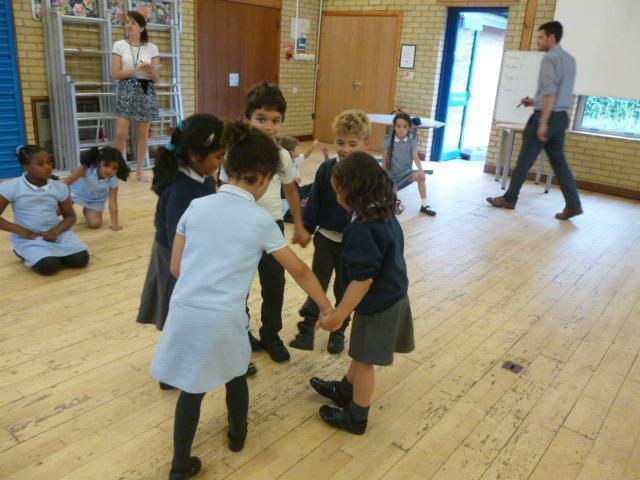 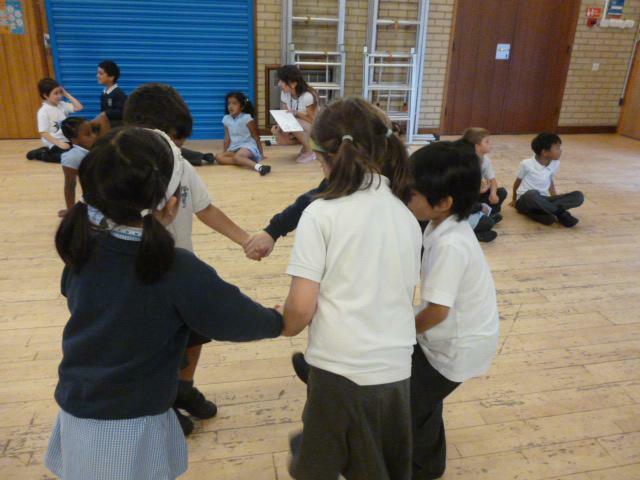 We got into groups and split up into a half or a quarter, it proved to be quite a challenge! 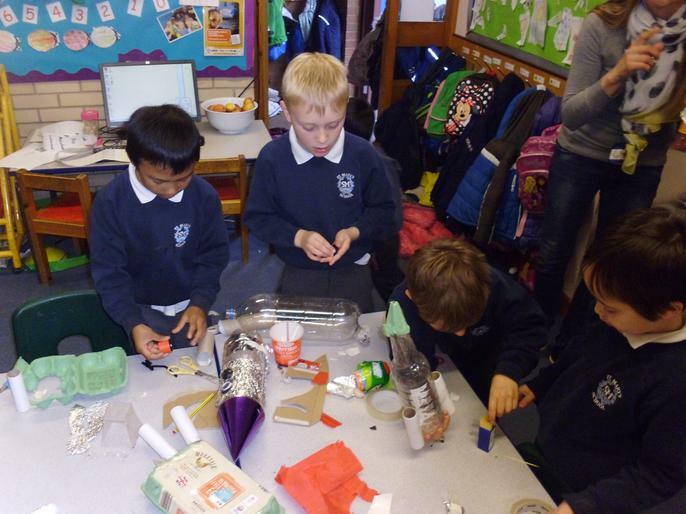 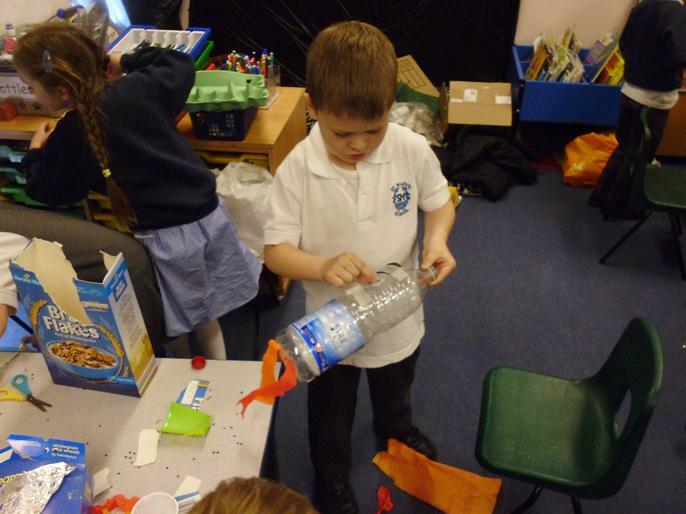 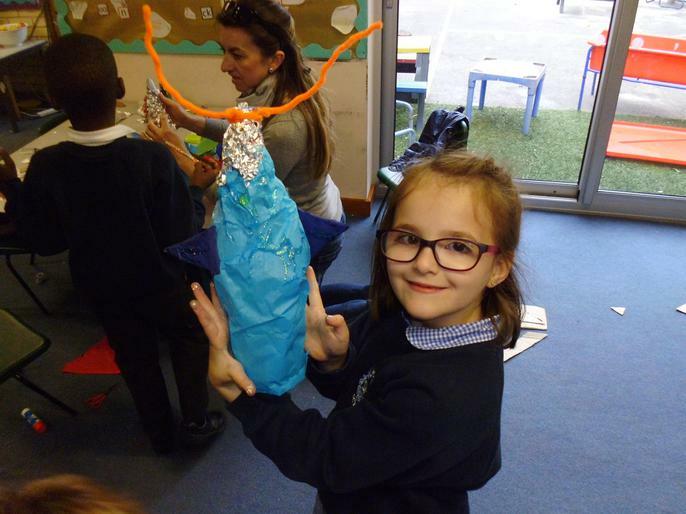 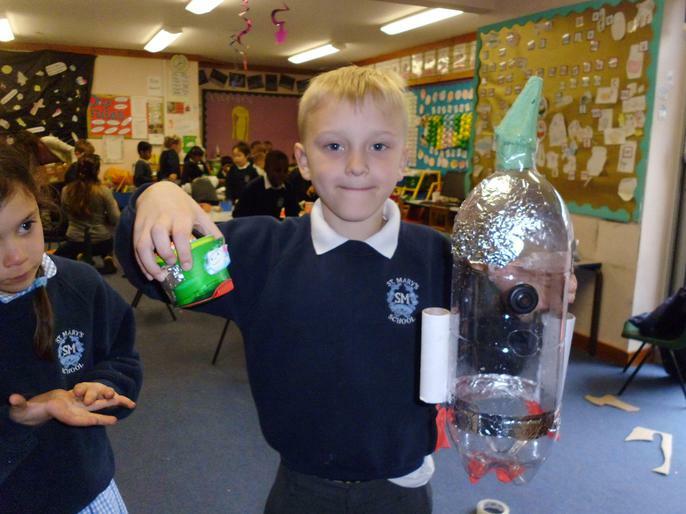 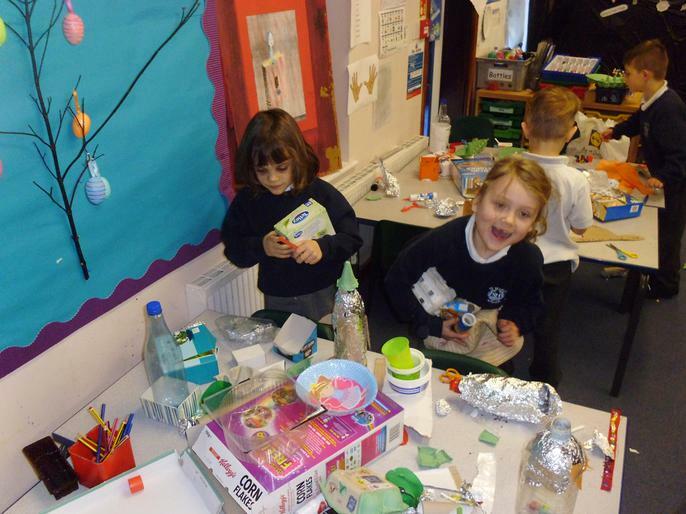 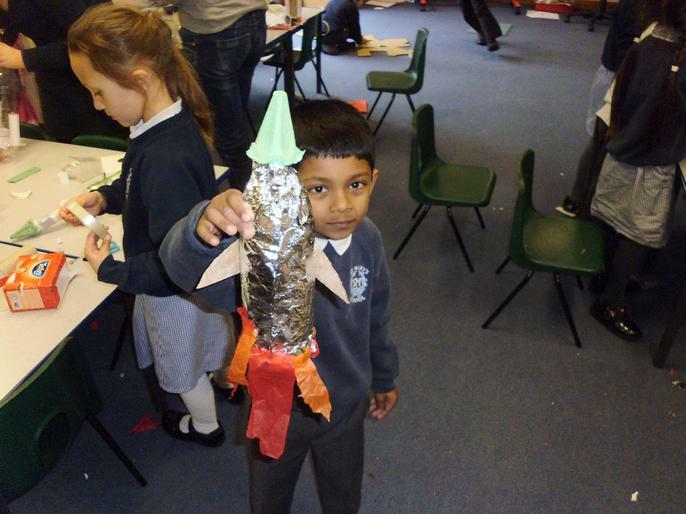 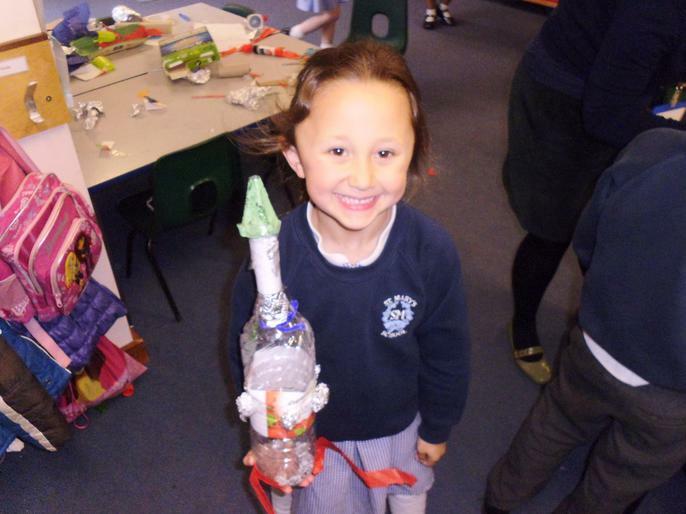 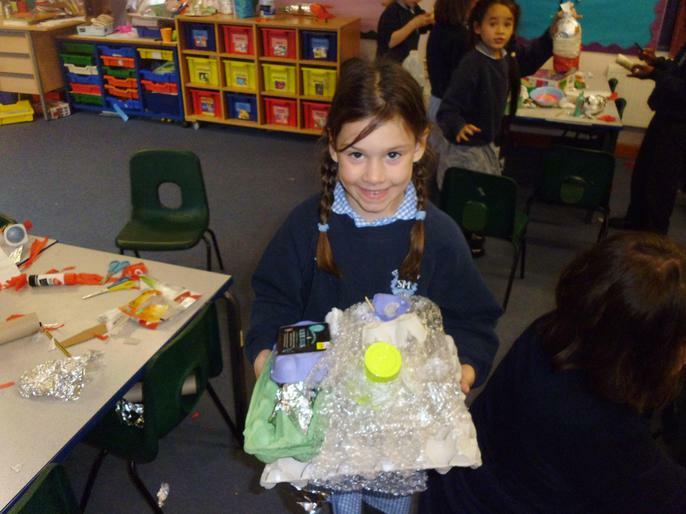 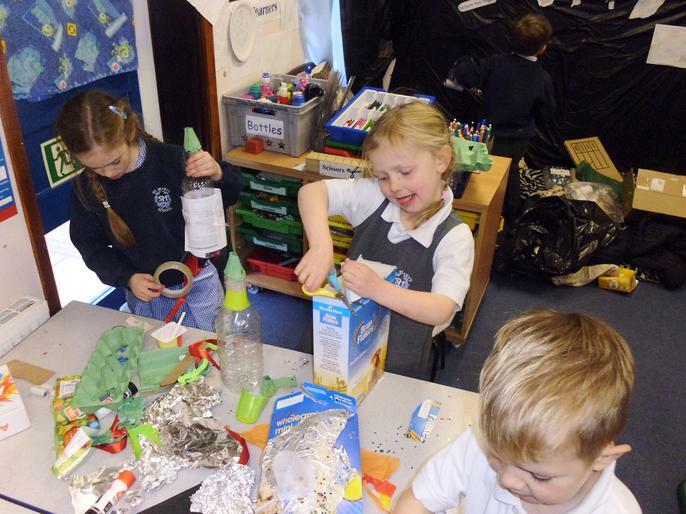 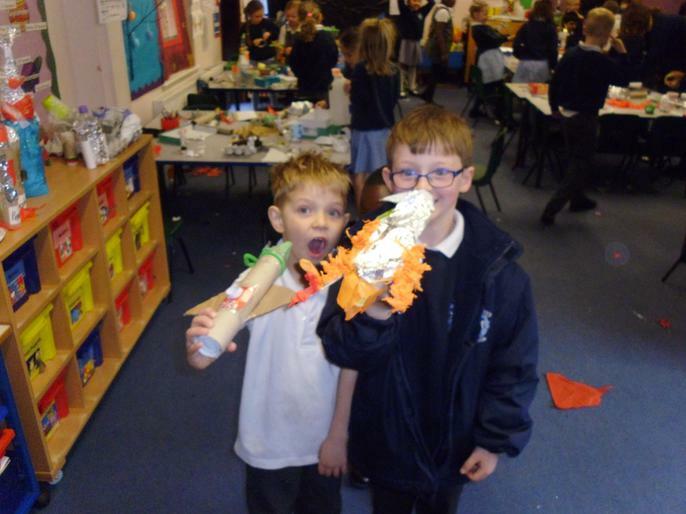 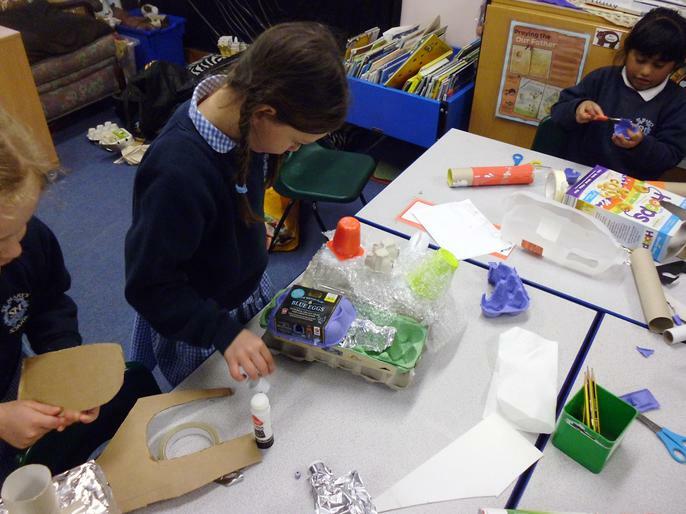 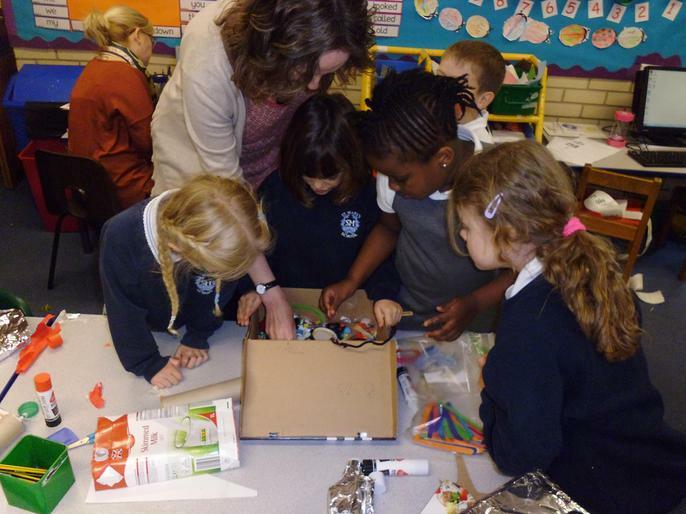 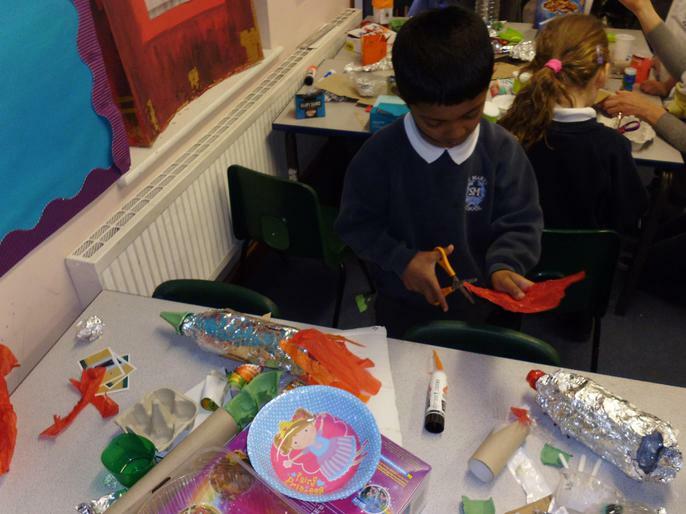 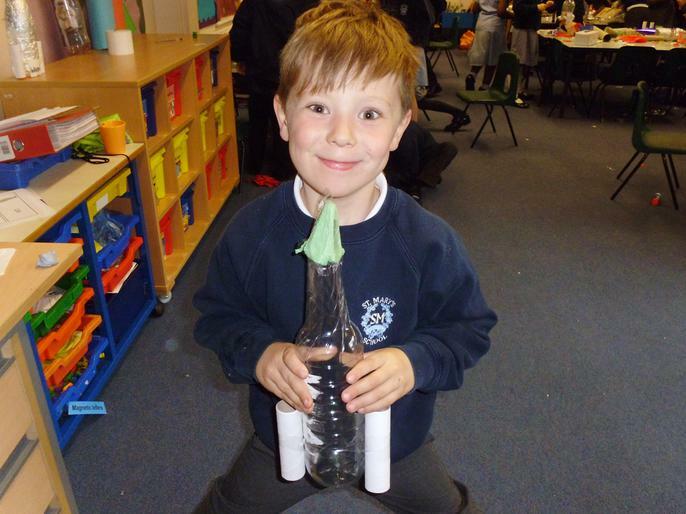 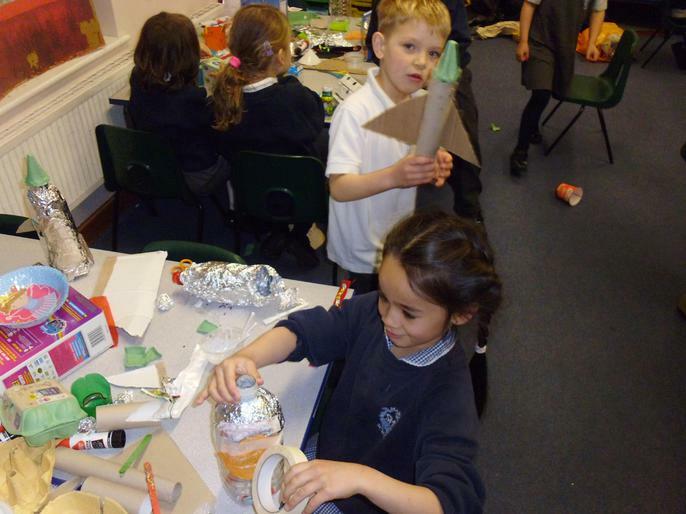 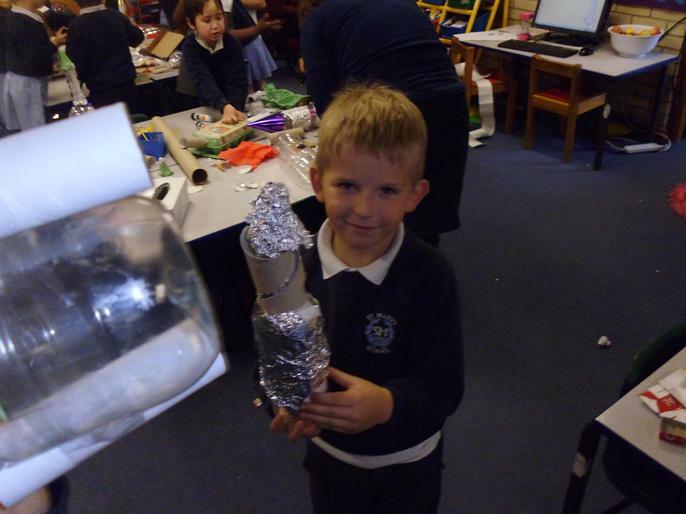 Your recycling was put to good use today as we made our spaceships. 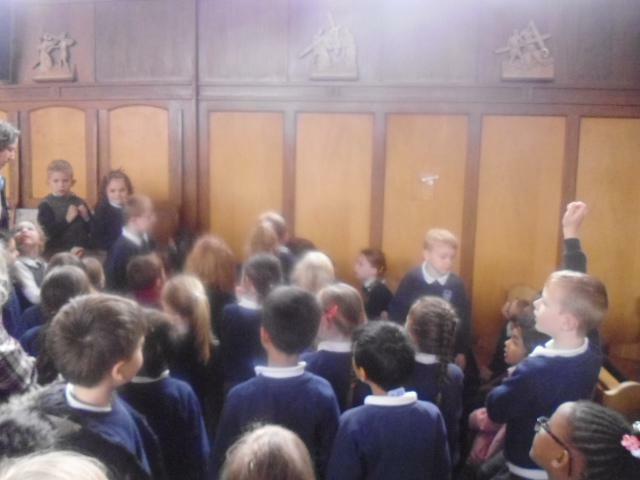 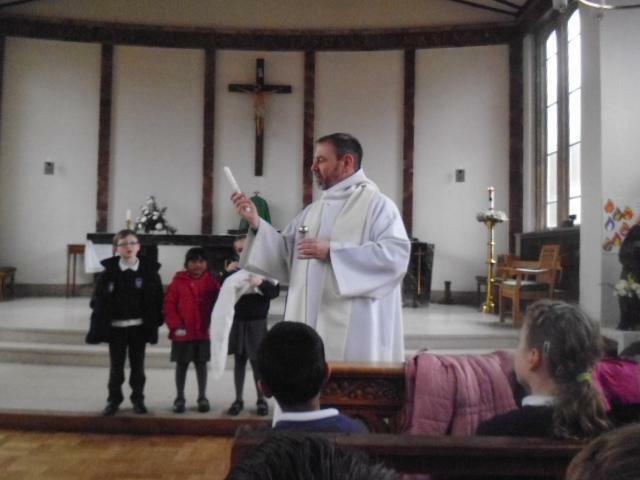 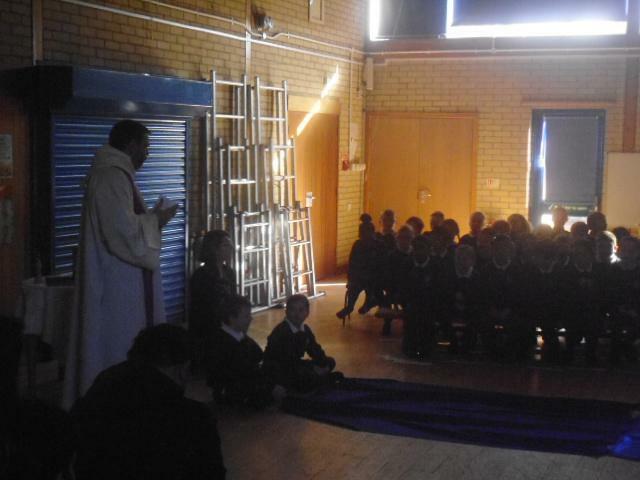 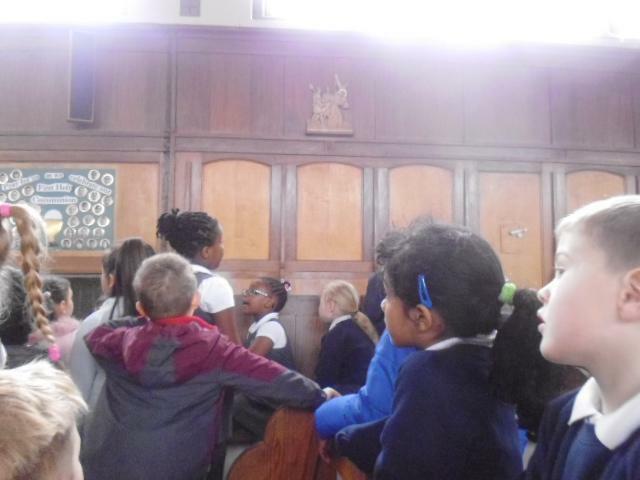 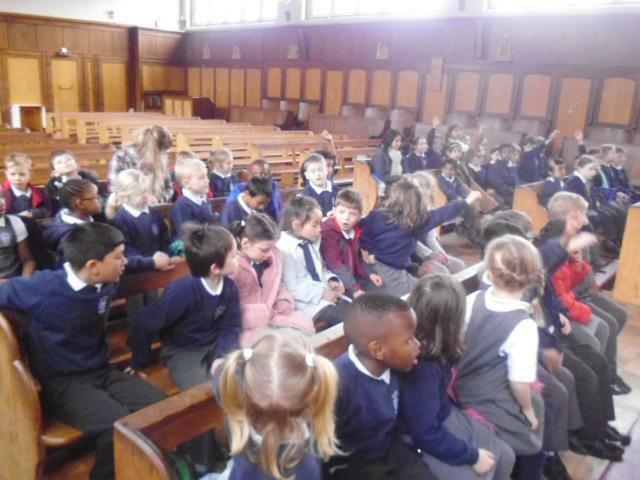 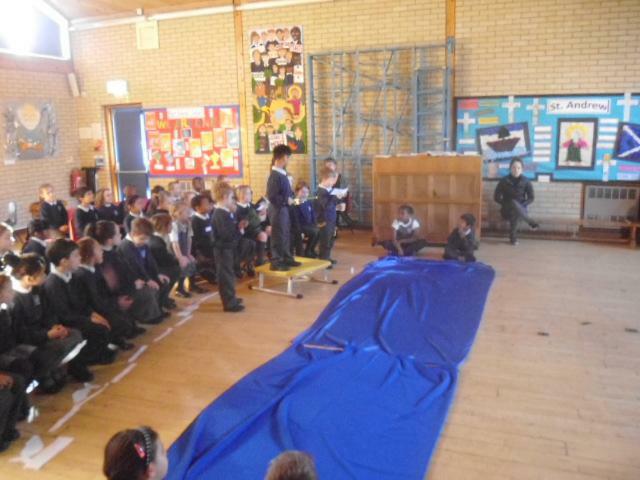 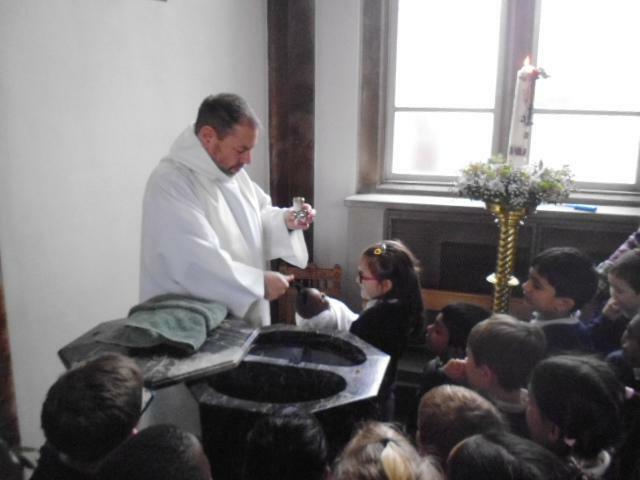 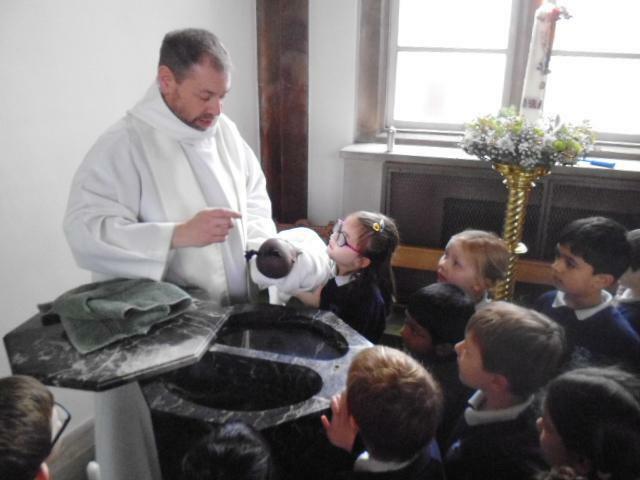 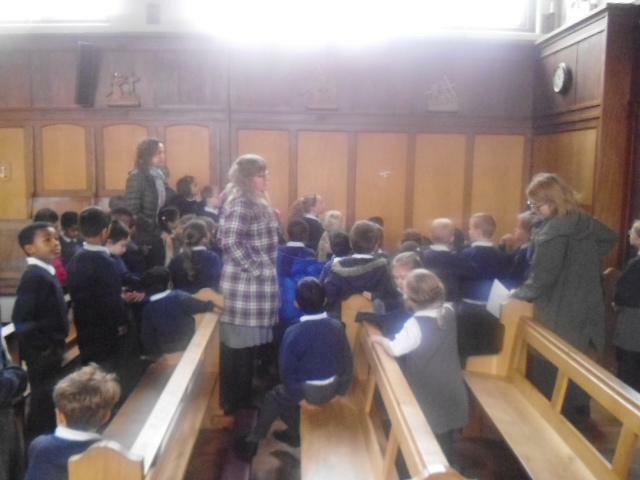 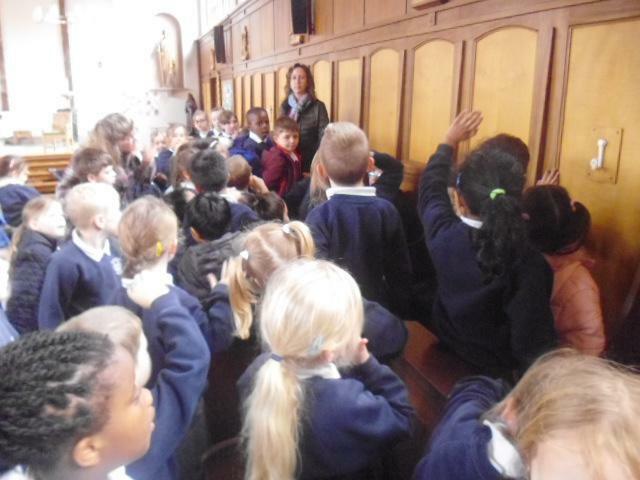 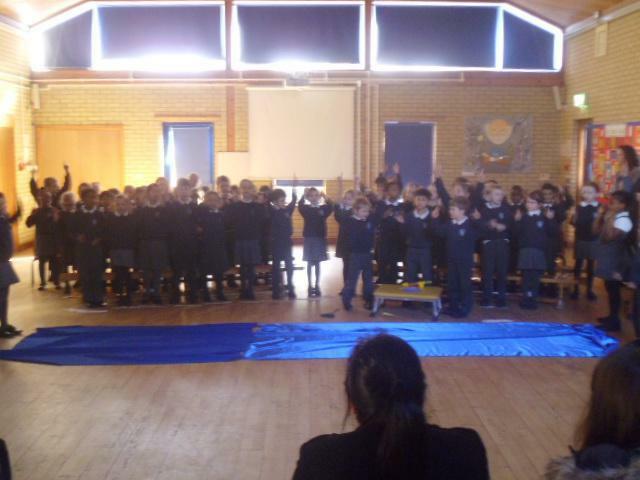 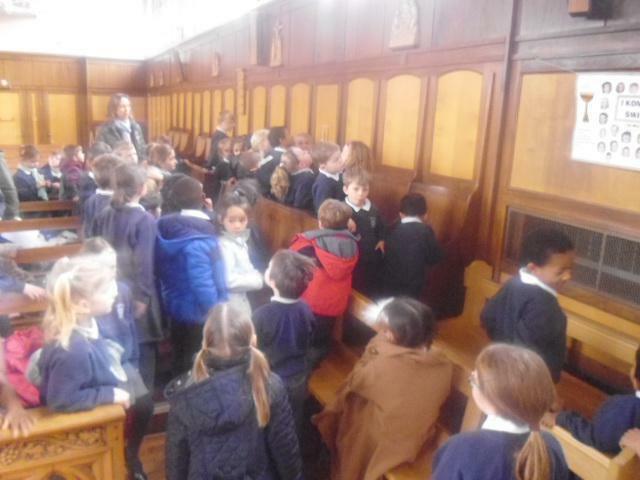 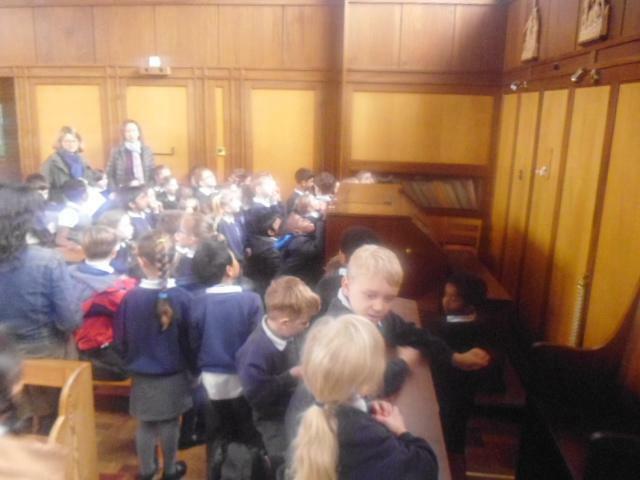 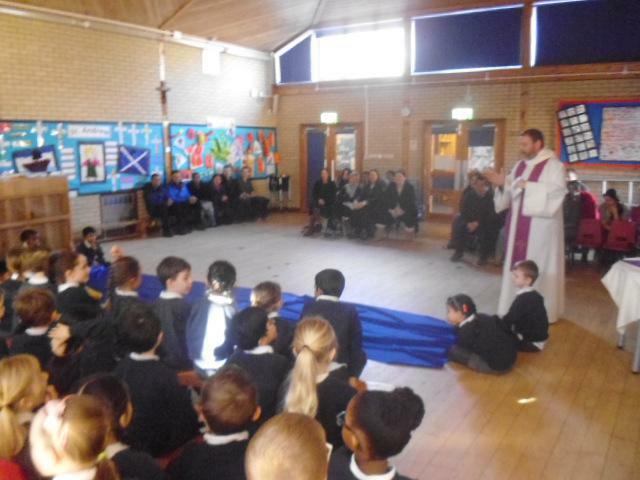 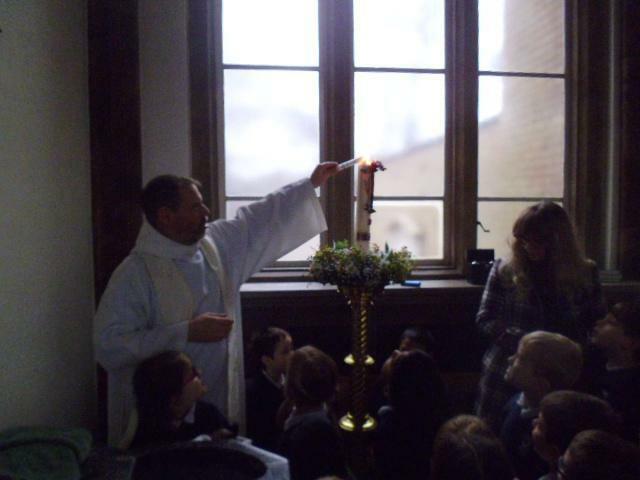 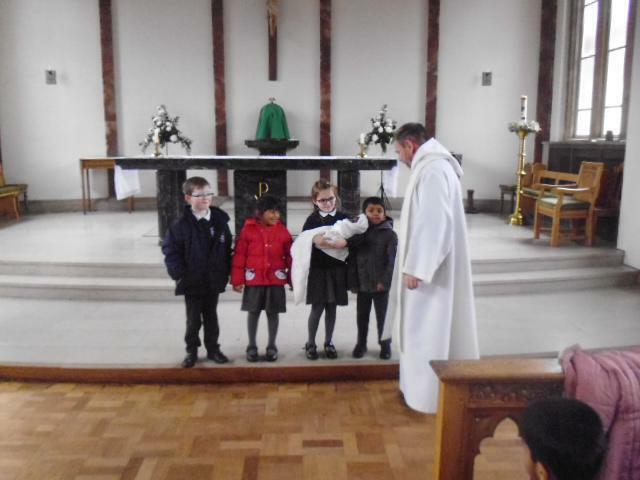 Key Stage 1 went to church today to look at the stations of the Cross. 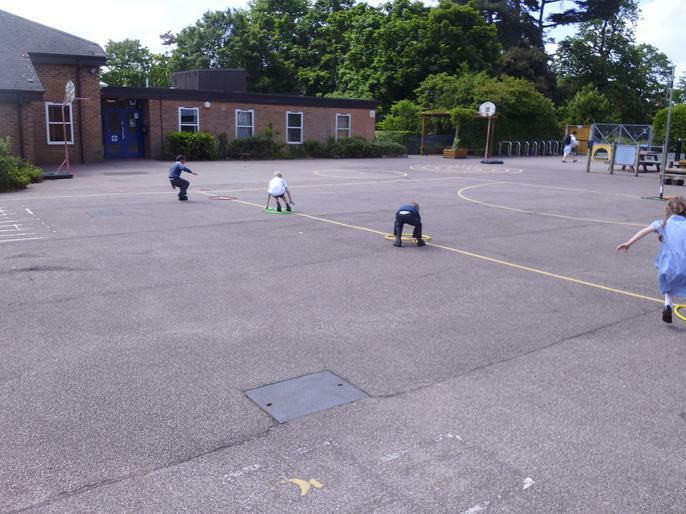 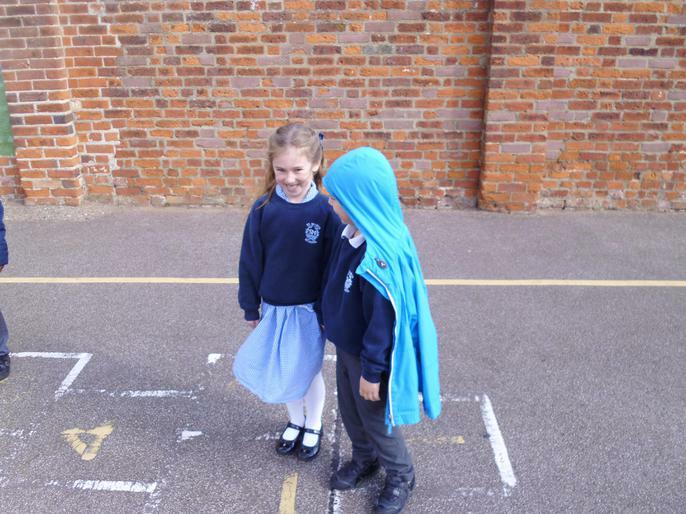 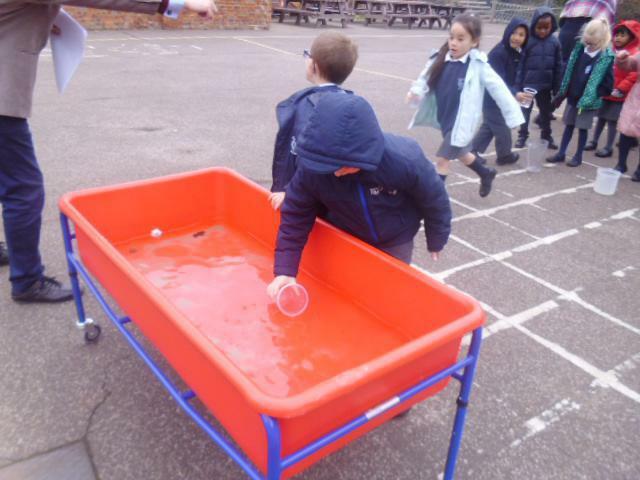 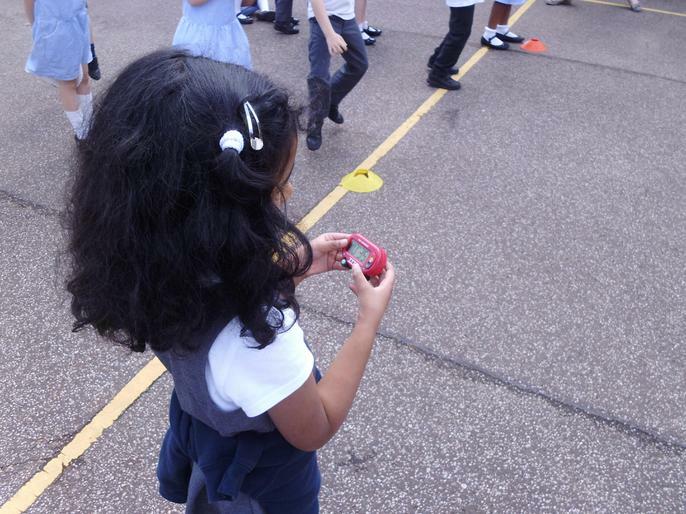 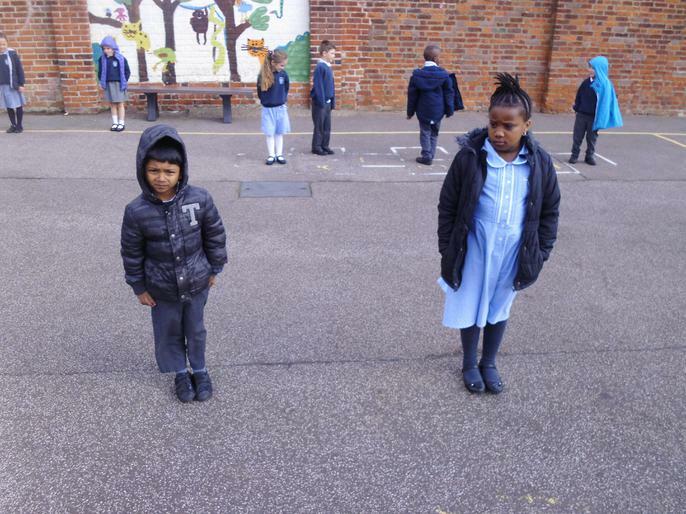 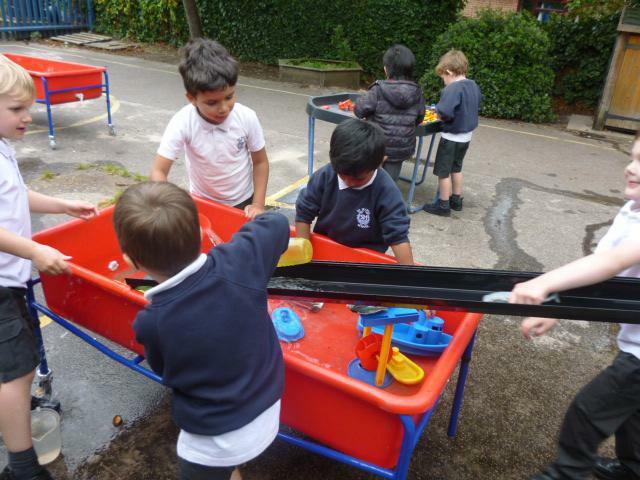 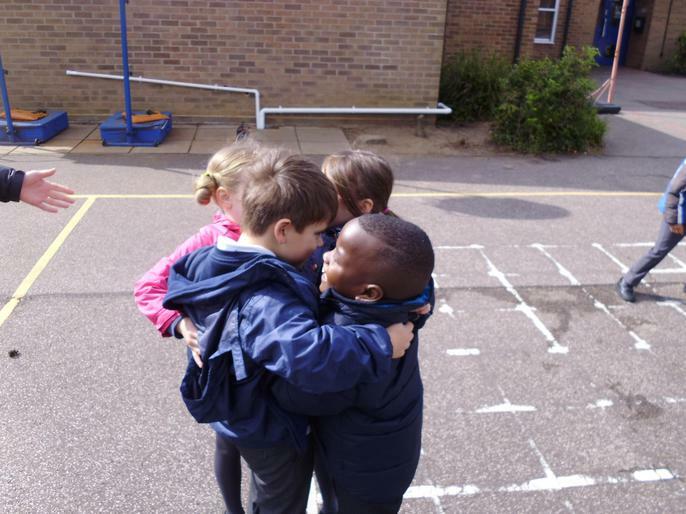 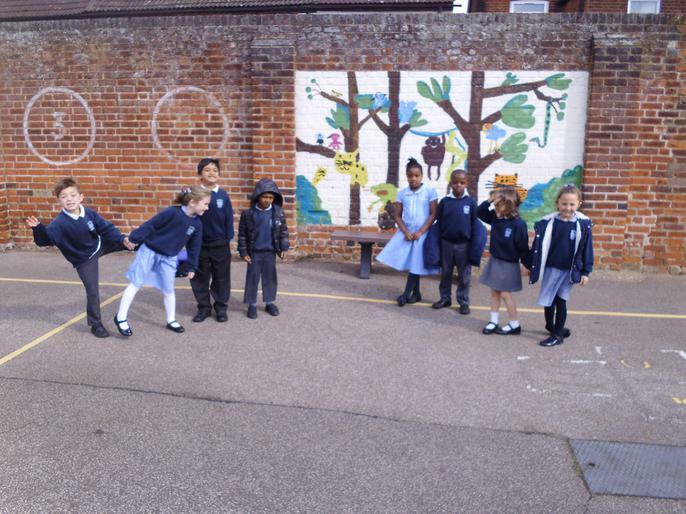 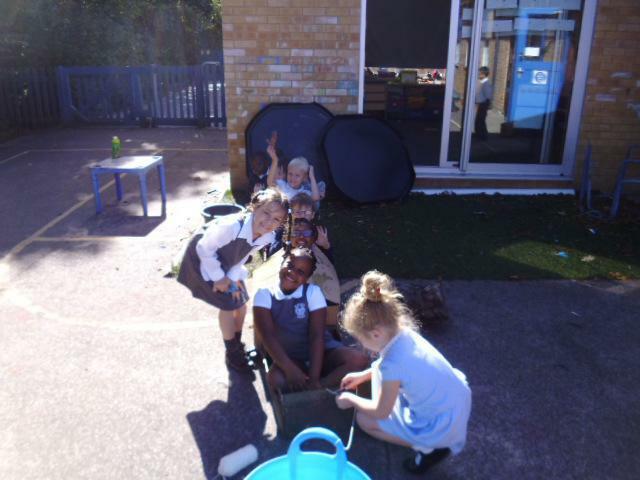 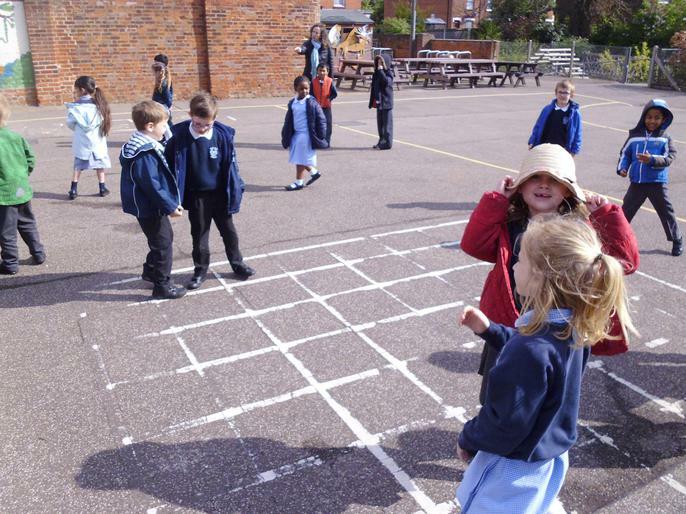 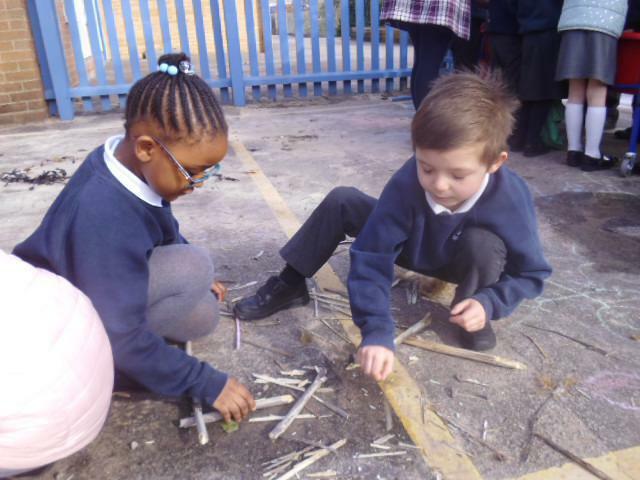 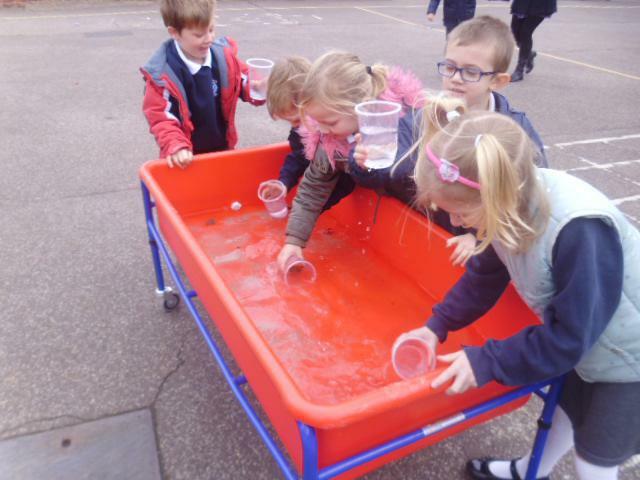 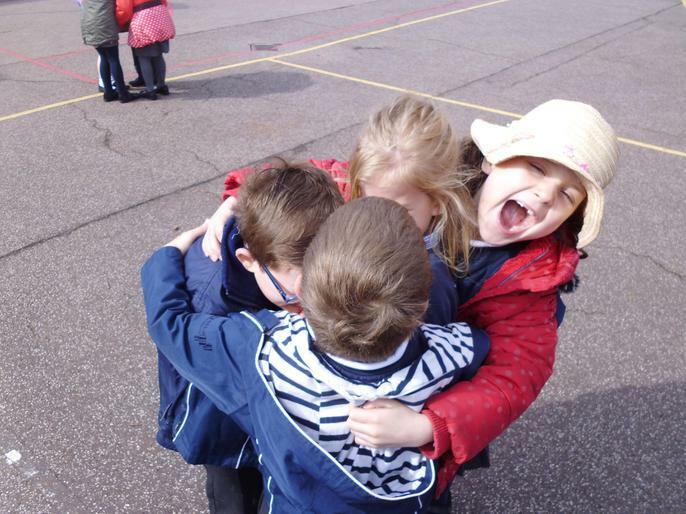 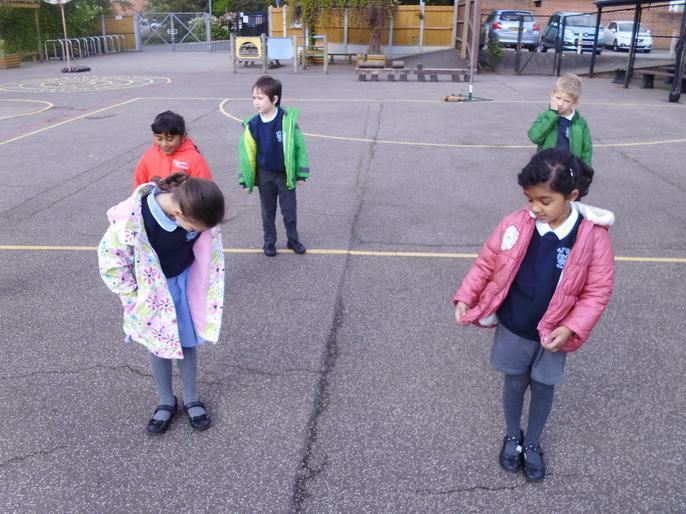 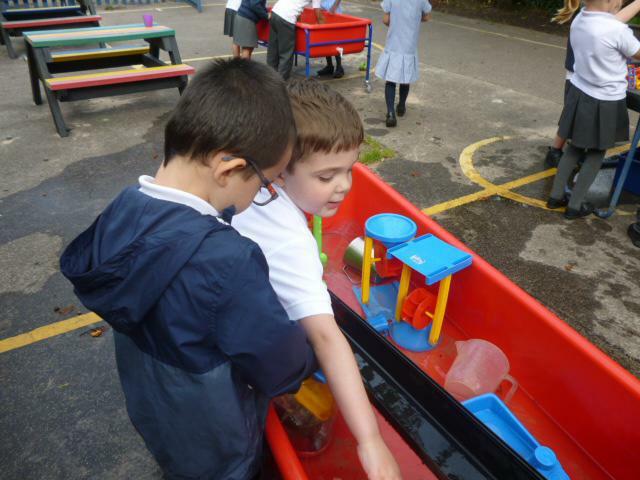 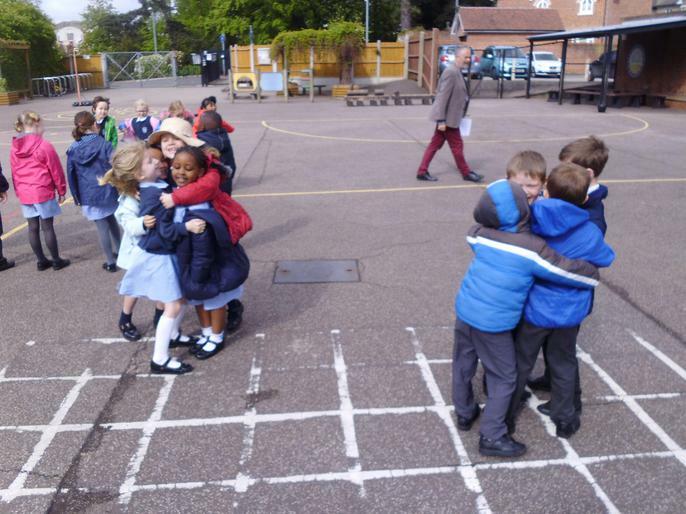 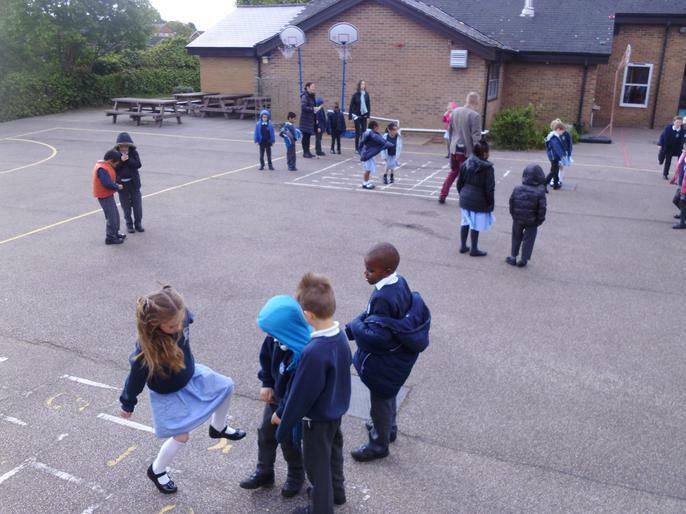 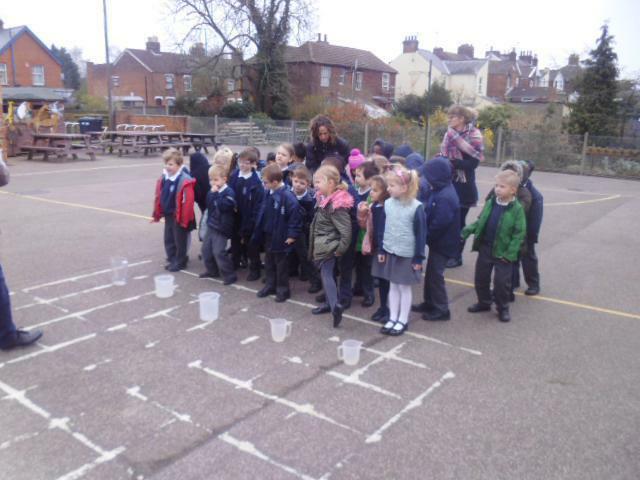 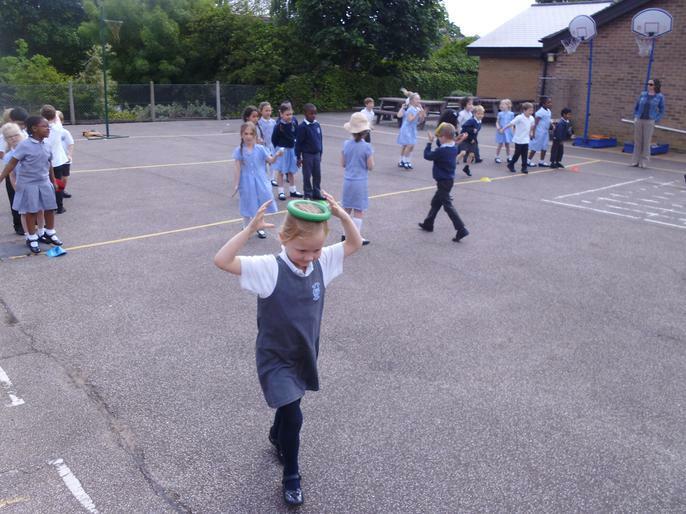 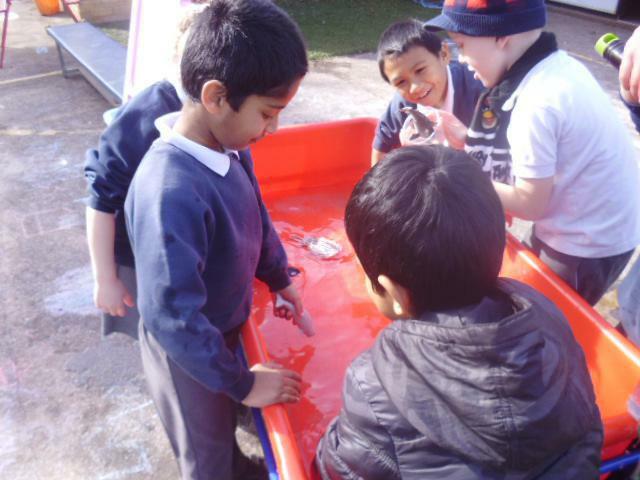 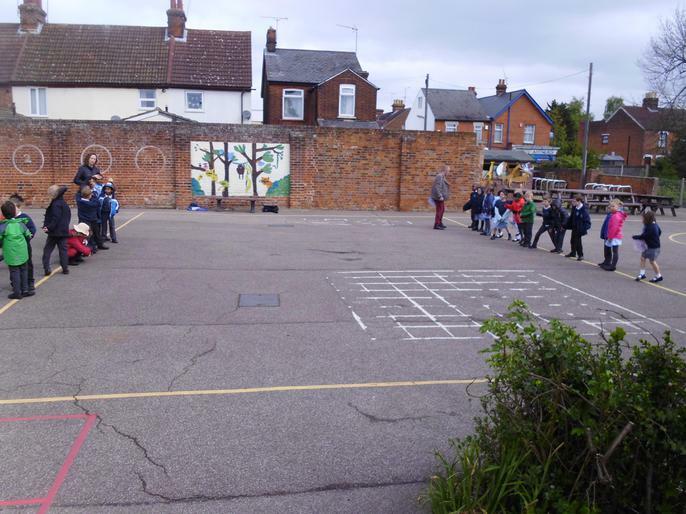 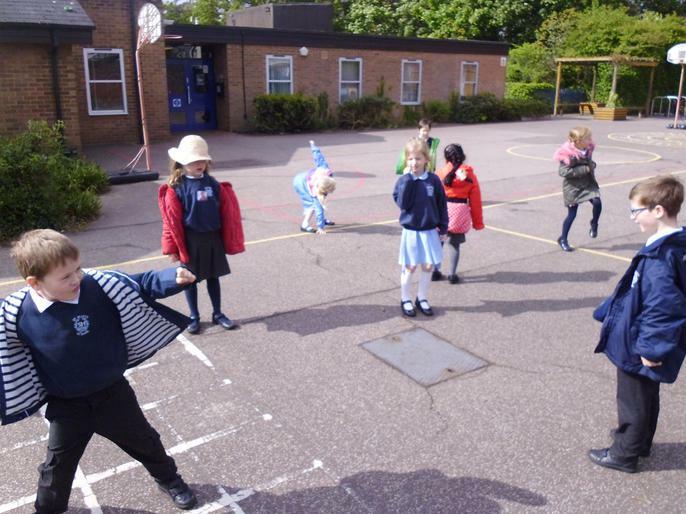 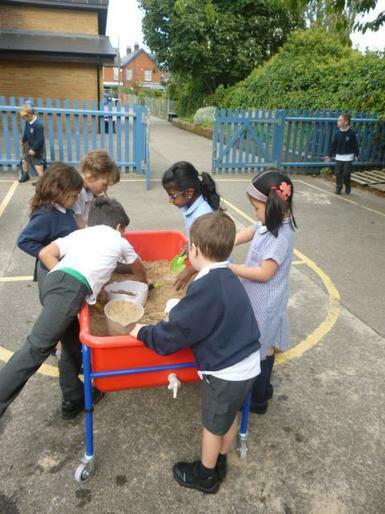 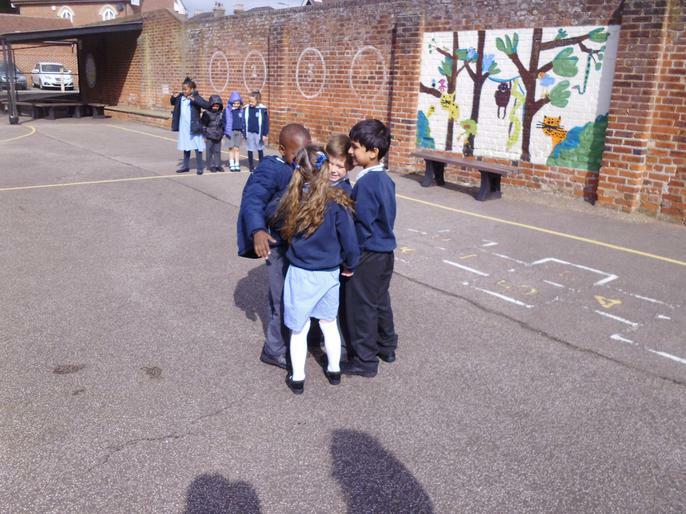 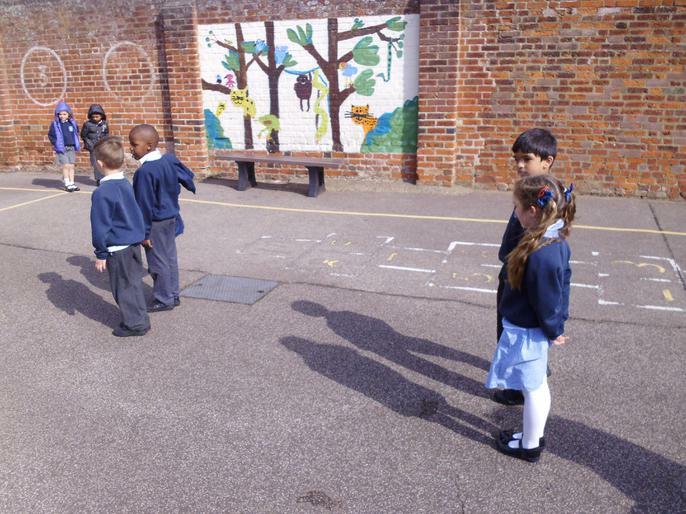 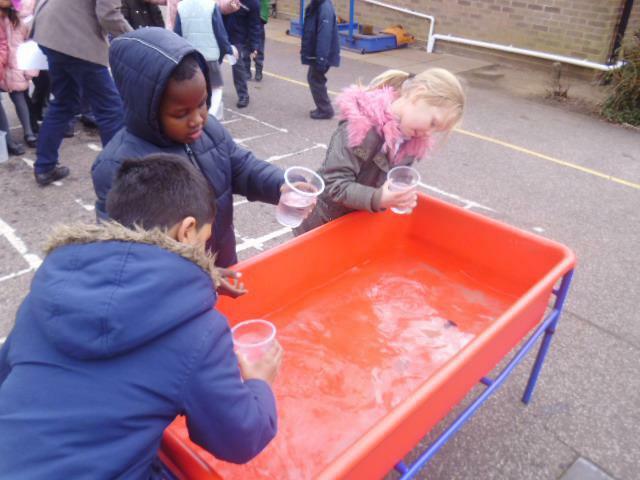 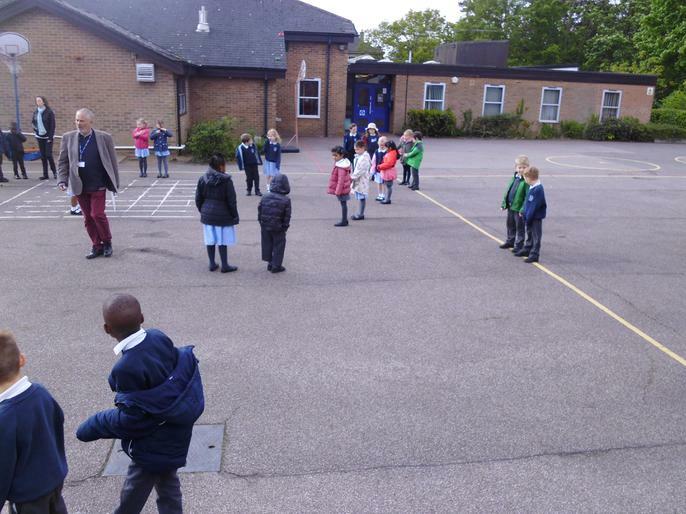 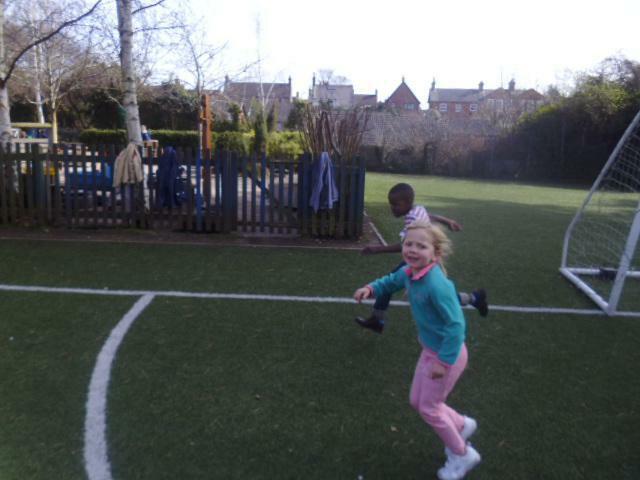 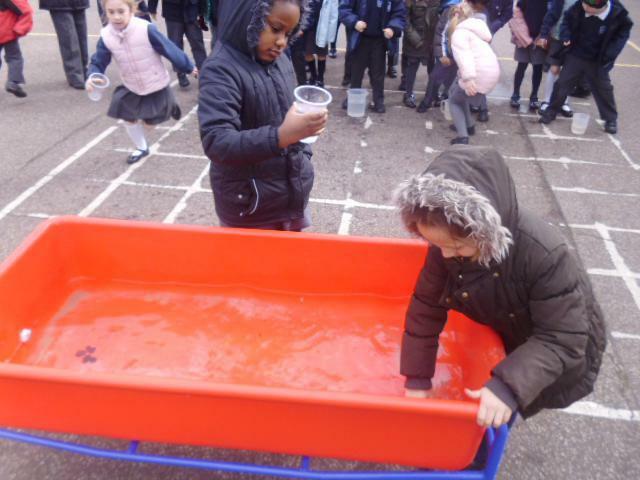 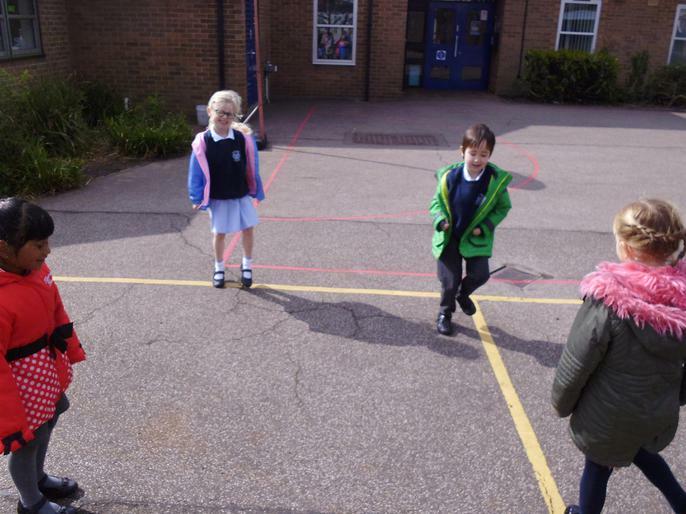 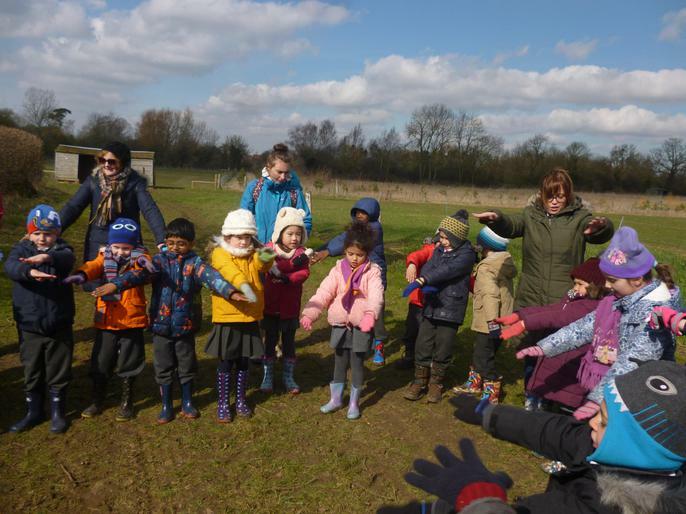 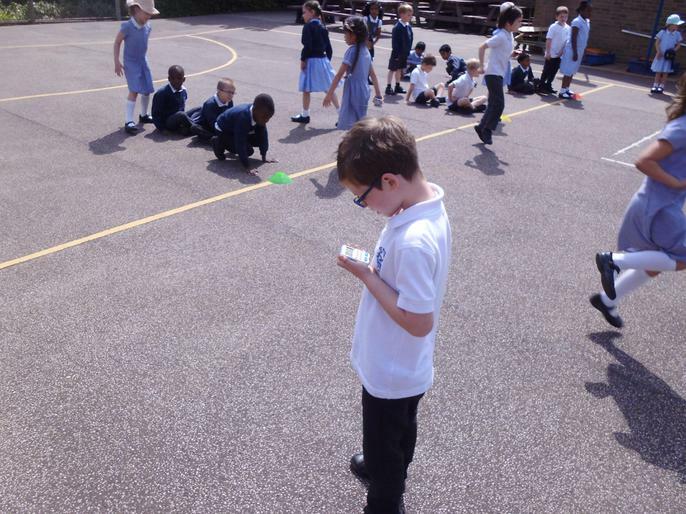 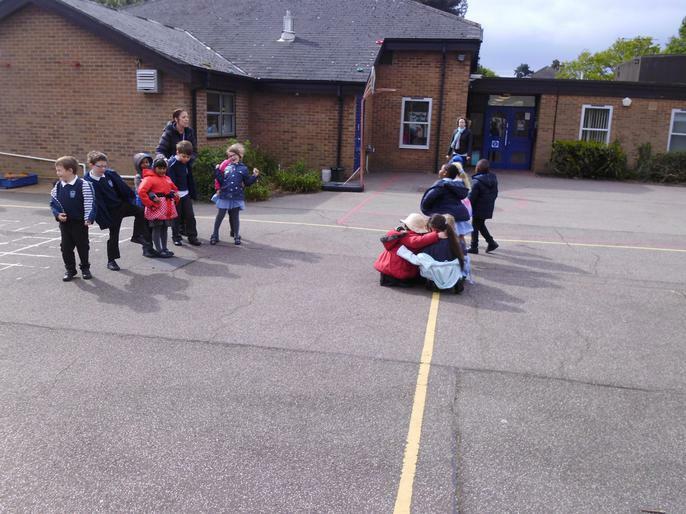 Year 1 went outside this morning to learn about capacity. 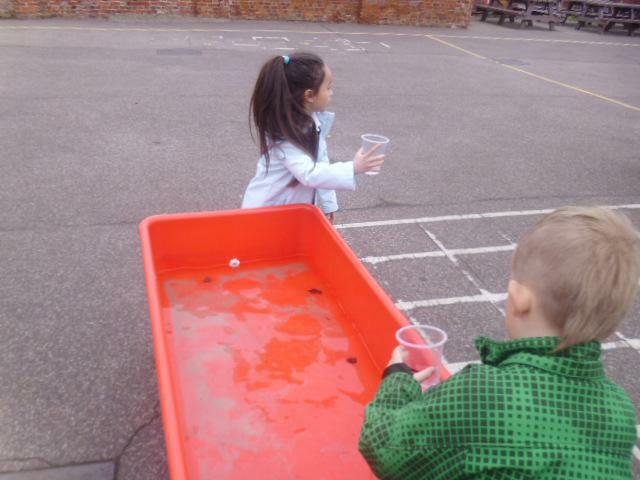 The children raced to fill the cups full, half-full and quarter full. 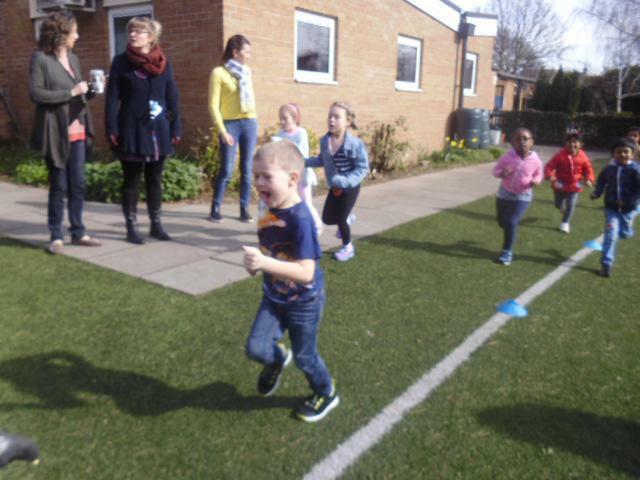 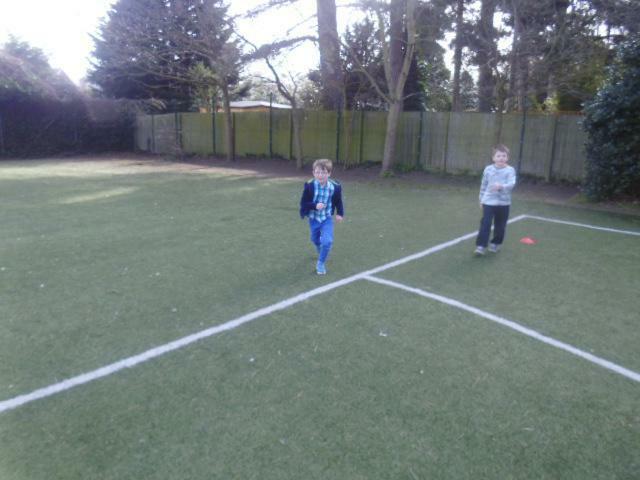 Well done to all the children who competed in our fundraising event this morning. 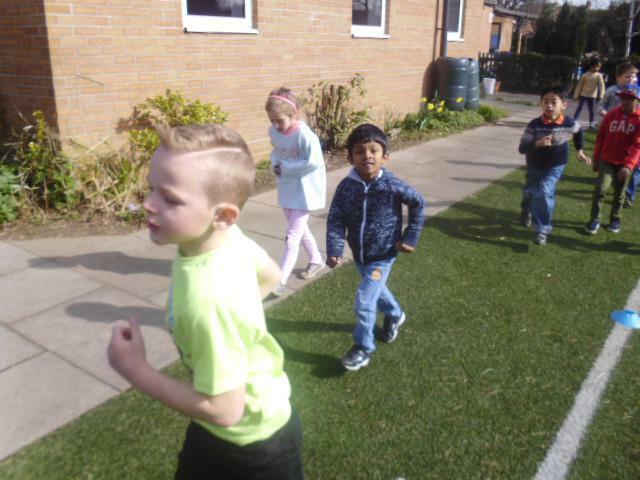 We let the children count the laps they ran with some claiming to have completed over 2,000 (the equivalent of running from London to Manchester) although 15 was the average. 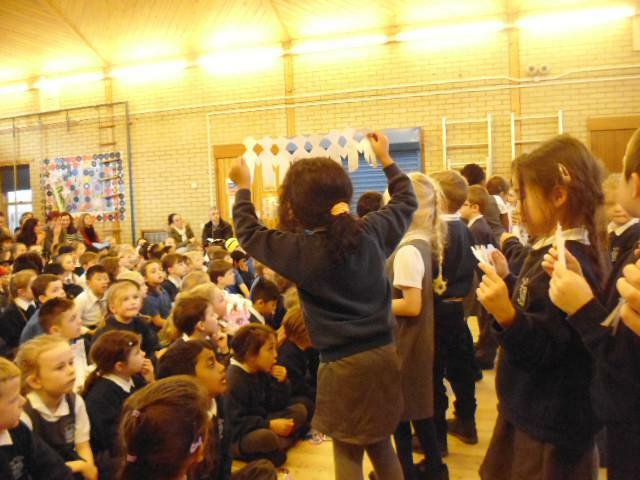 It is a fantastic cause and we all had a great time. 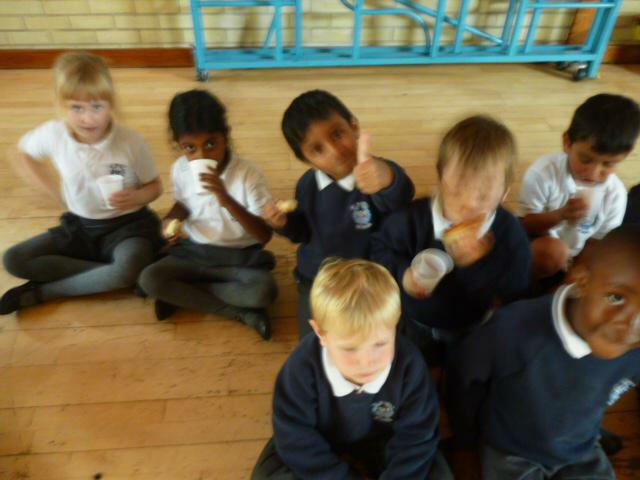 Don't forget to join us for the cake sale next week when we will be aiming to sell over 2 billion buns! 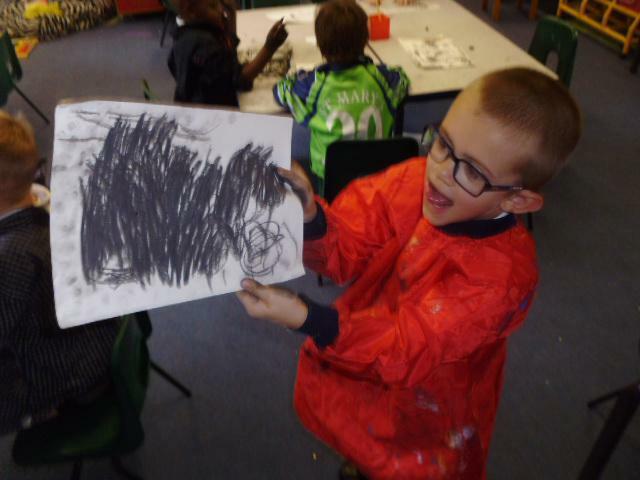 Our new text is 'The storm Whale' by Benji Davies. 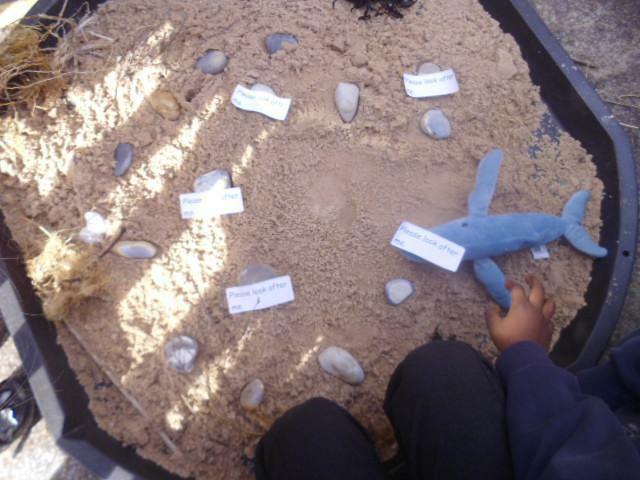 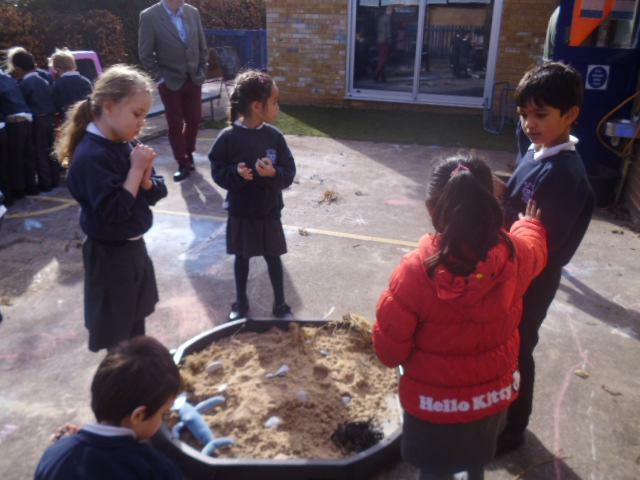 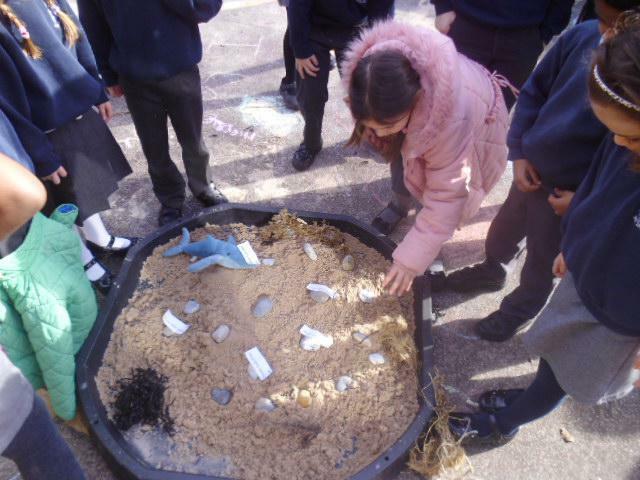 After a storm, we left the classroom to find a whale on the sand along with many stones that we have adopted. 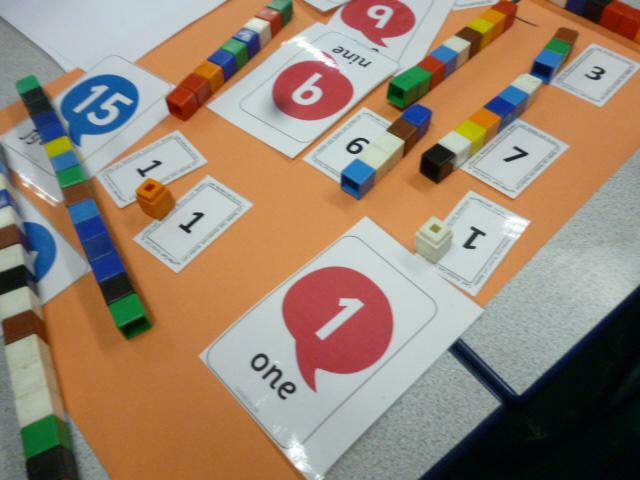 Sharing out blocks to find half of a given number. 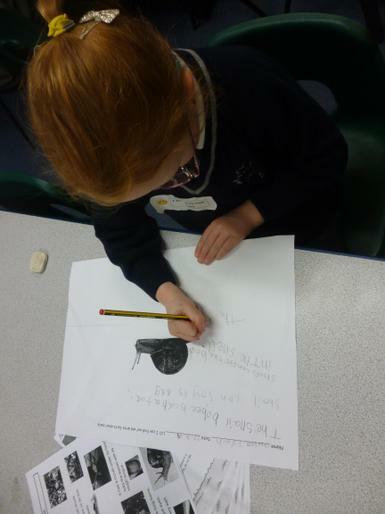 Inspired by Michael Rosen we wrote our own jellyfish poems. 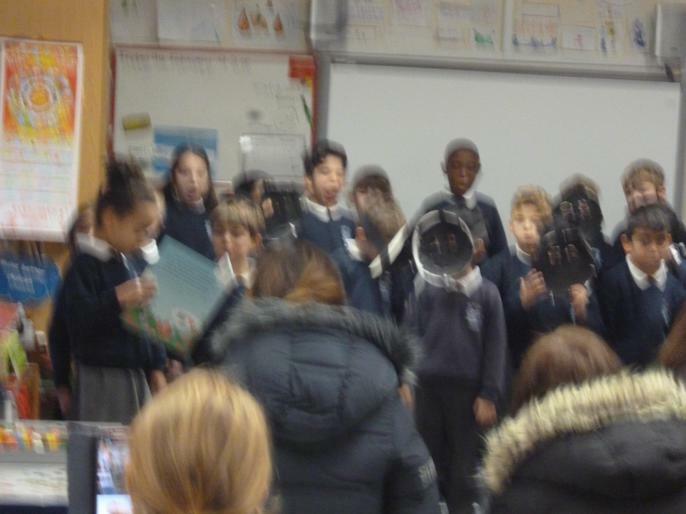 Here some children are reciting for the class. 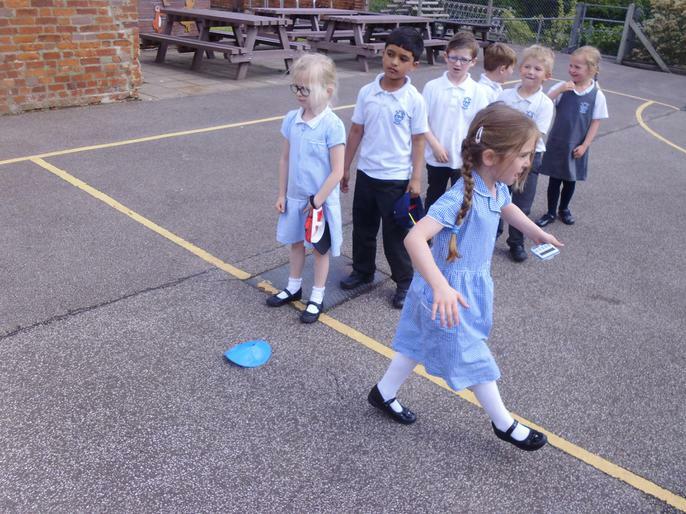 We went on a number hunt around the classroom. 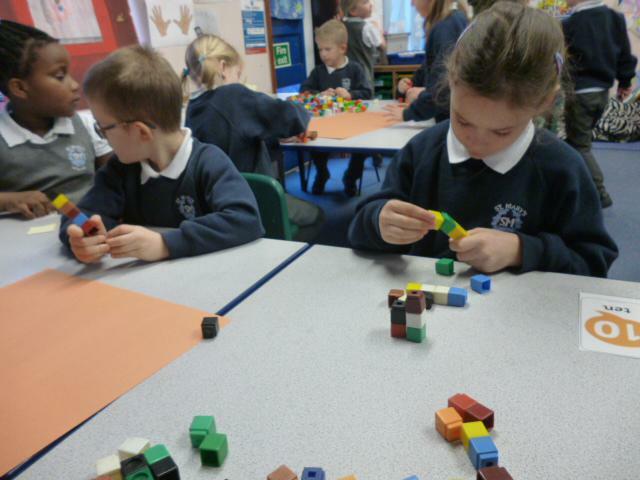 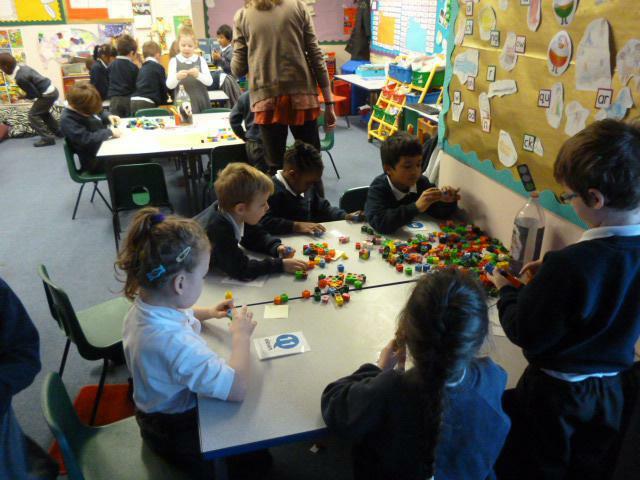 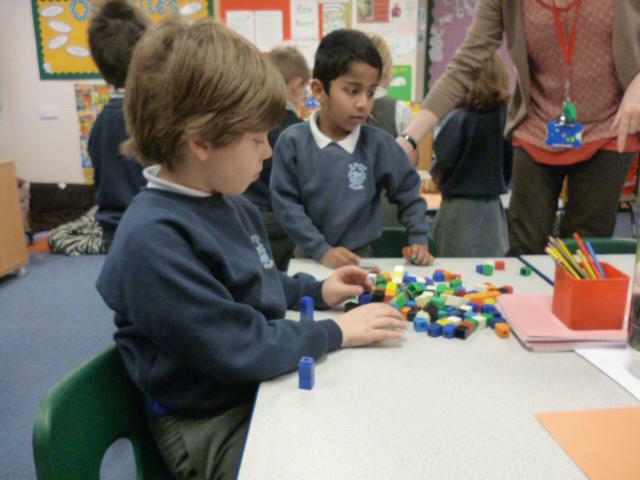 When we found a number we had to decide whether it was odd or even using the blocks. 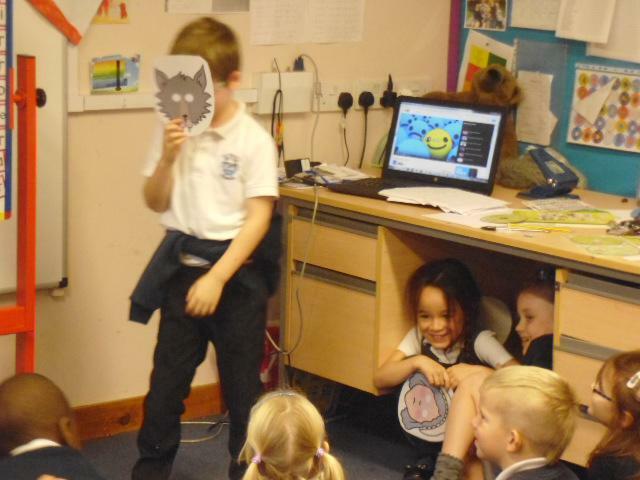 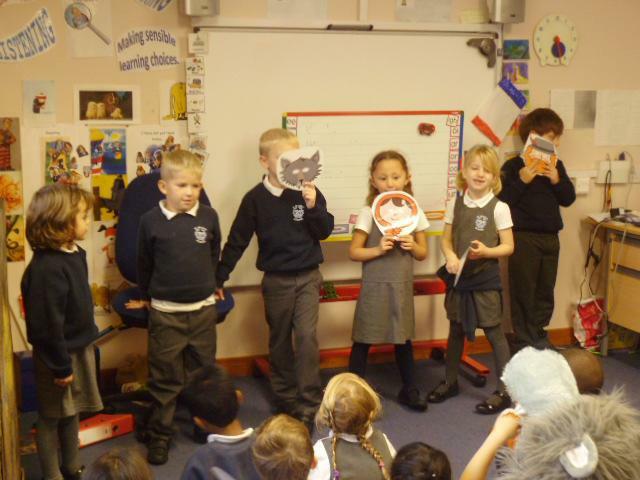 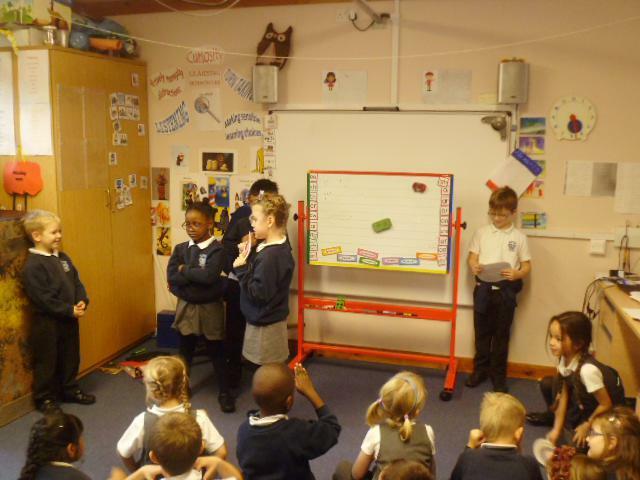 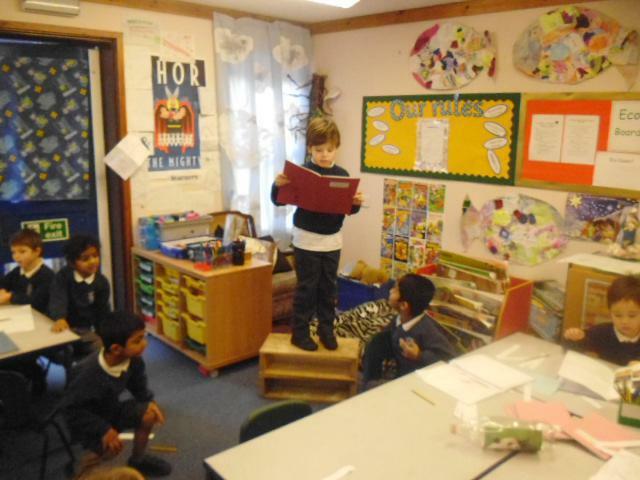 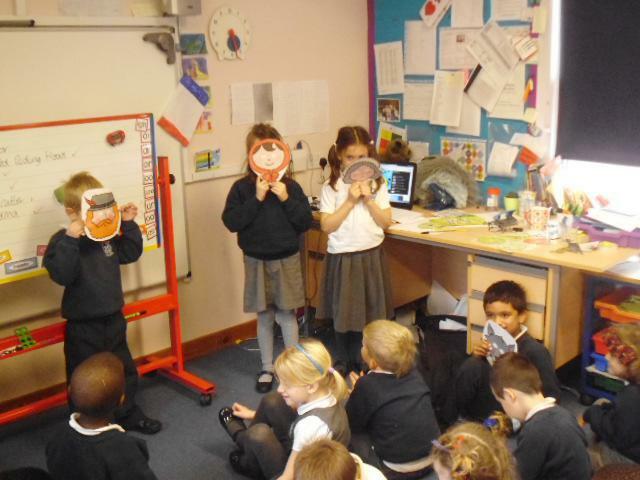 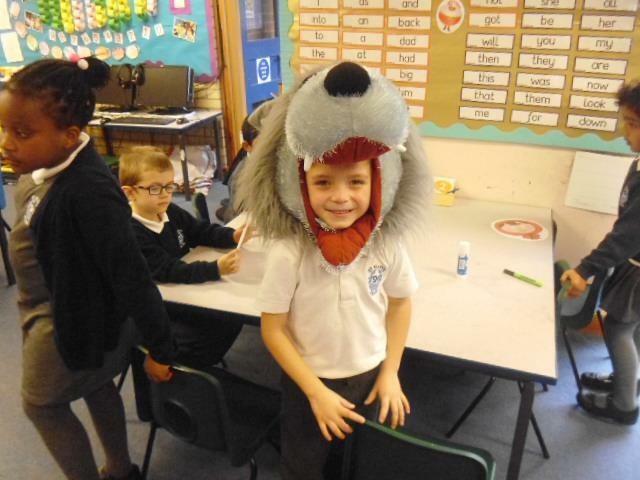 We retold the story of Little Red Riding Hood in groups. 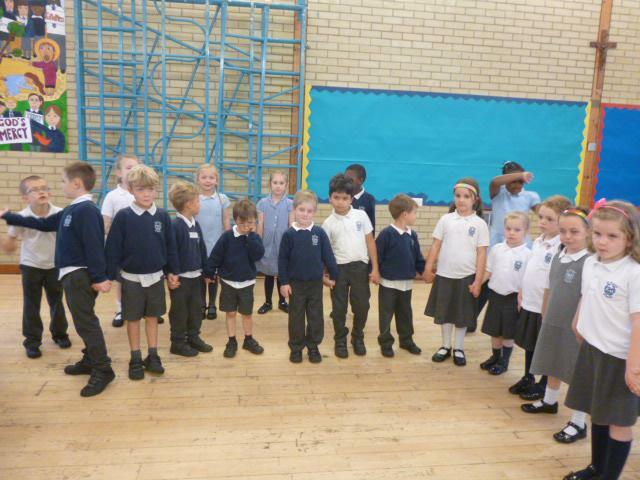 Each group then performed for the whole class. 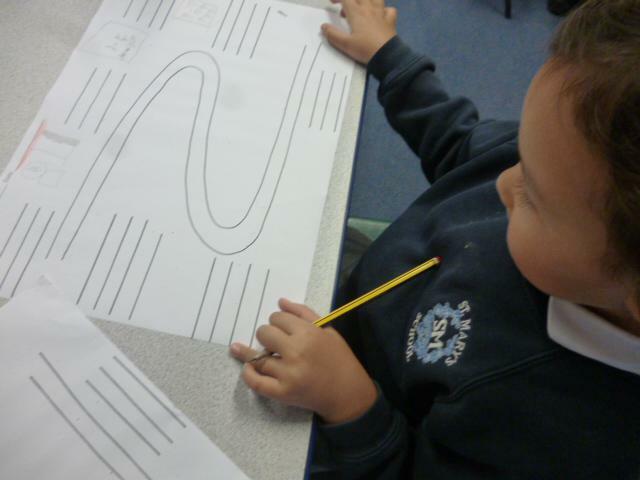 The class were learning what an algorithm is and using these sets of instructions to move a beebot around a grid. 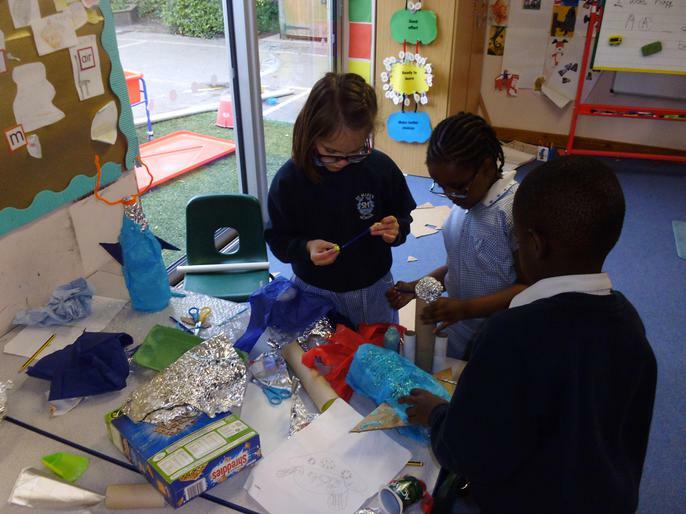 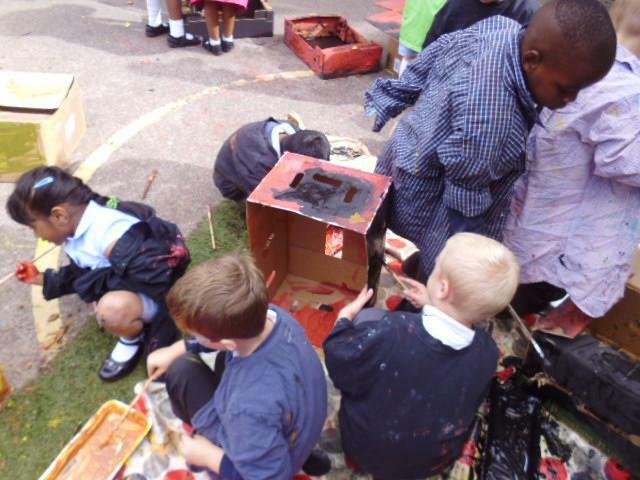 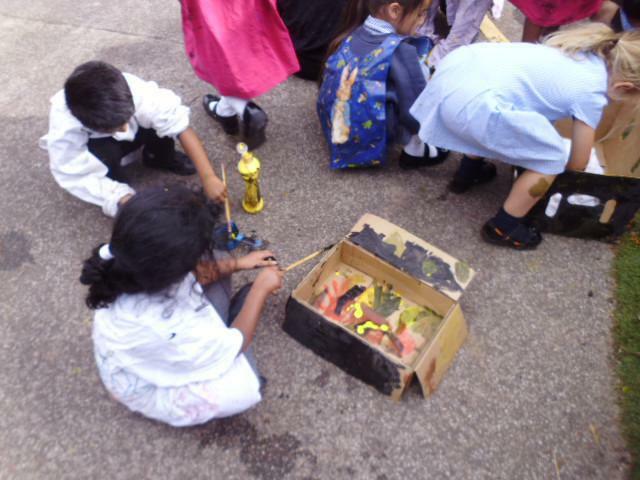 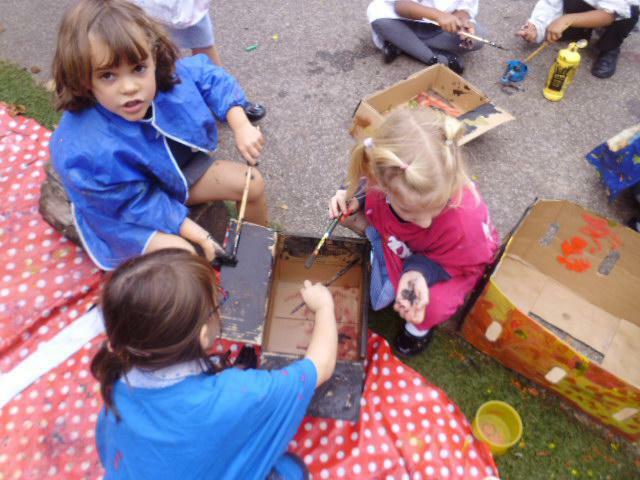 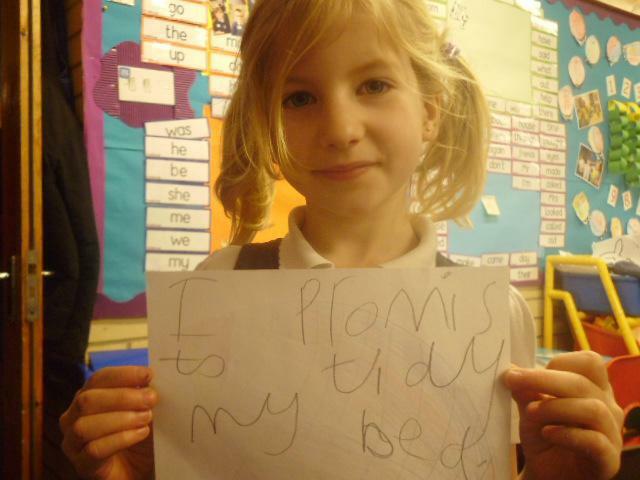 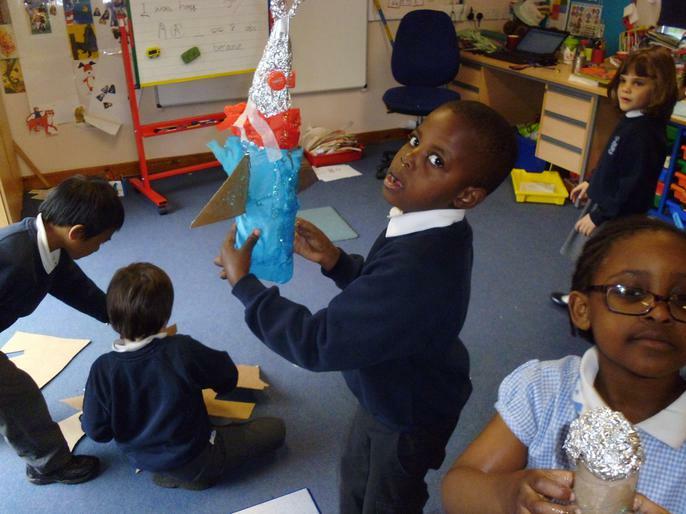 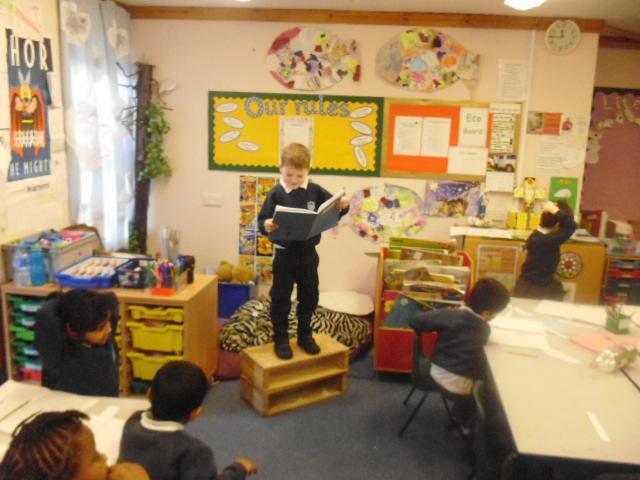 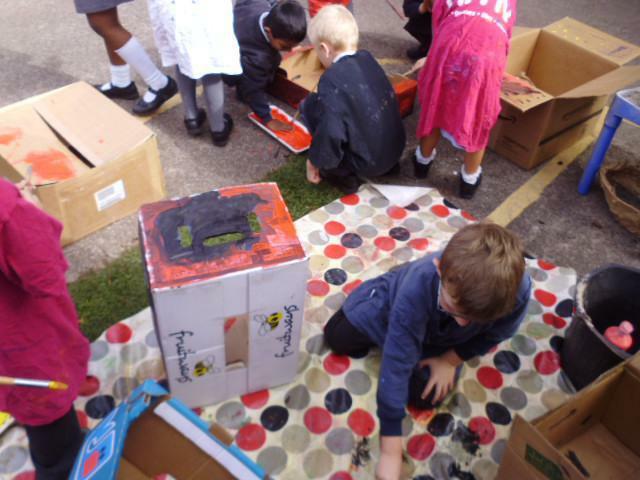 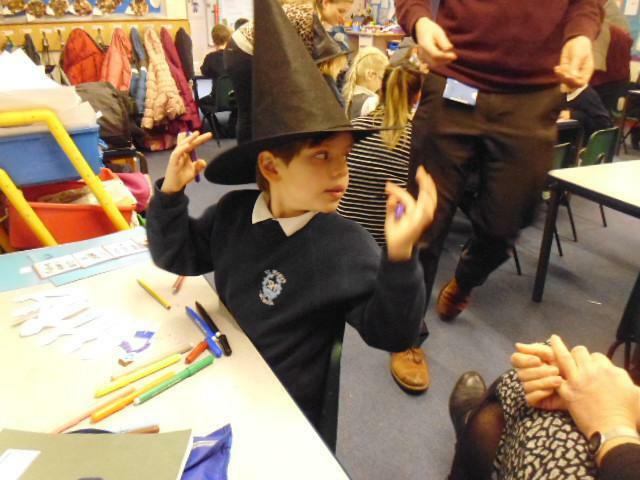 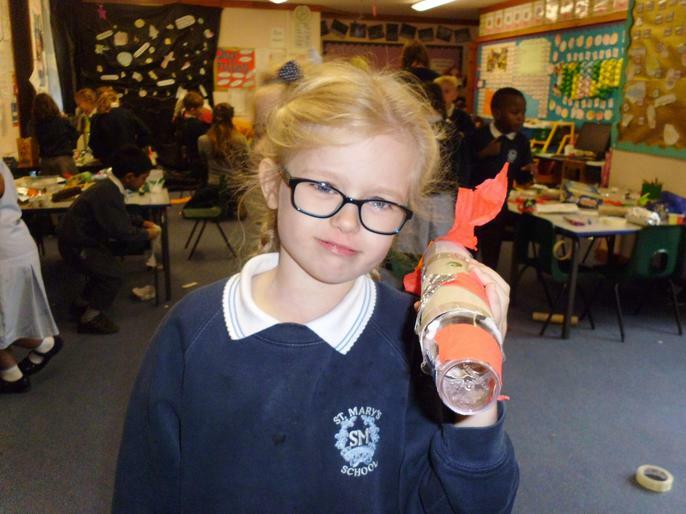 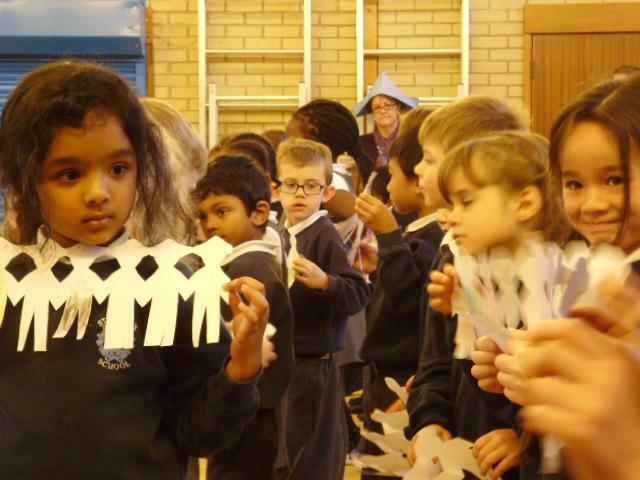 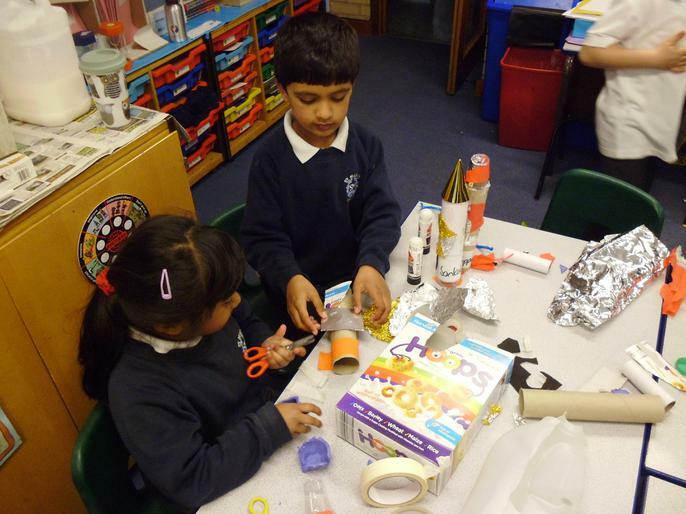 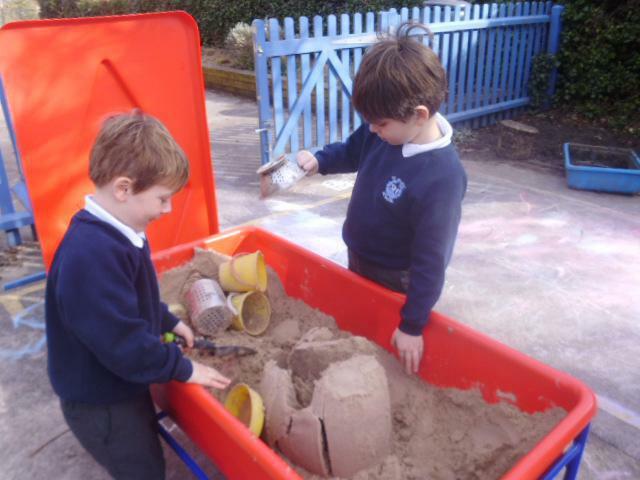 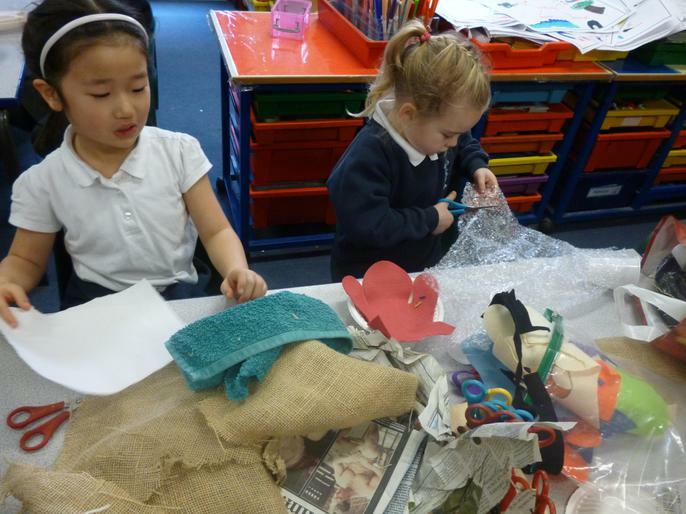 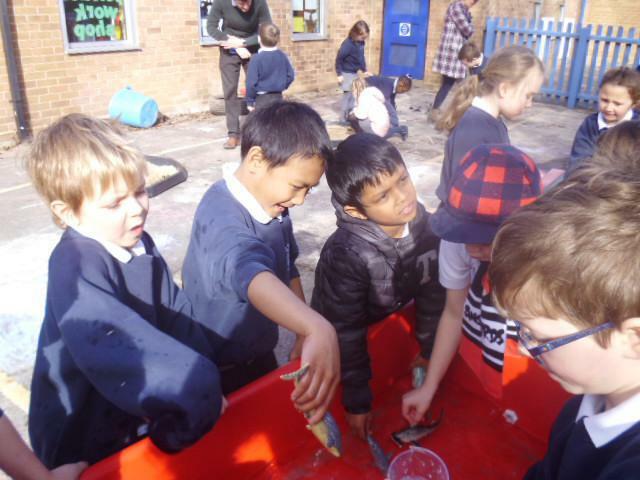 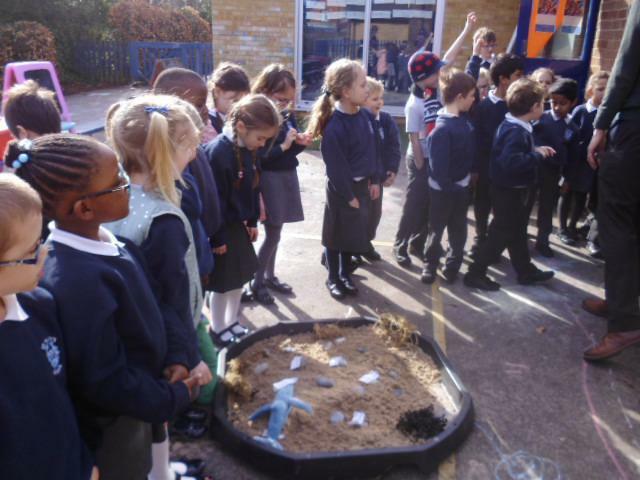 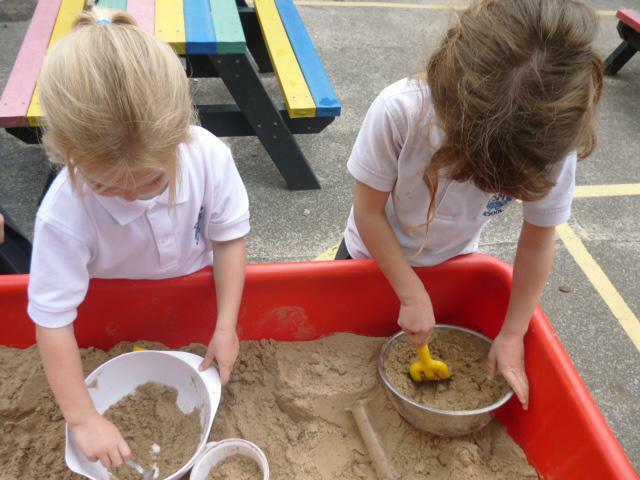 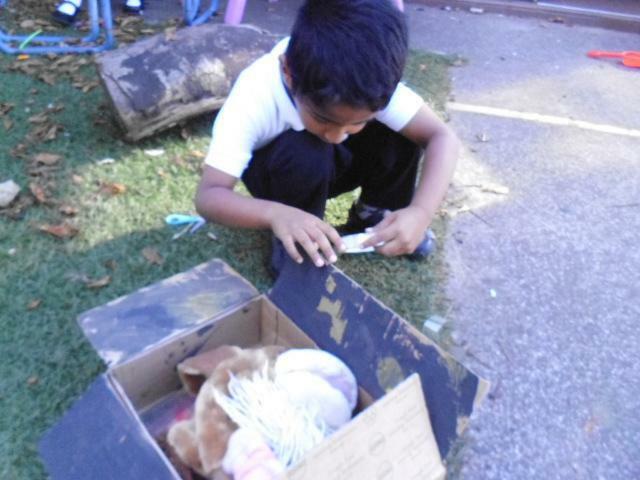 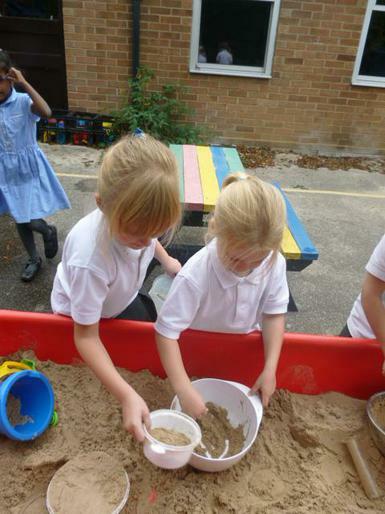 There has been a lot of fantastic imaginative play in Year 1. 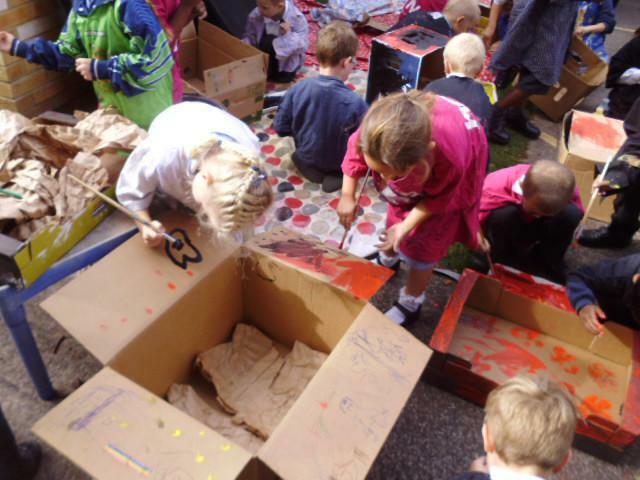 Decorating and manipulating the boxes, in all sorts of ways, helps build our vocabulary and allows us to create a narrative to our play. 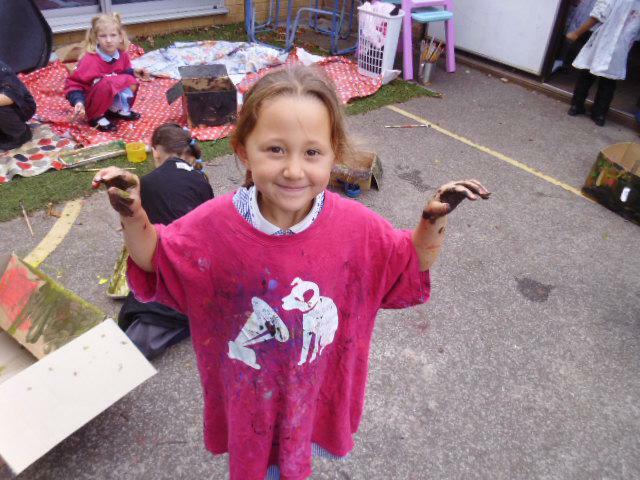 Having said this, sorry for all the paint on shirts, dresses, trousers and jumpers. 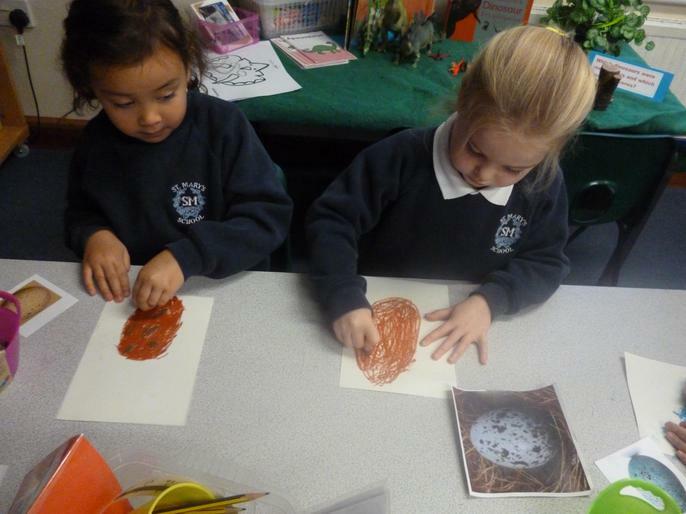 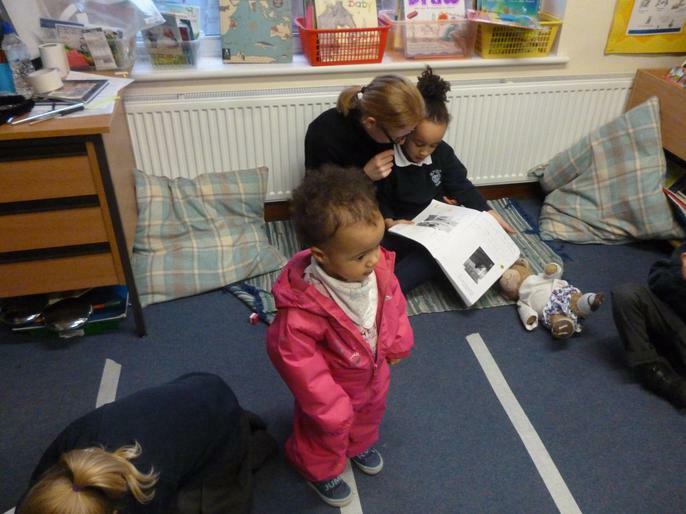 We have been reading the book 'Owl Babies' by Martin Wadell. 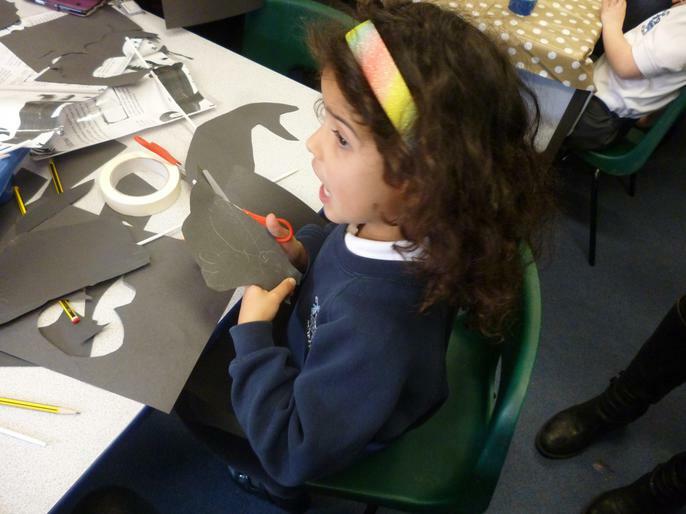 We imagined being an owl alone in a dark wood, what would you see? 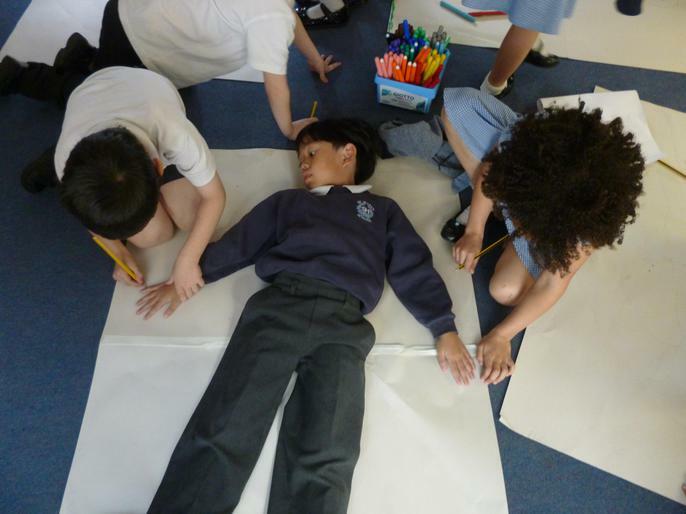 How might you feel? 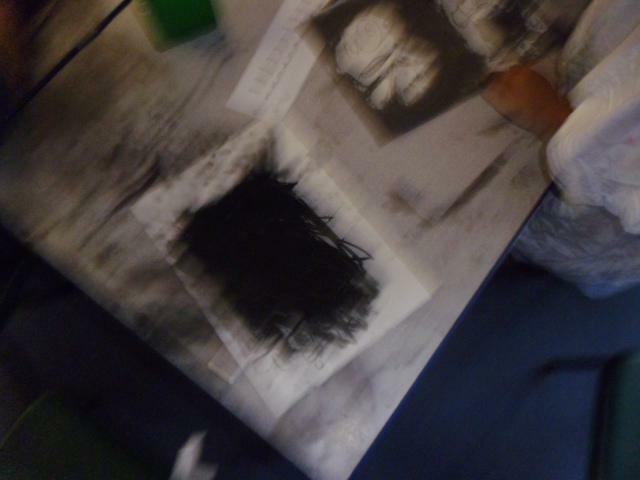 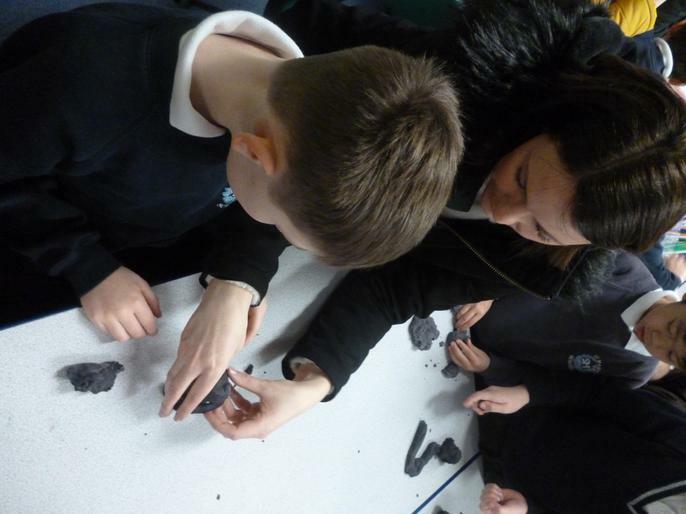 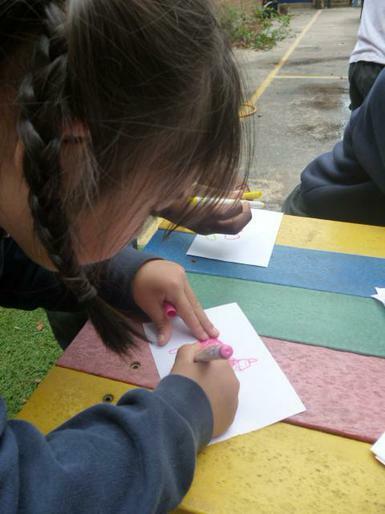 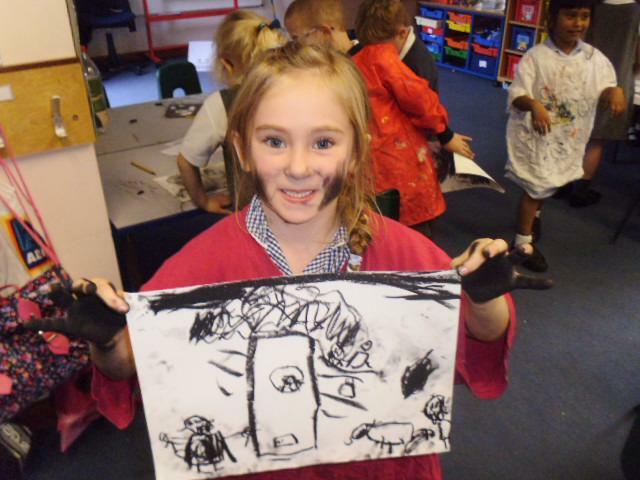 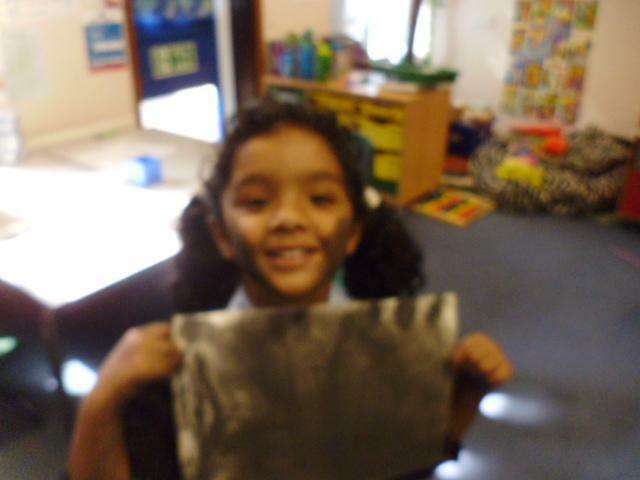 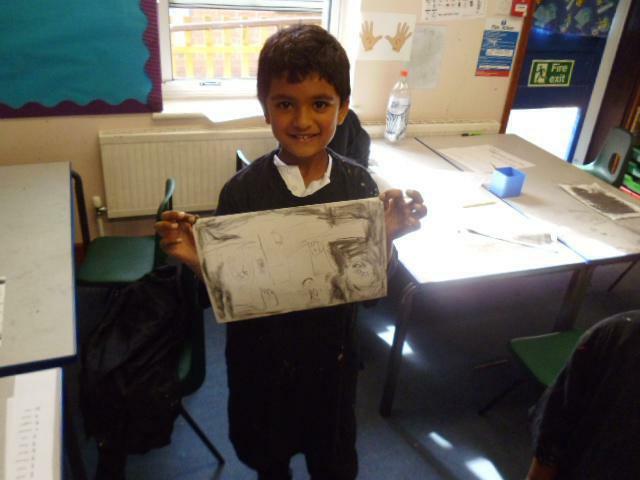 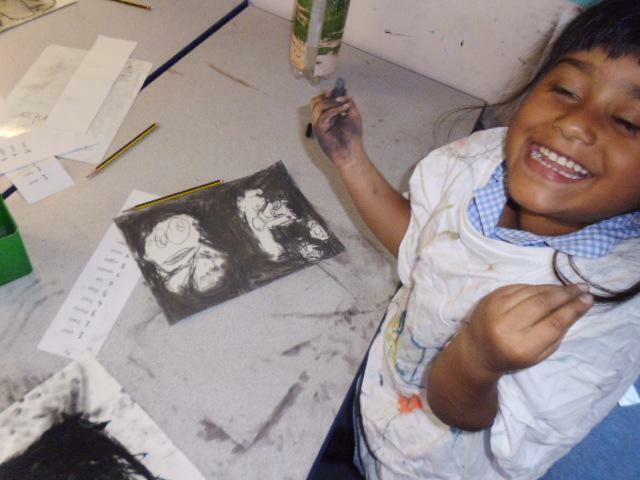 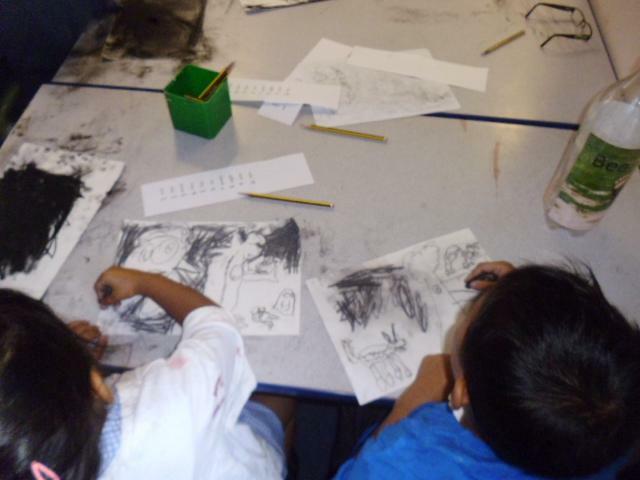 We then used charcoal to draw some illustrations. 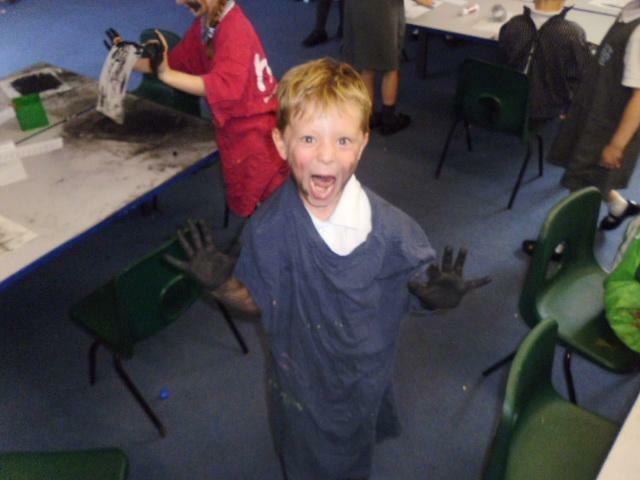 It did get a little bit messy!